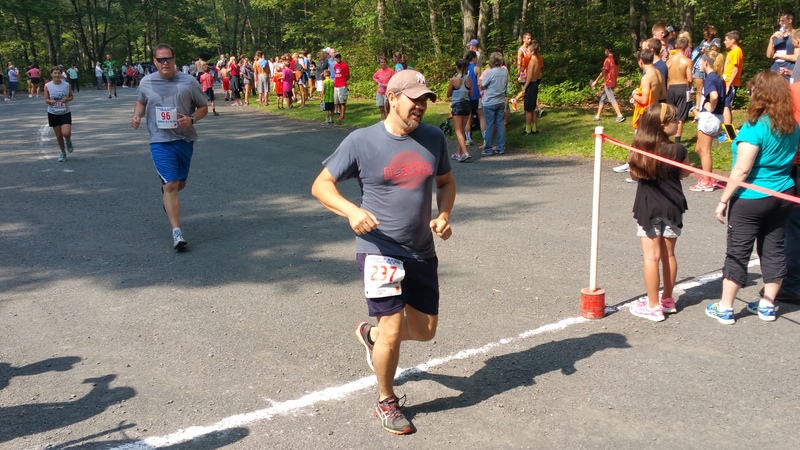 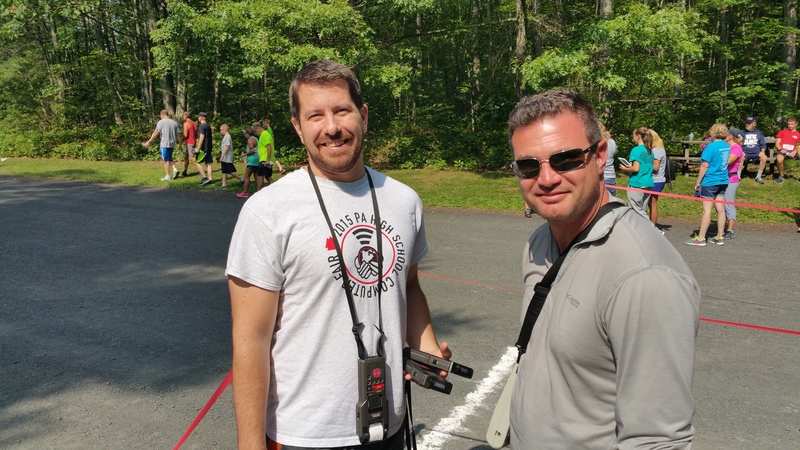 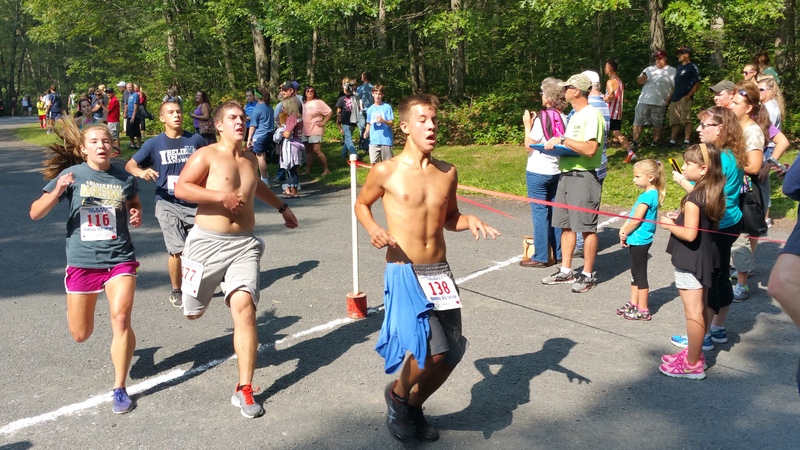 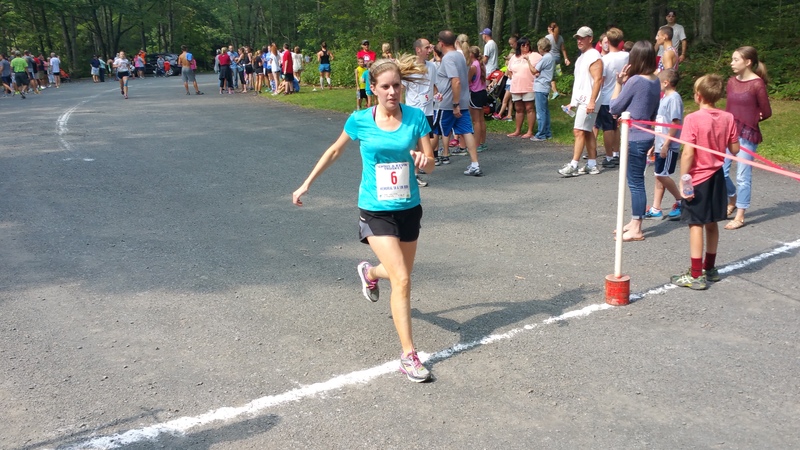 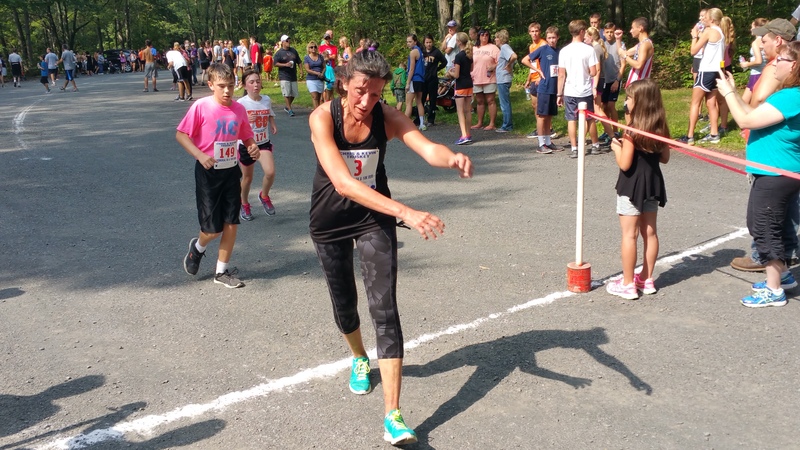 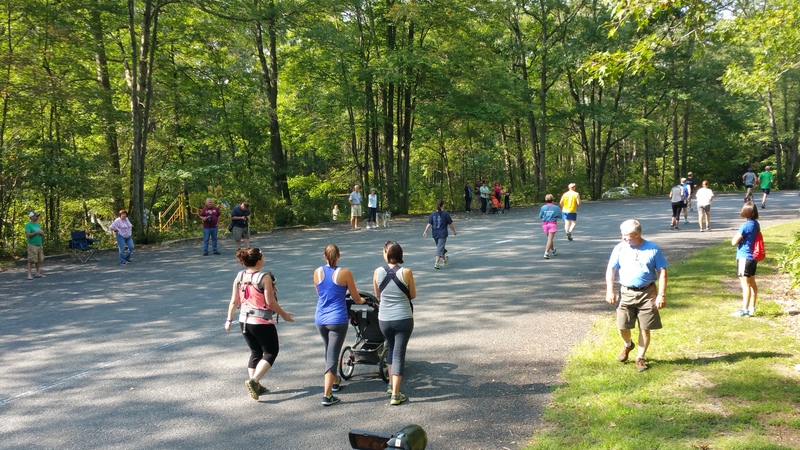 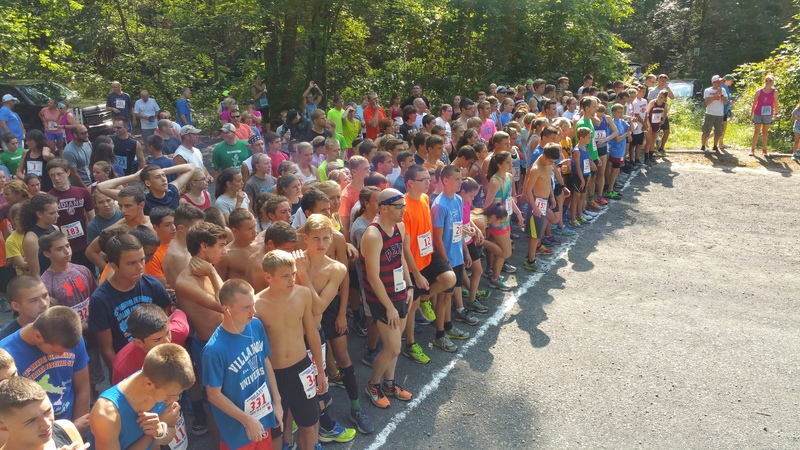 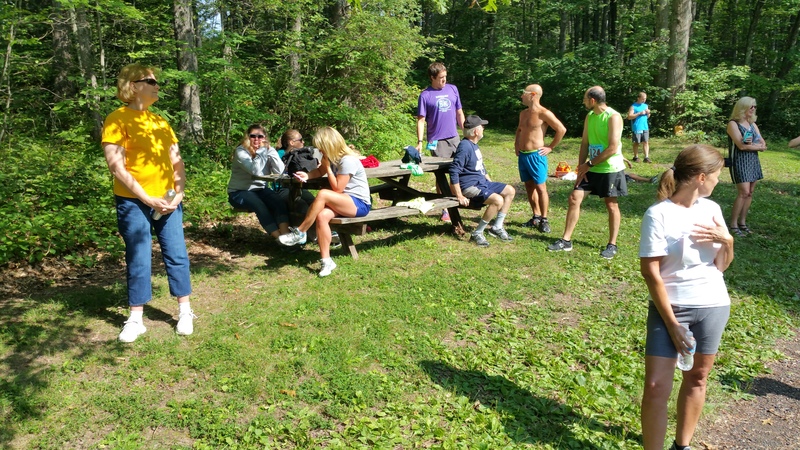 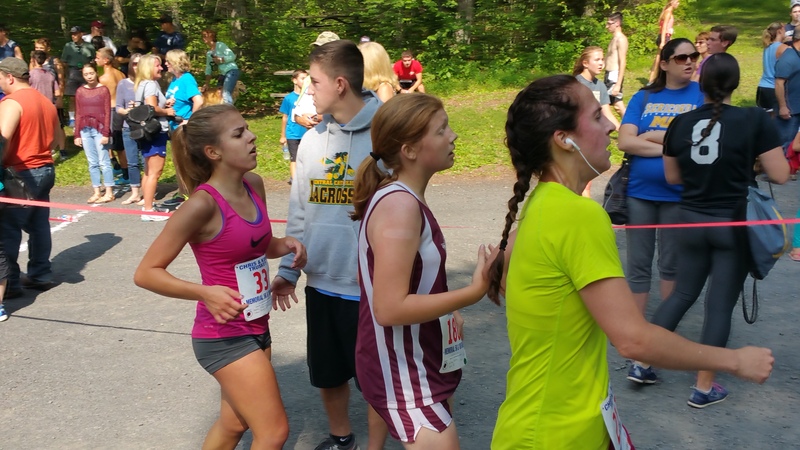 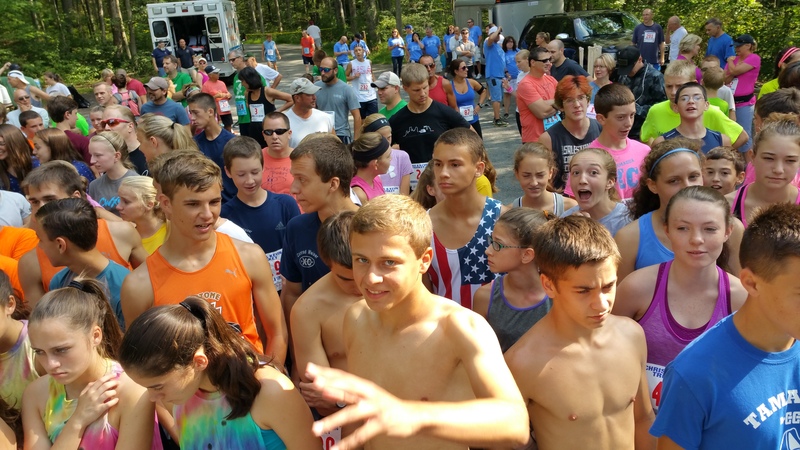 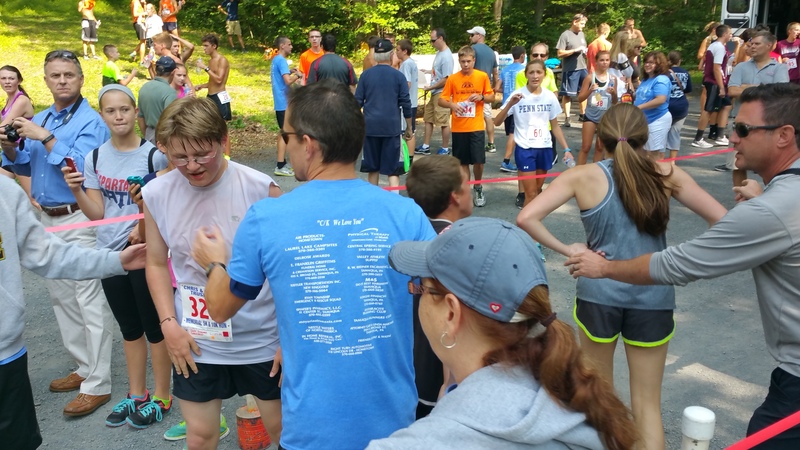 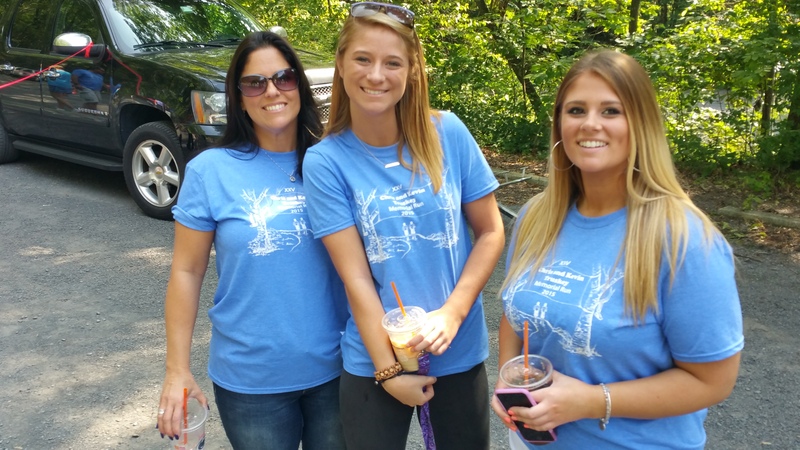 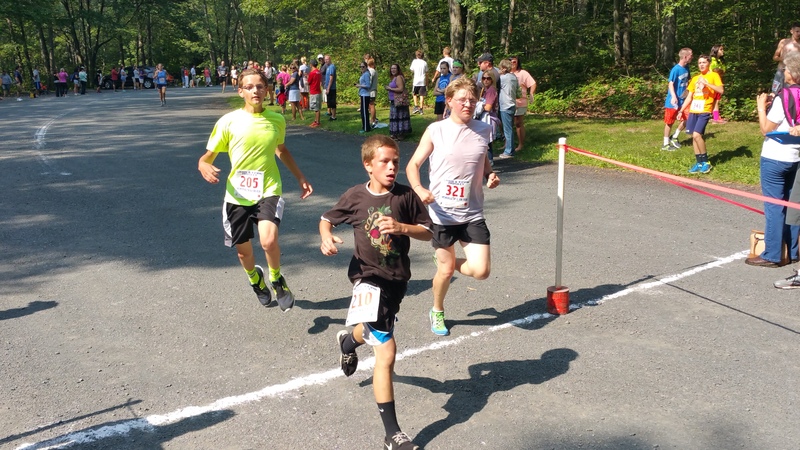 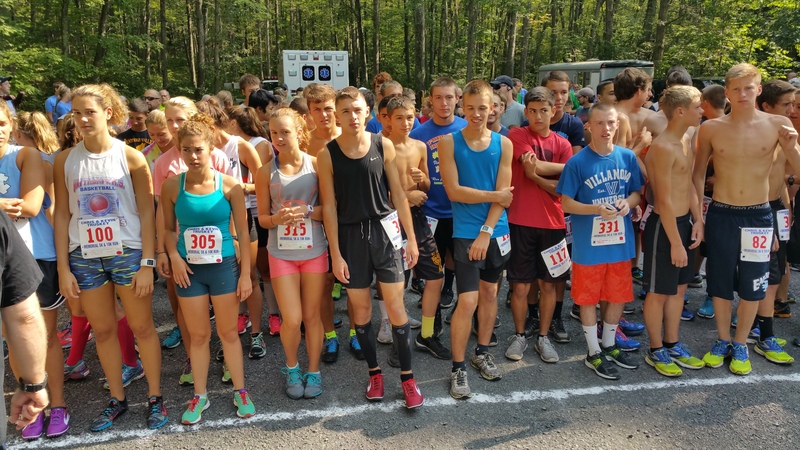 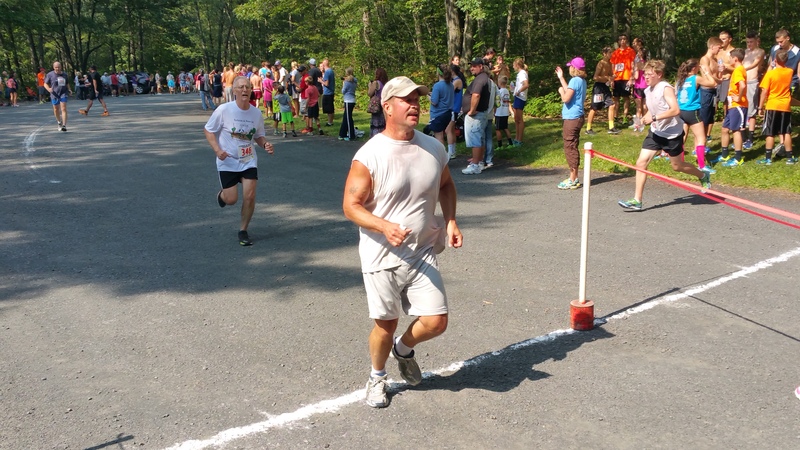 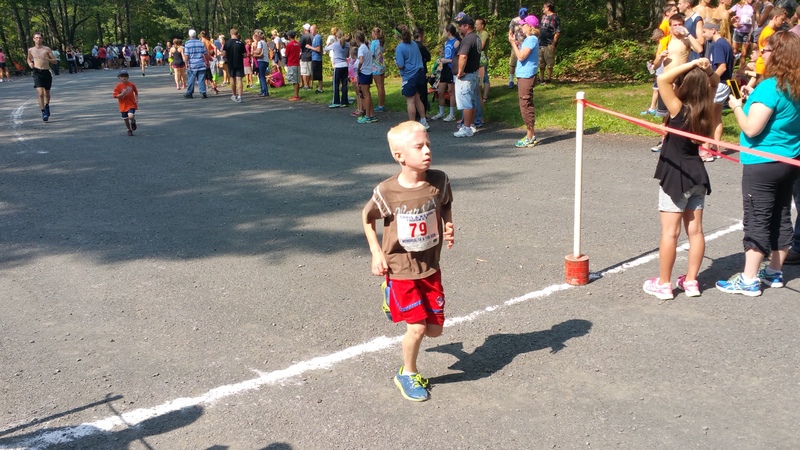 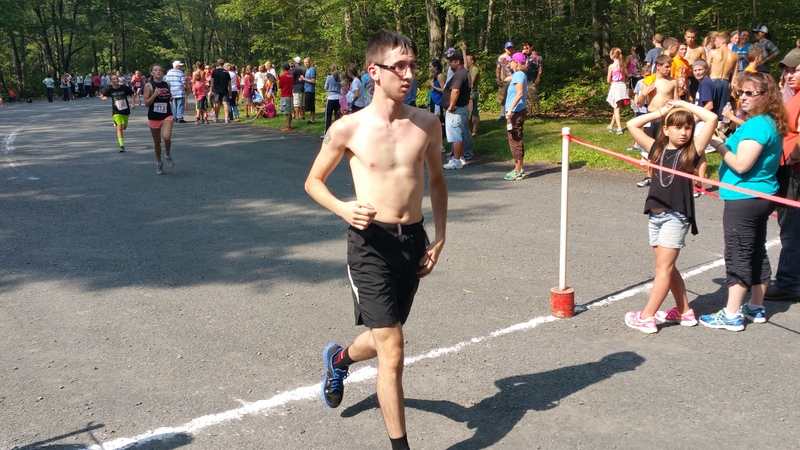 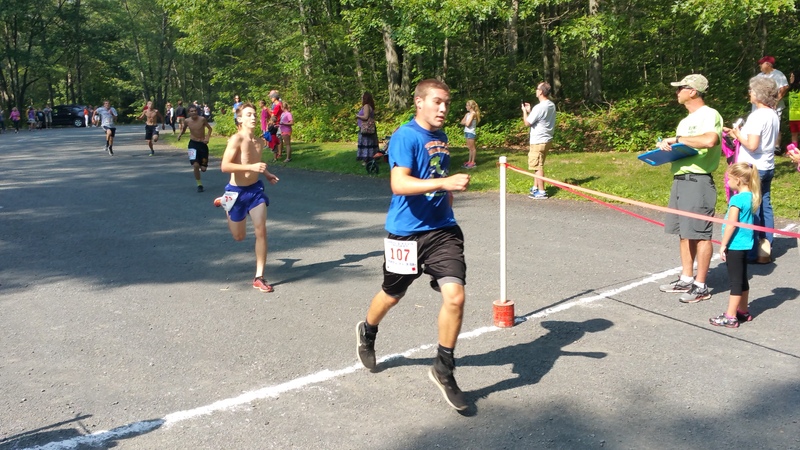 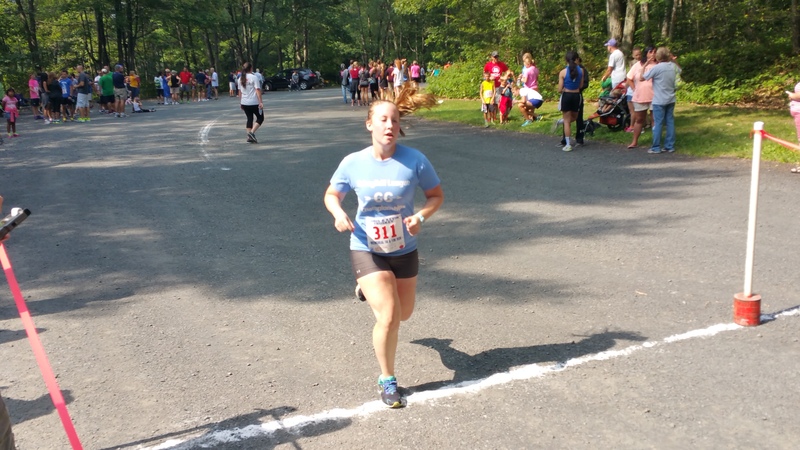 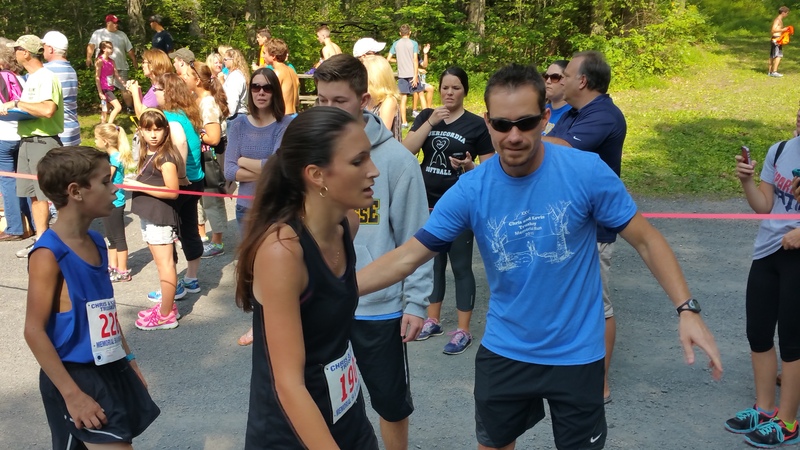 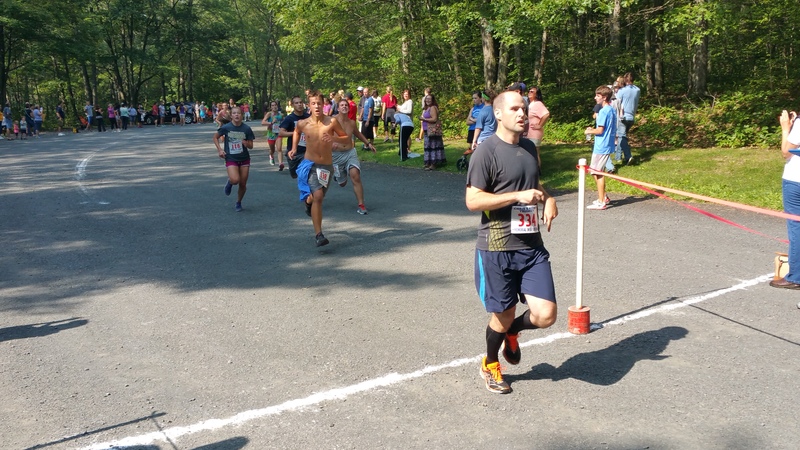 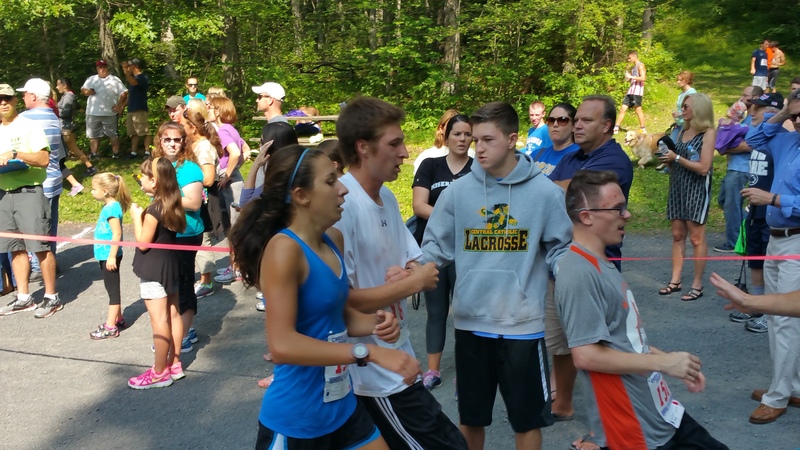 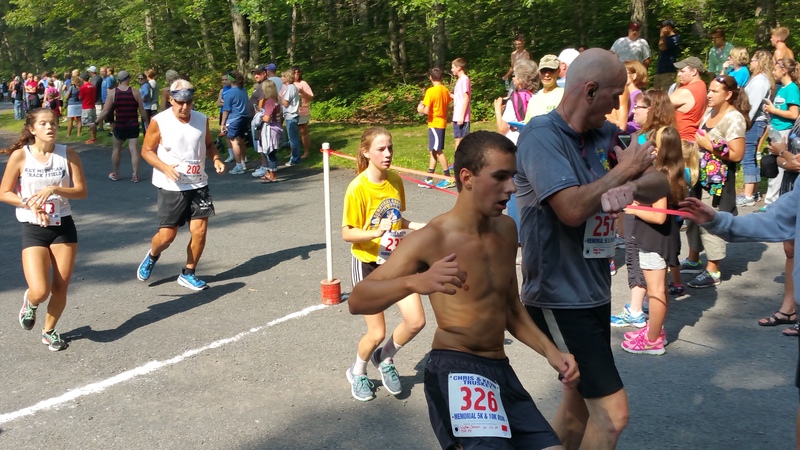 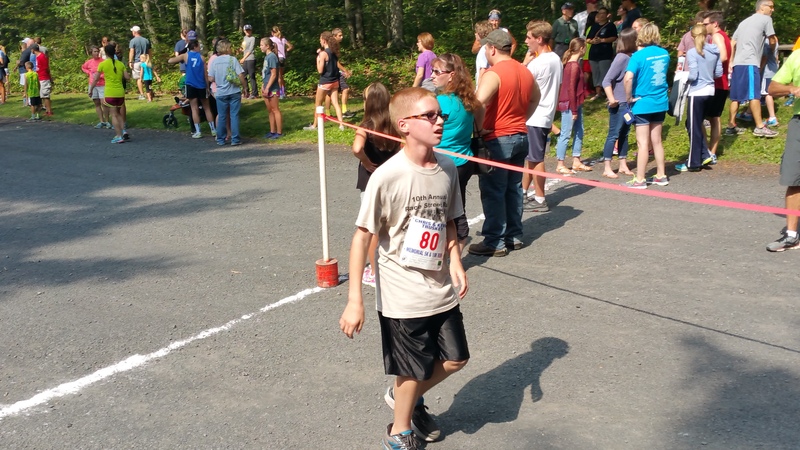 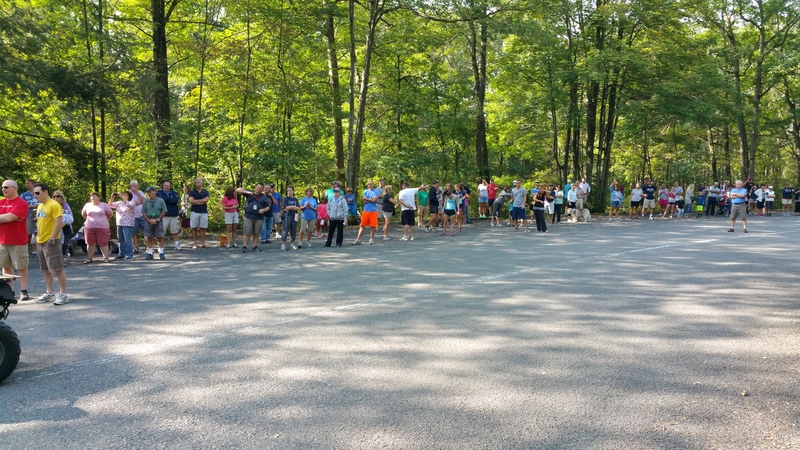 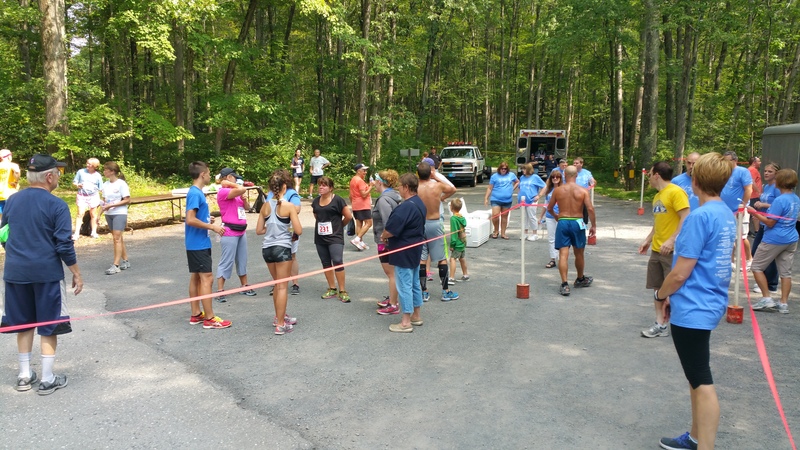 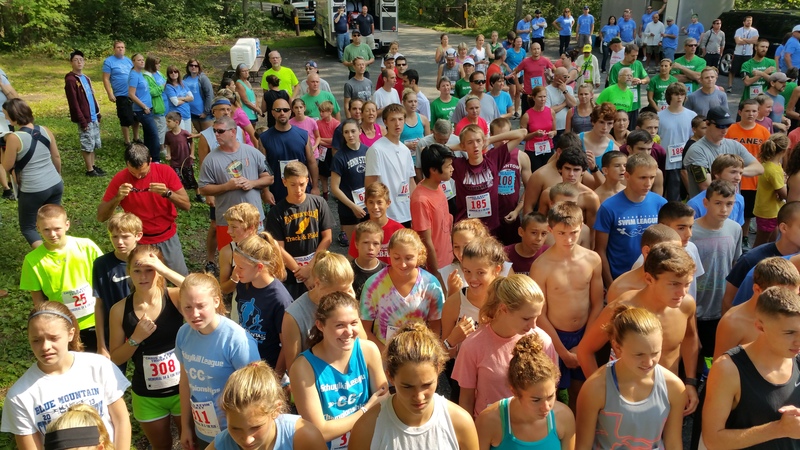 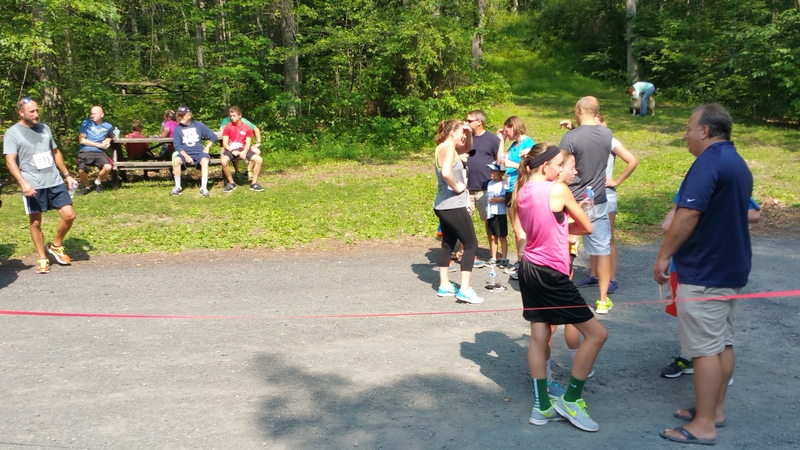 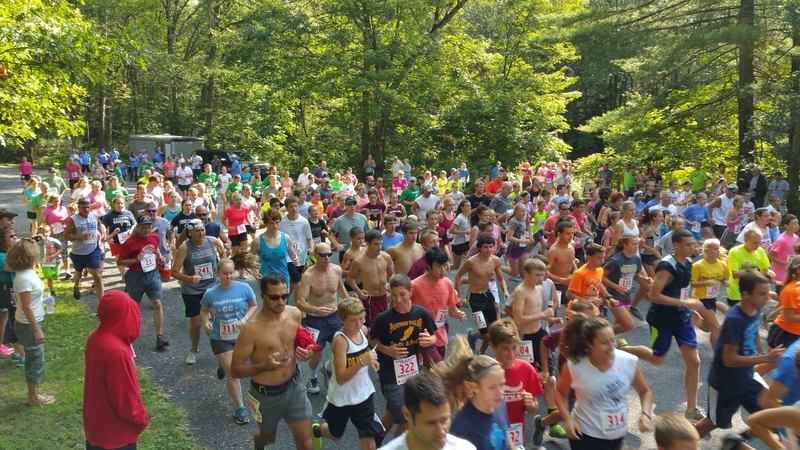 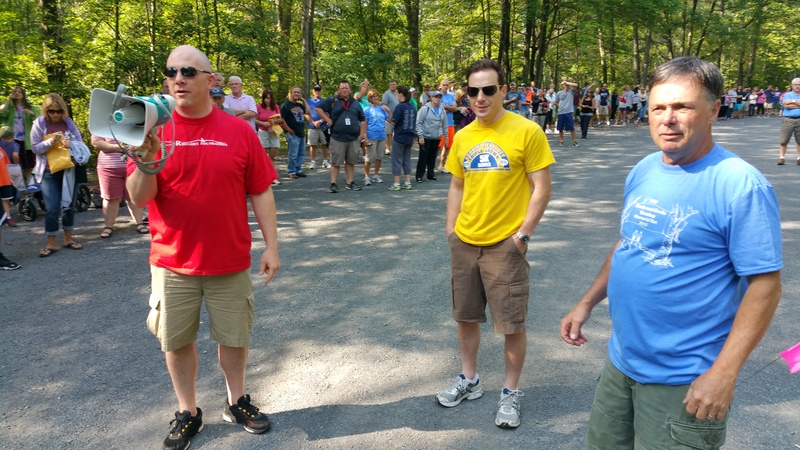 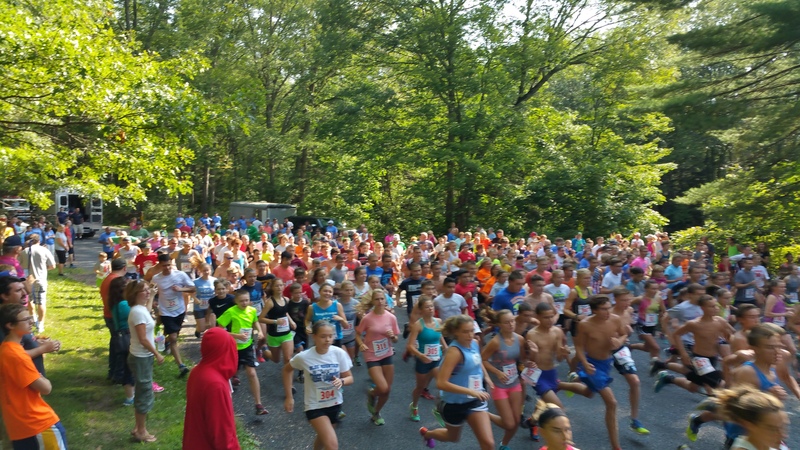 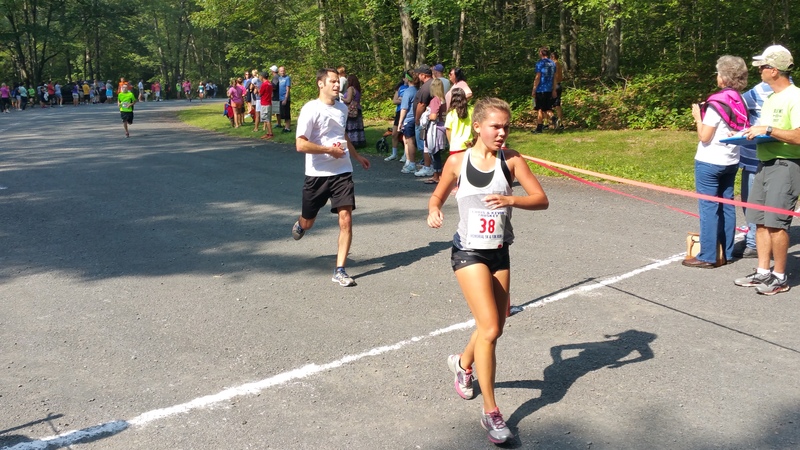 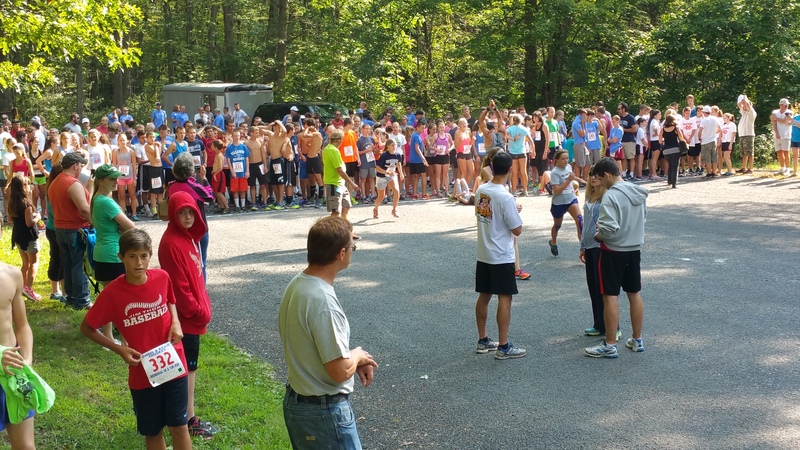 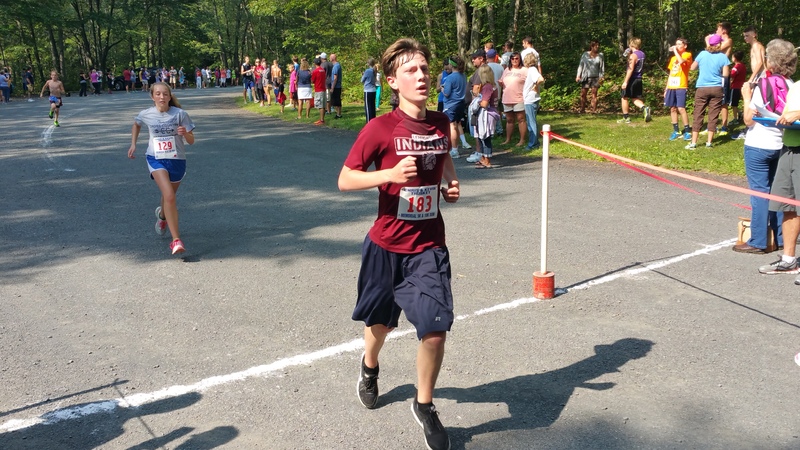 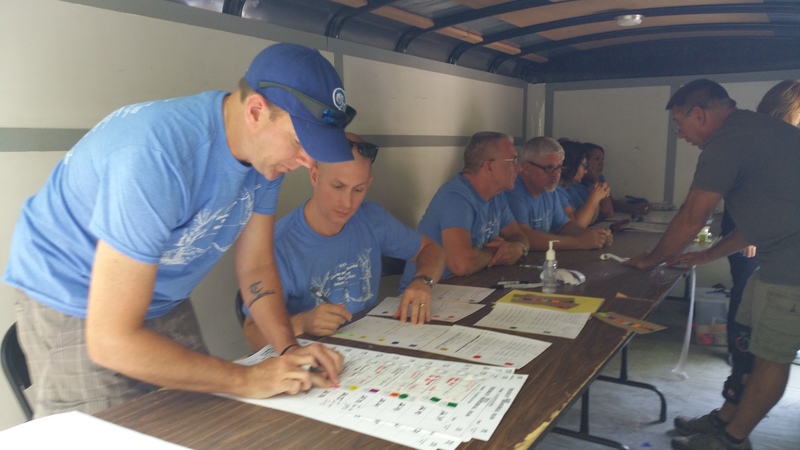 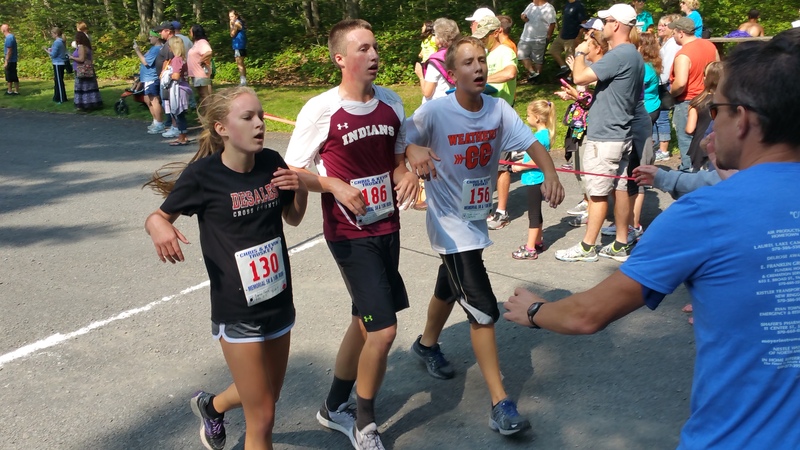 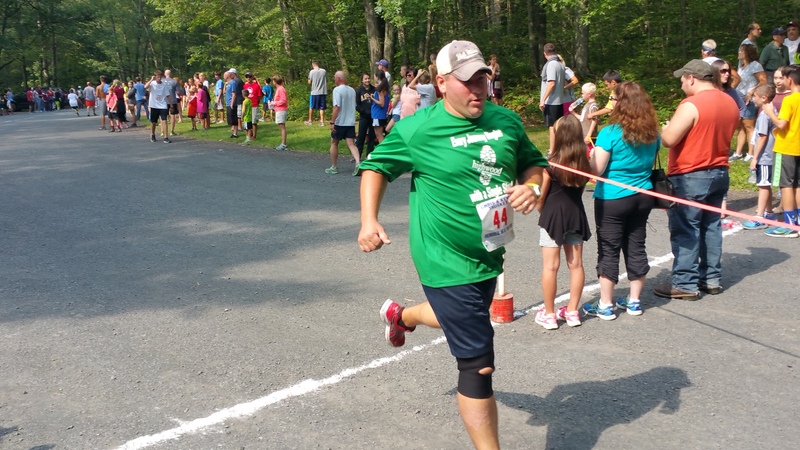 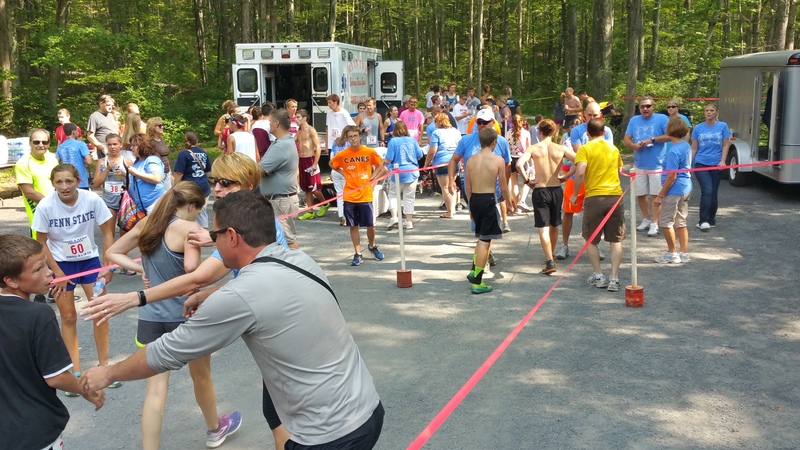 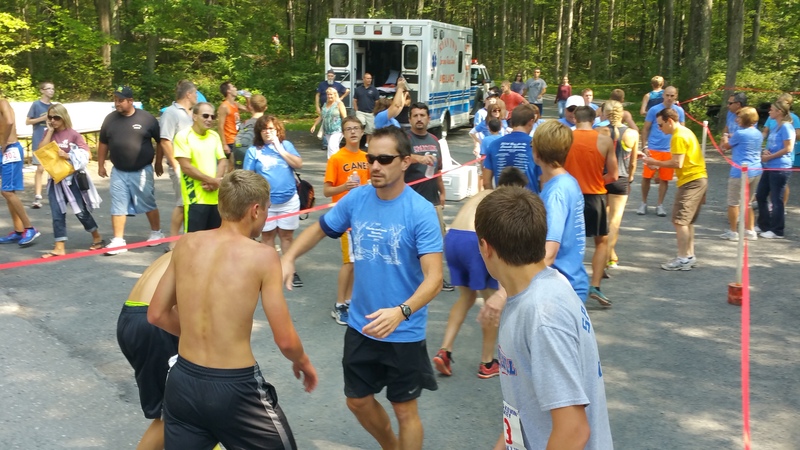 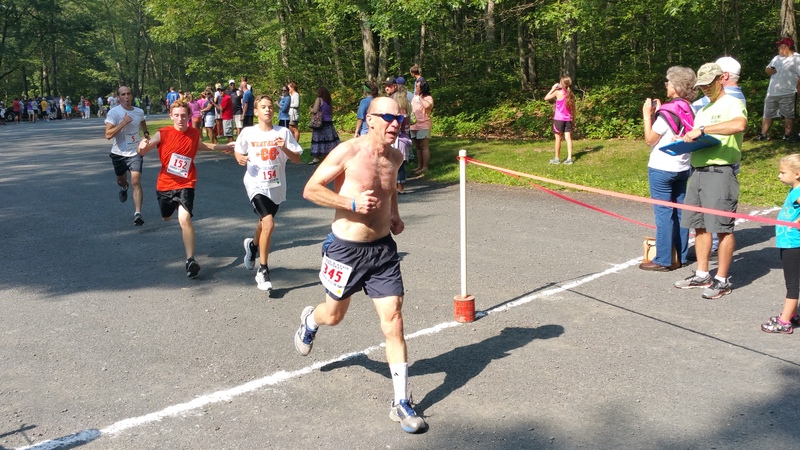 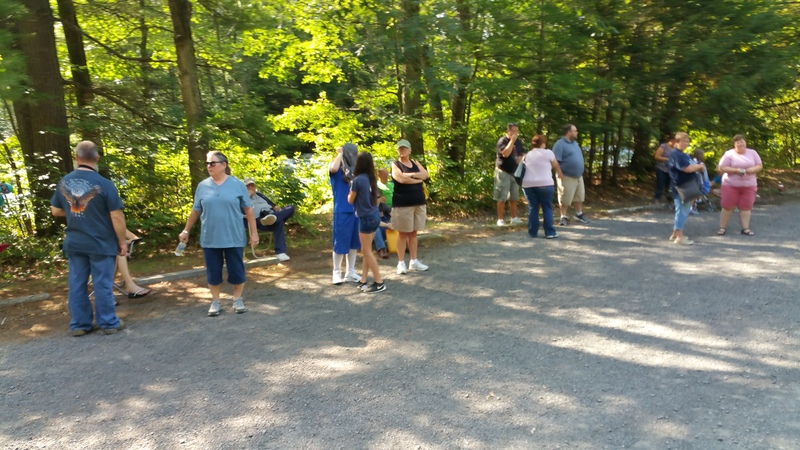 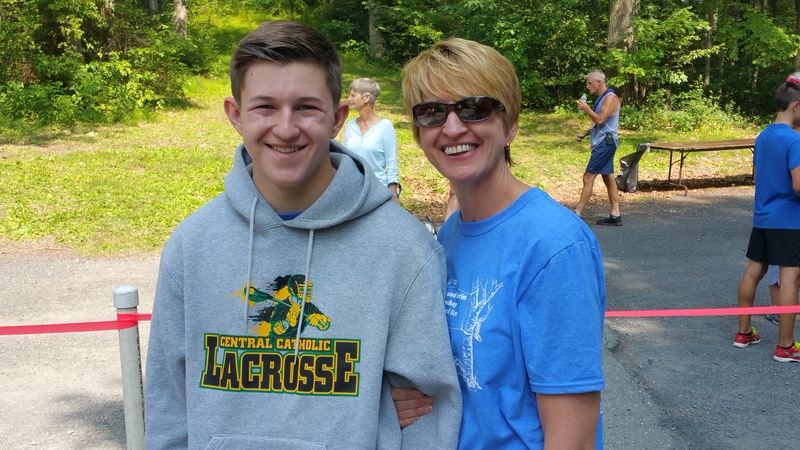 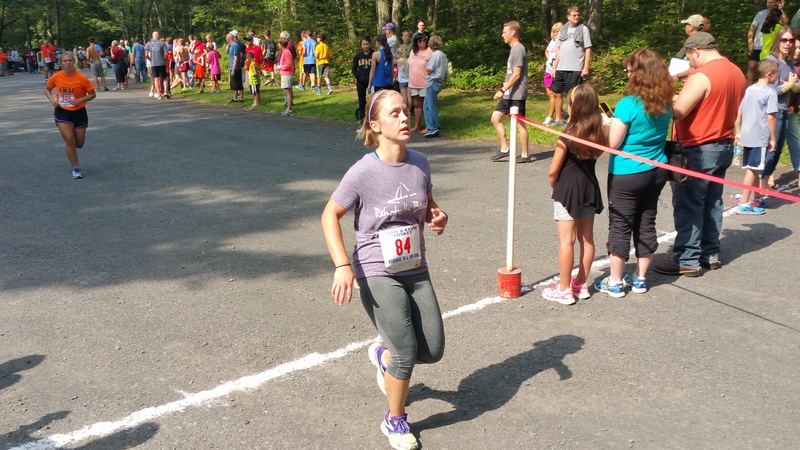 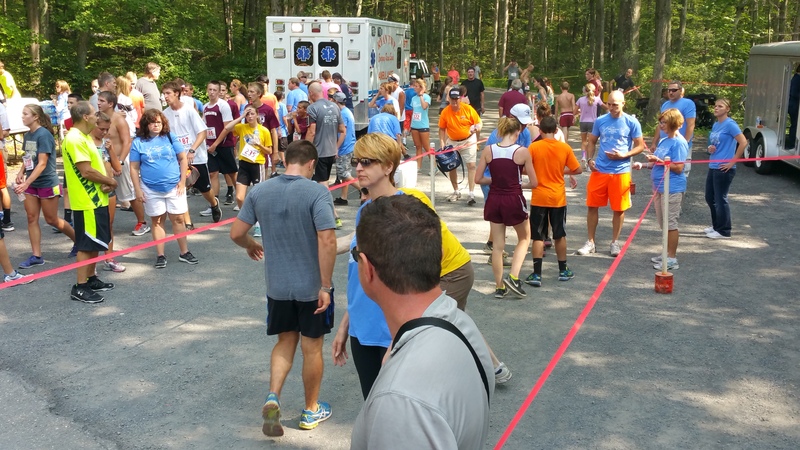 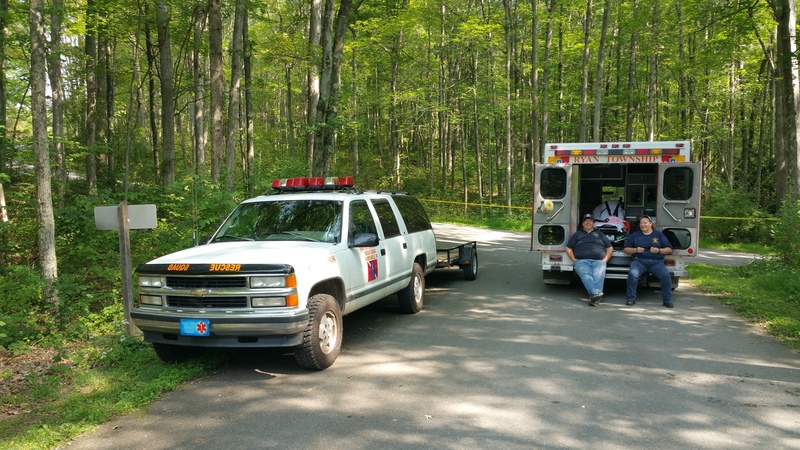 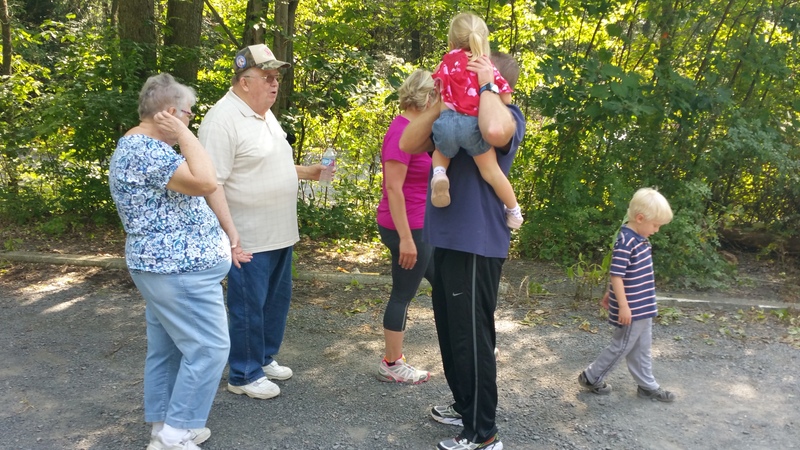 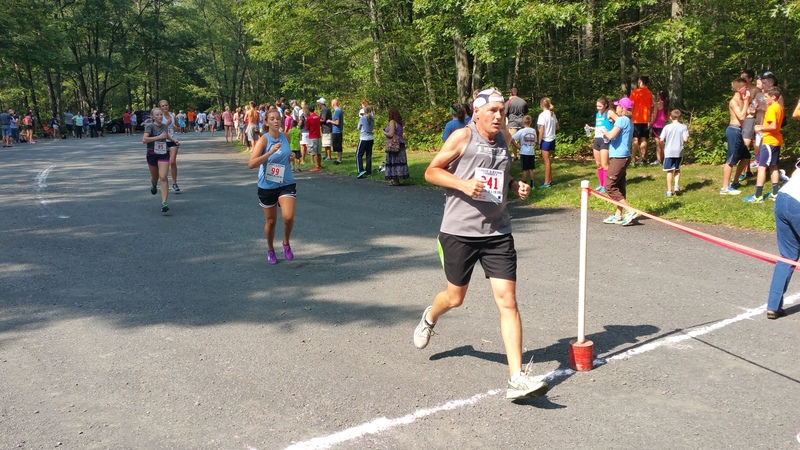 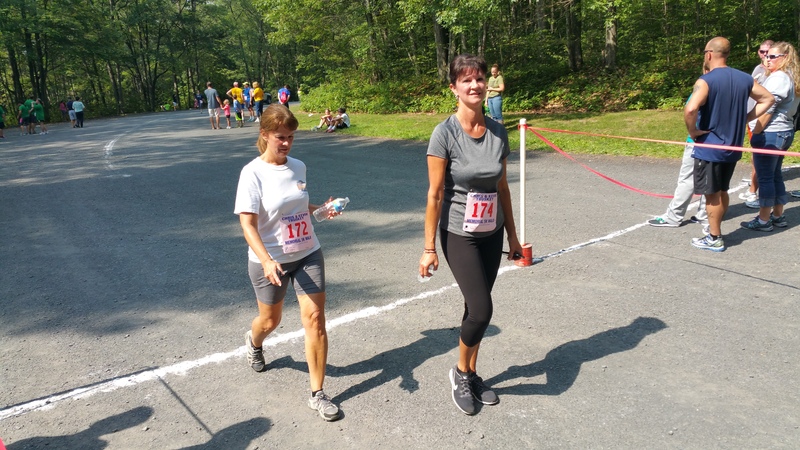 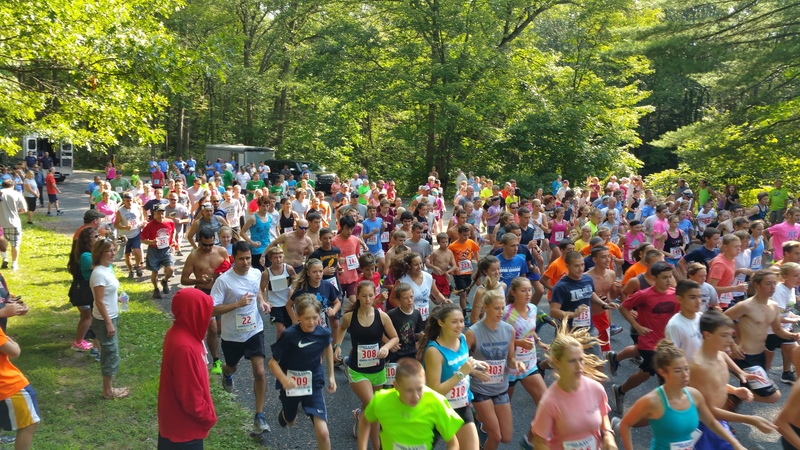 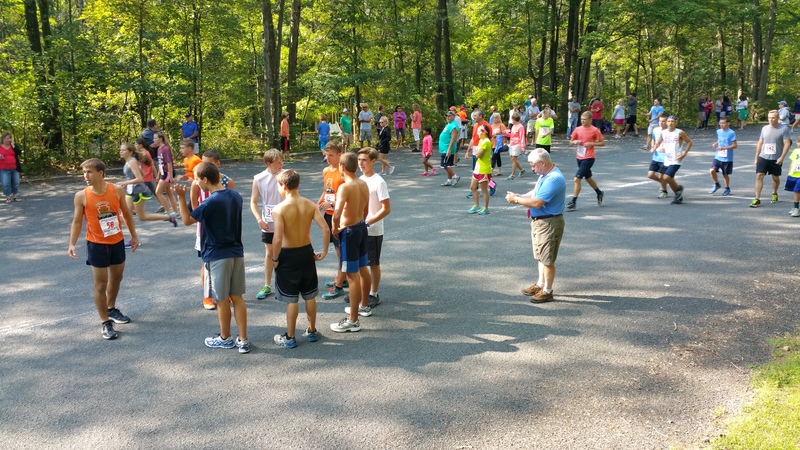 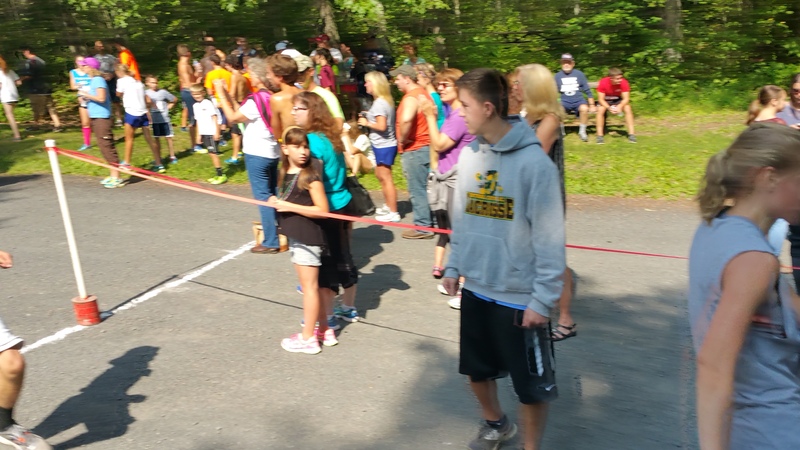 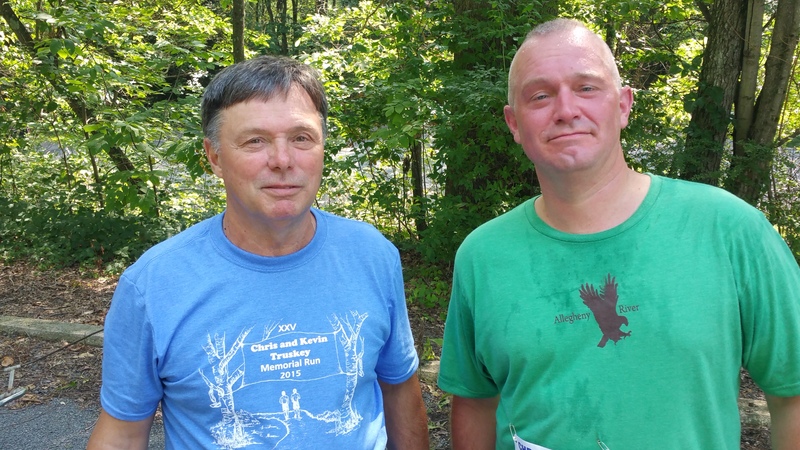 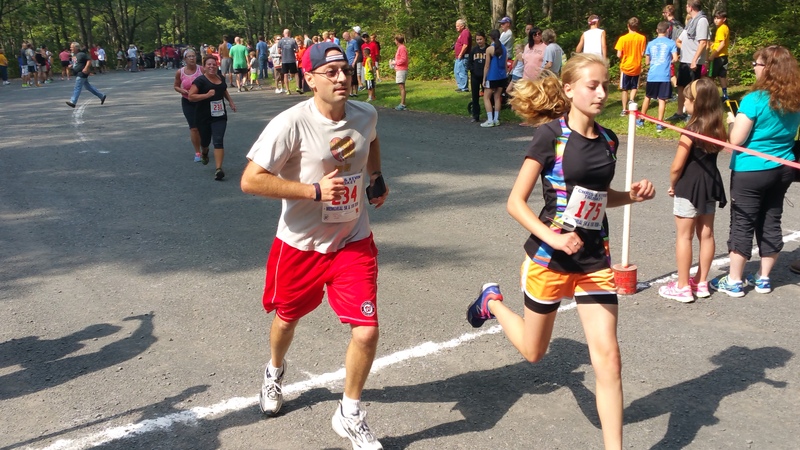 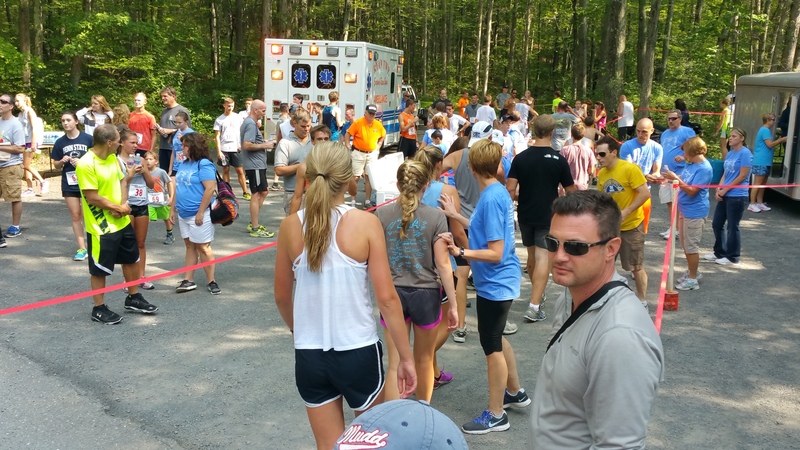 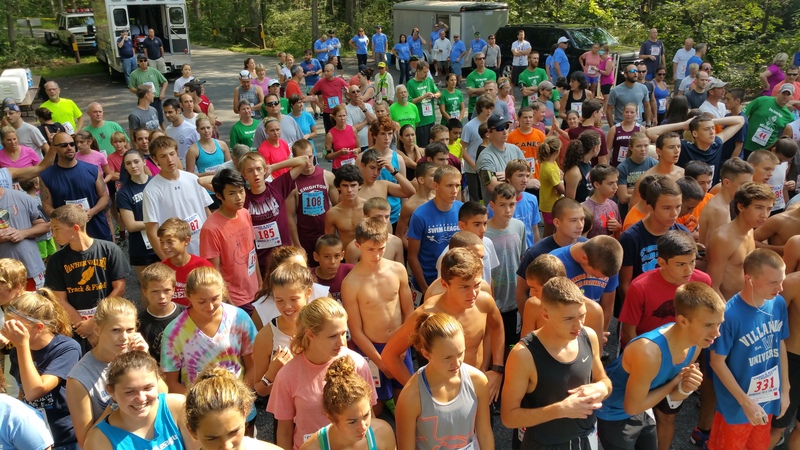 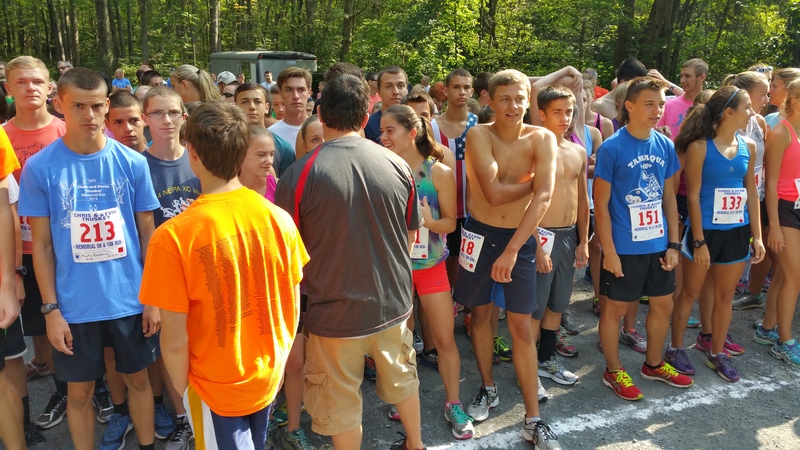 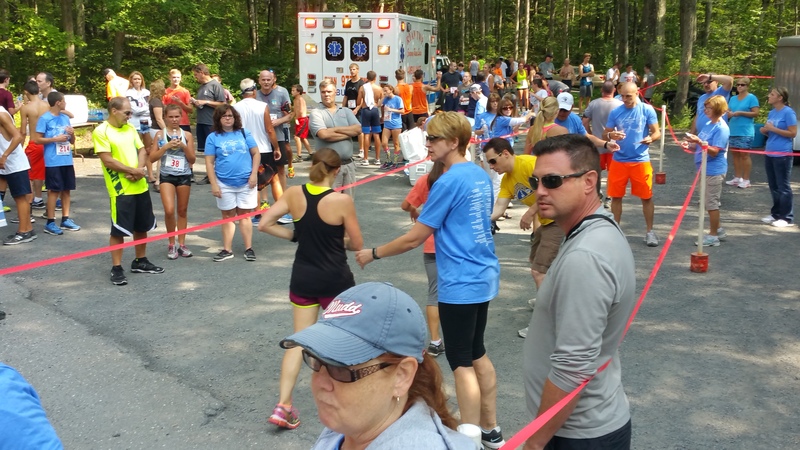 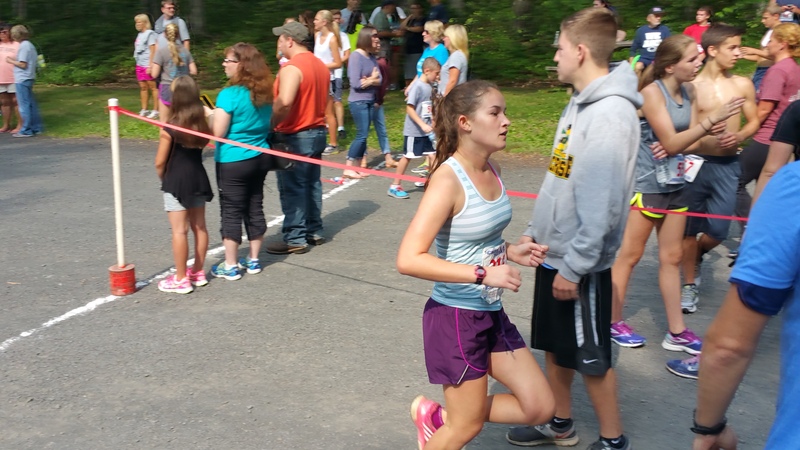 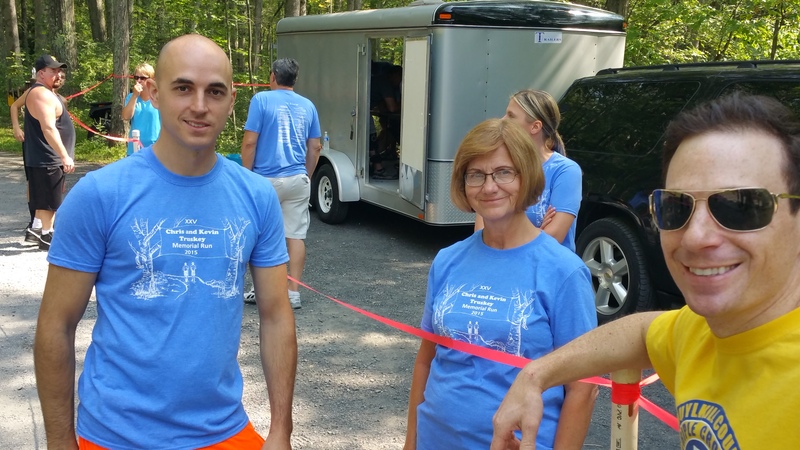 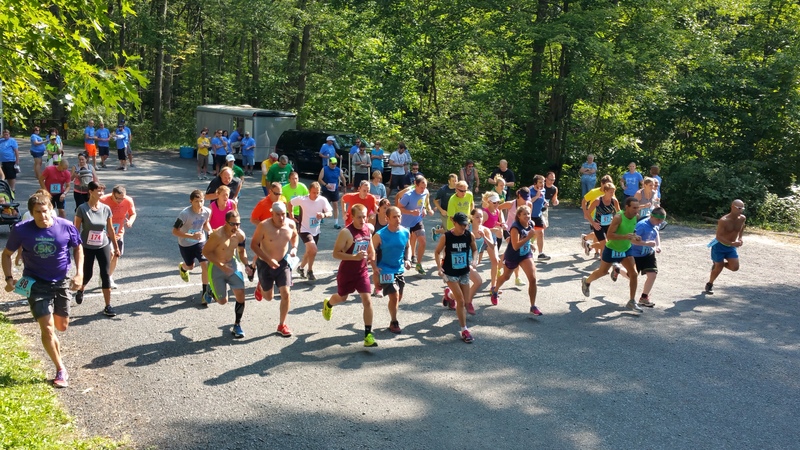 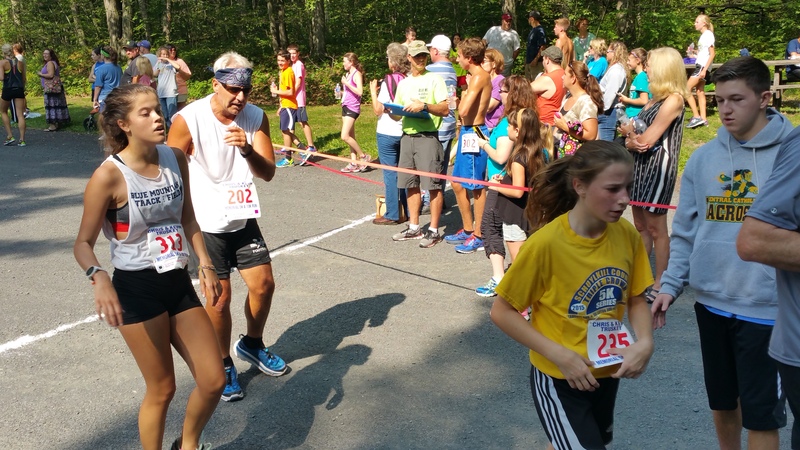 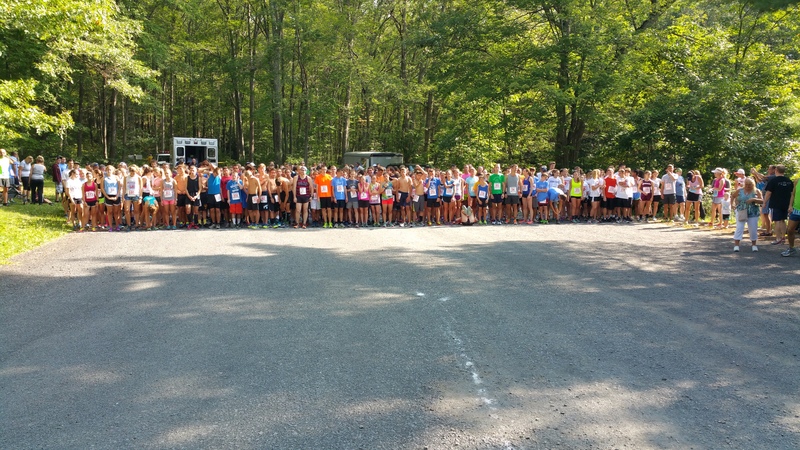 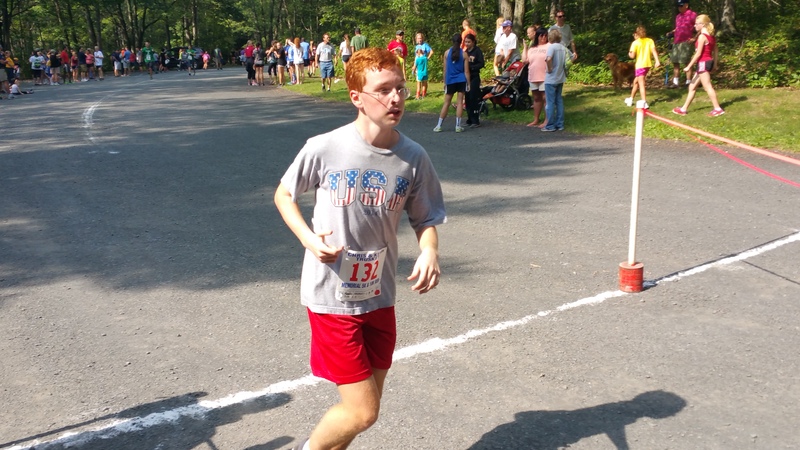 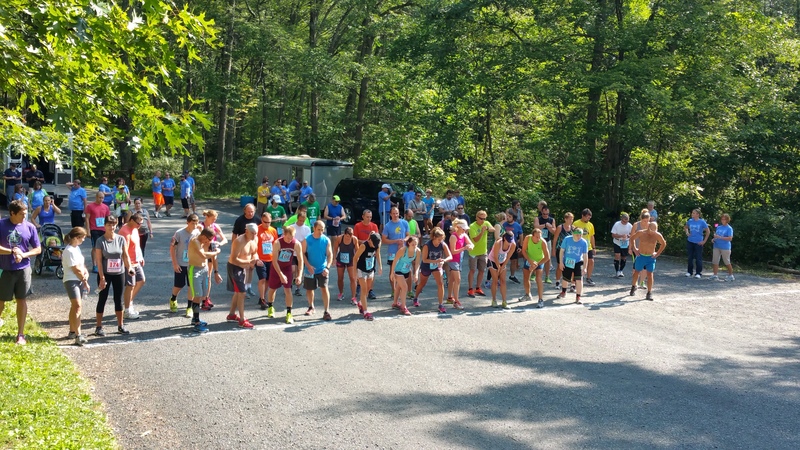 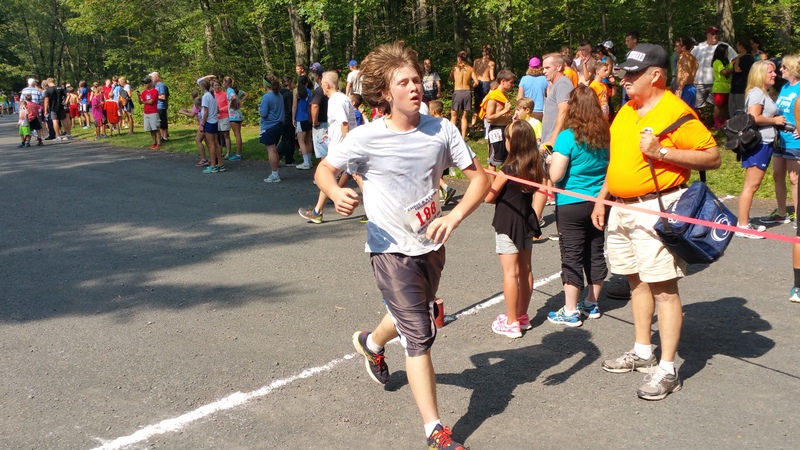 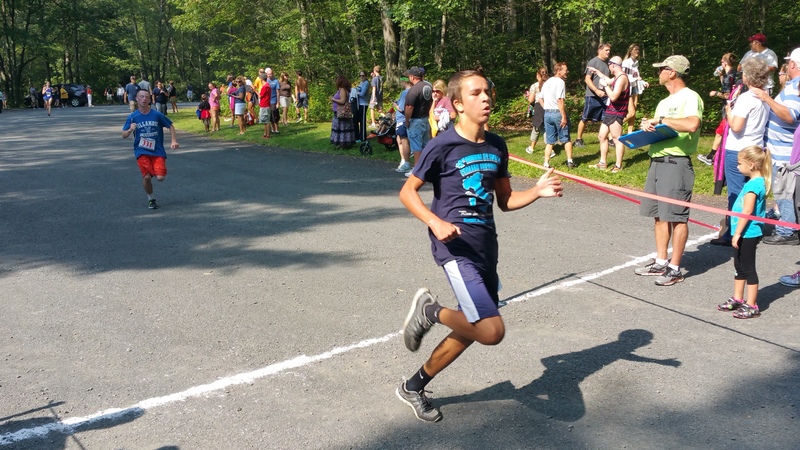 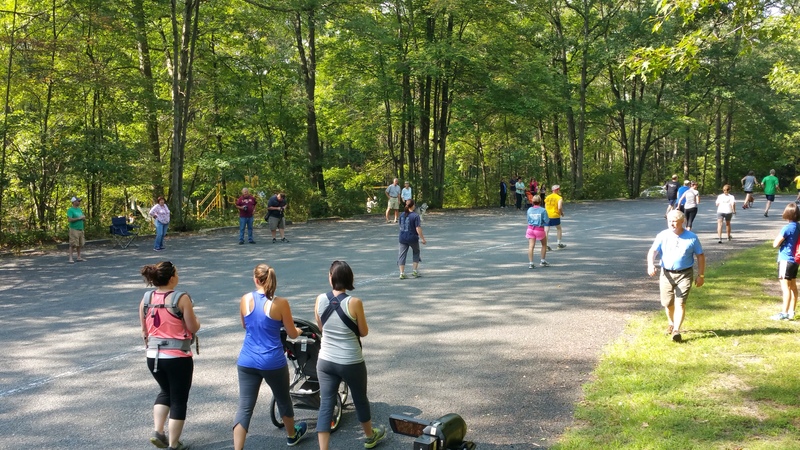 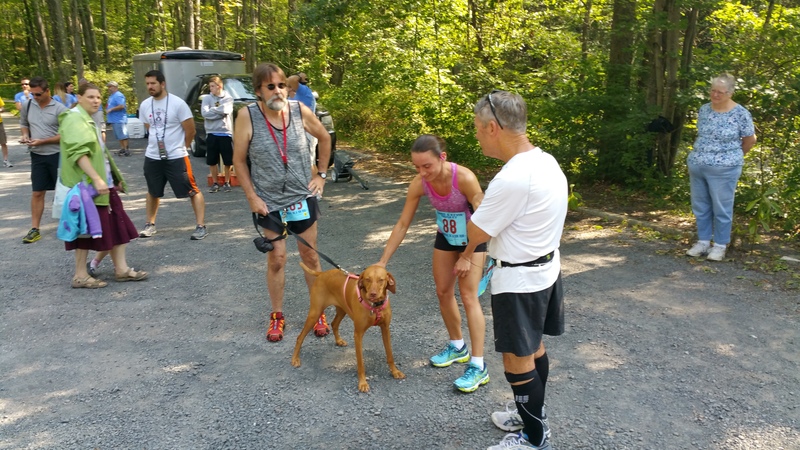 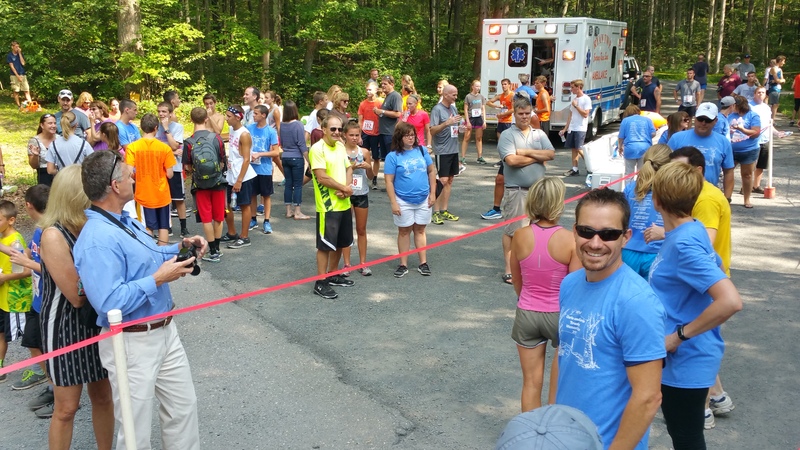 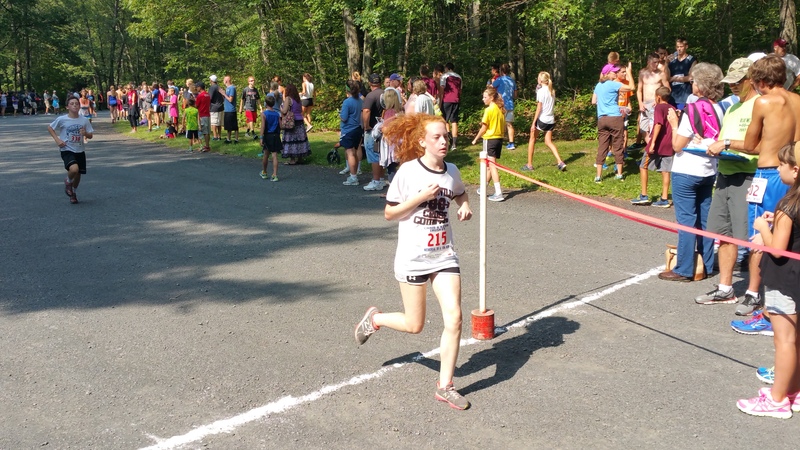 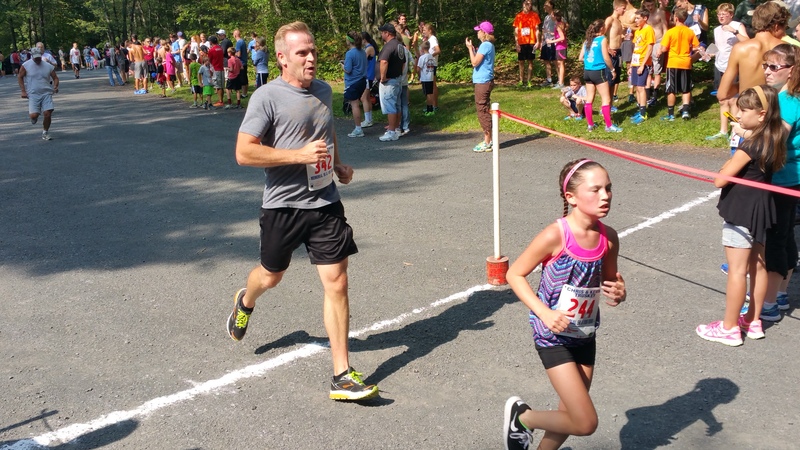 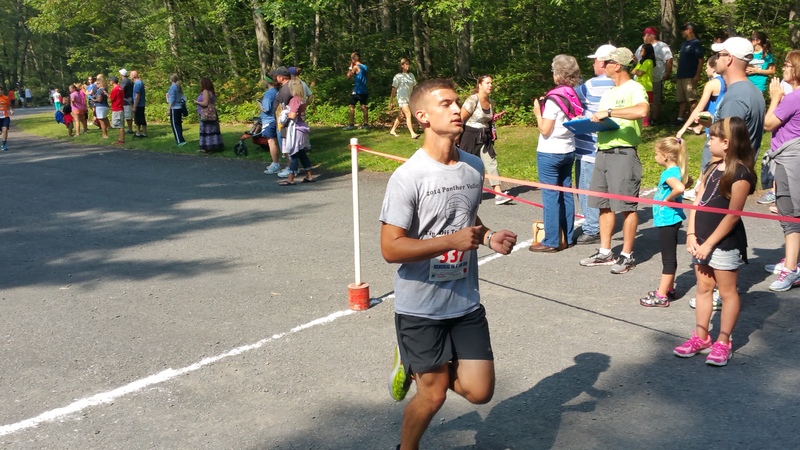 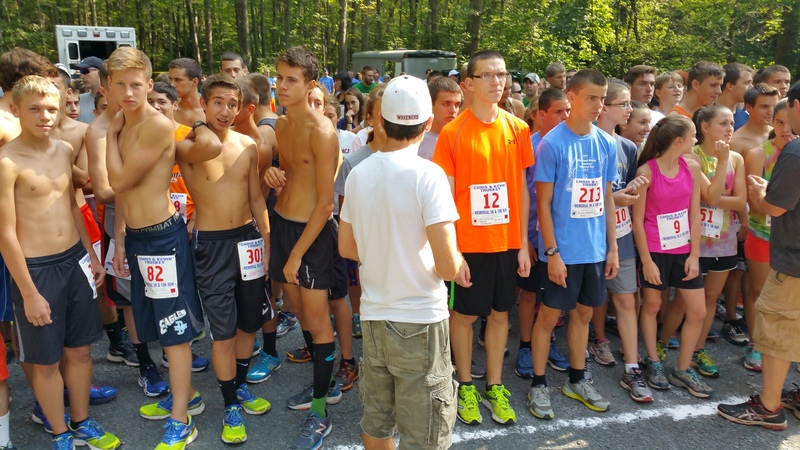 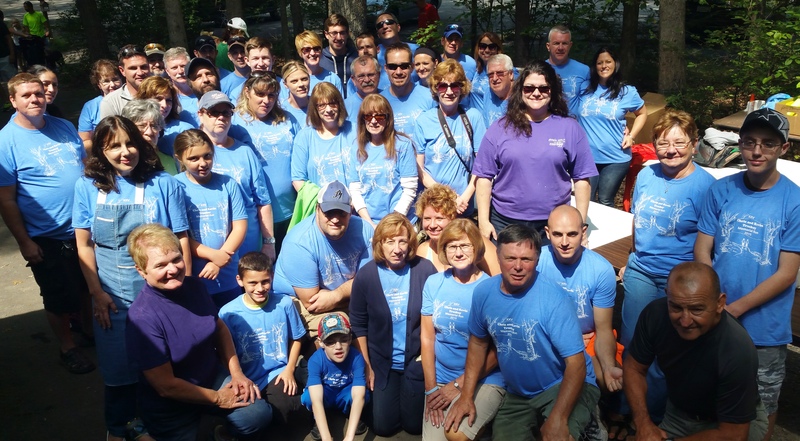 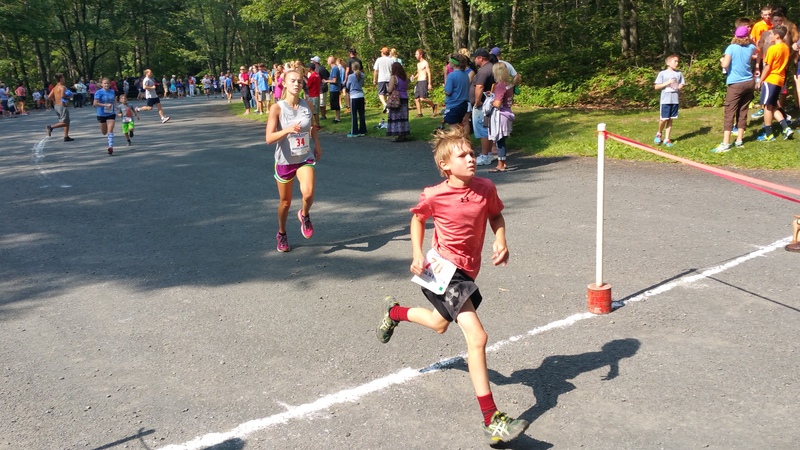 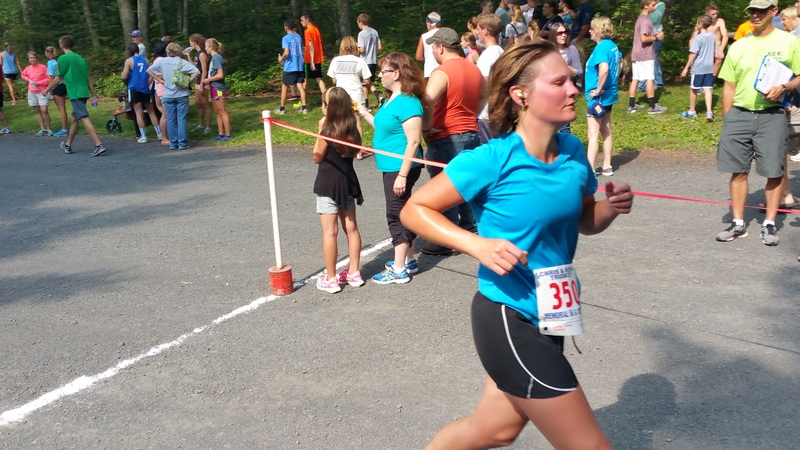 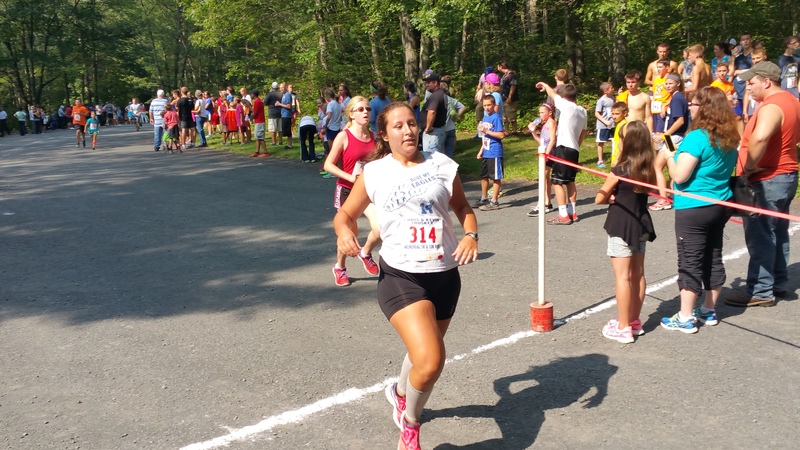 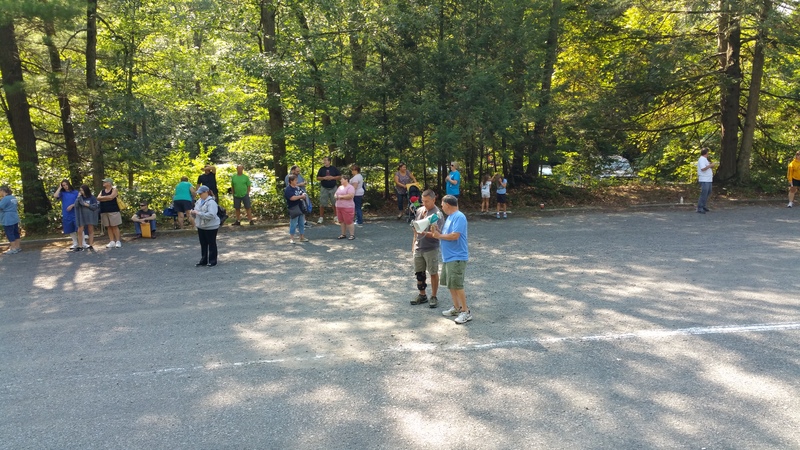 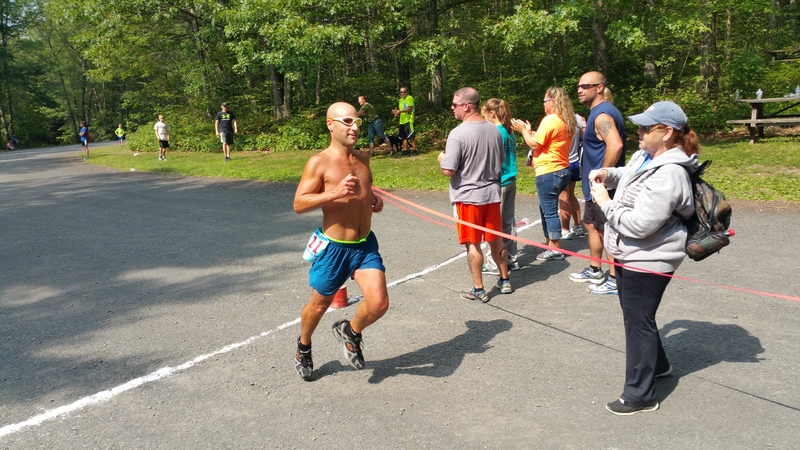 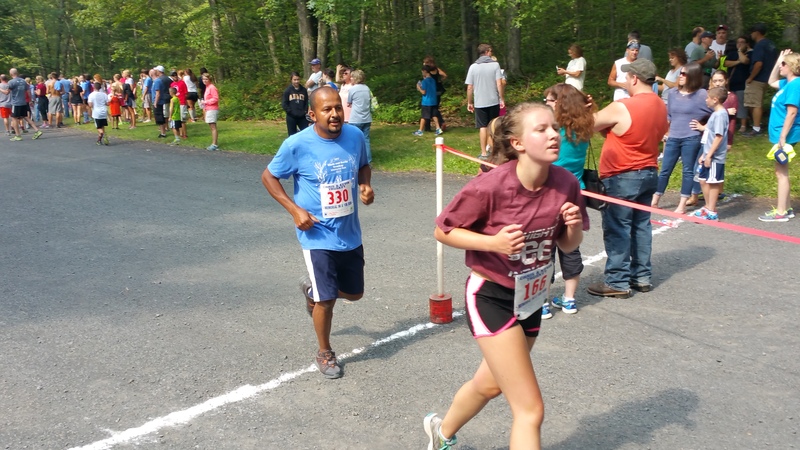 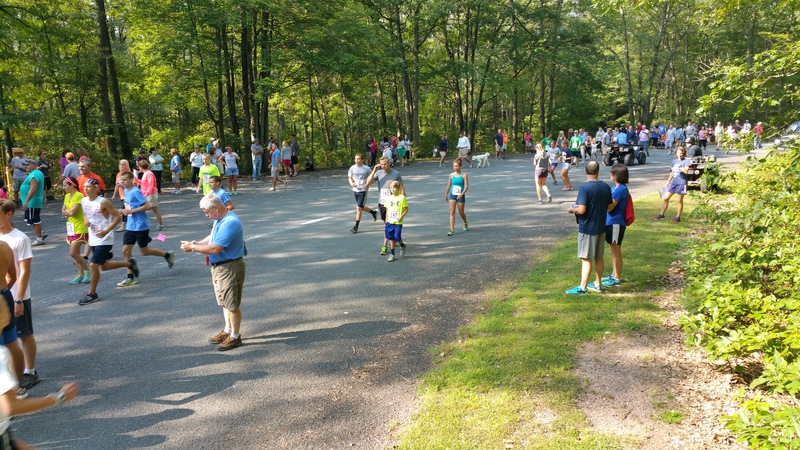 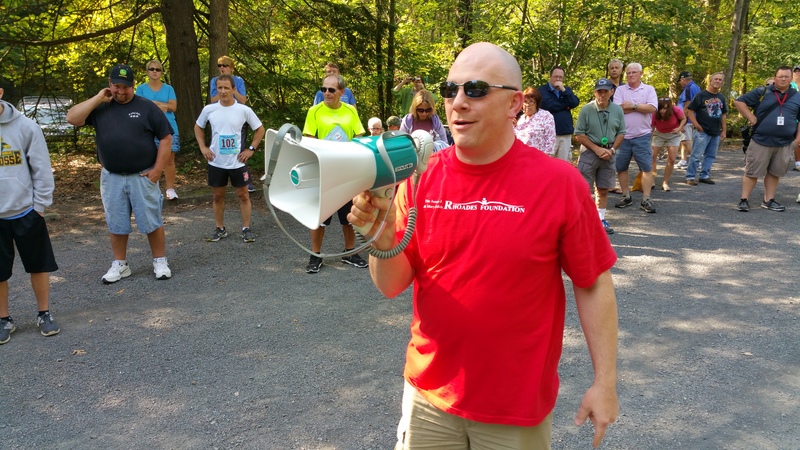 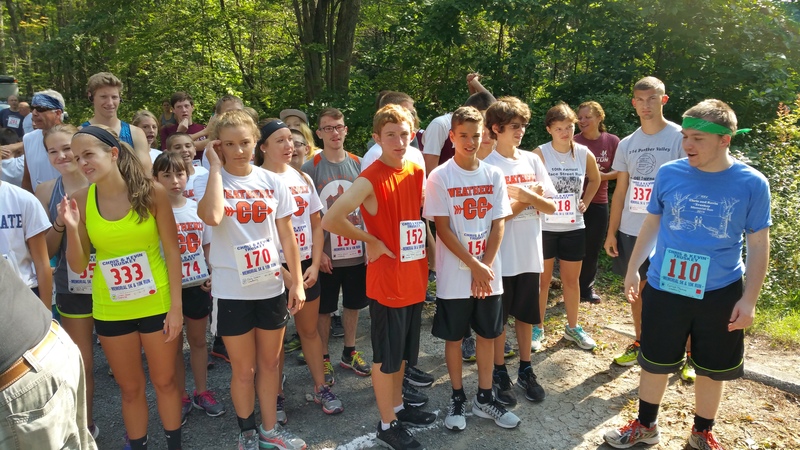 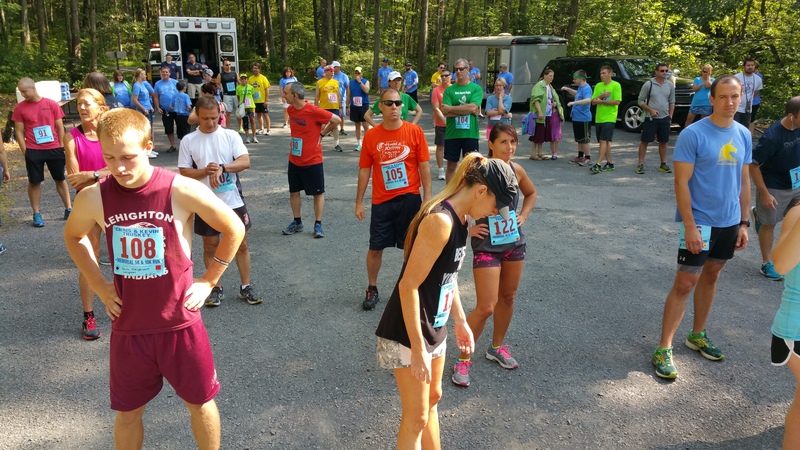 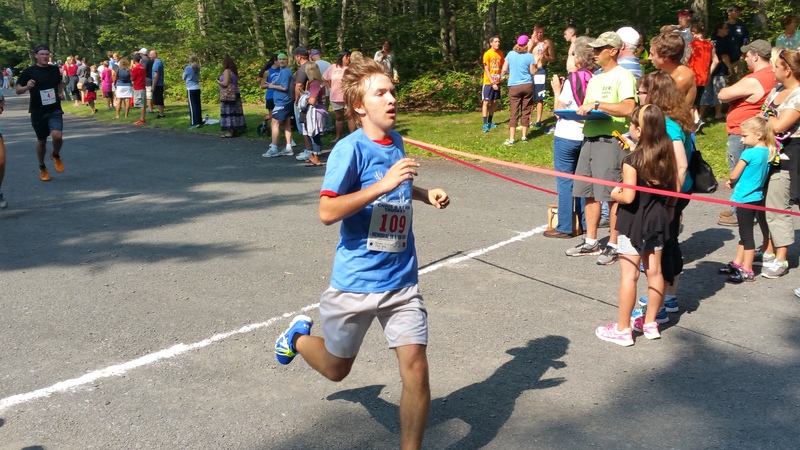 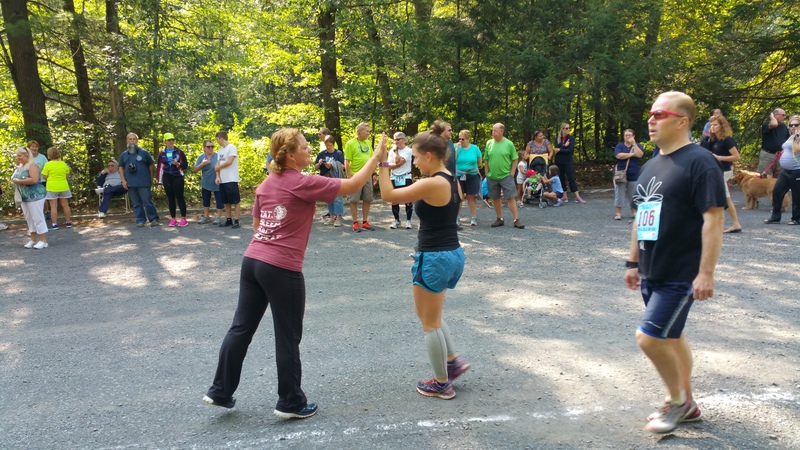 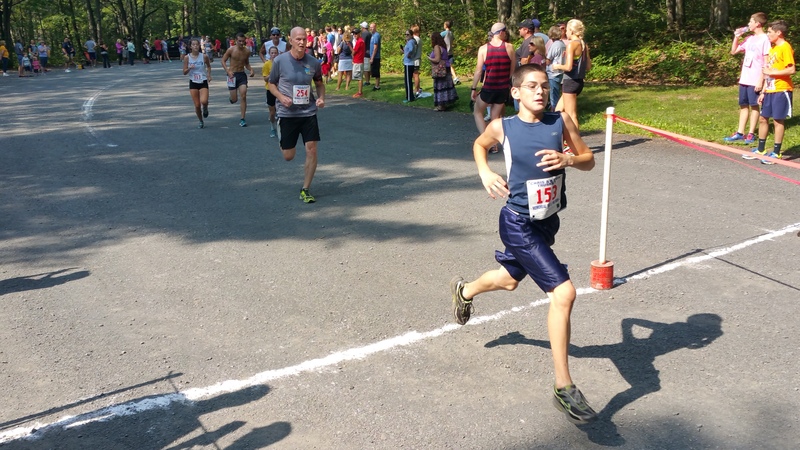 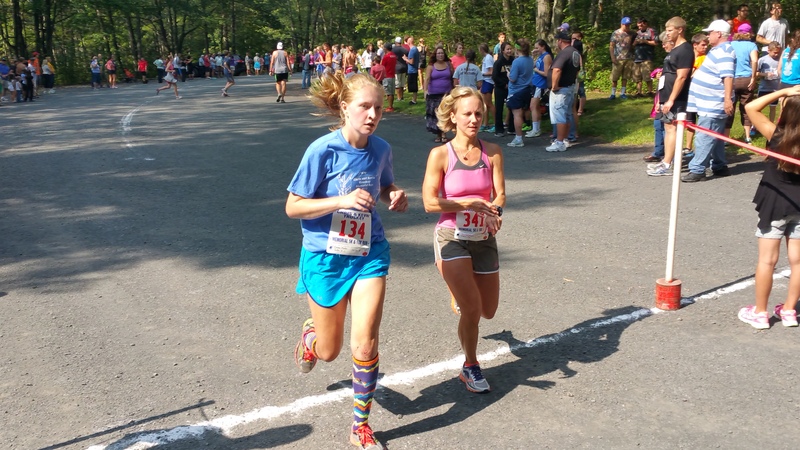 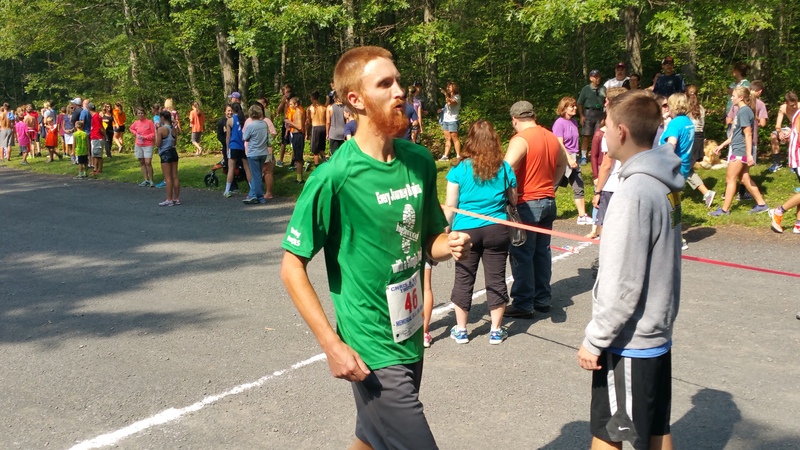 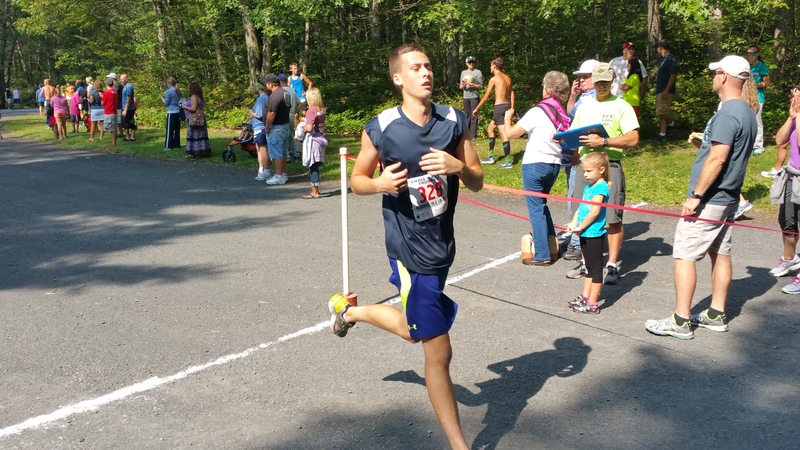 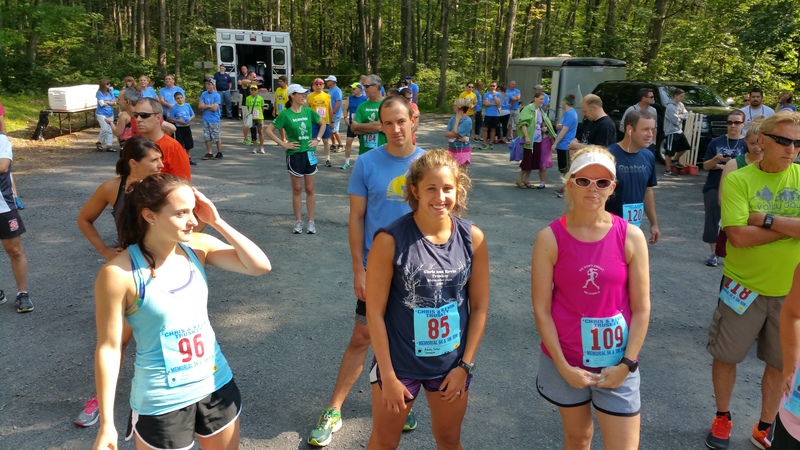 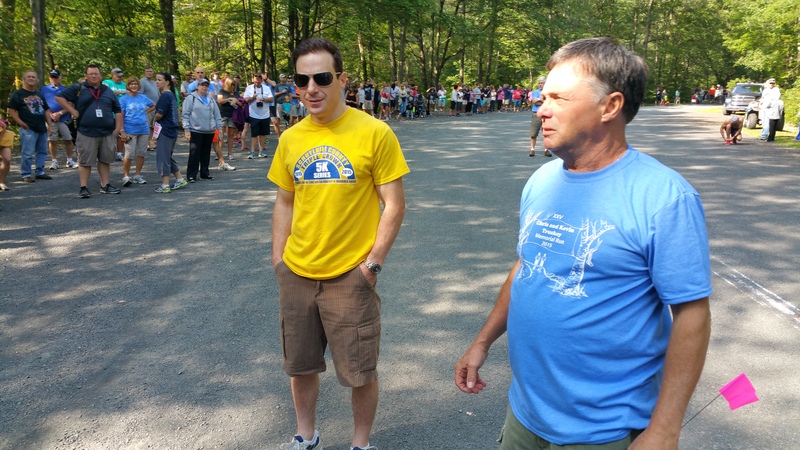 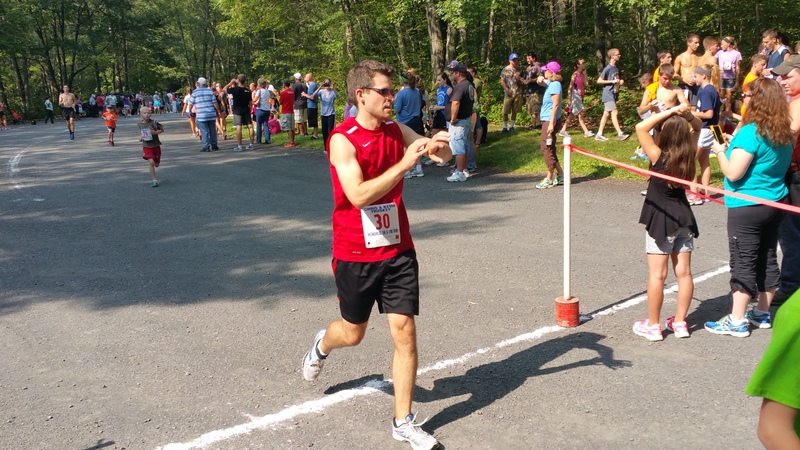 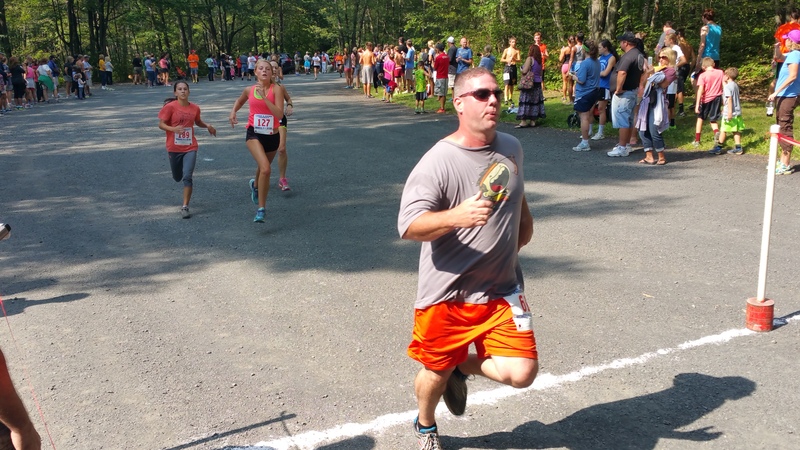 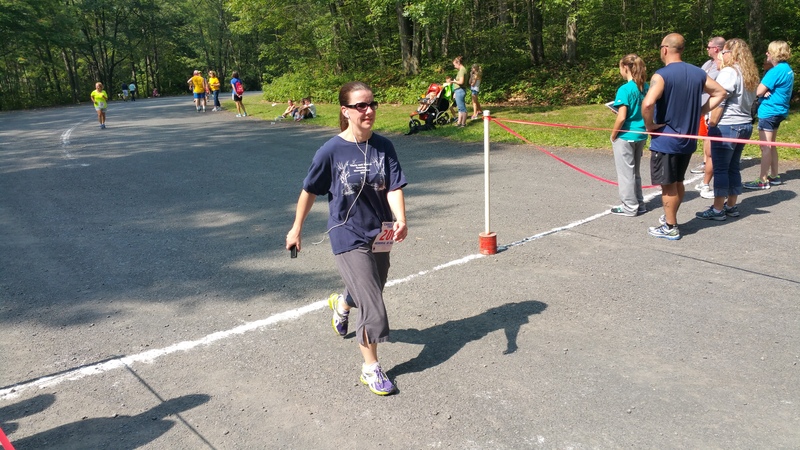 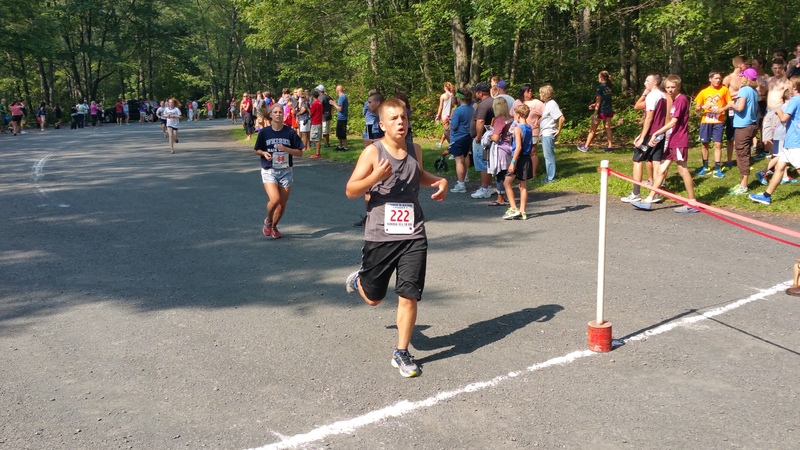 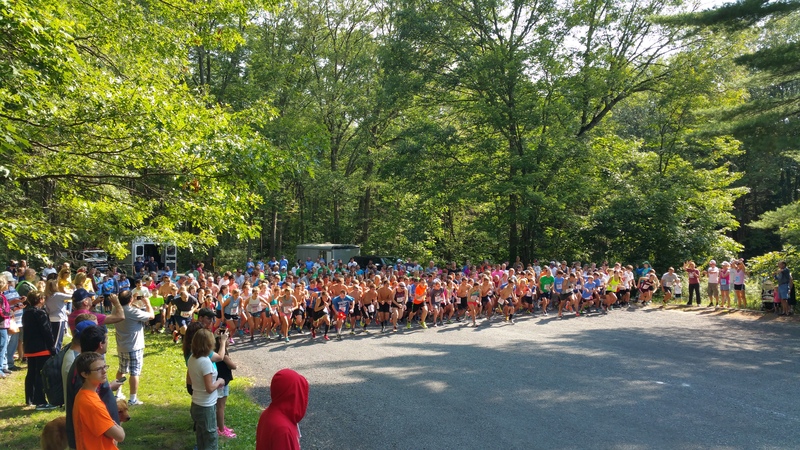 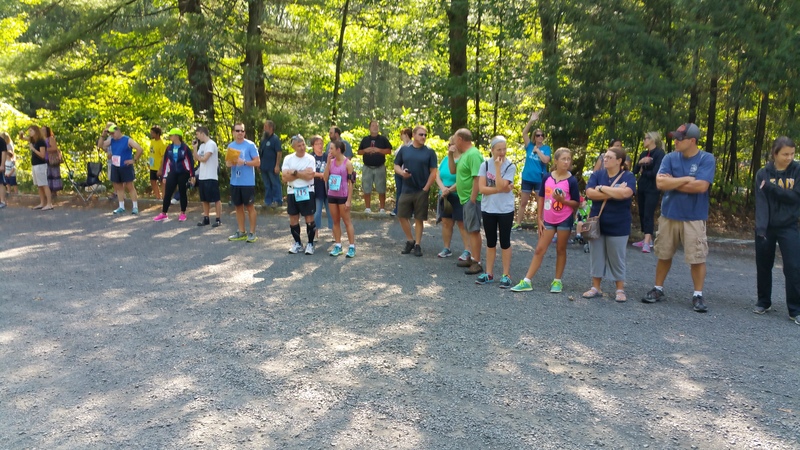 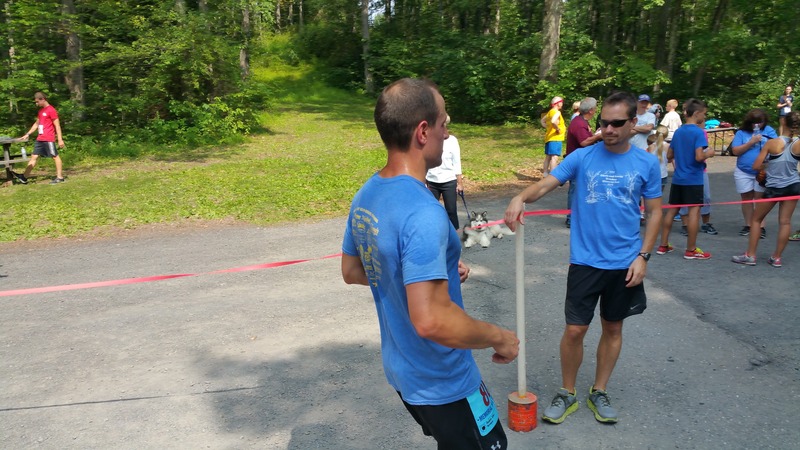 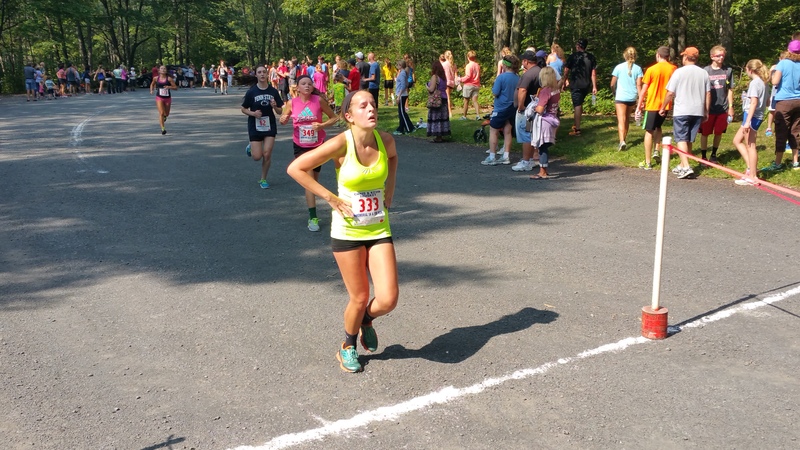 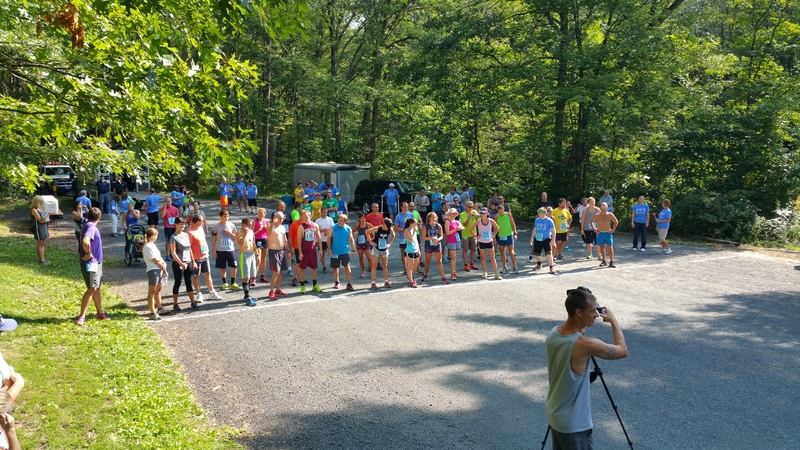 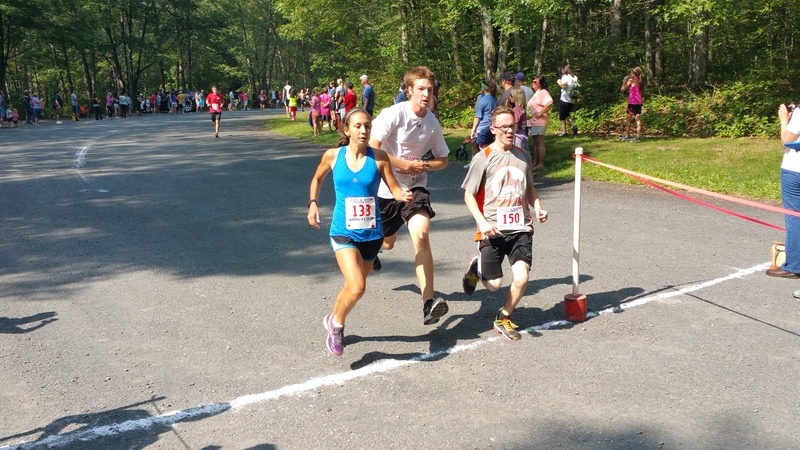 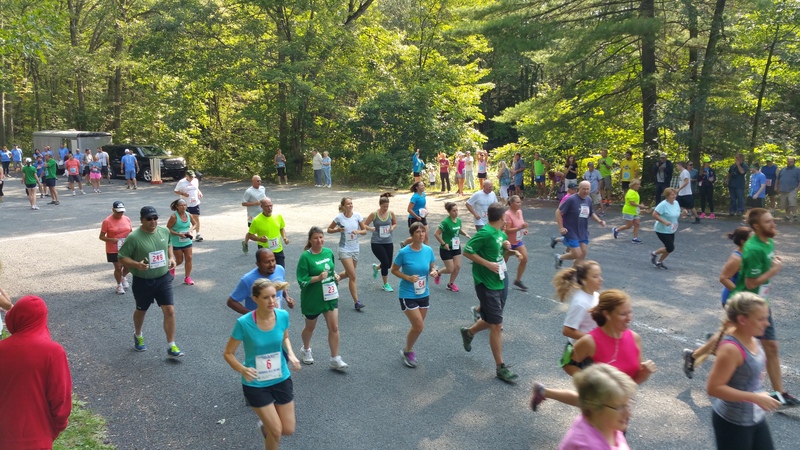 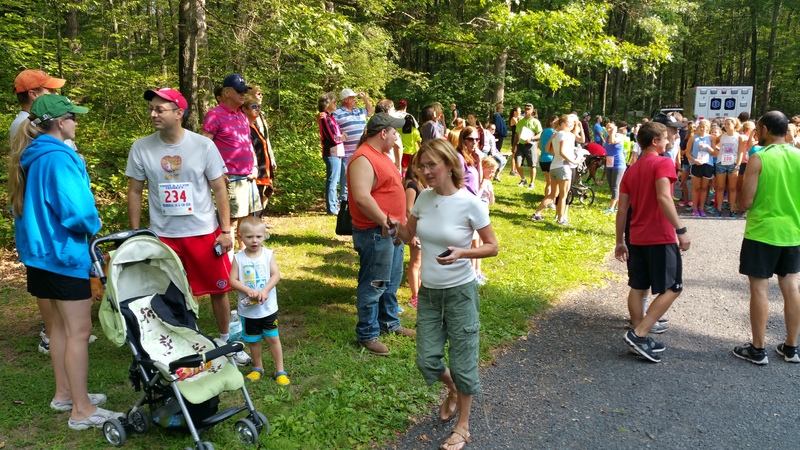 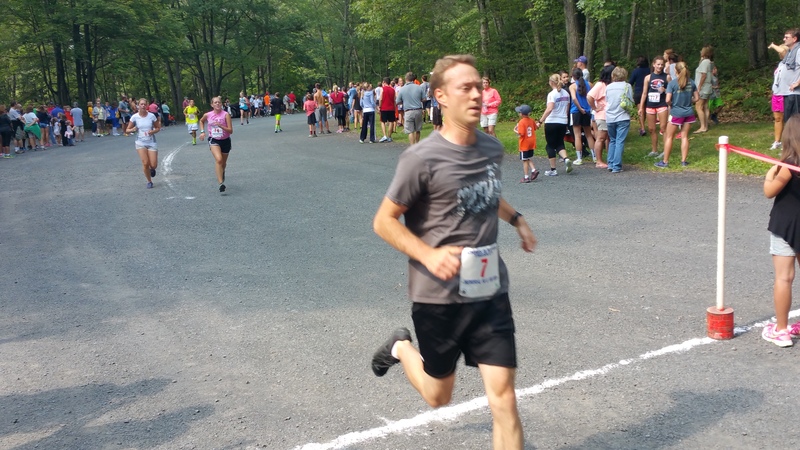 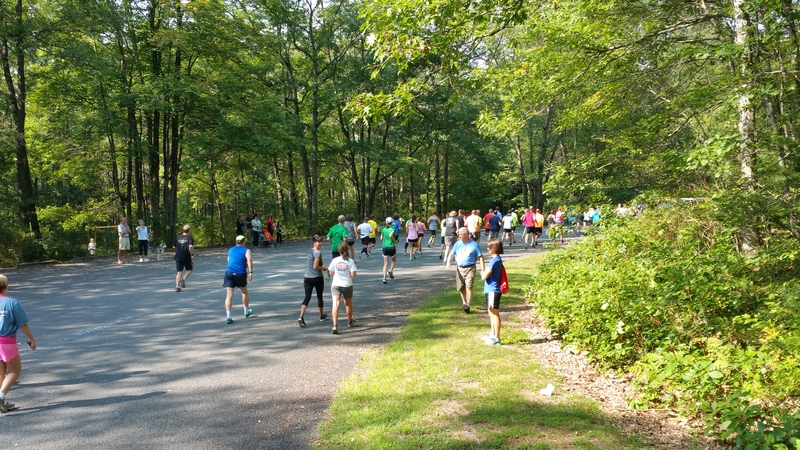 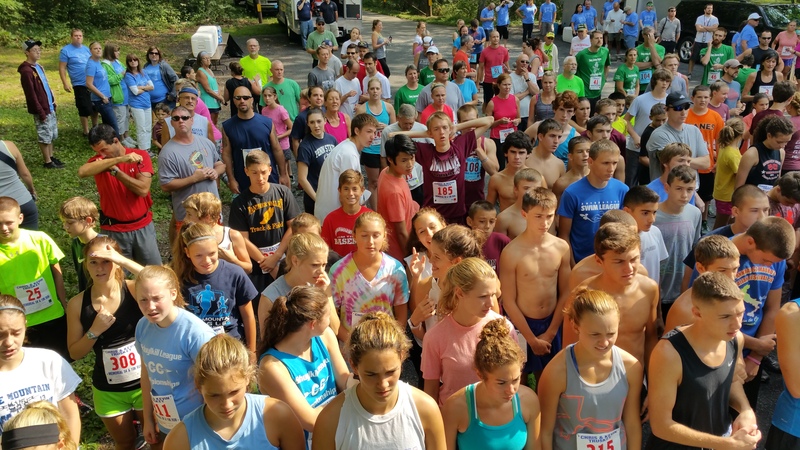 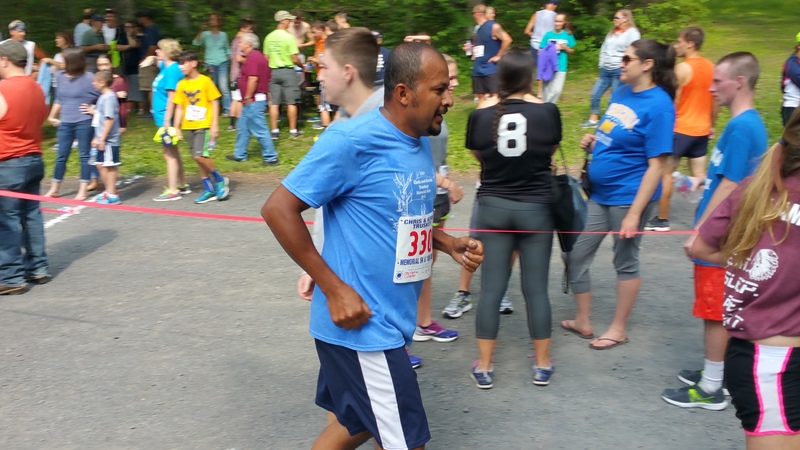 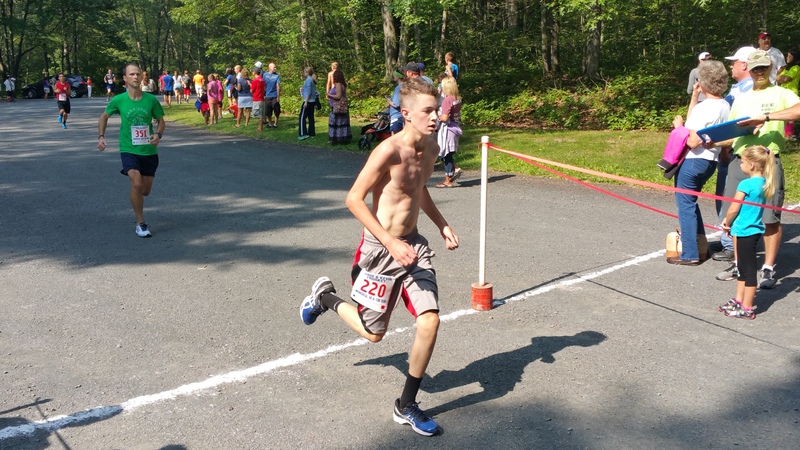 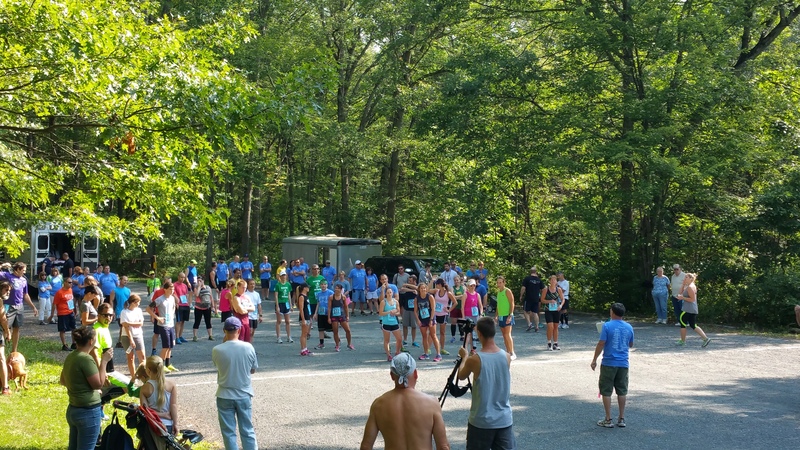 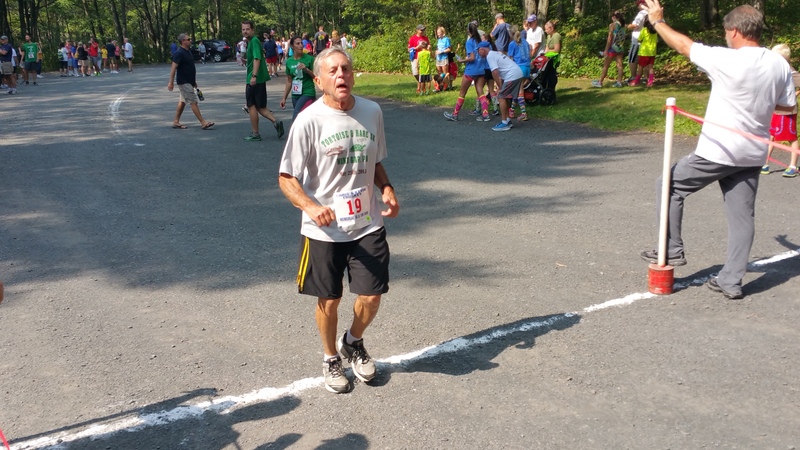 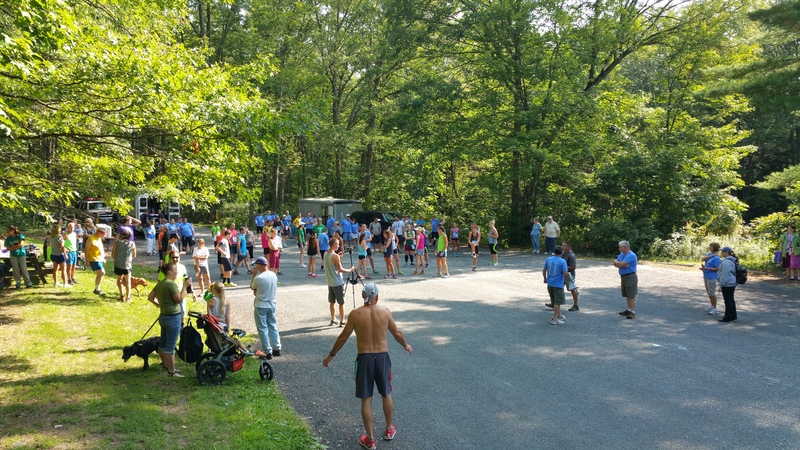 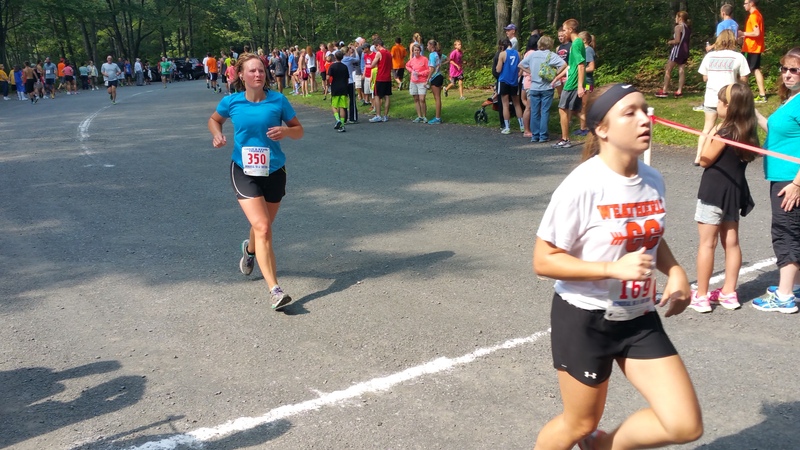 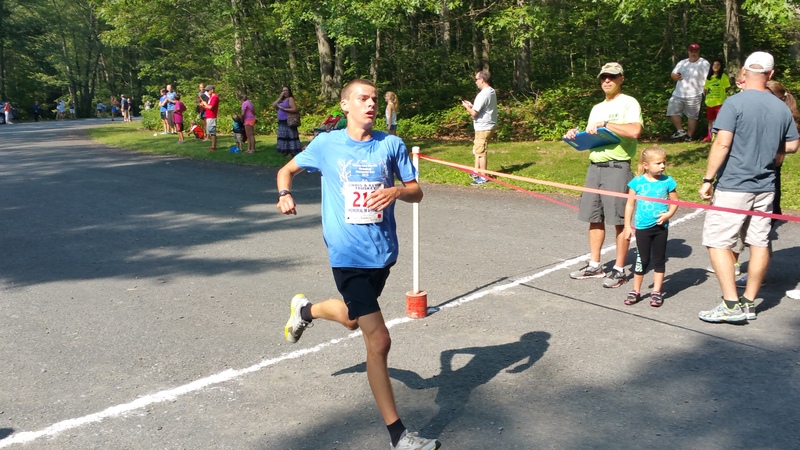 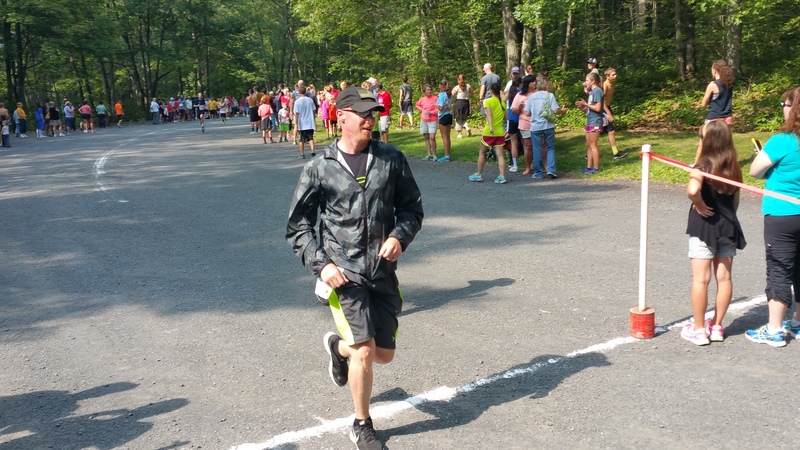 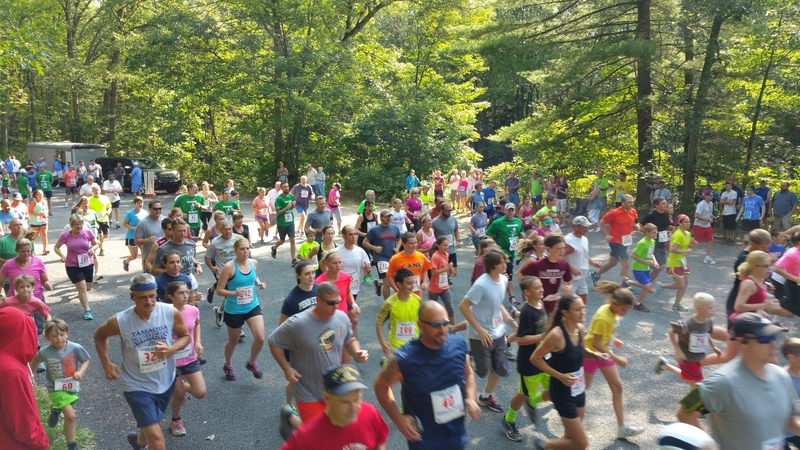 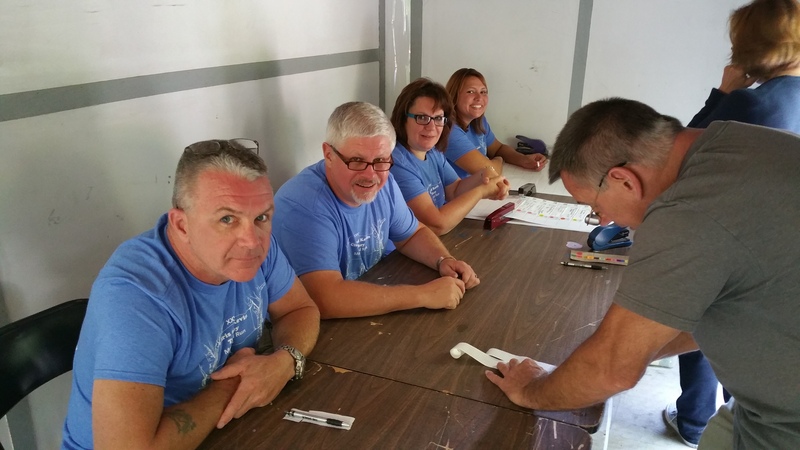 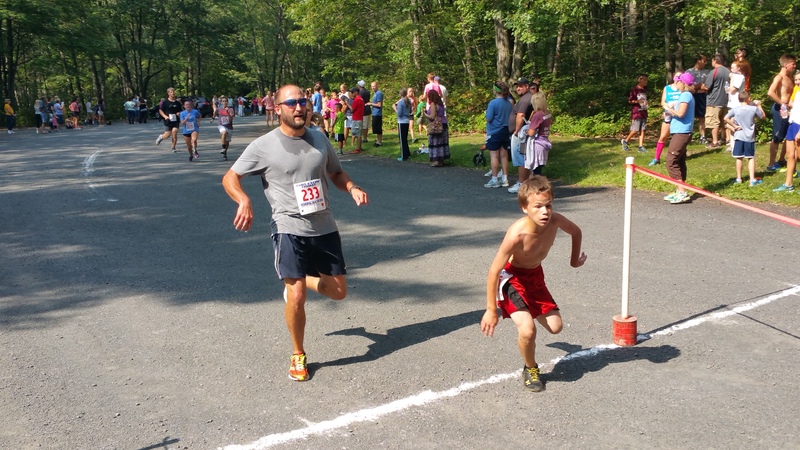 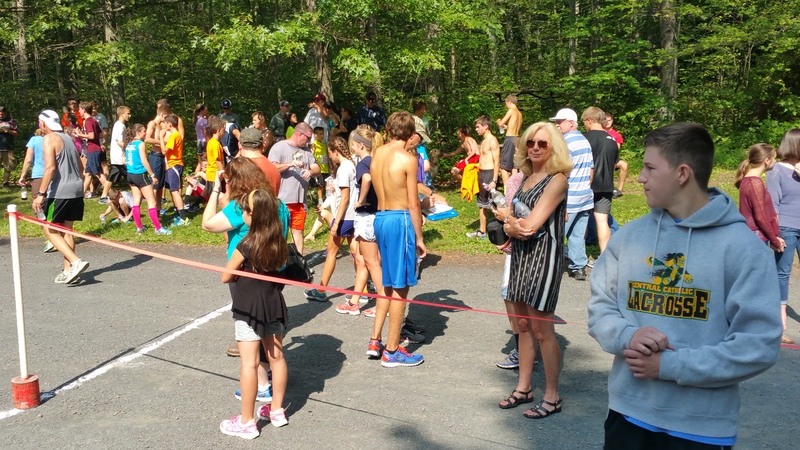 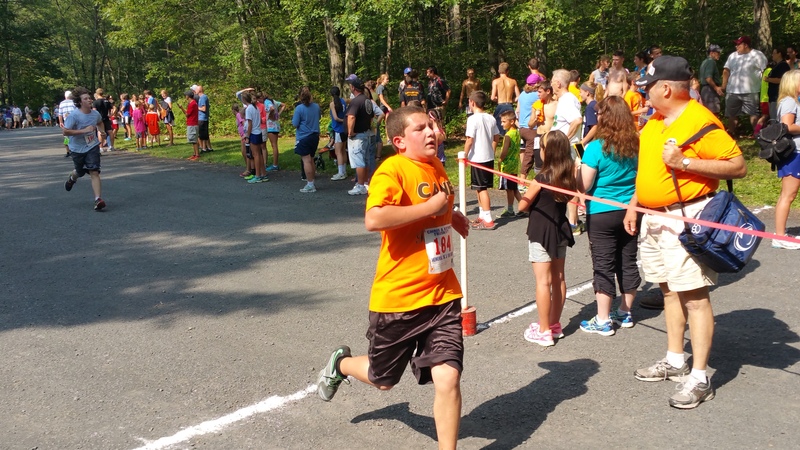 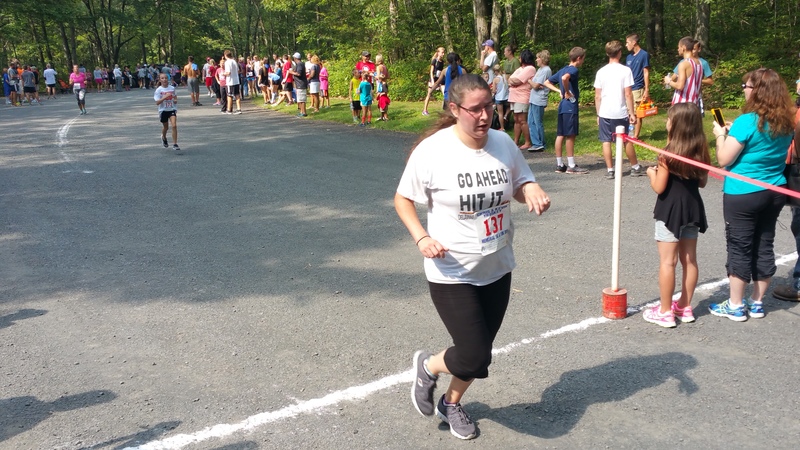 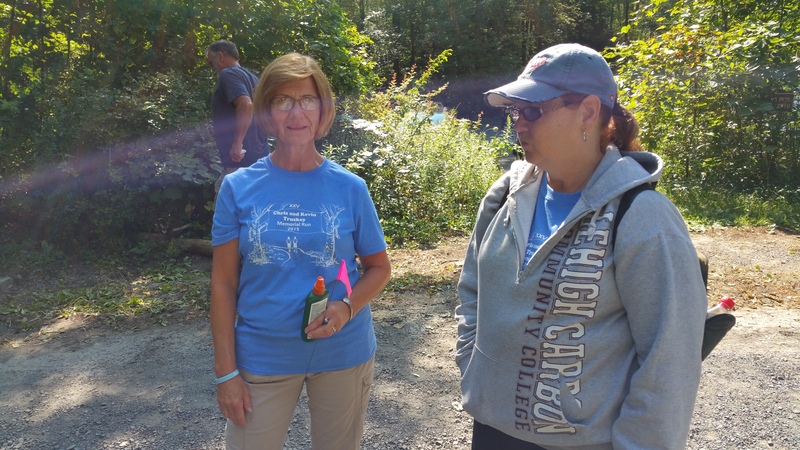 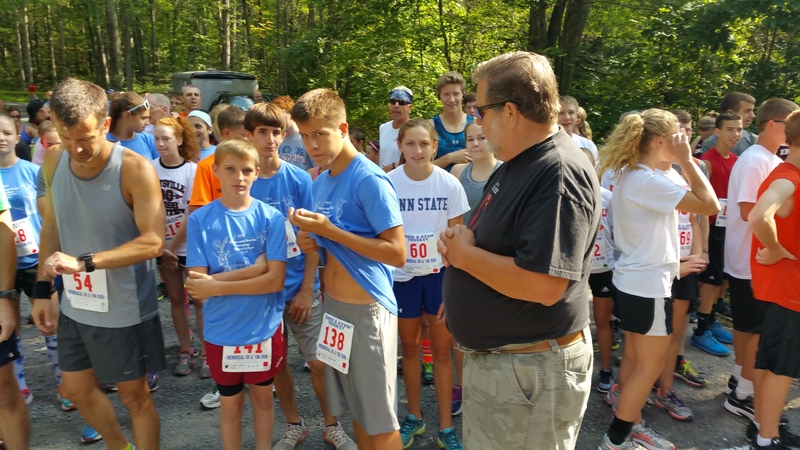 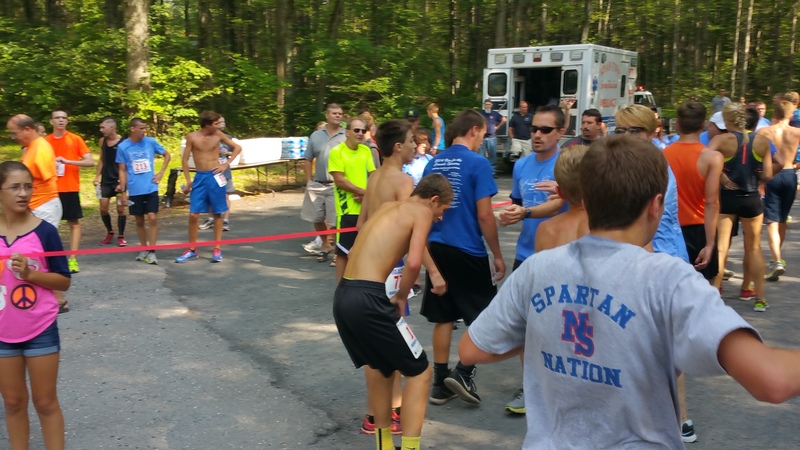 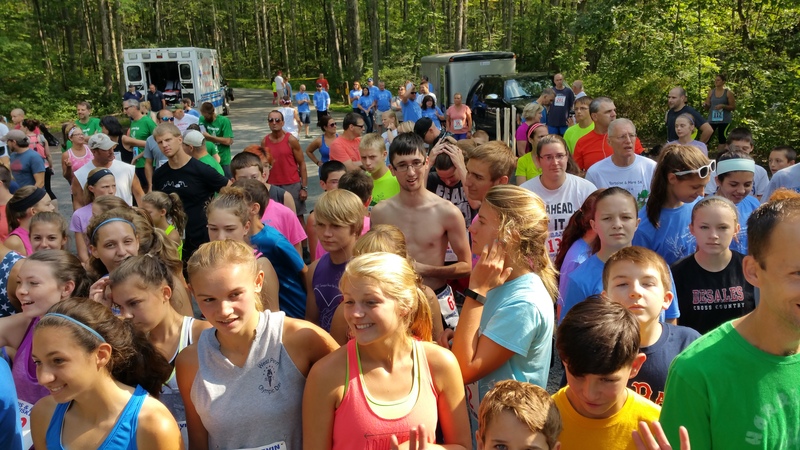 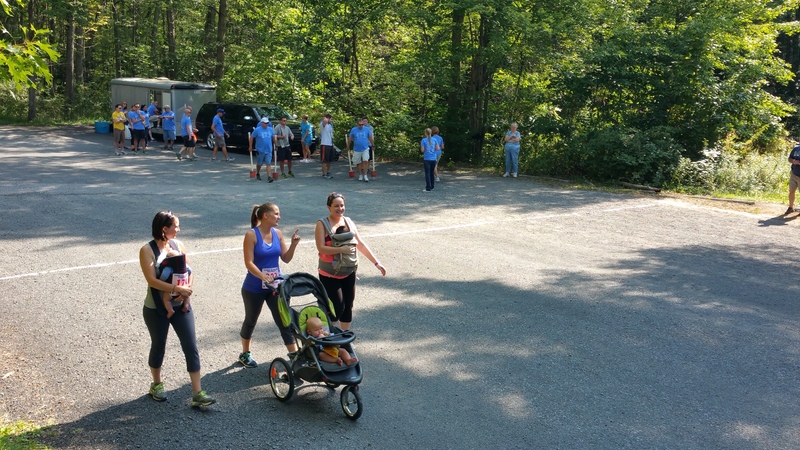 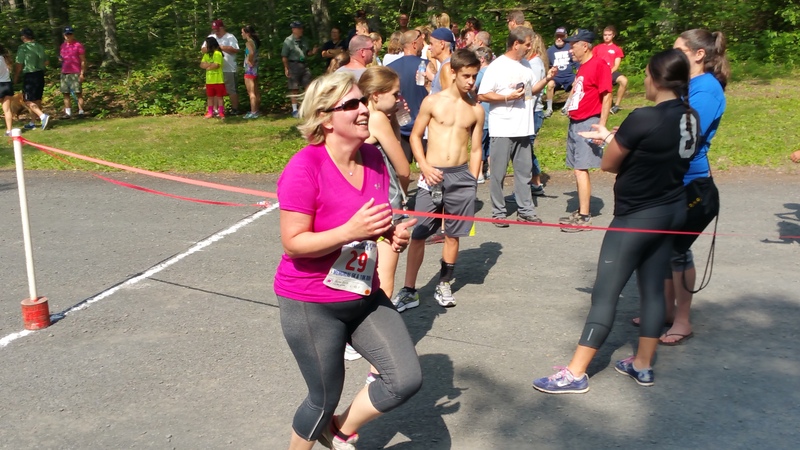 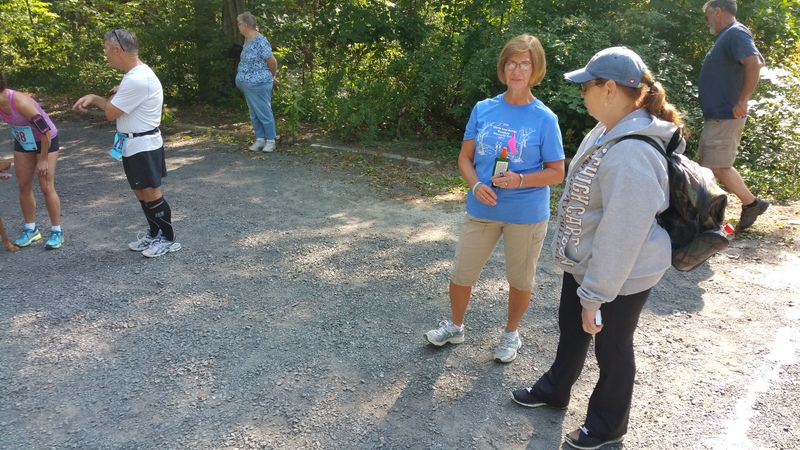 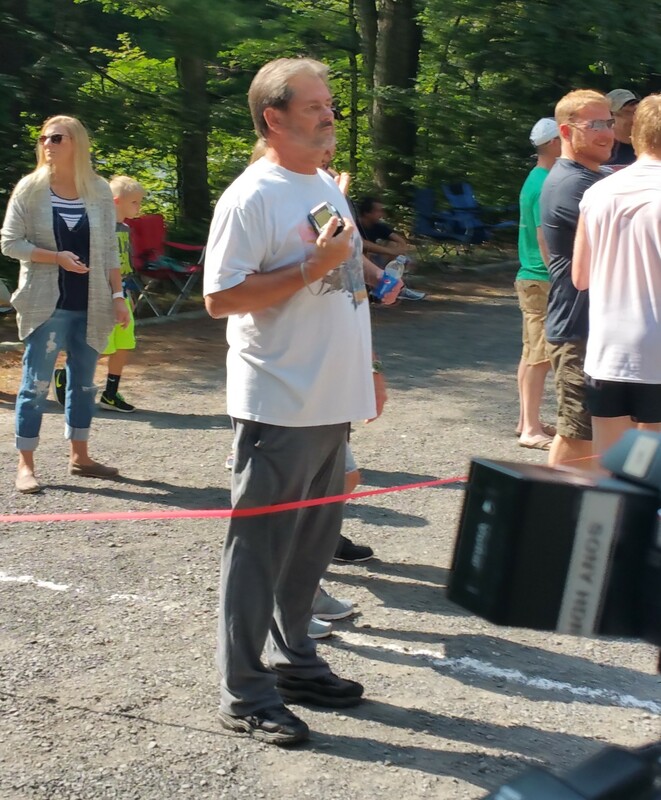 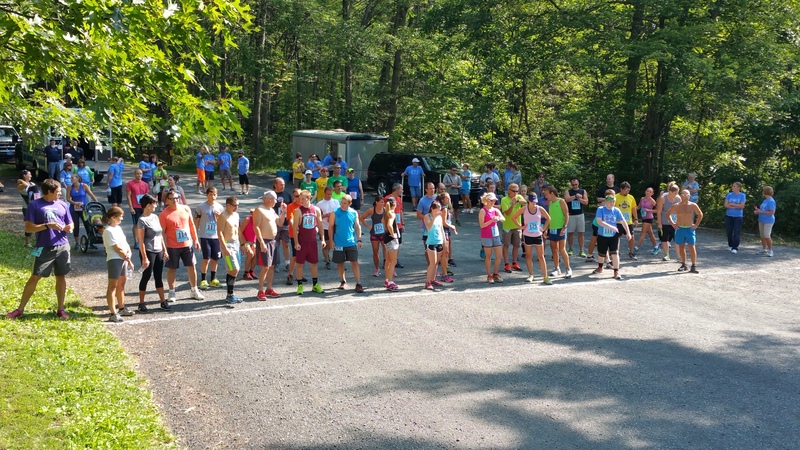 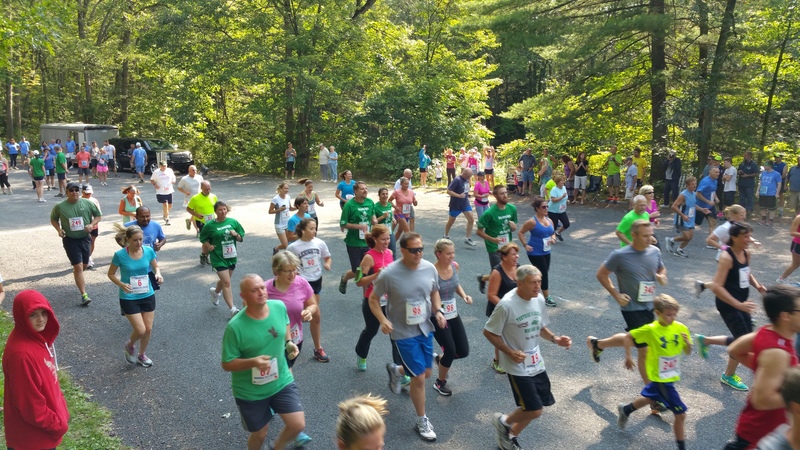 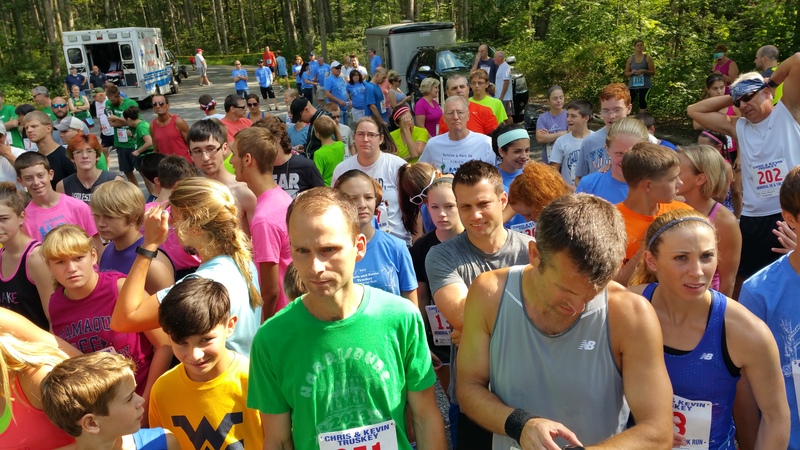 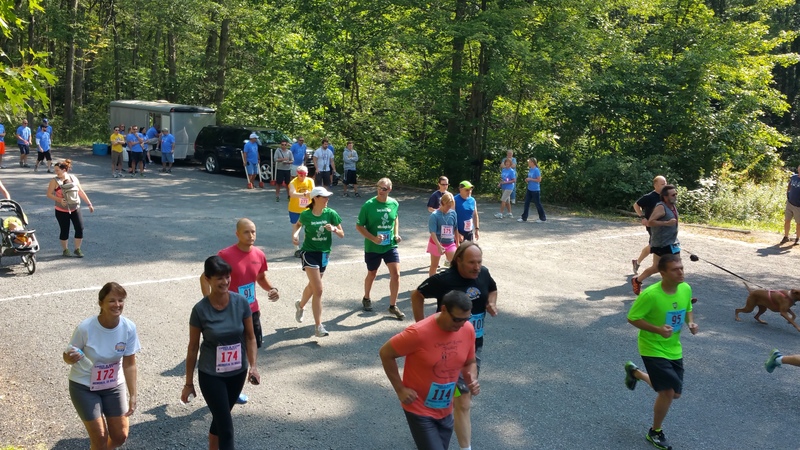 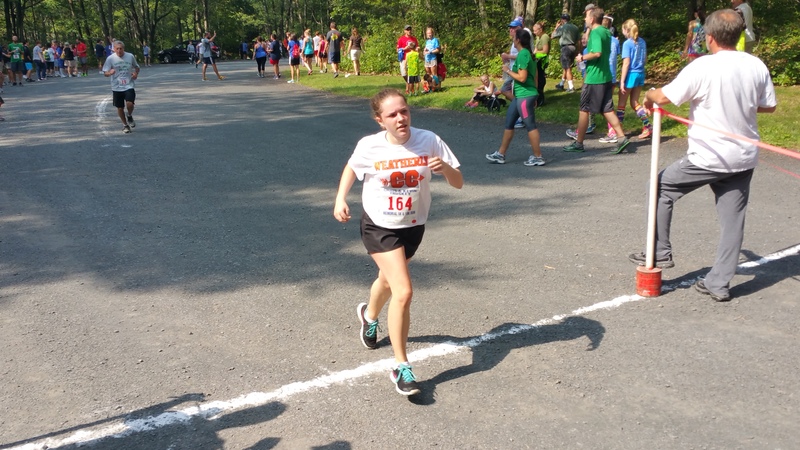 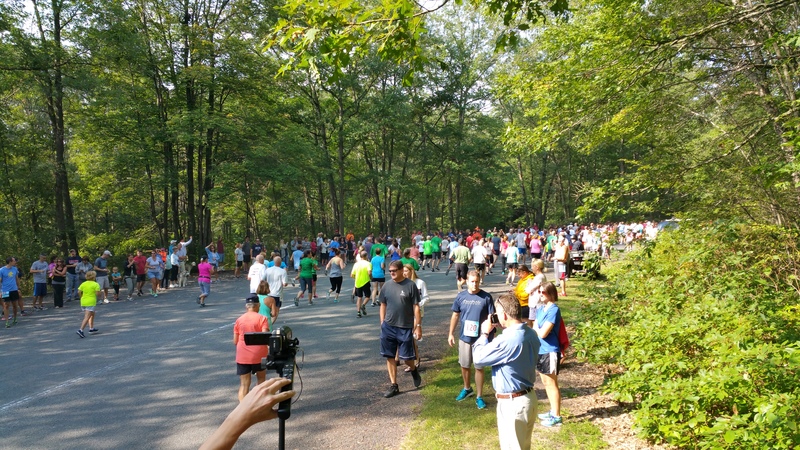 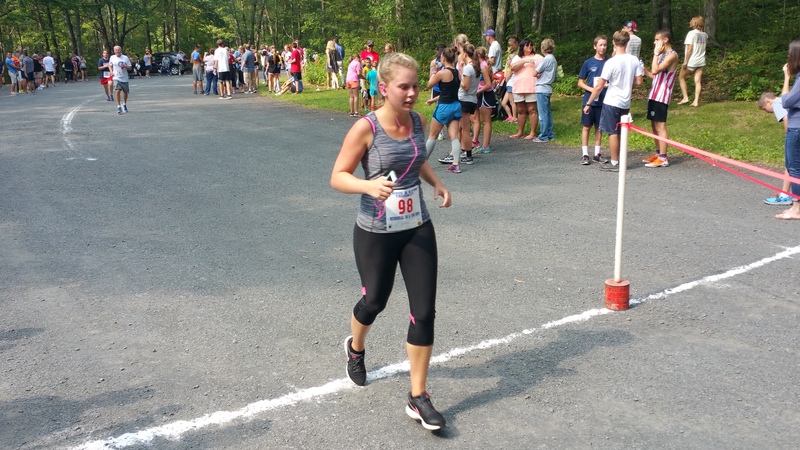 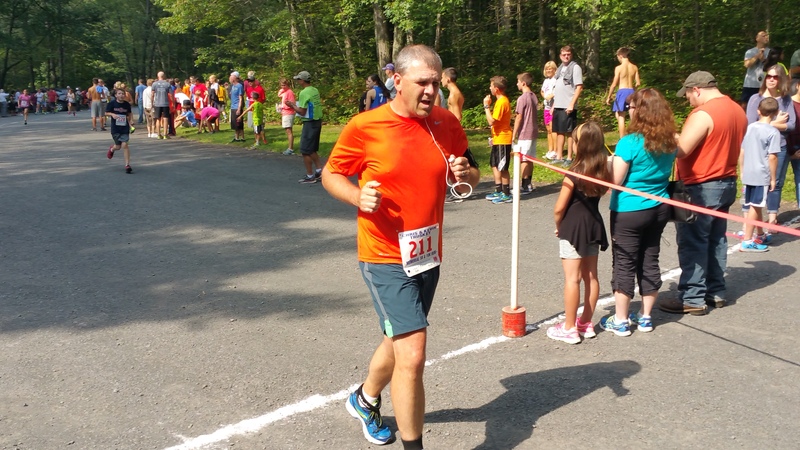 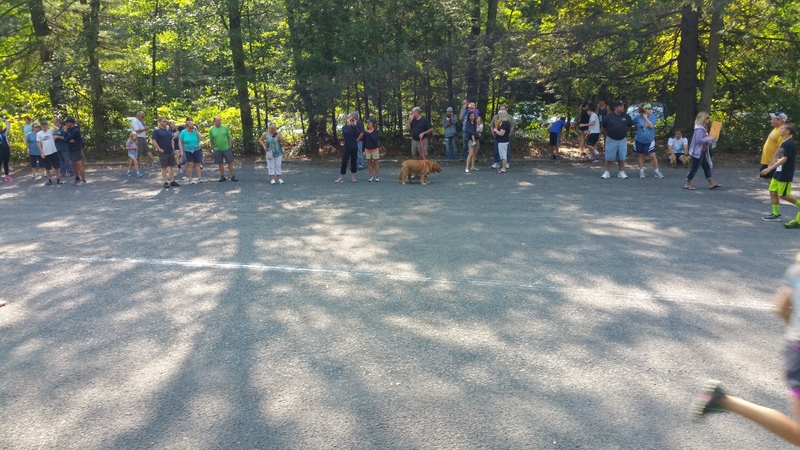 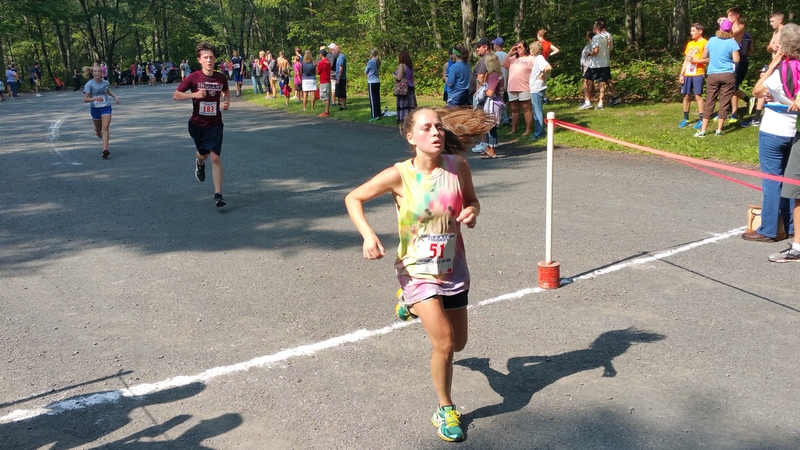 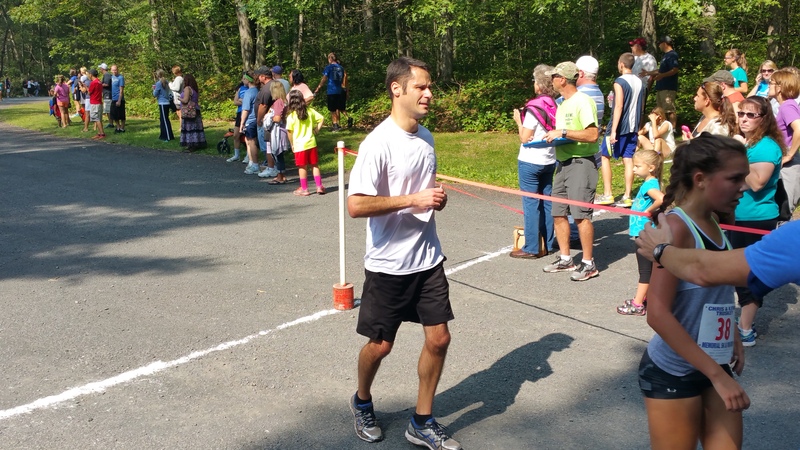 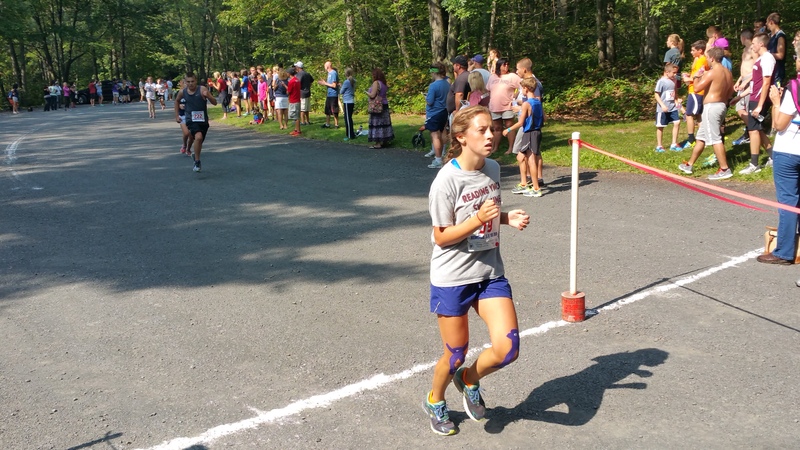 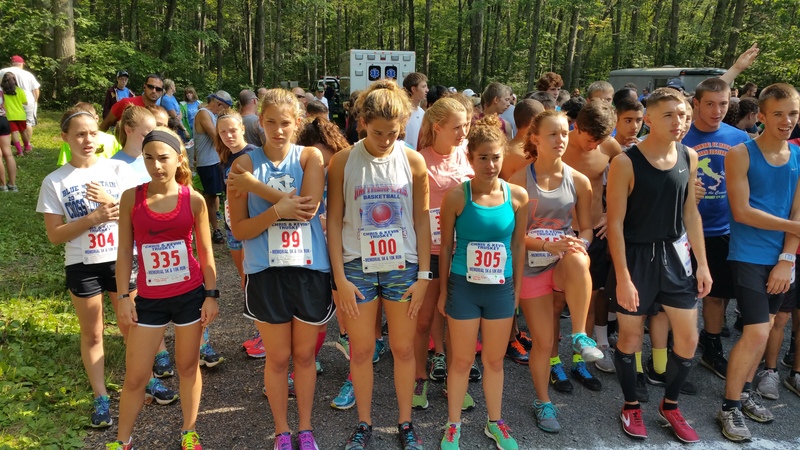 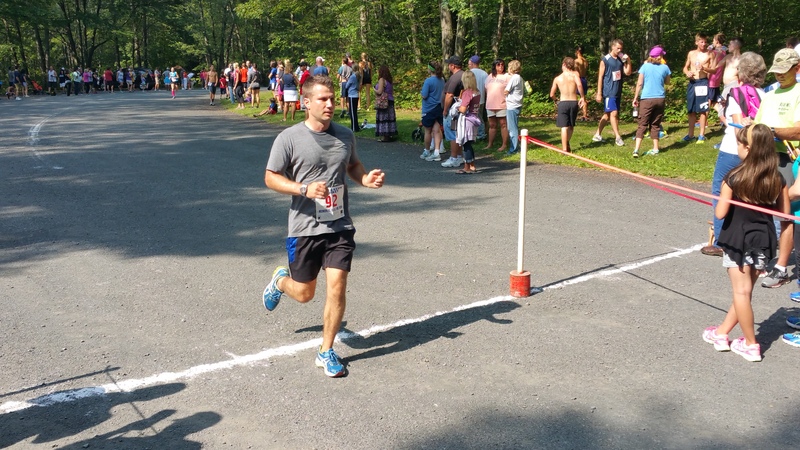 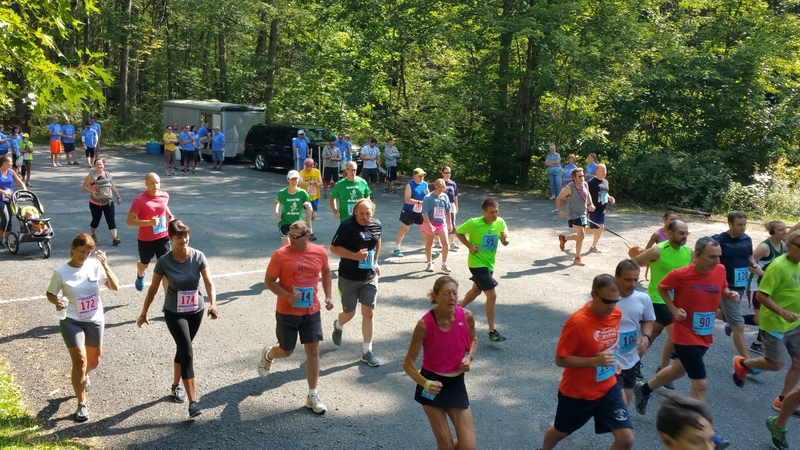 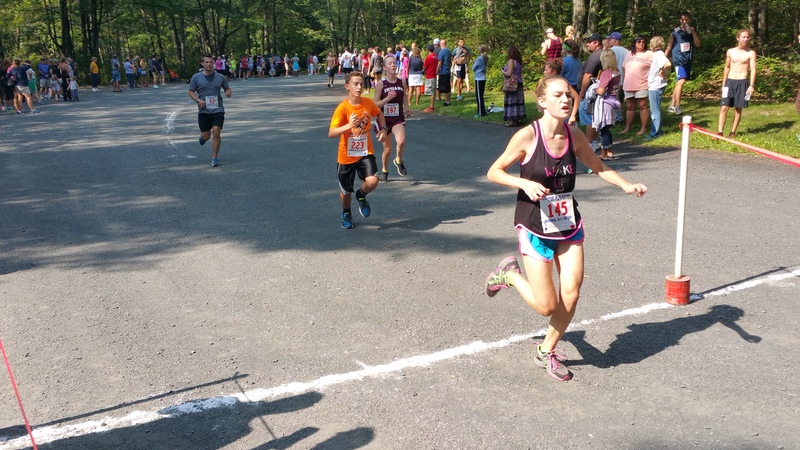 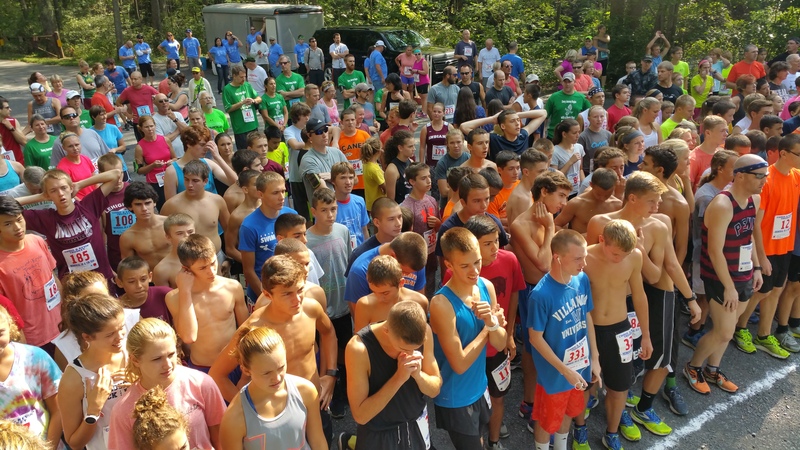 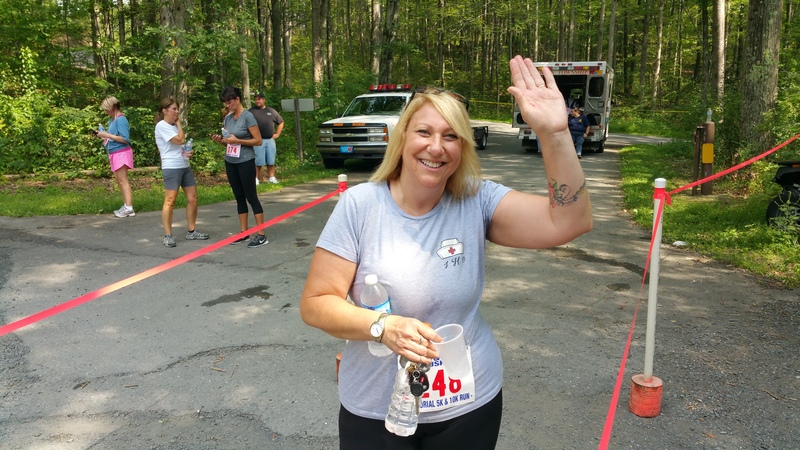 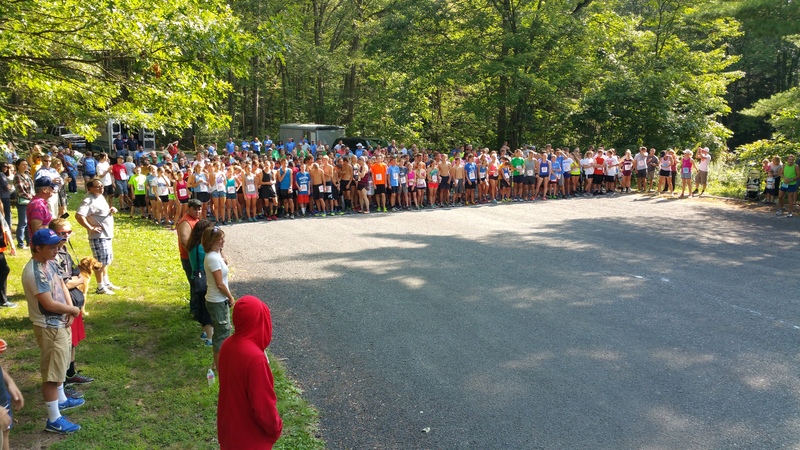 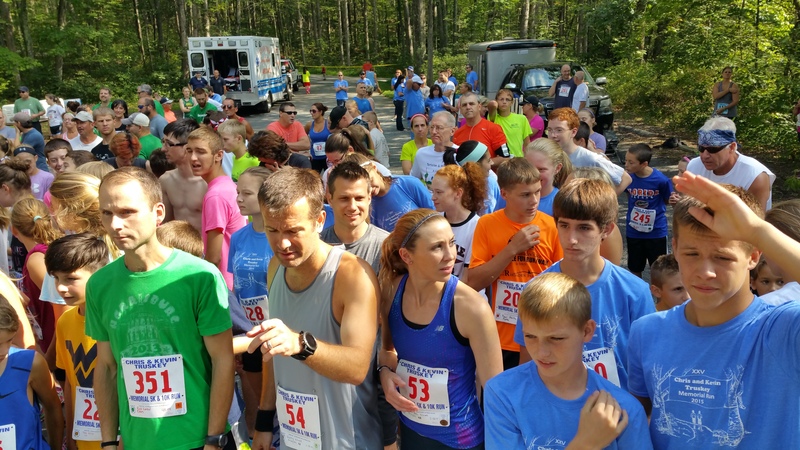 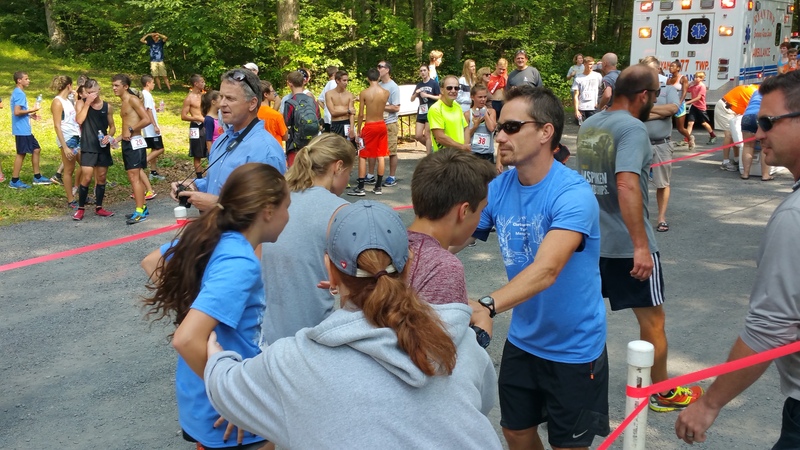 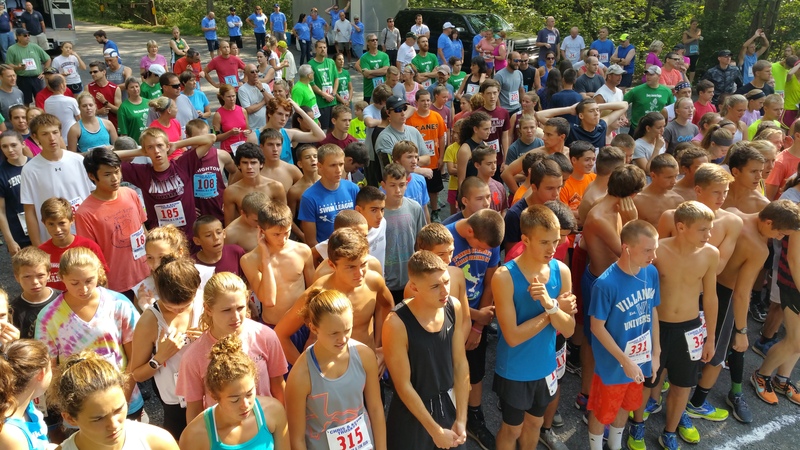 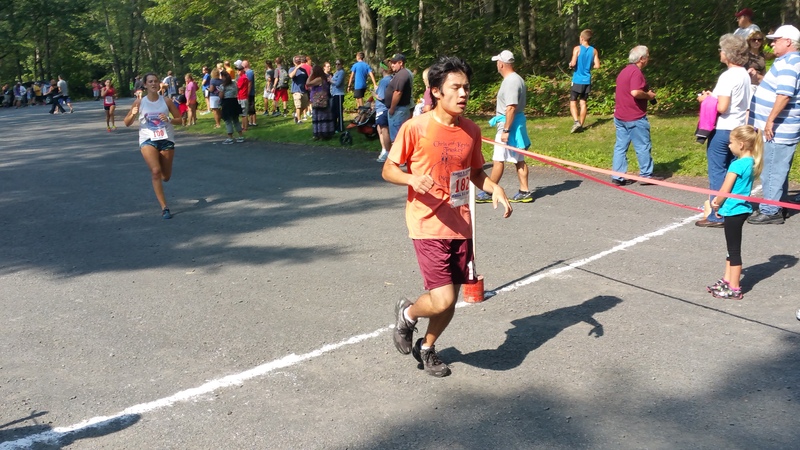 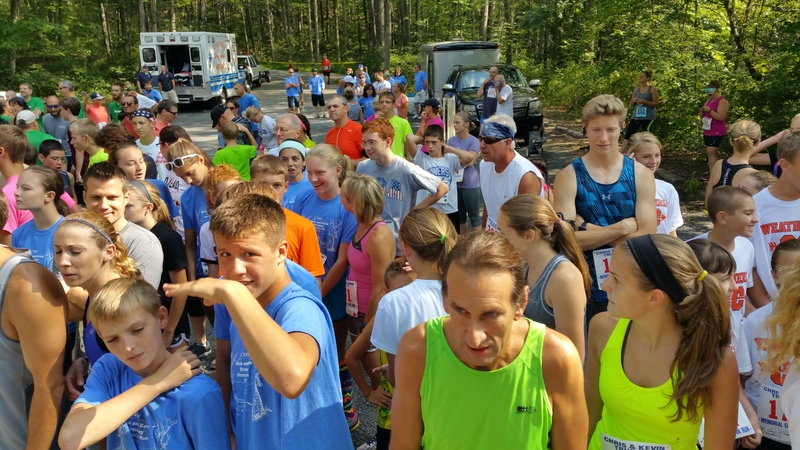 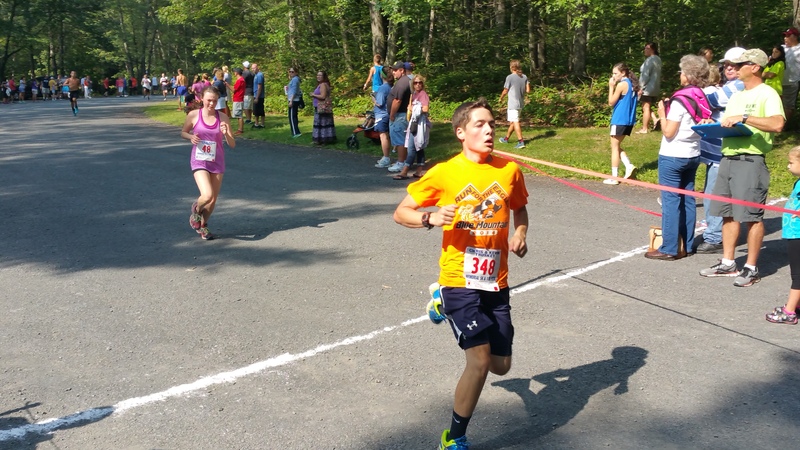 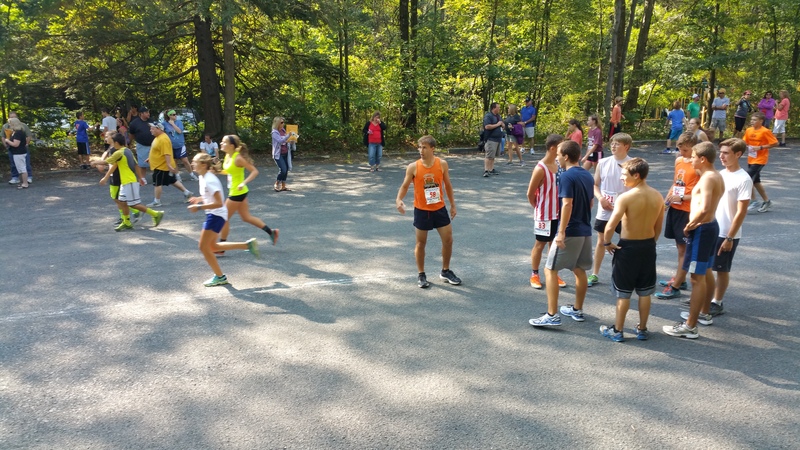 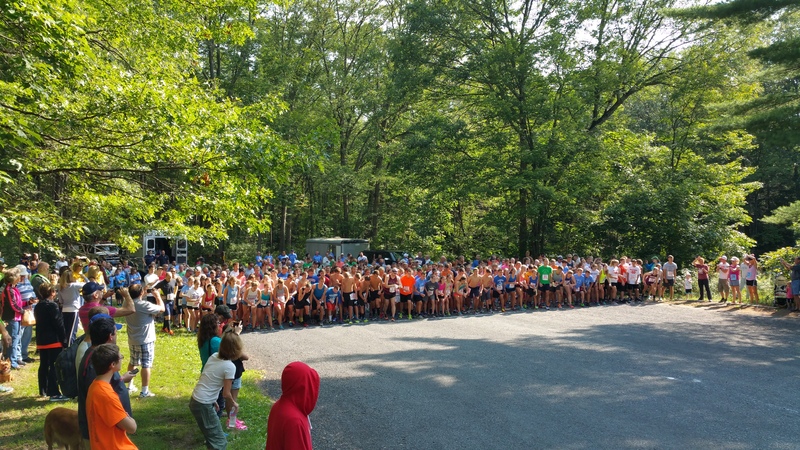 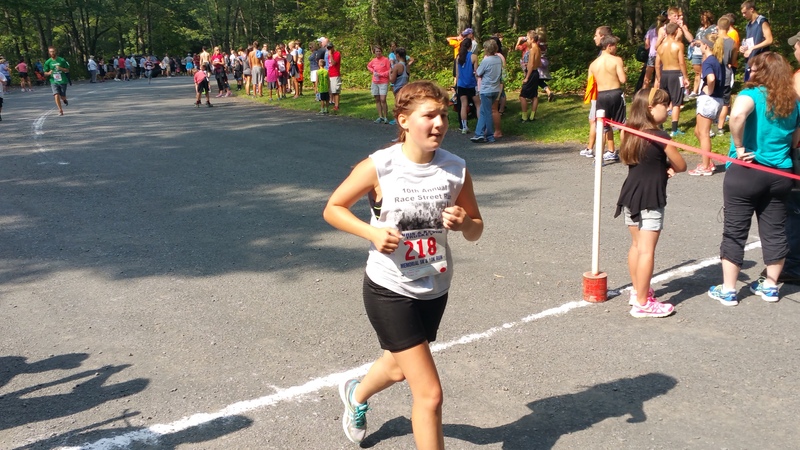 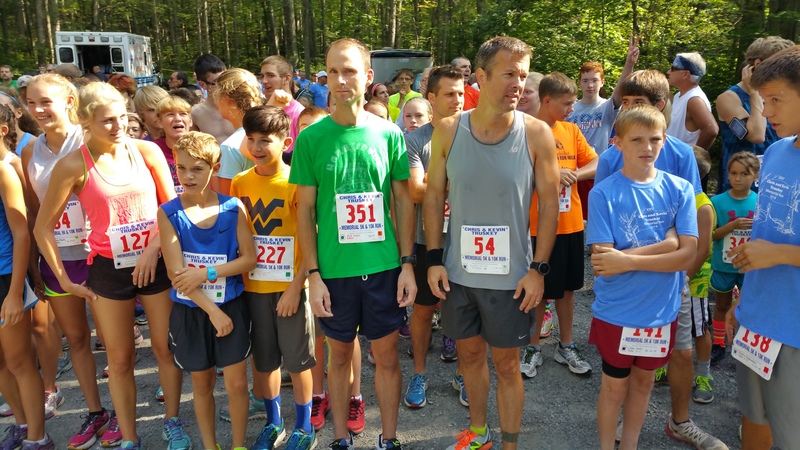 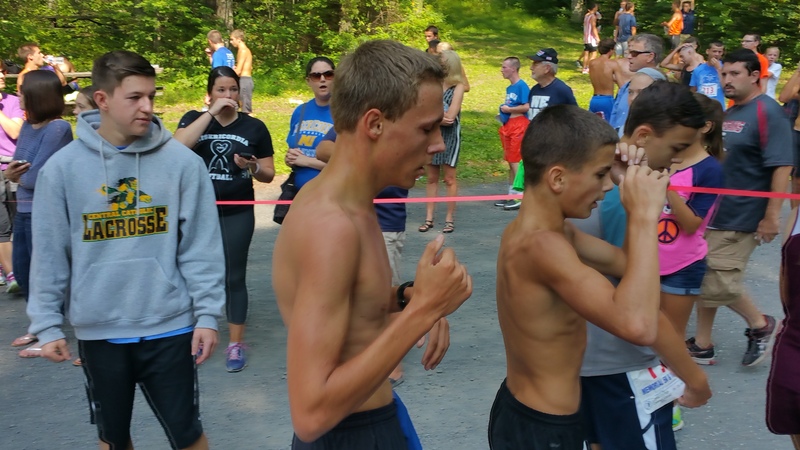 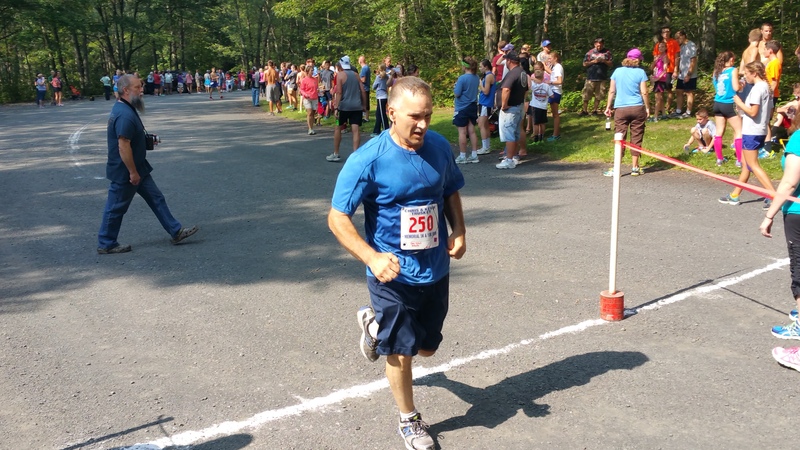 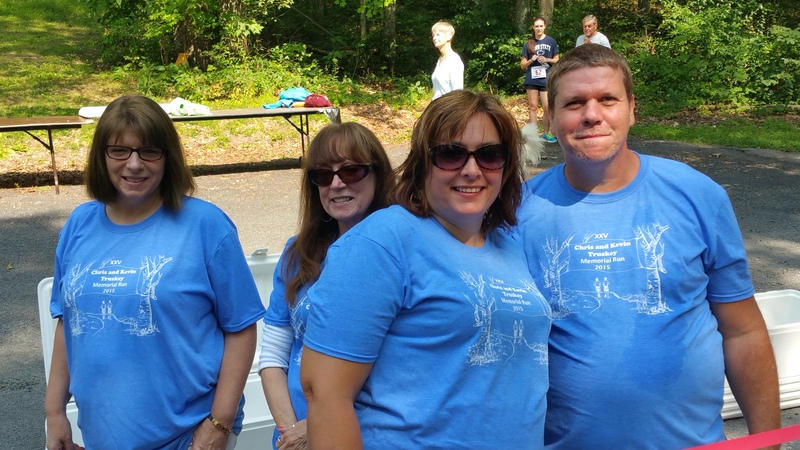 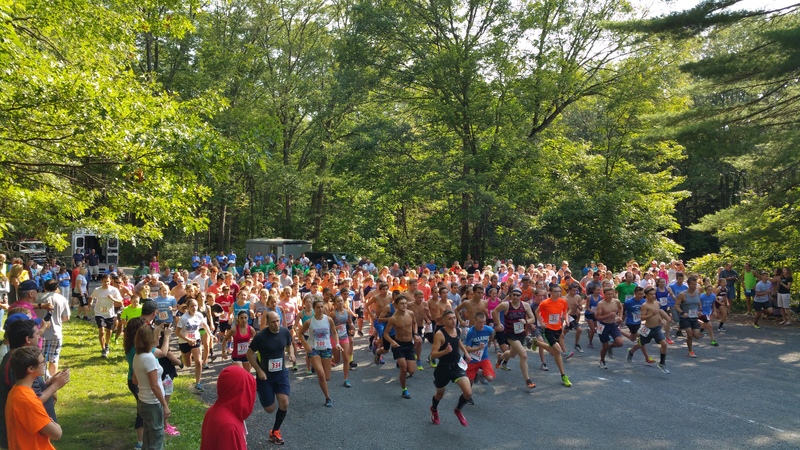 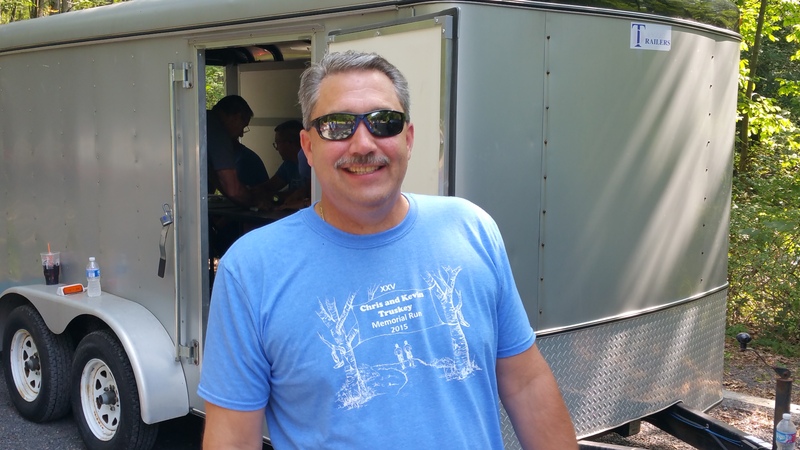 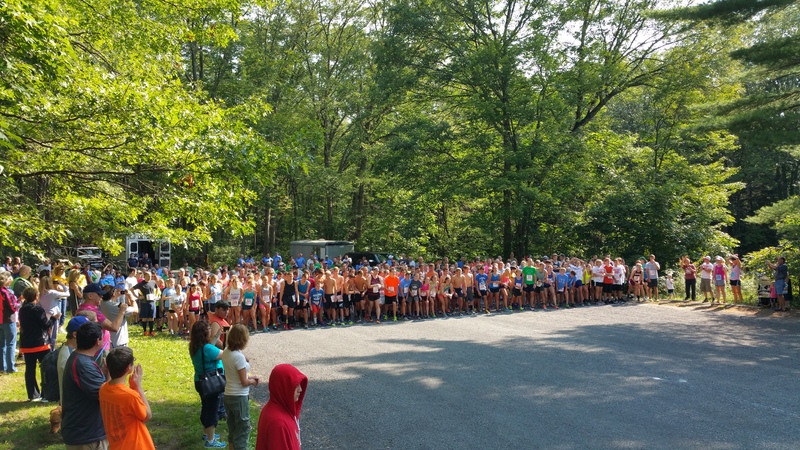 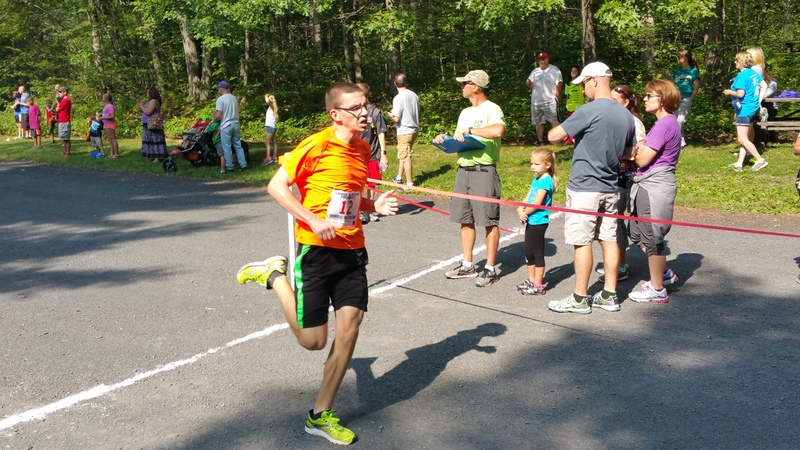 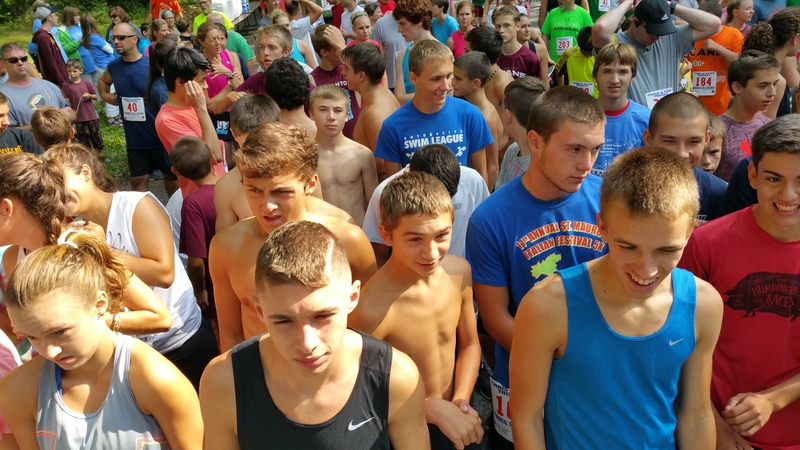 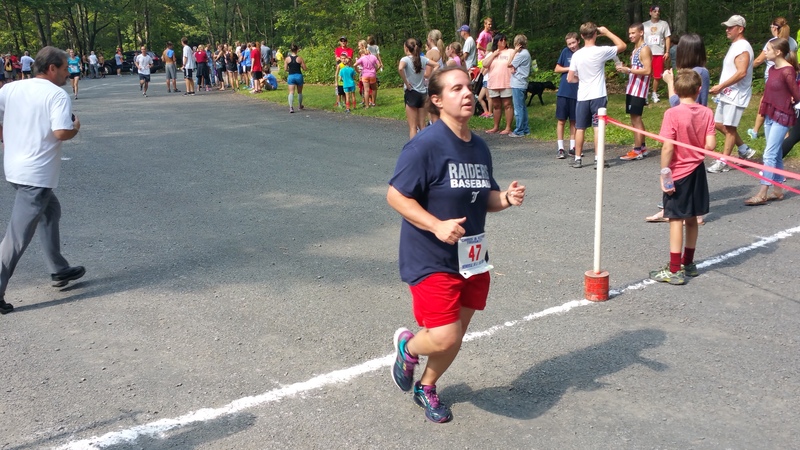 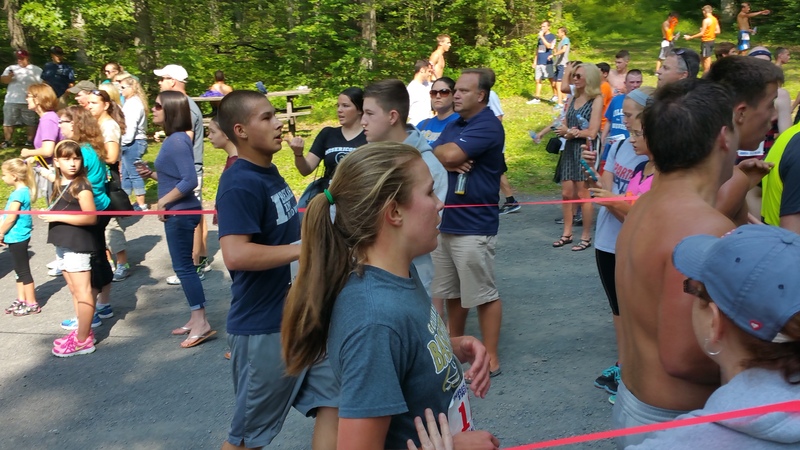 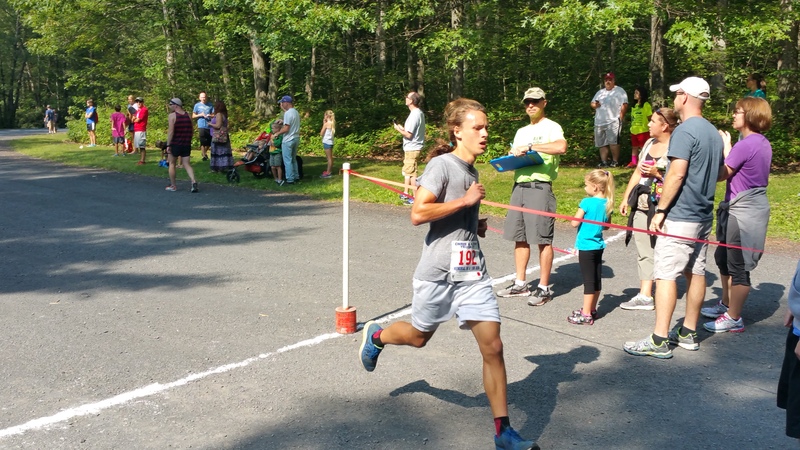 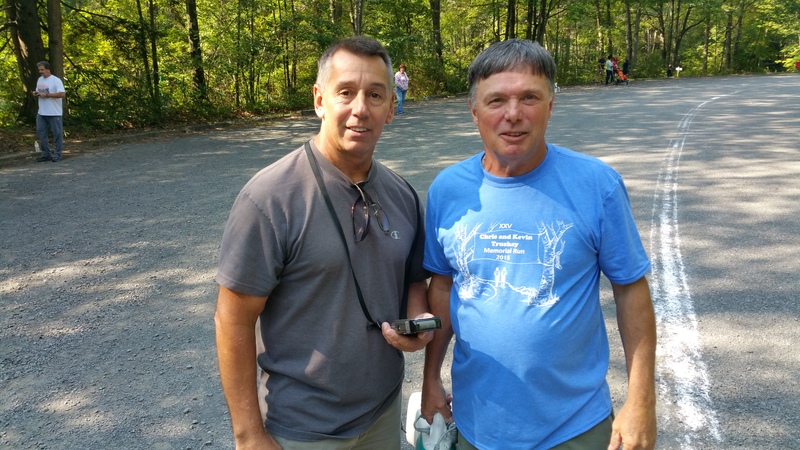 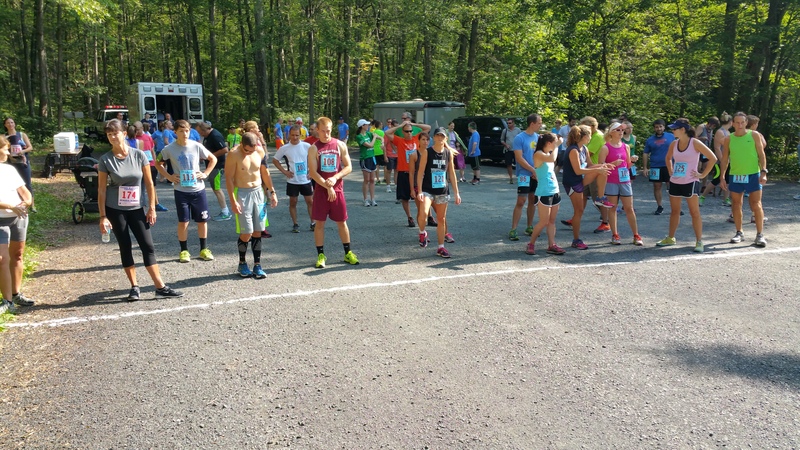 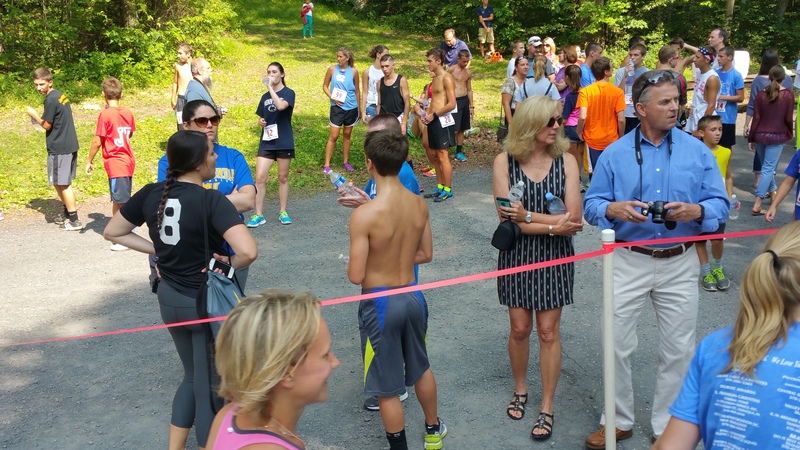 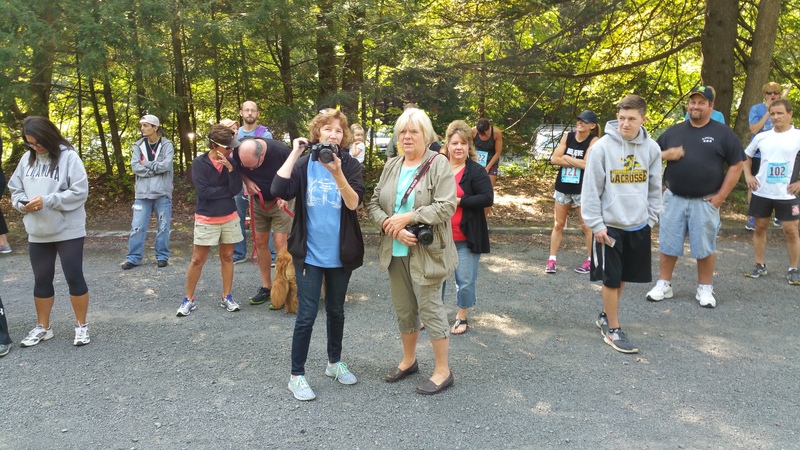 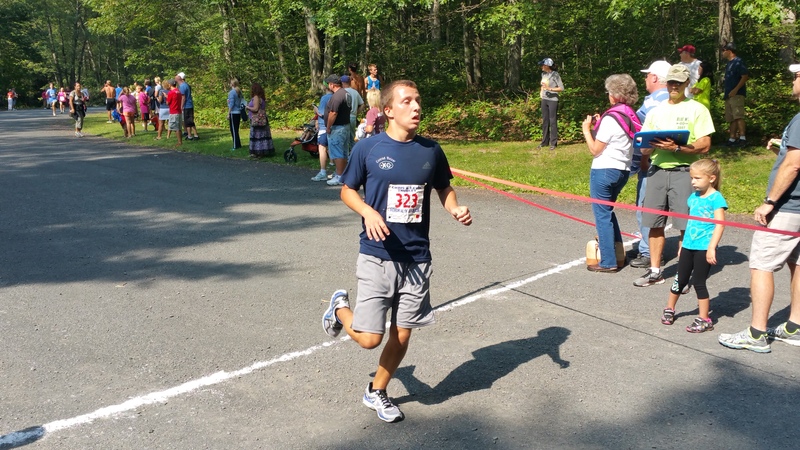 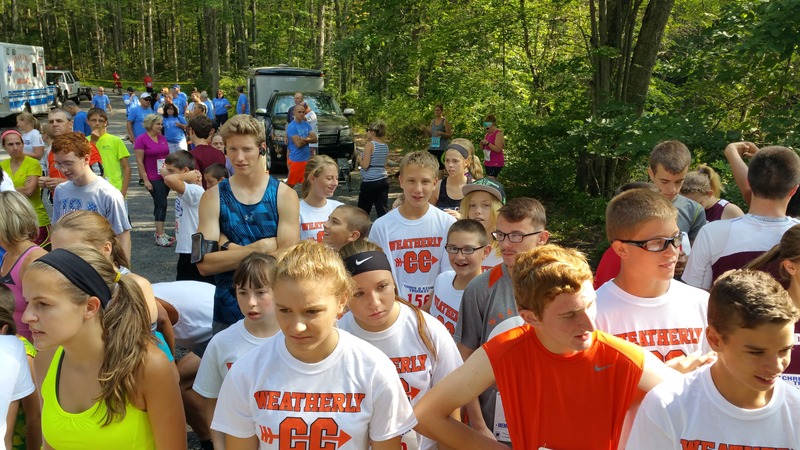 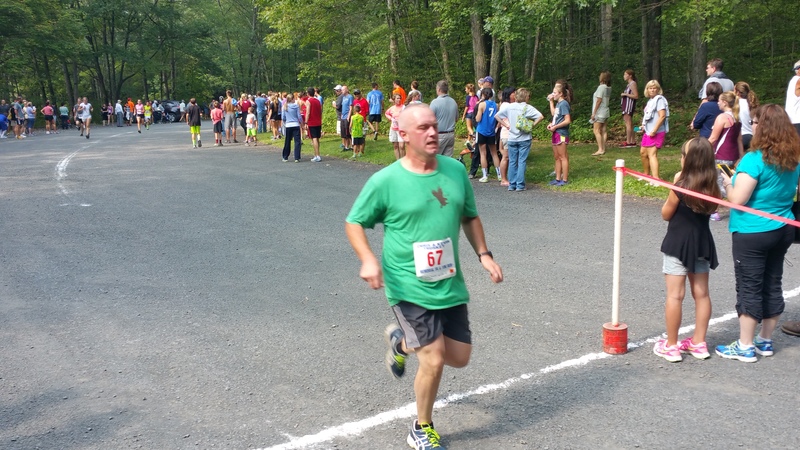 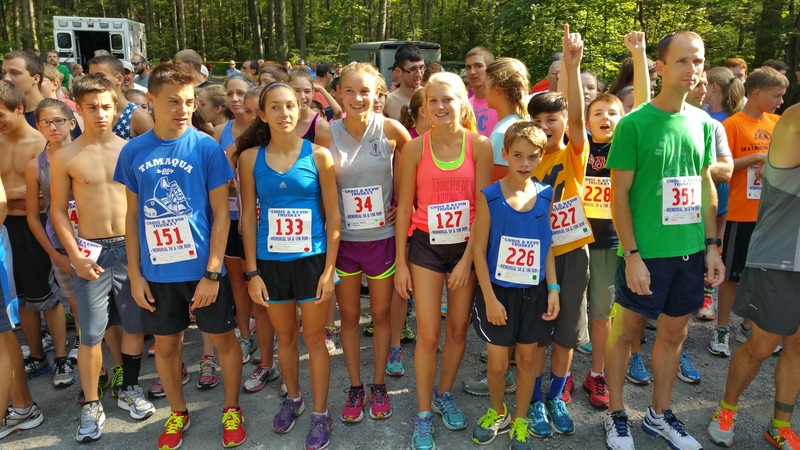 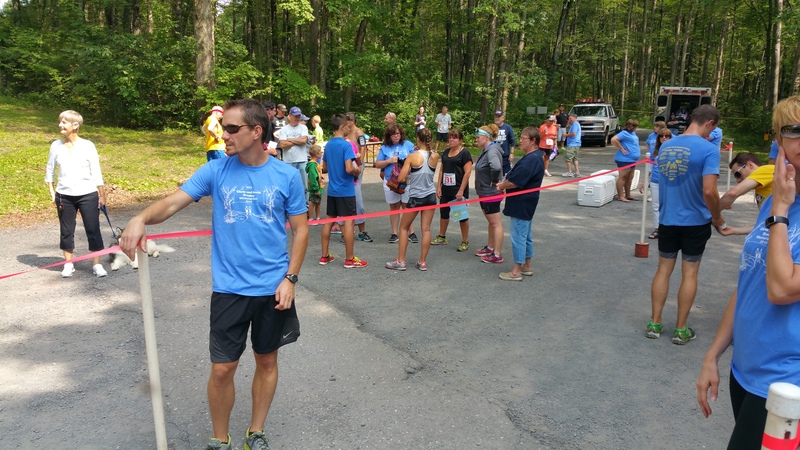 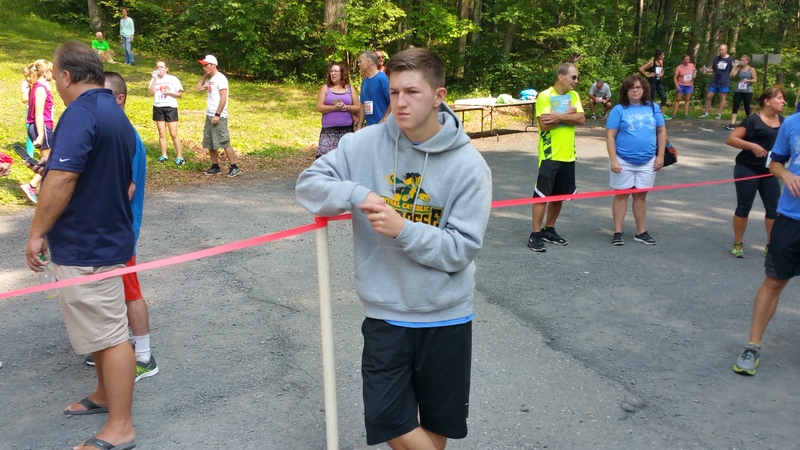 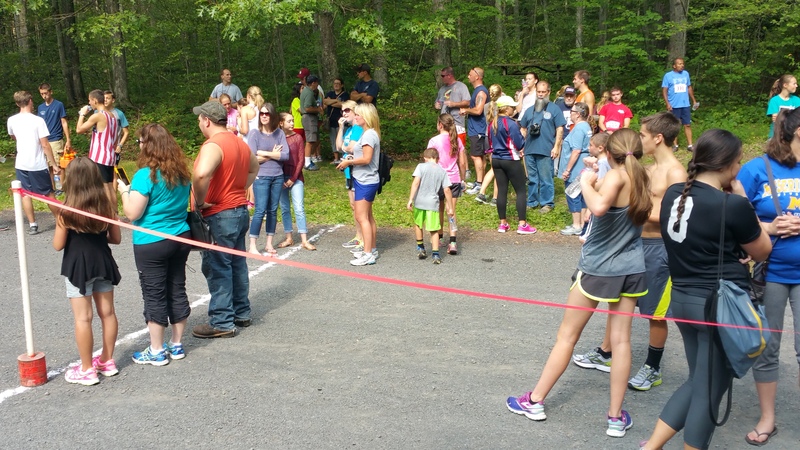 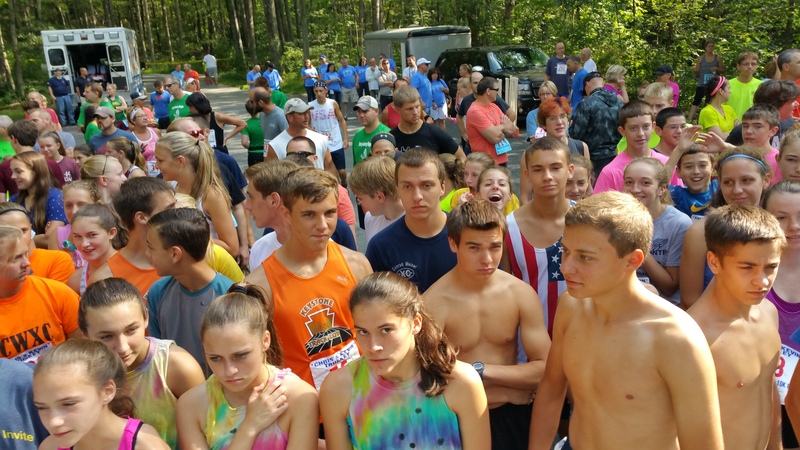 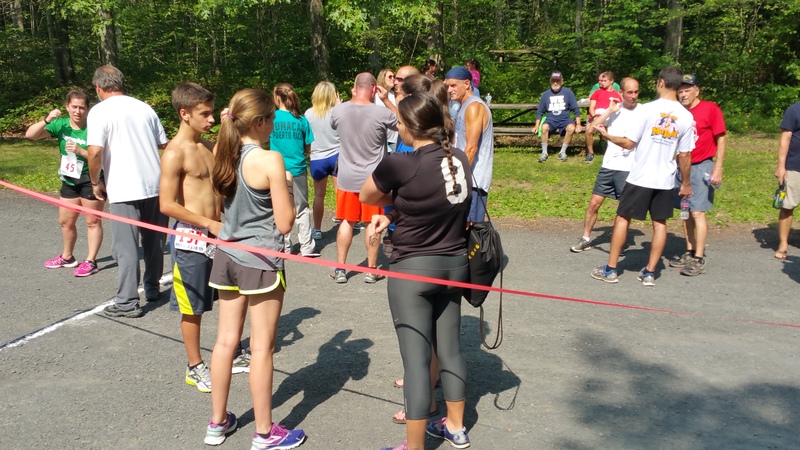 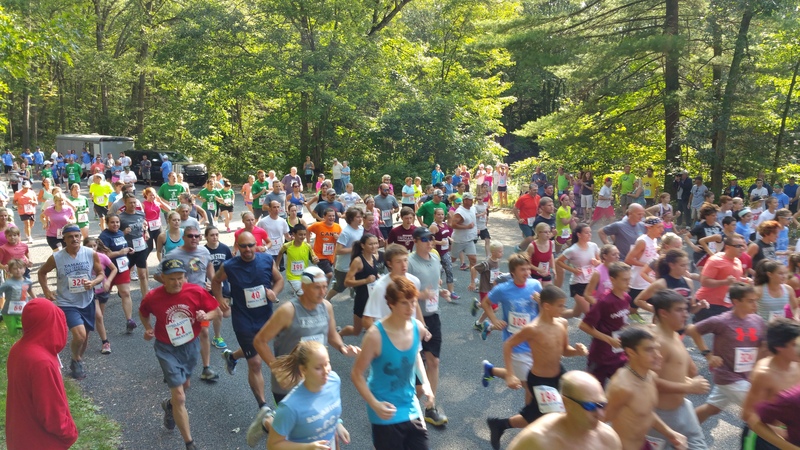 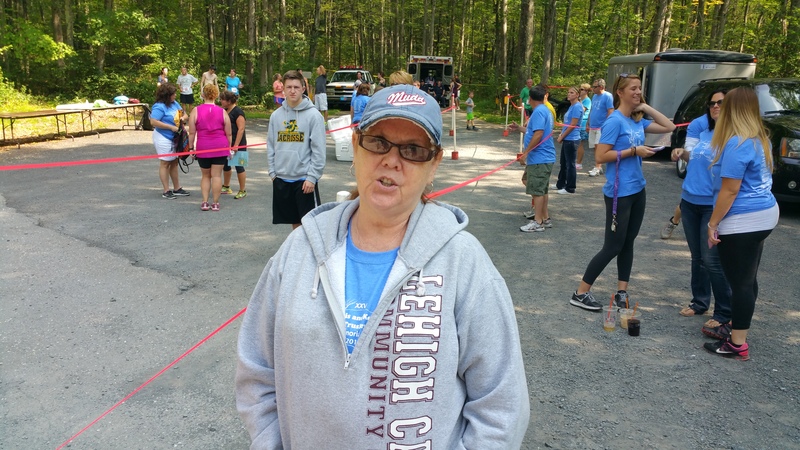 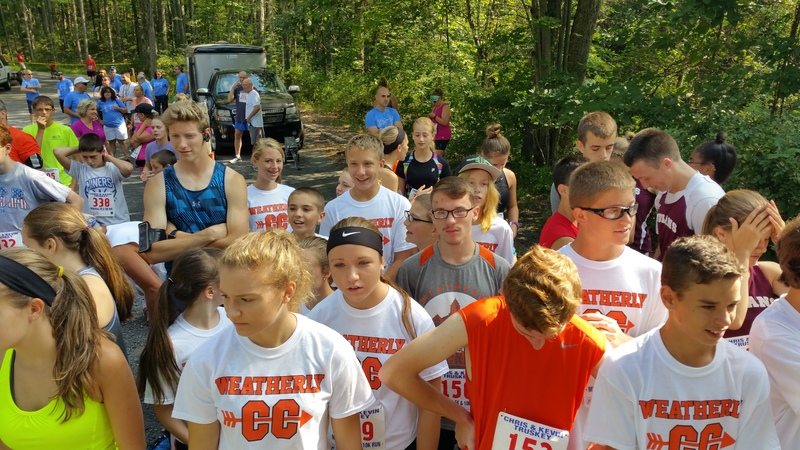 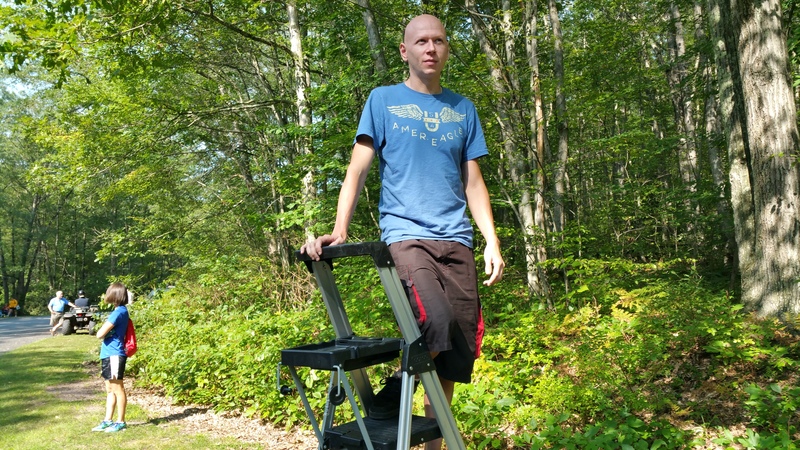 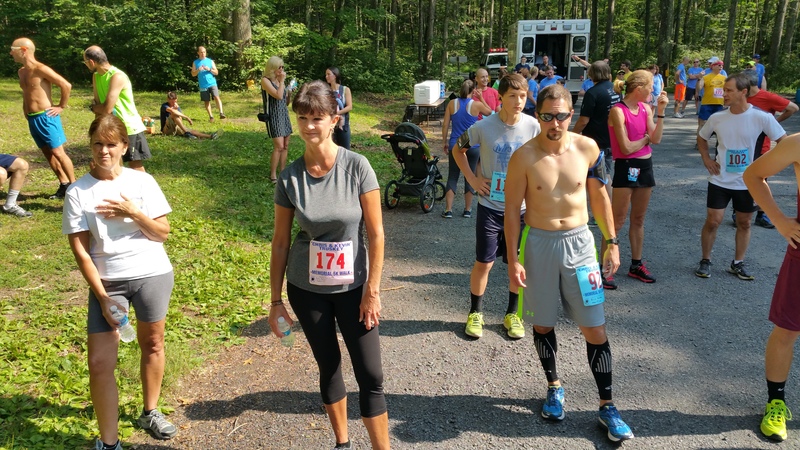 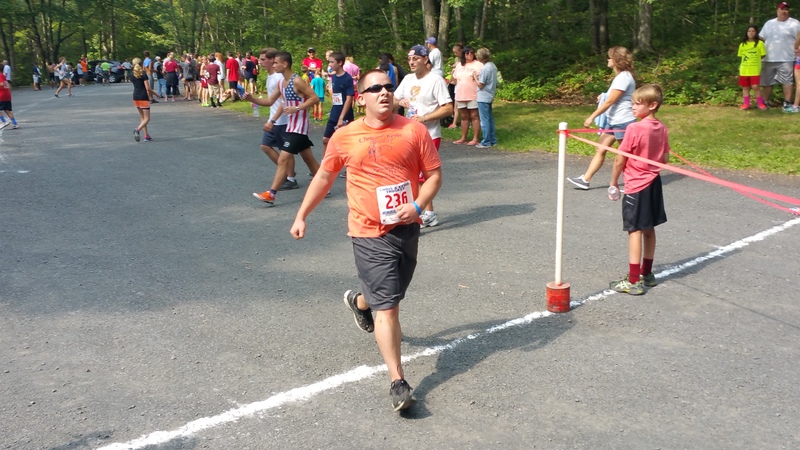 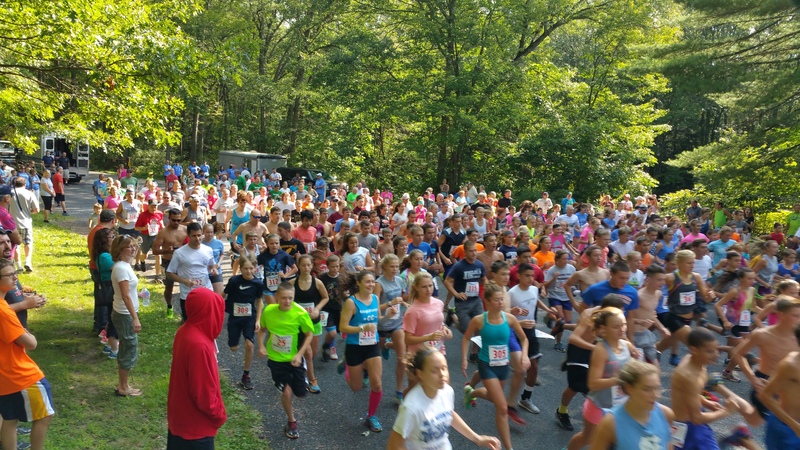 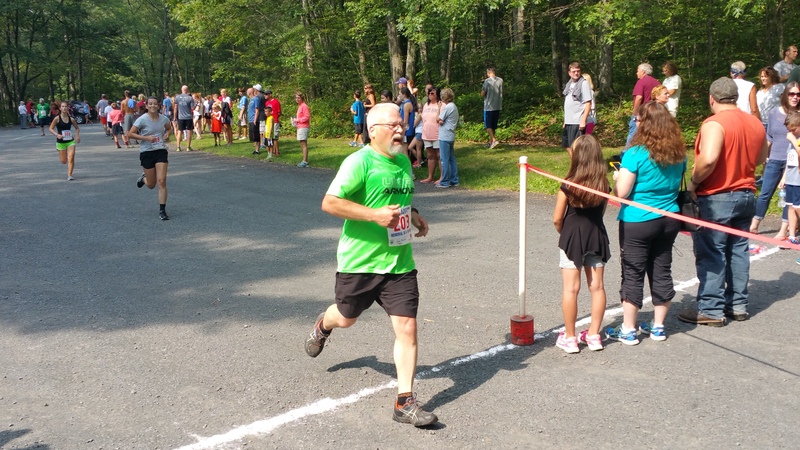 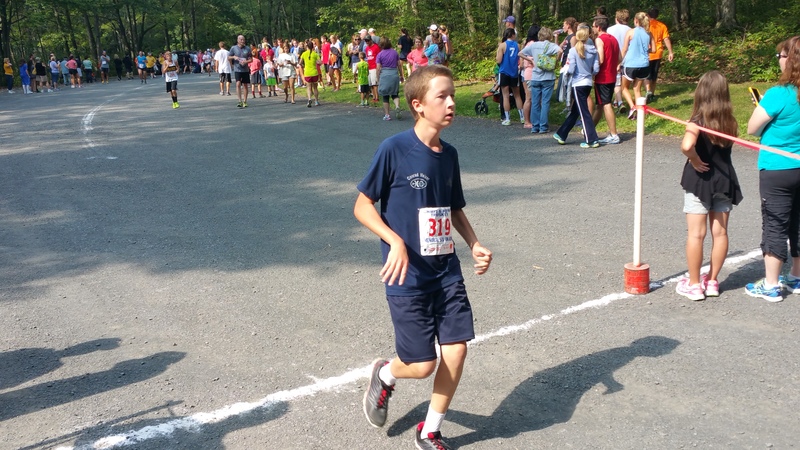 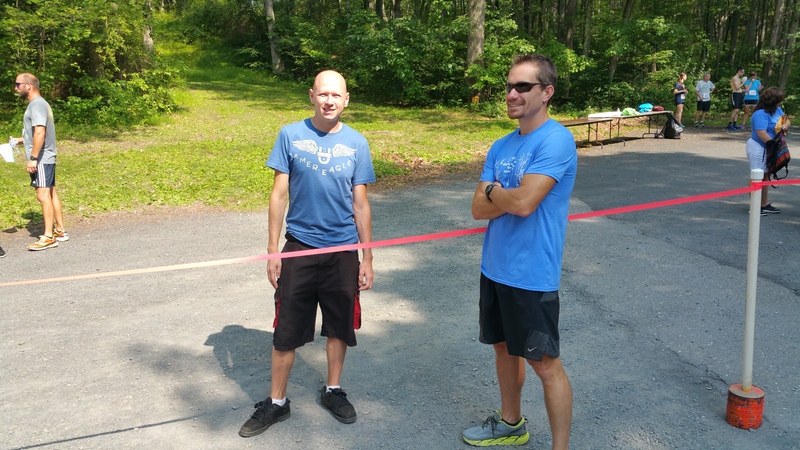 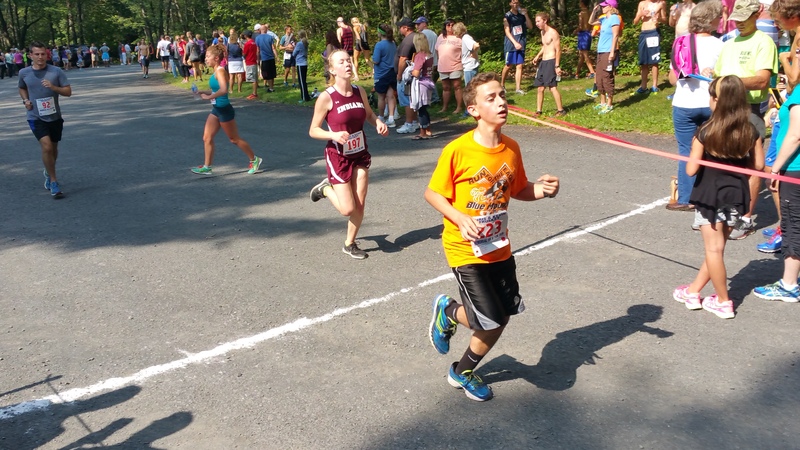 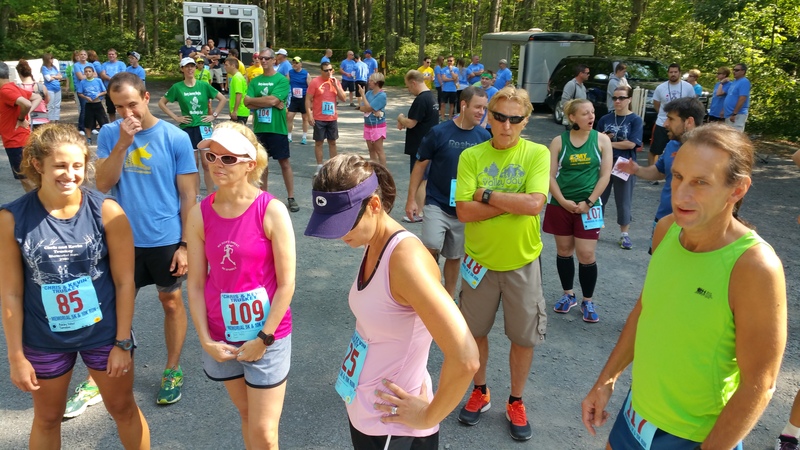 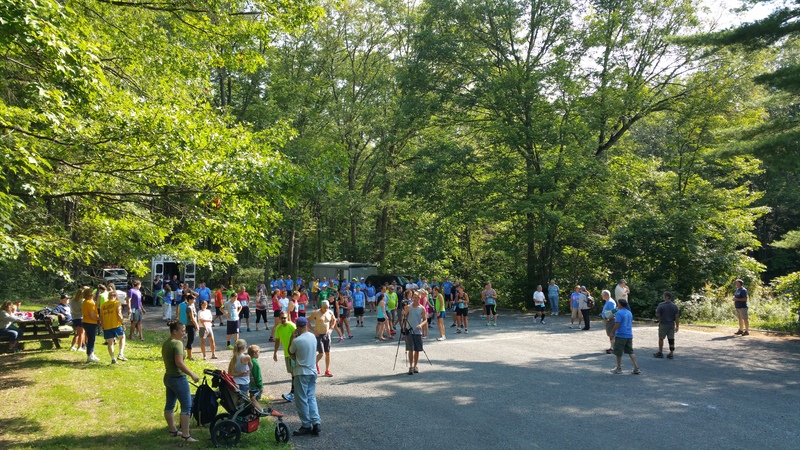 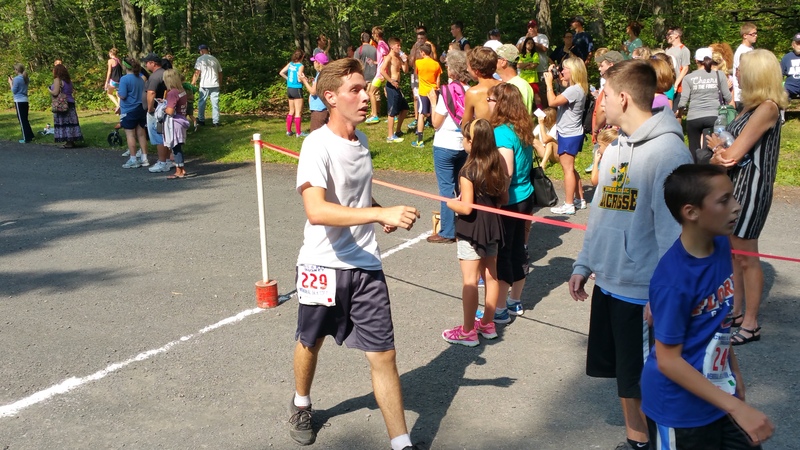 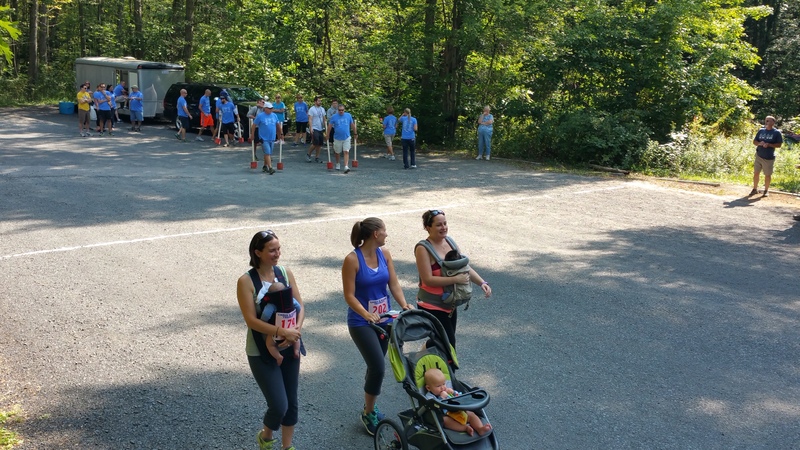 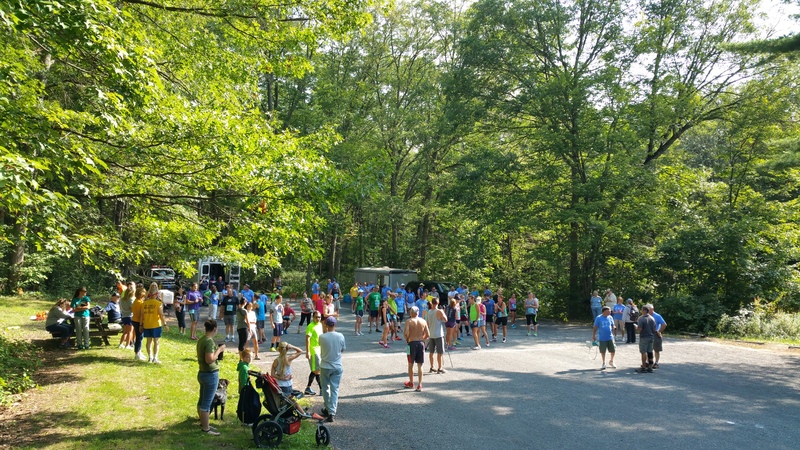 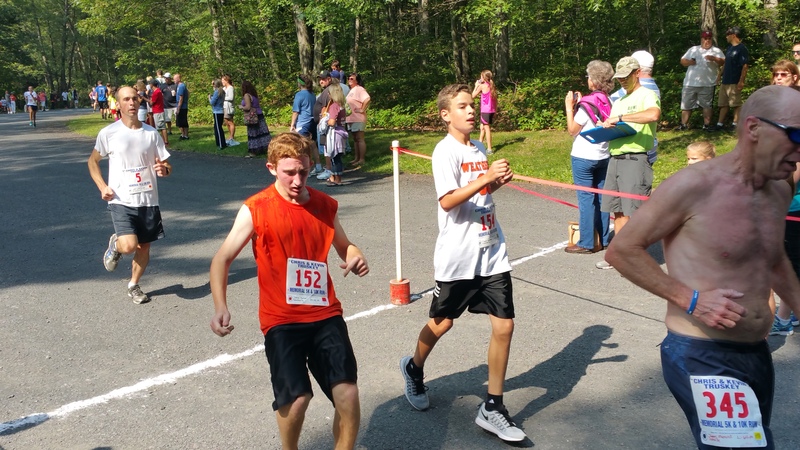 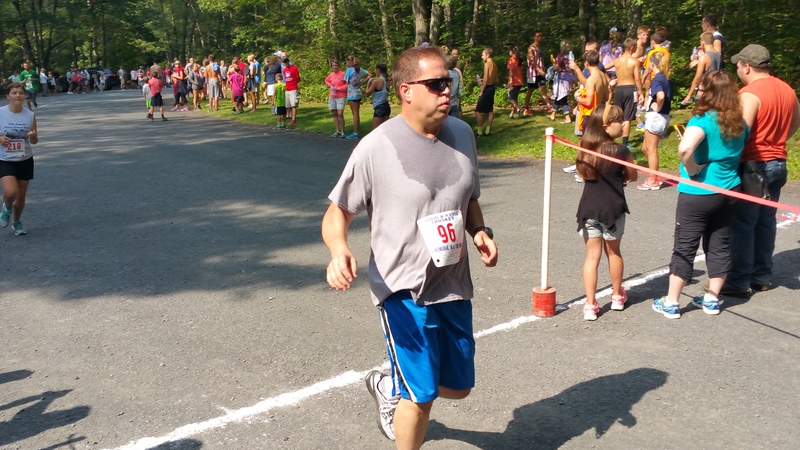 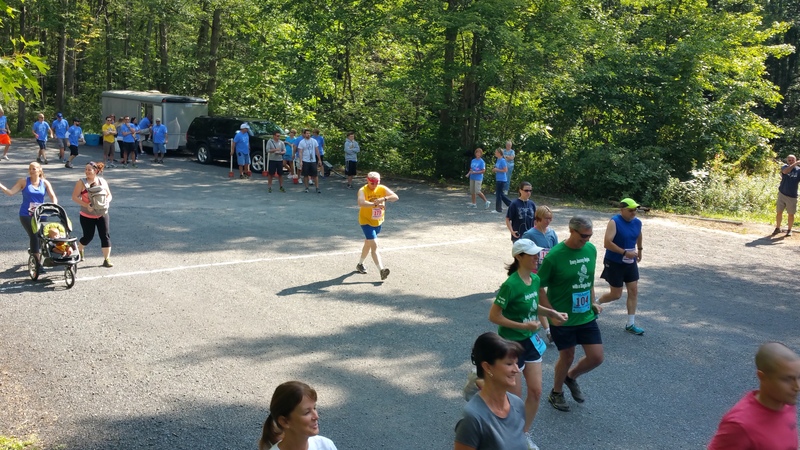 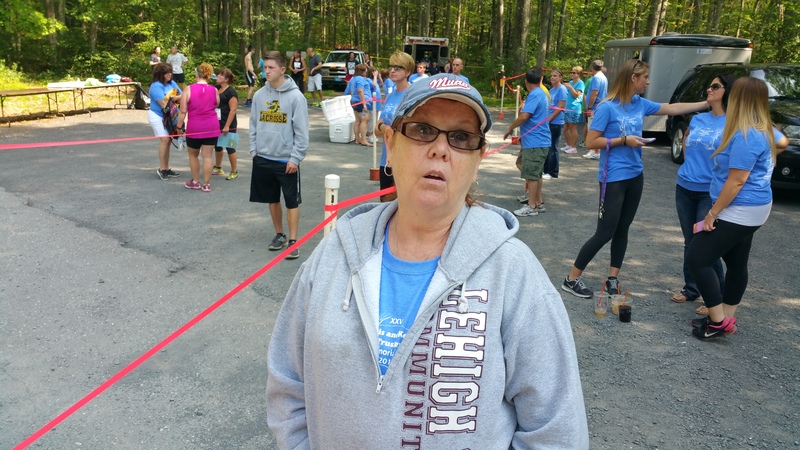 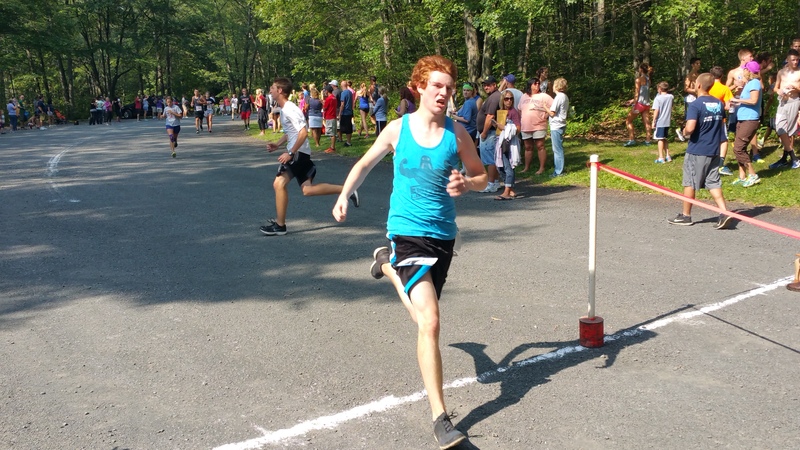 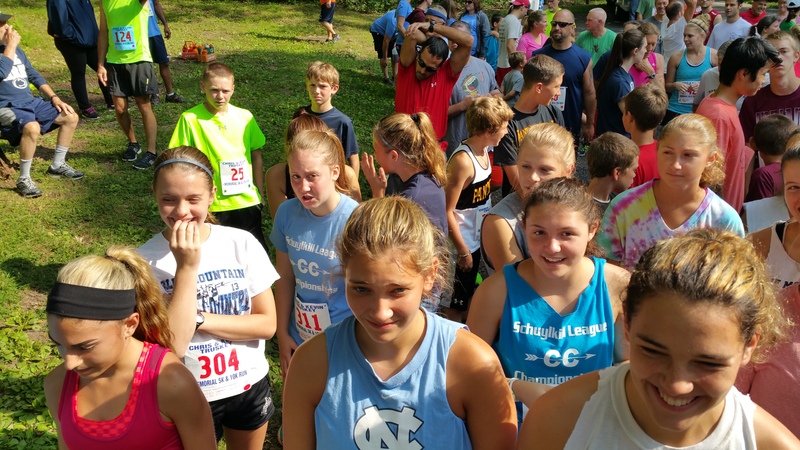 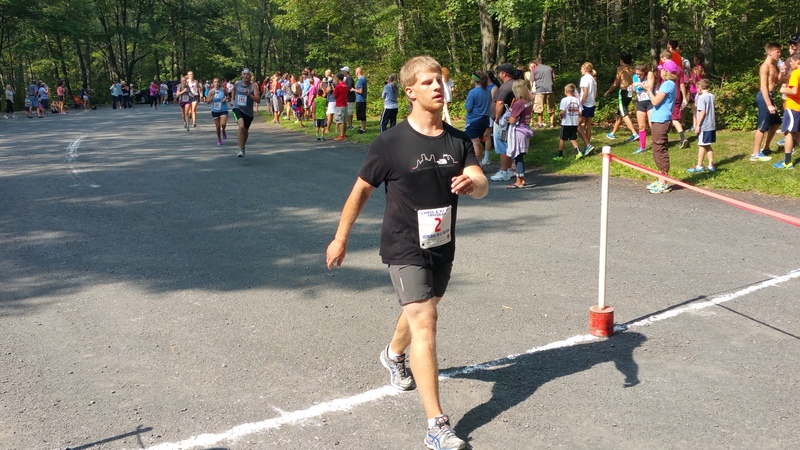 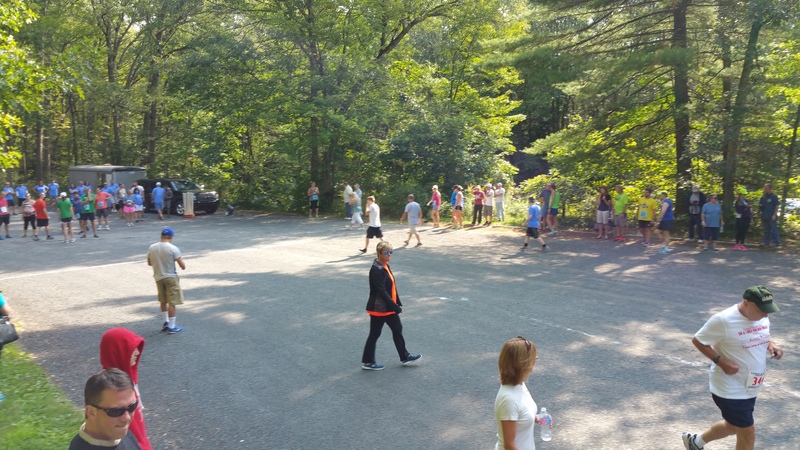 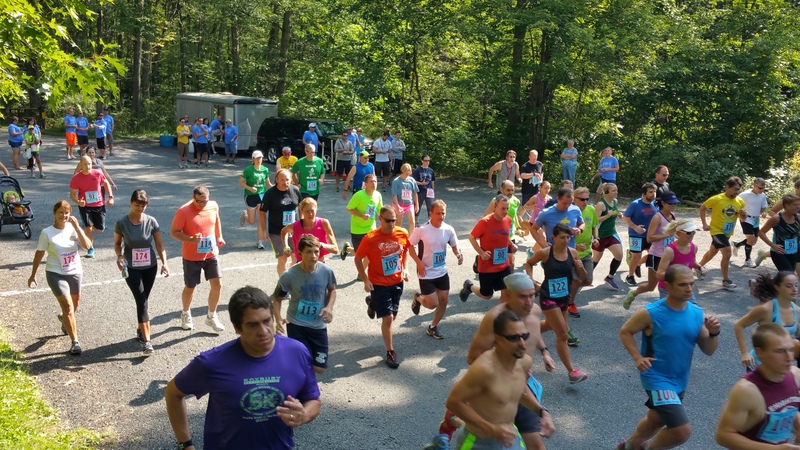 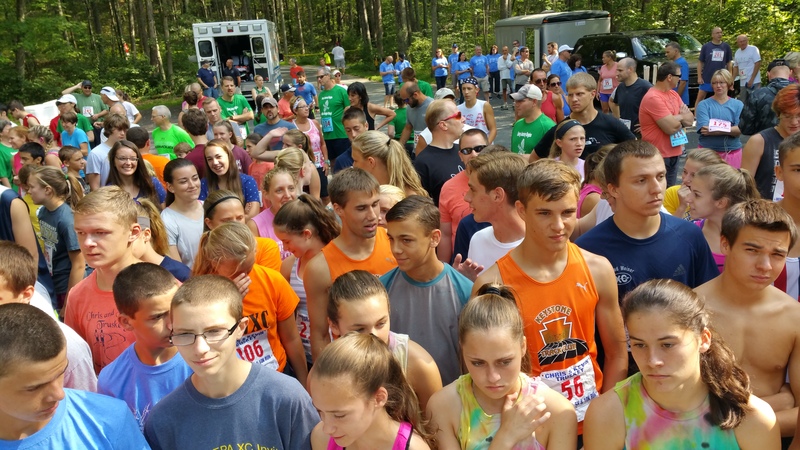 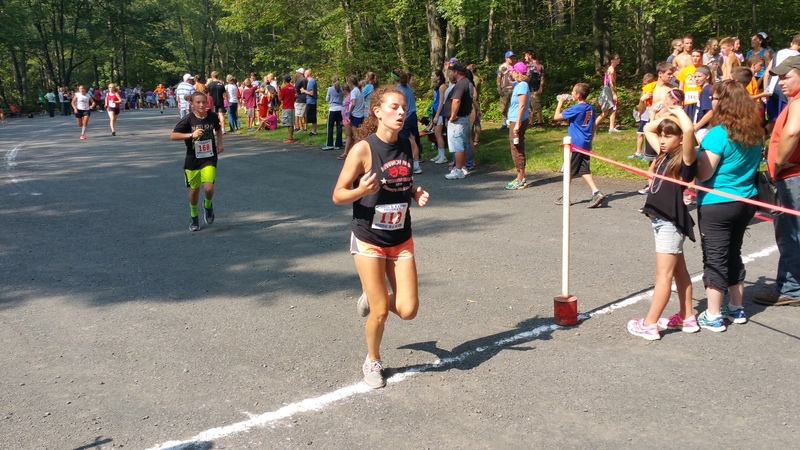 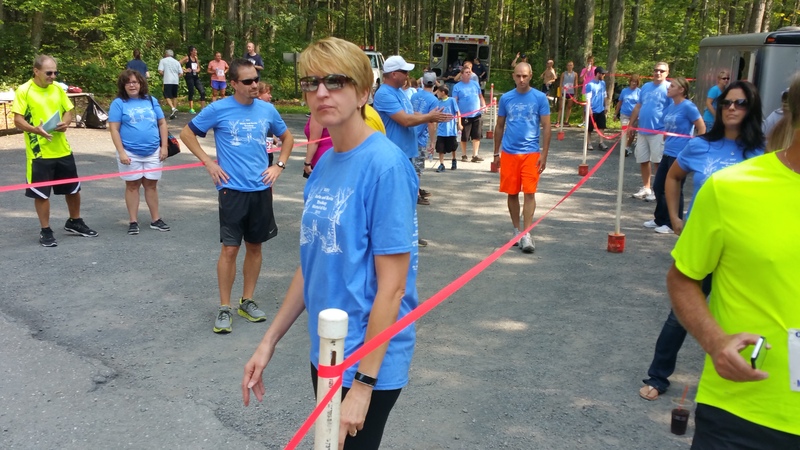 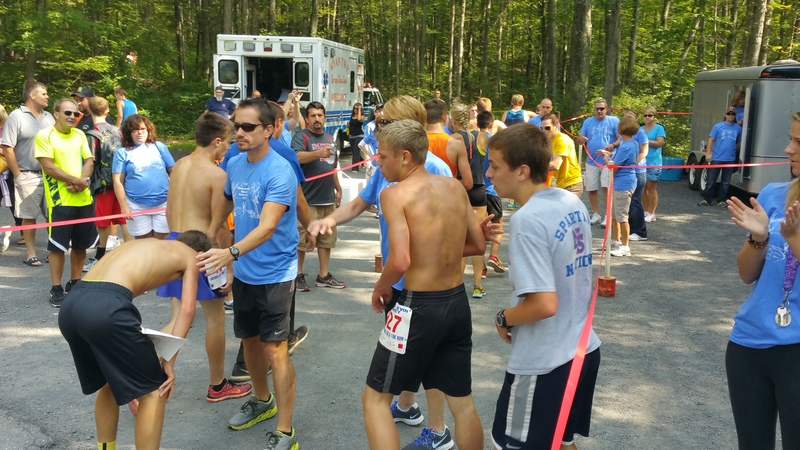 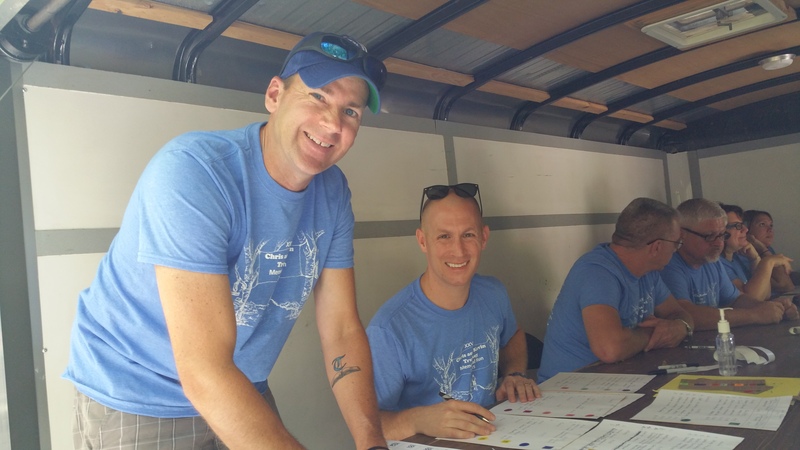 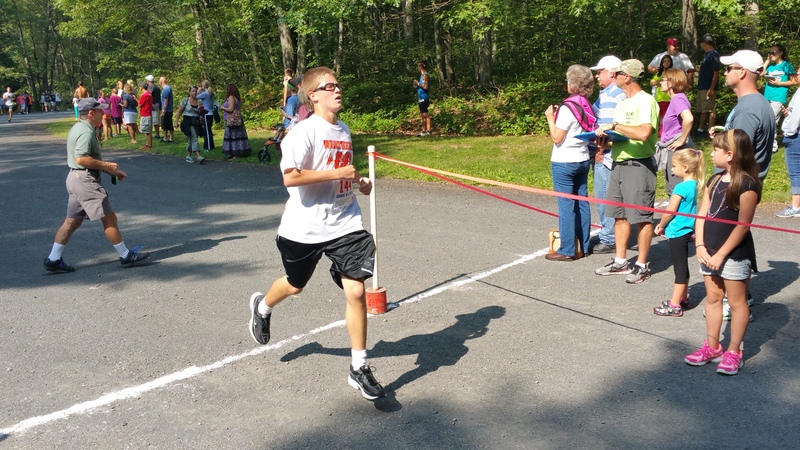 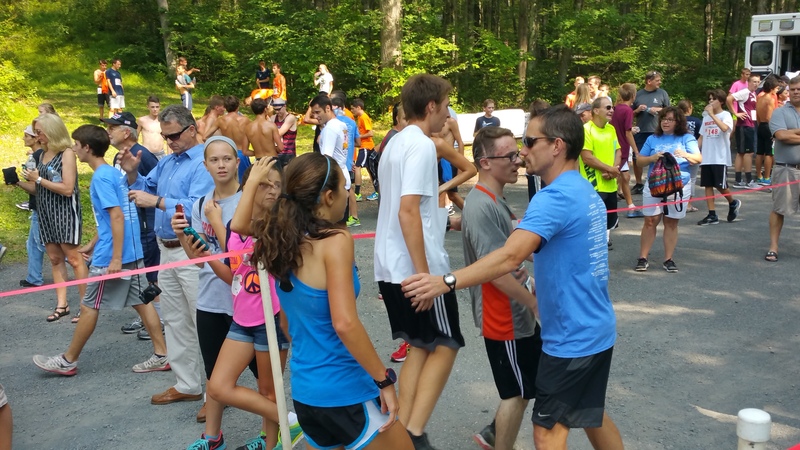 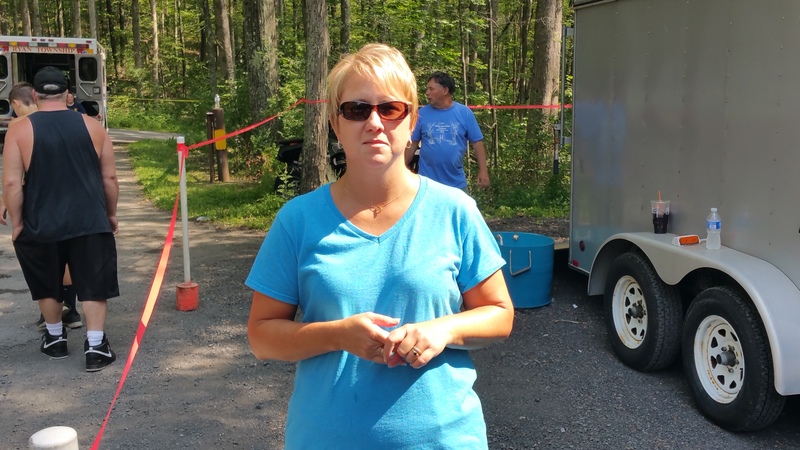 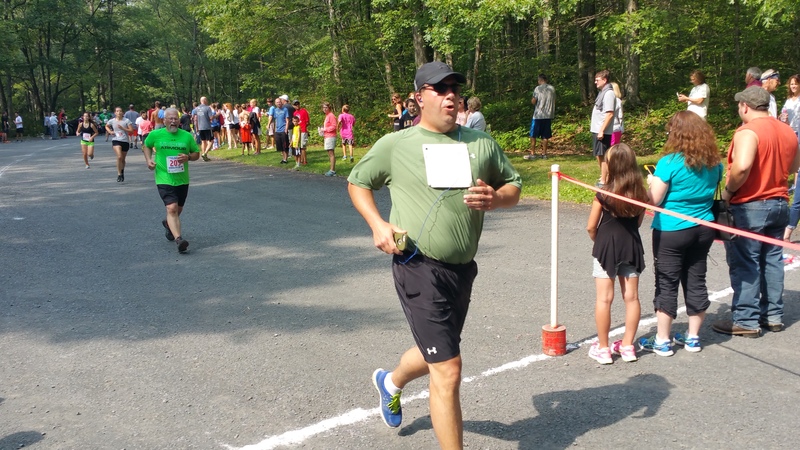 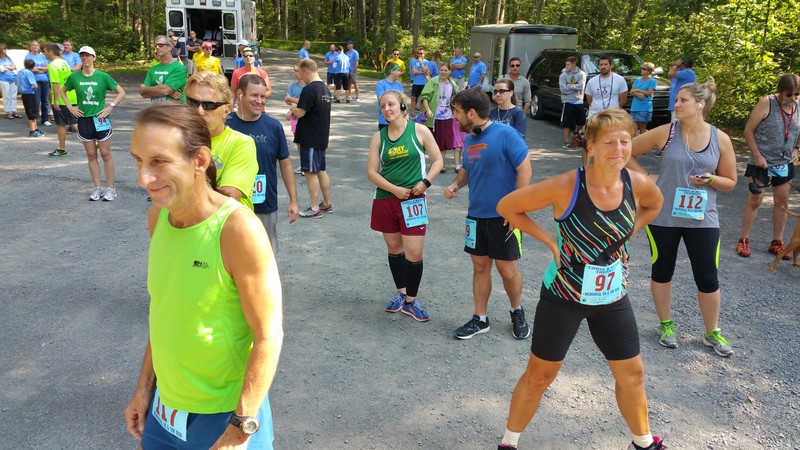 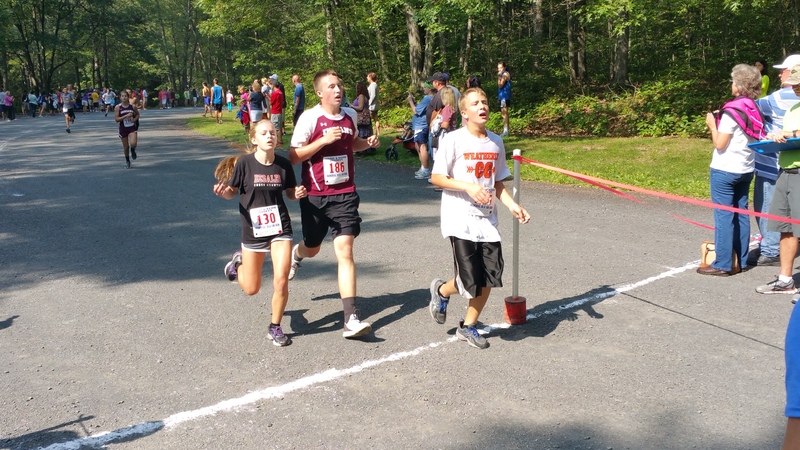 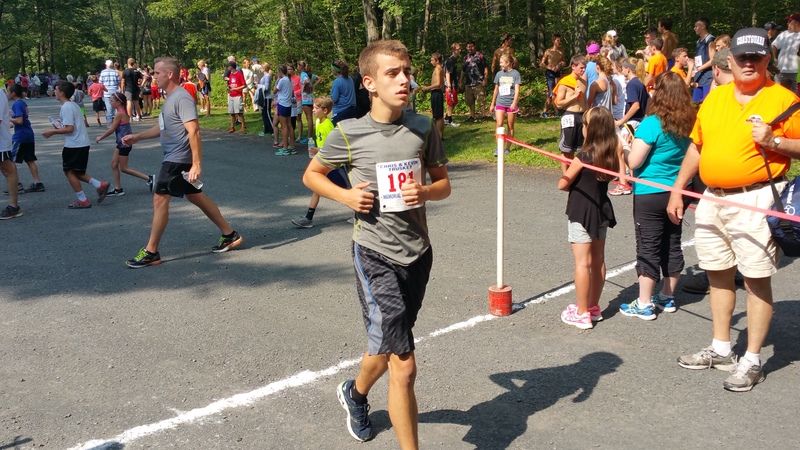 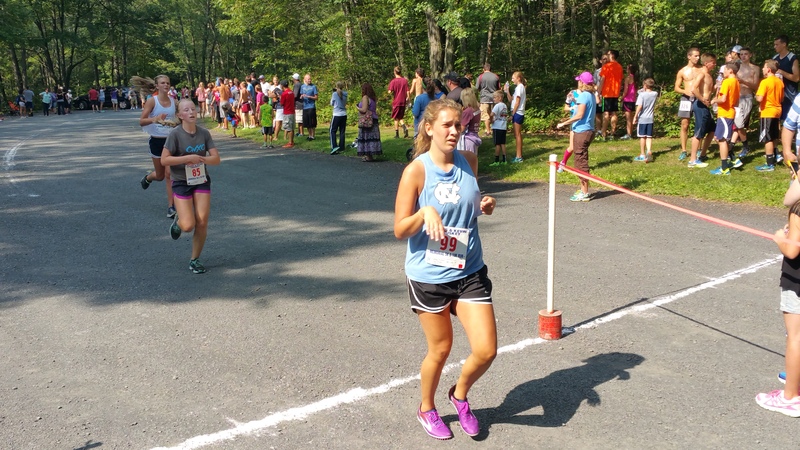 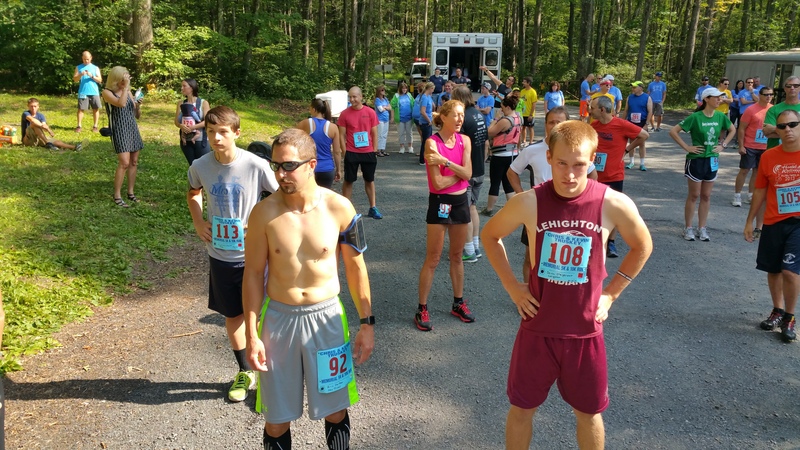 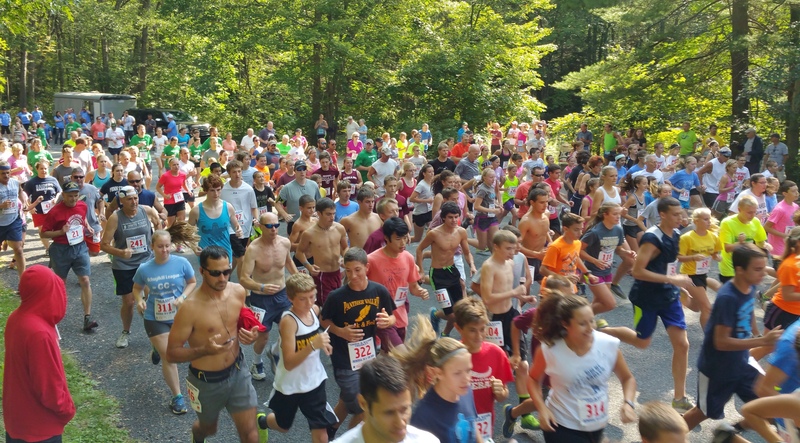 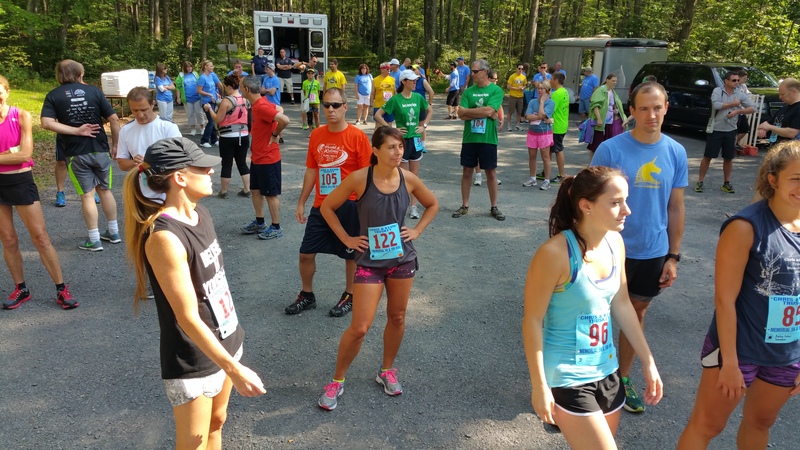 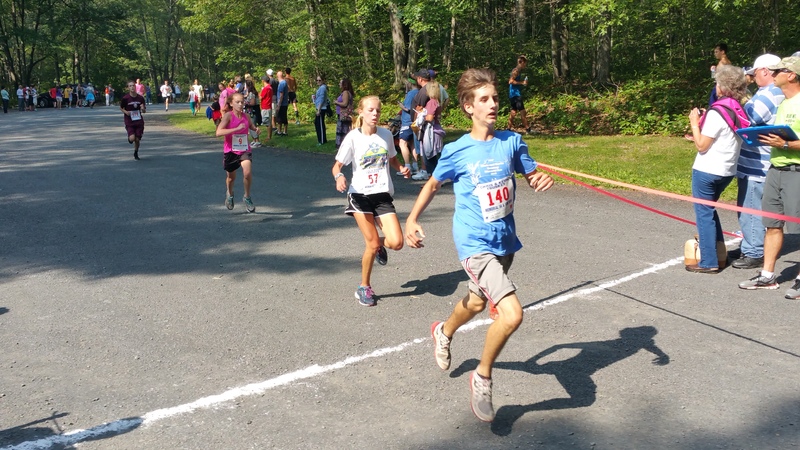 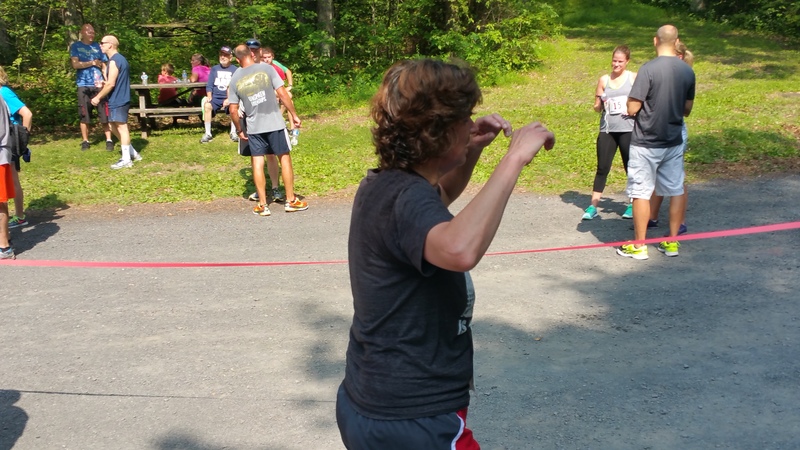 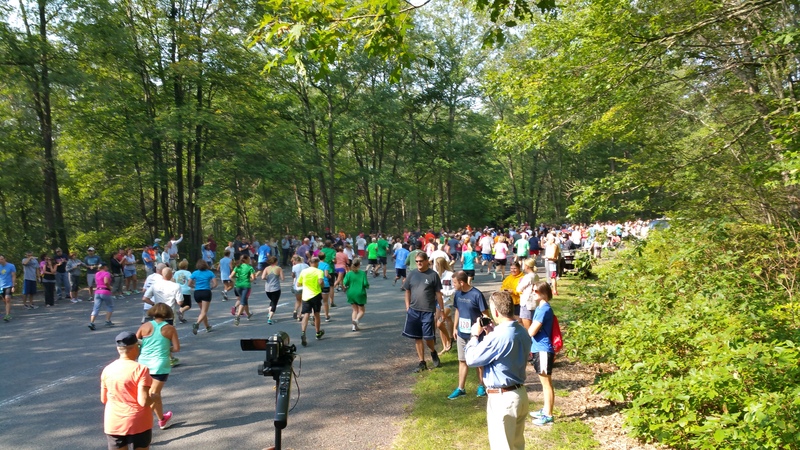 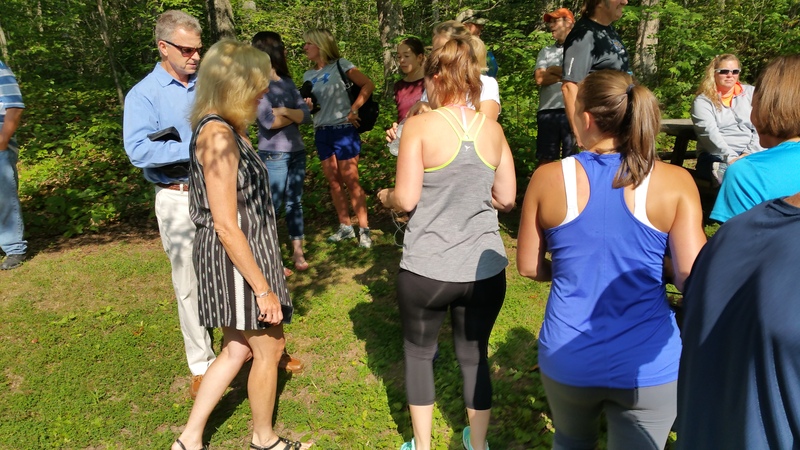 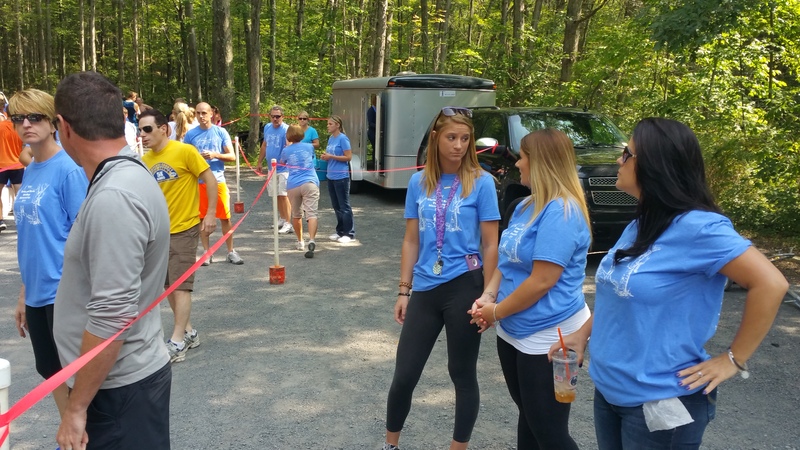 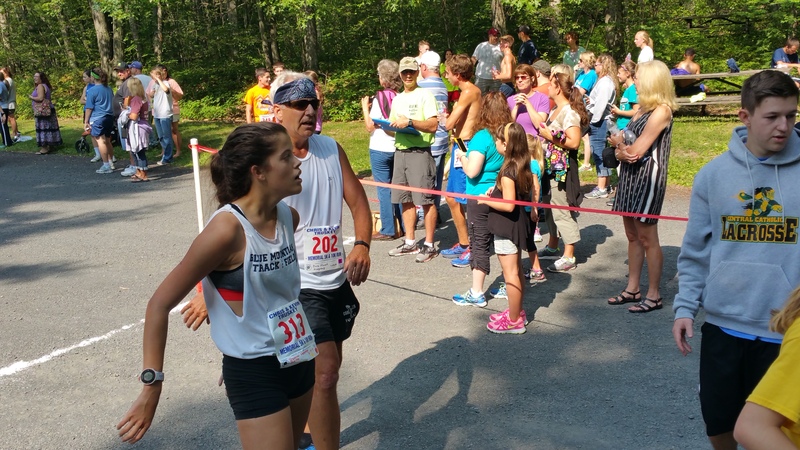 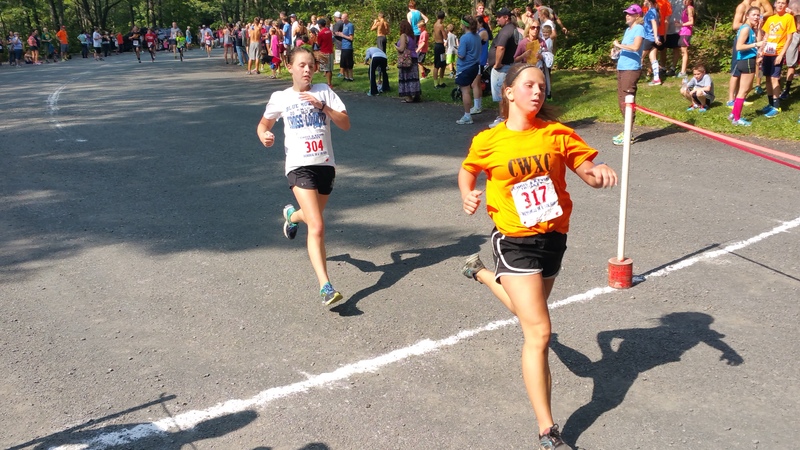 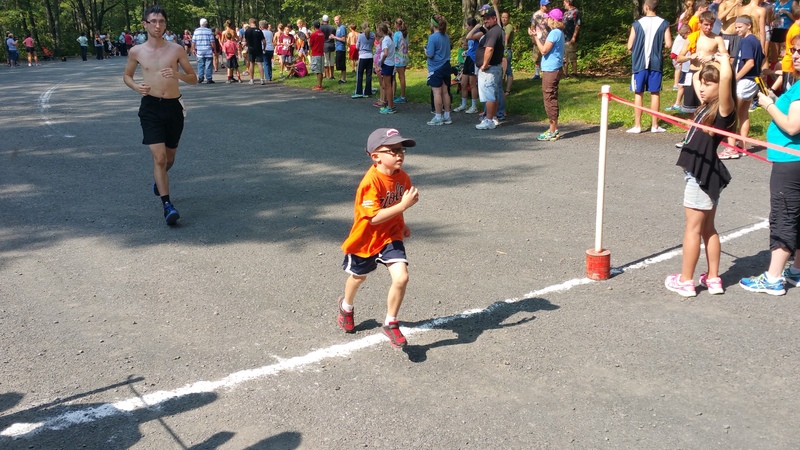 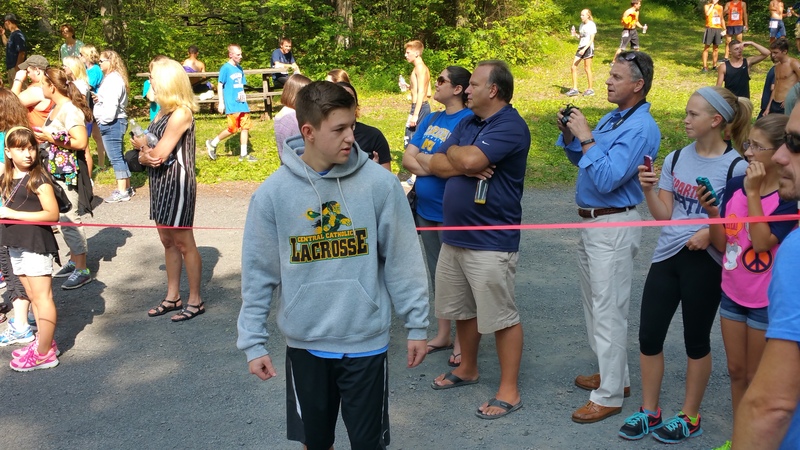 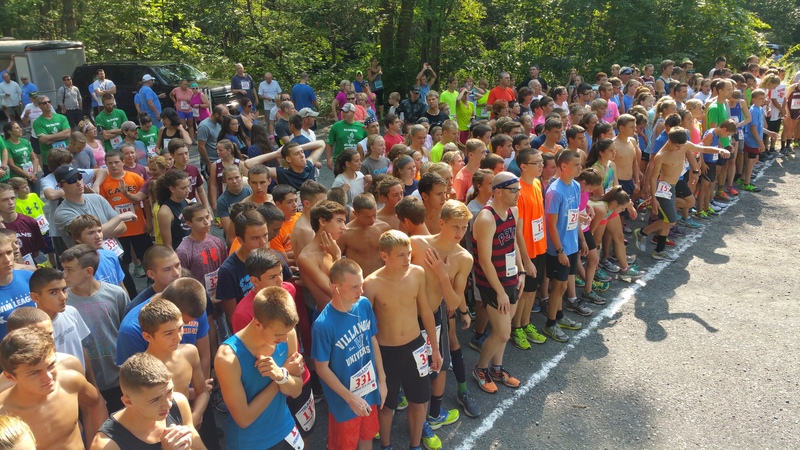 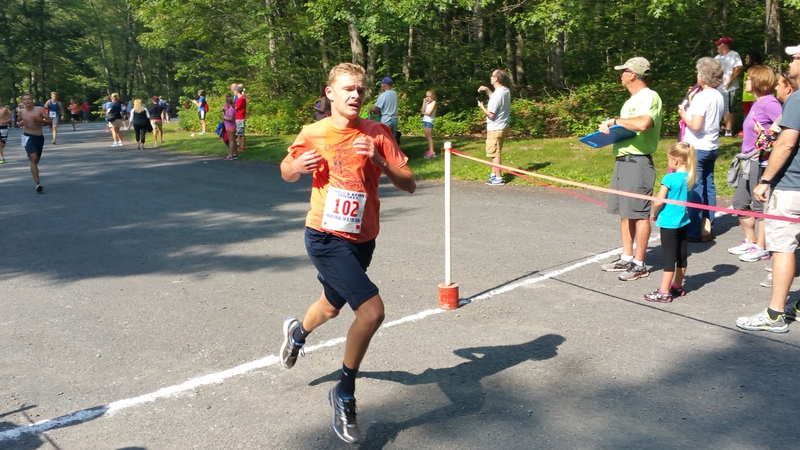 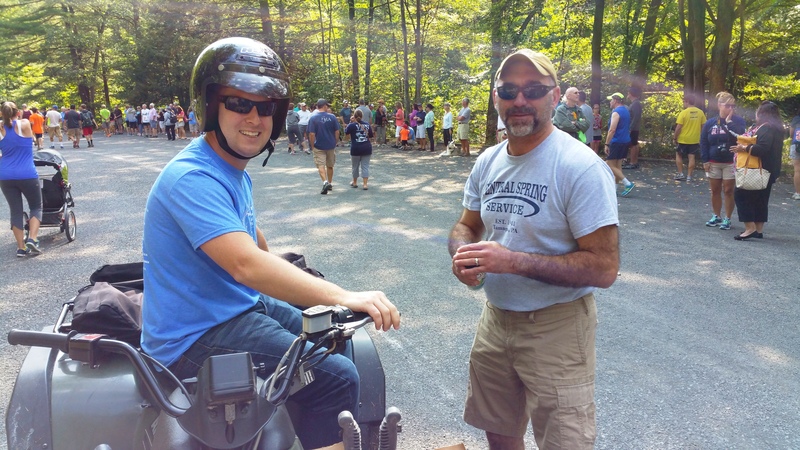 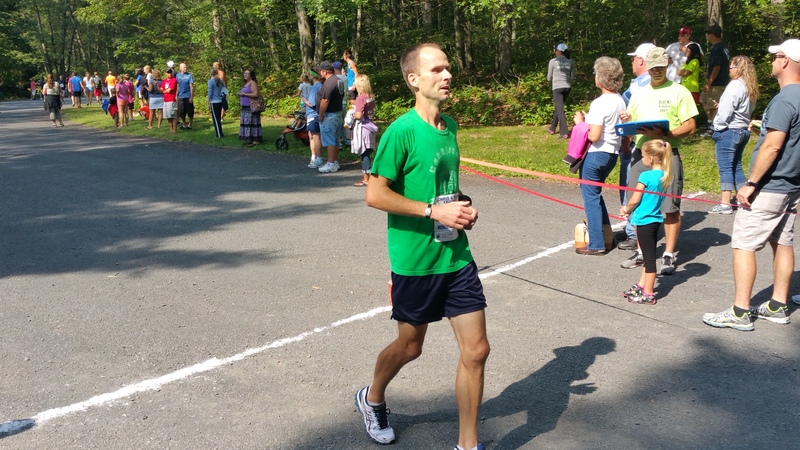 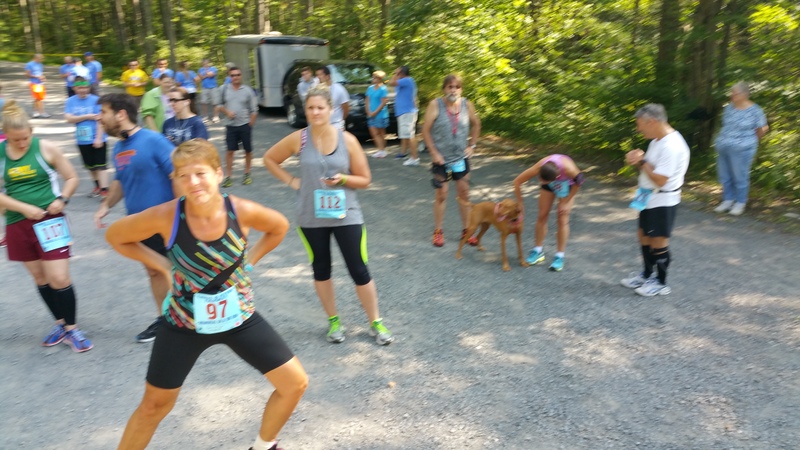 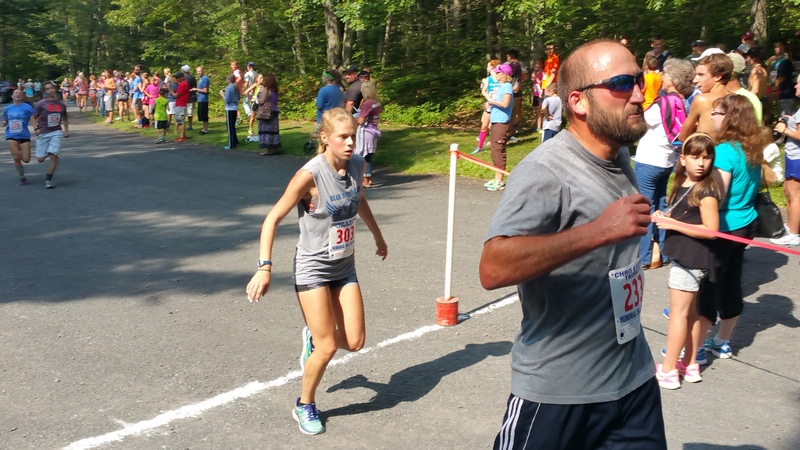 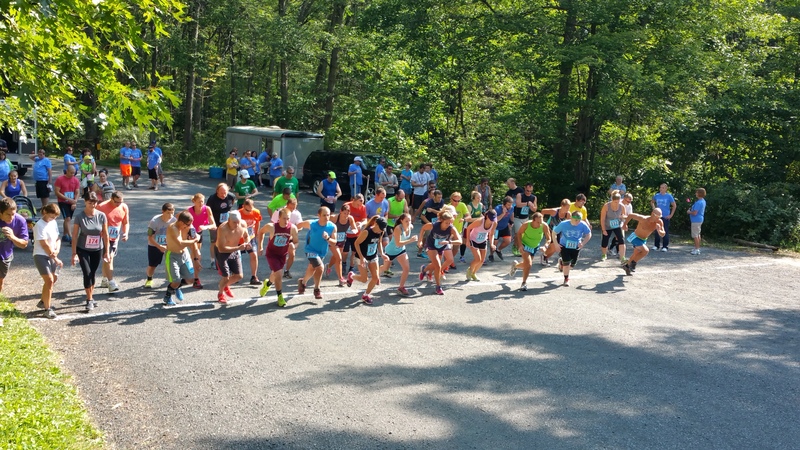 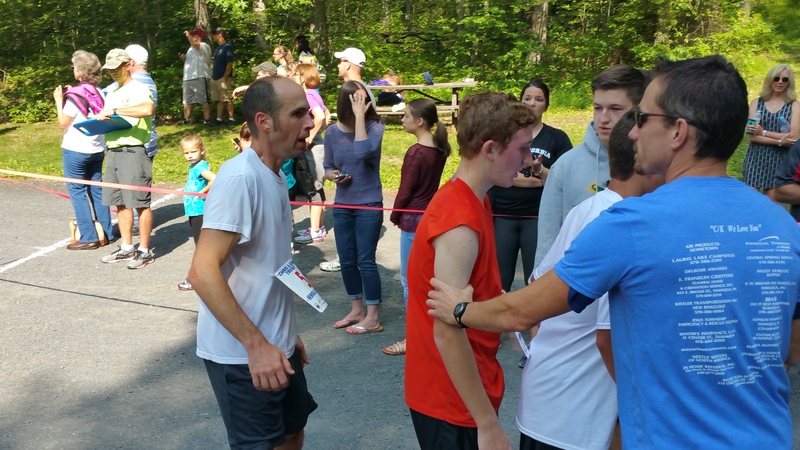 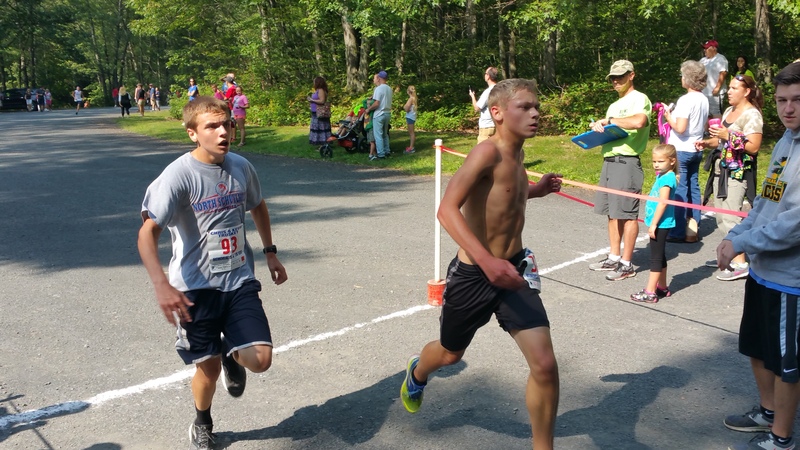 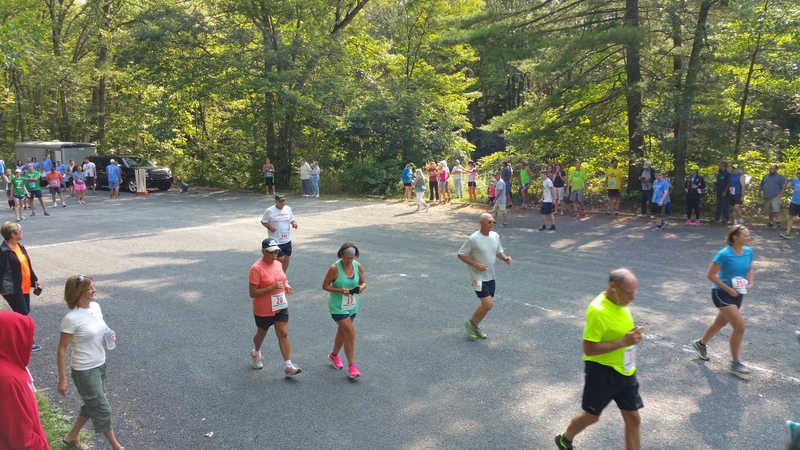 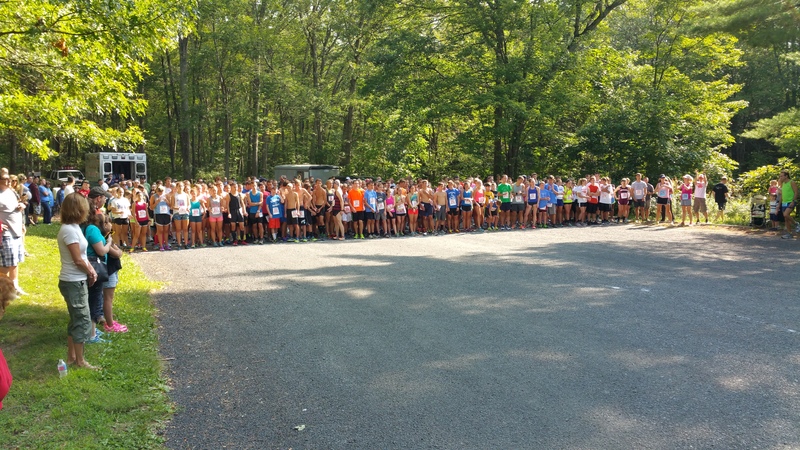 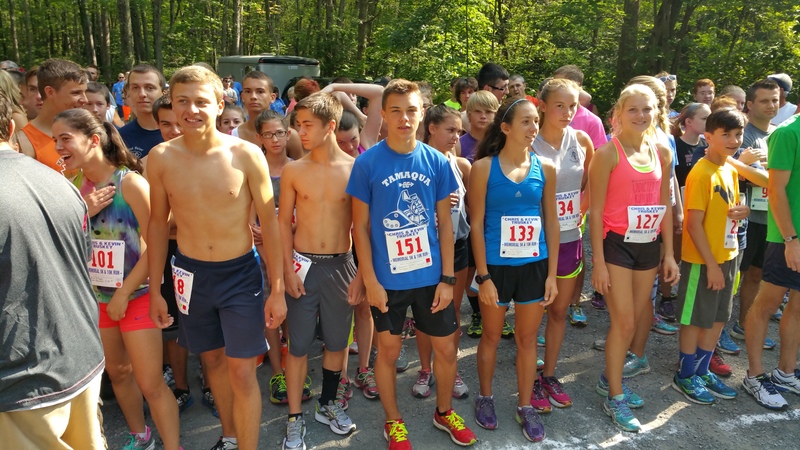 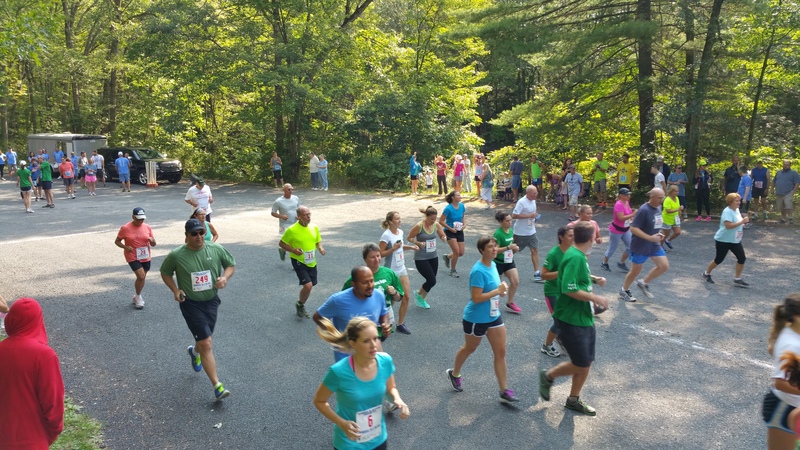 Family, friends and volunteers held their 25th Annual Chris and Kevin Truskey Memorial 5K & 10K Run/Walk today (Saturday, August 29, 2015) at the Tuscarora State Park in Barnesville. 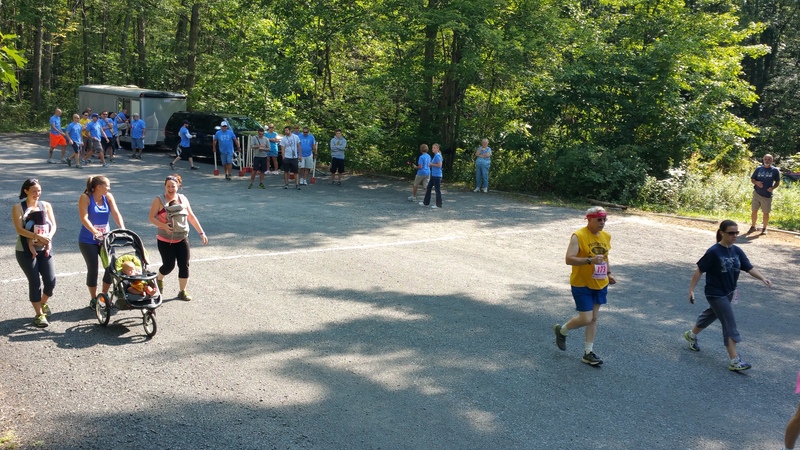 Following the race, participants and volunteers were treated to free food (barbecue, hot dogs, bean soup, fruit, desserts) and beverages. 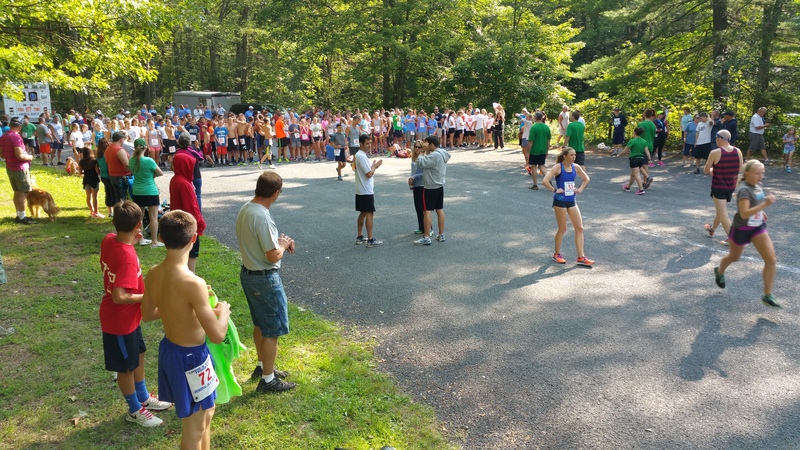 Plaques and medals were awarded to overall 5-K & 10-K winners, medals to other age categories. 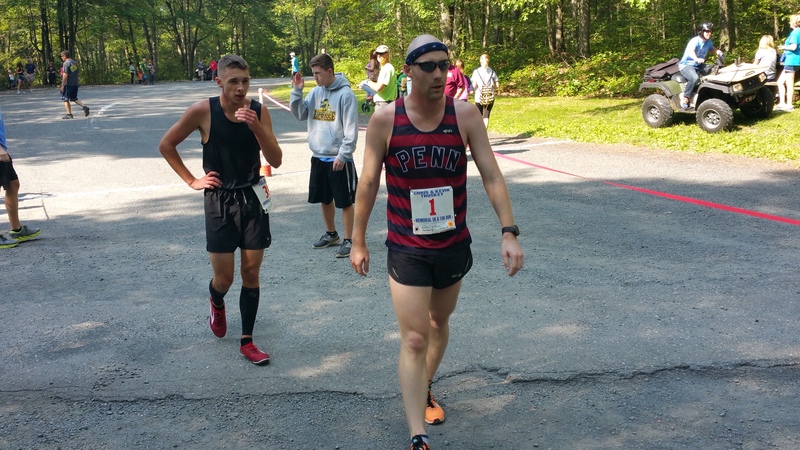 – OVERALL MALE: Justin O’Brien, 26, of Hamburg PA. (16:29). 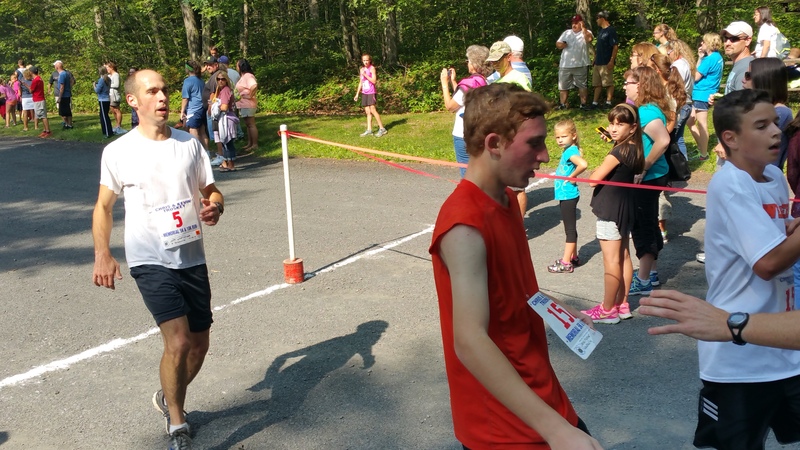 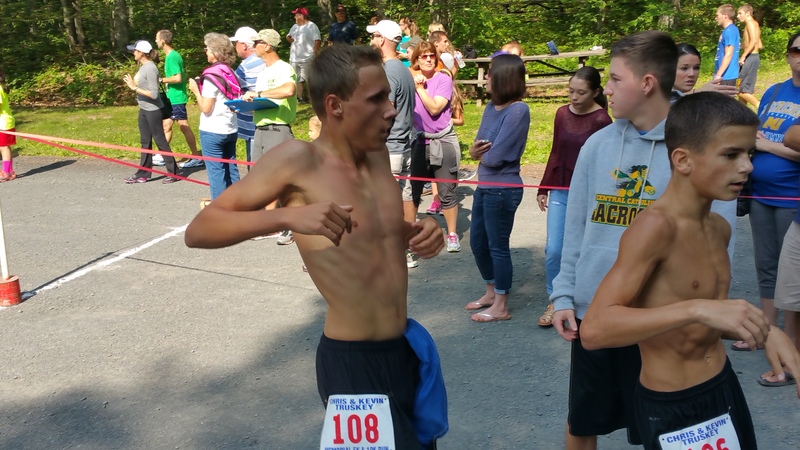 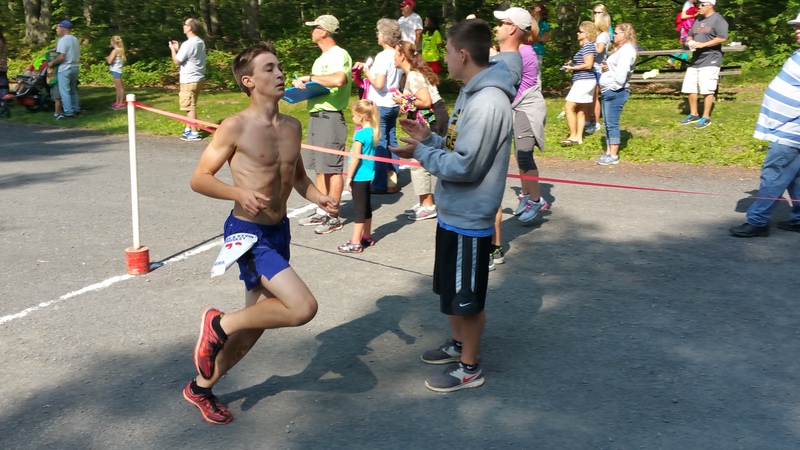 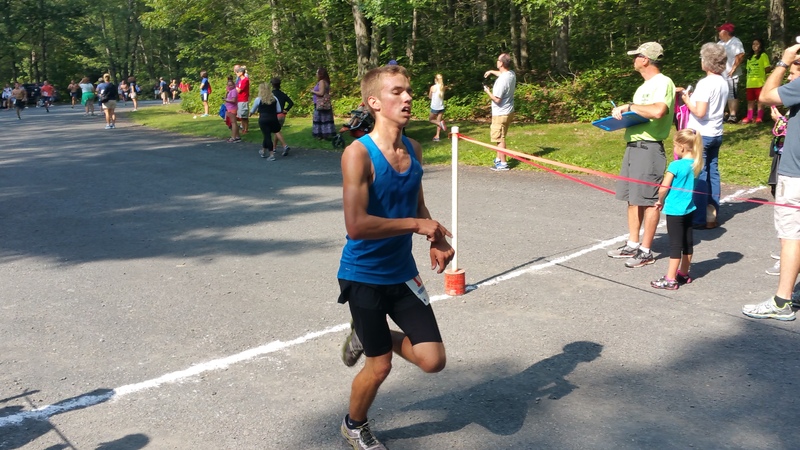 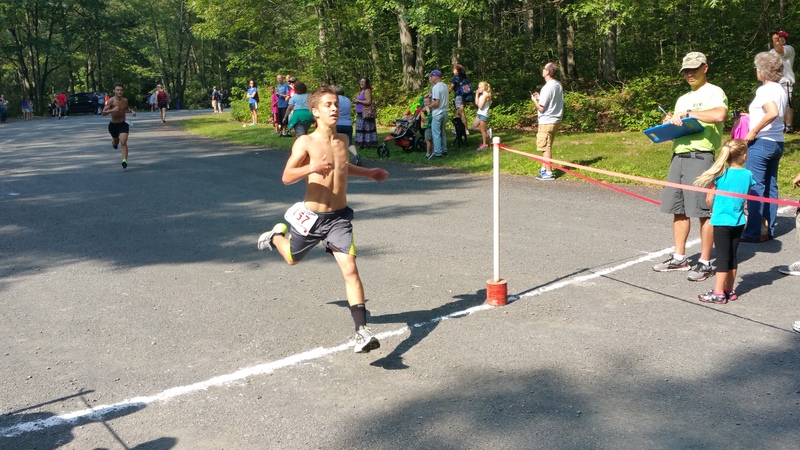 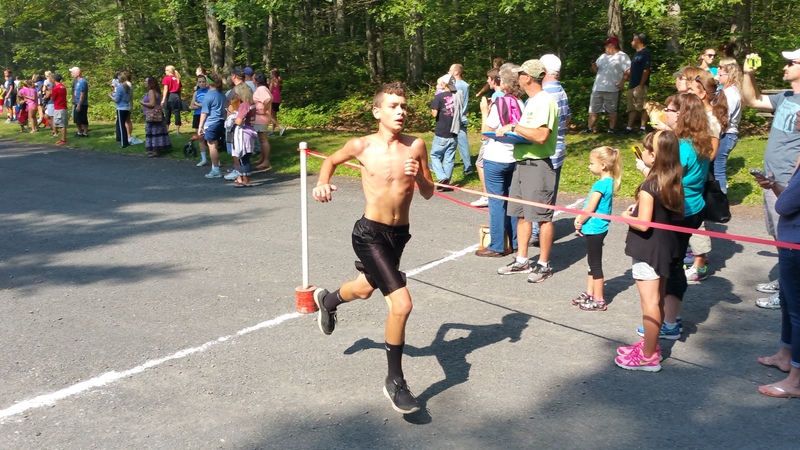 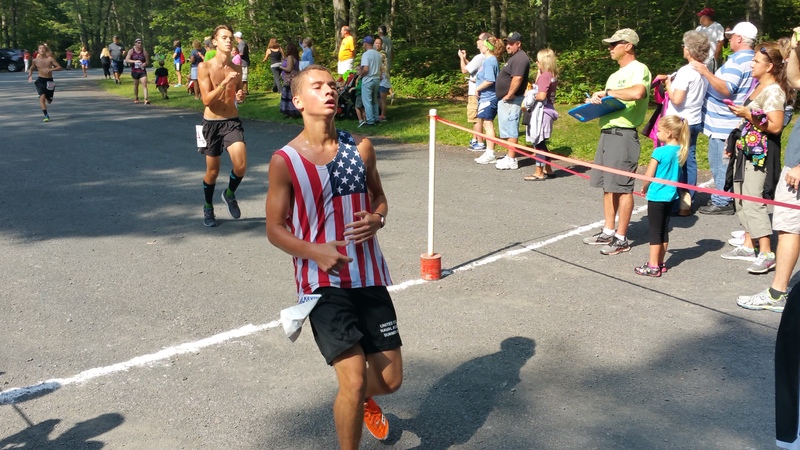 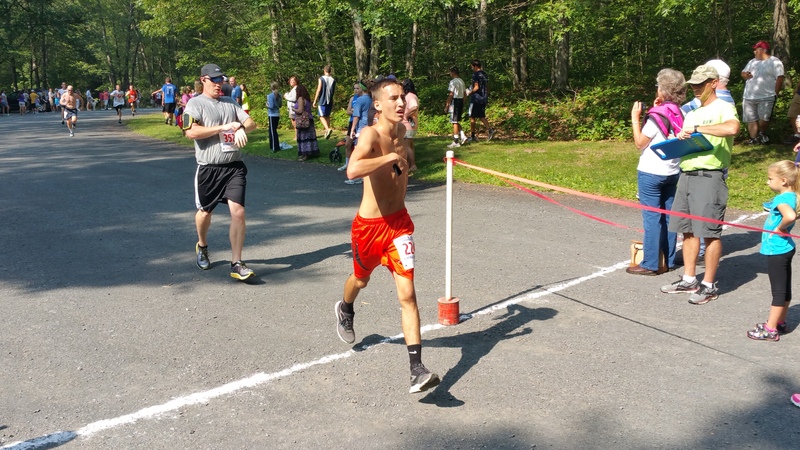 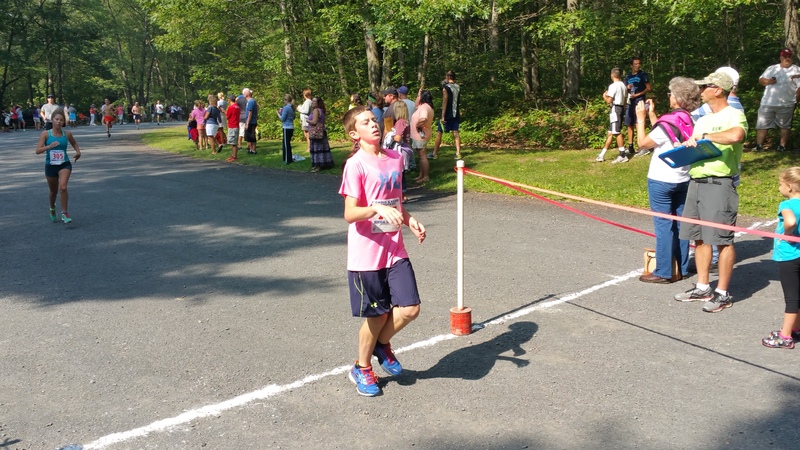 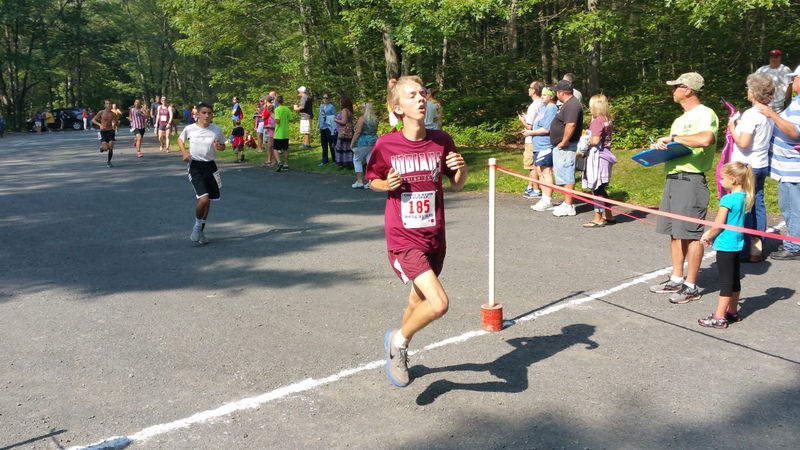 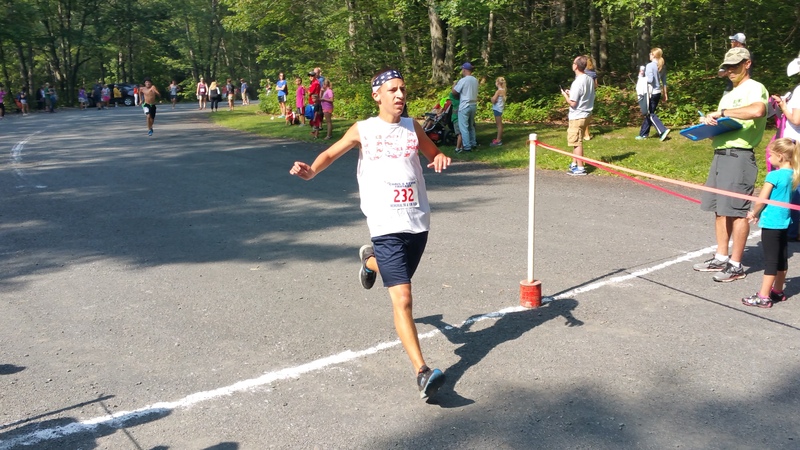 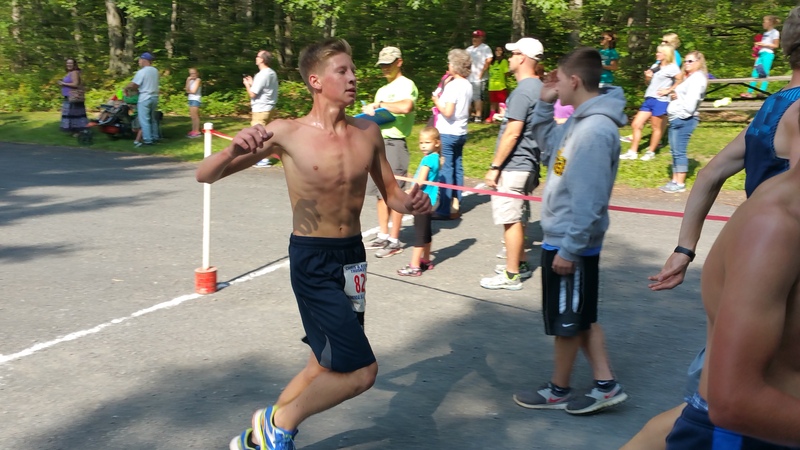 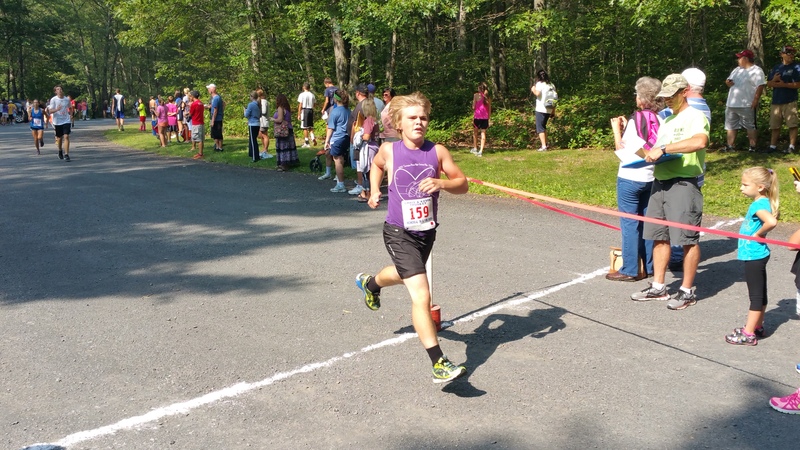 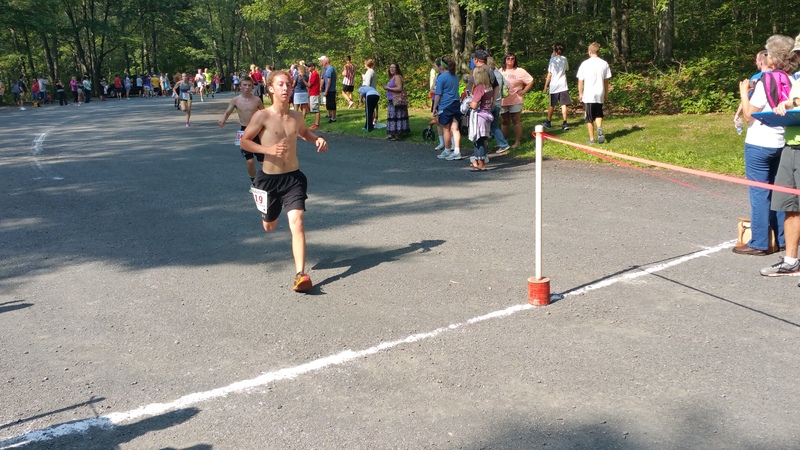 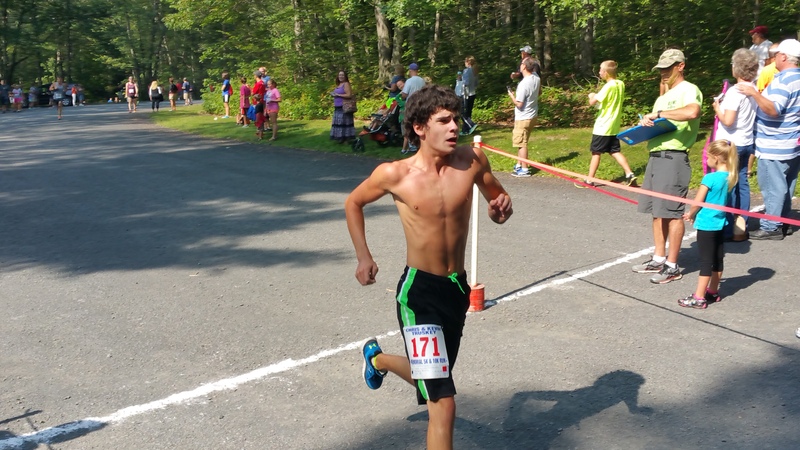 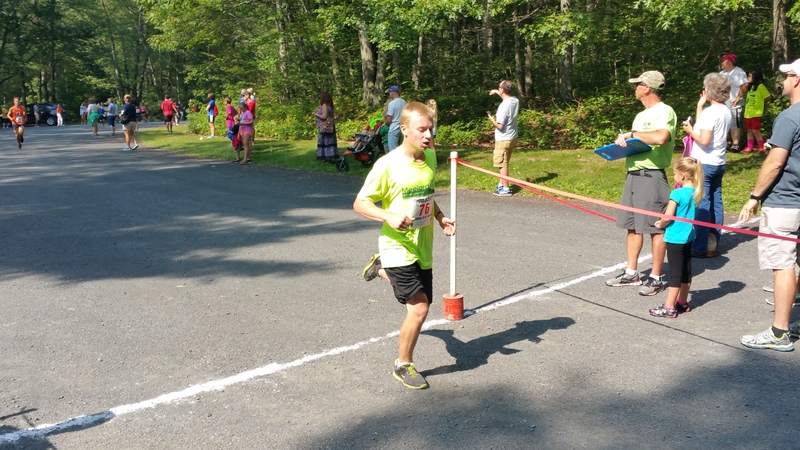 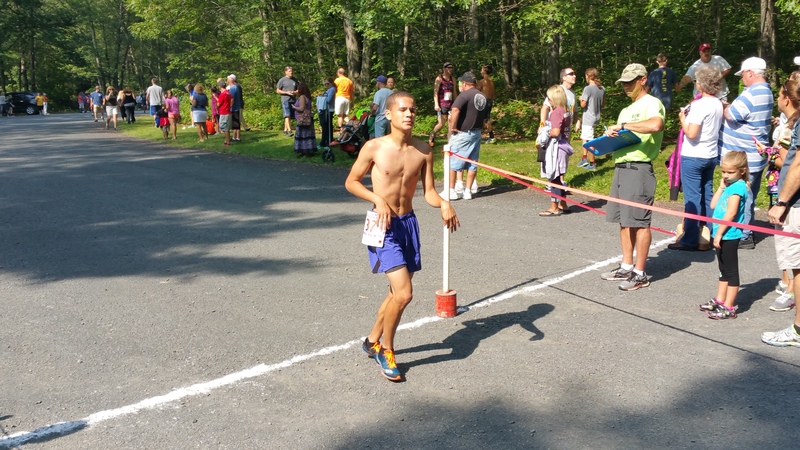 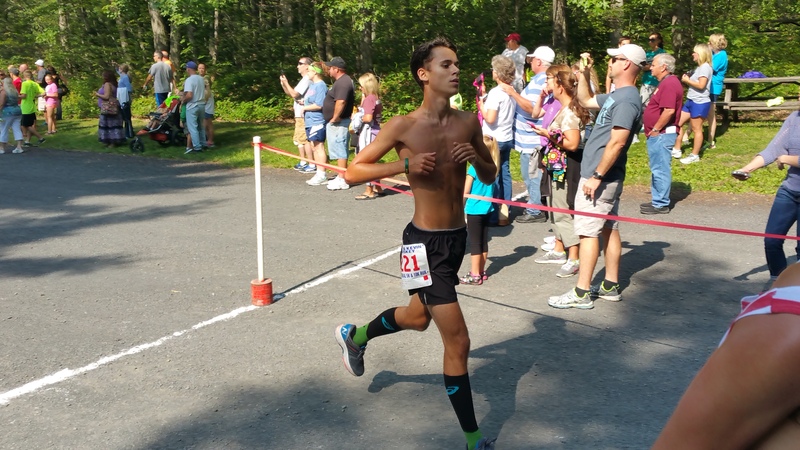 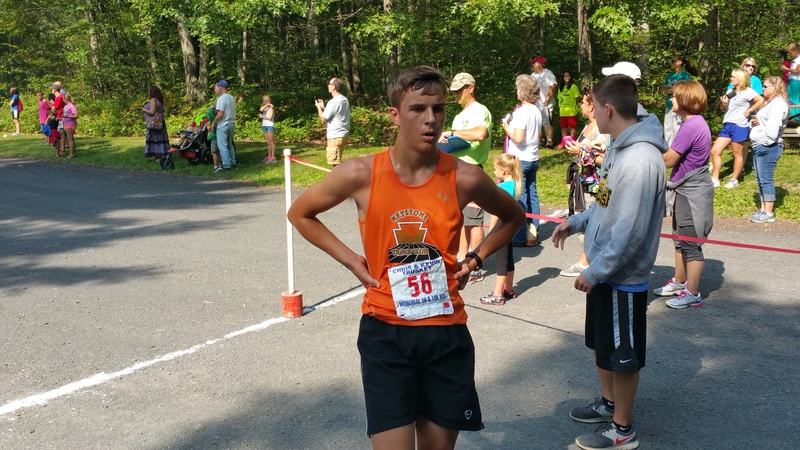 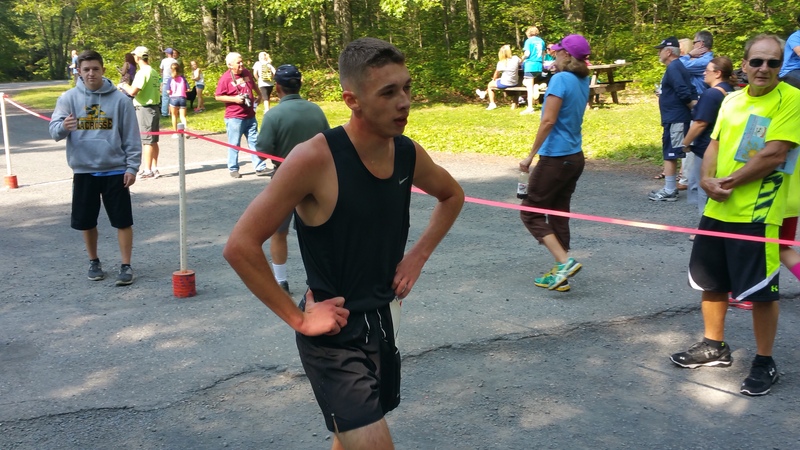 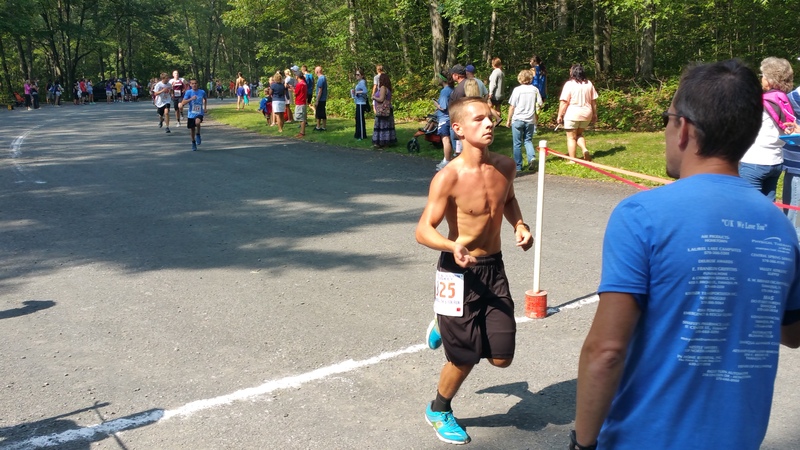 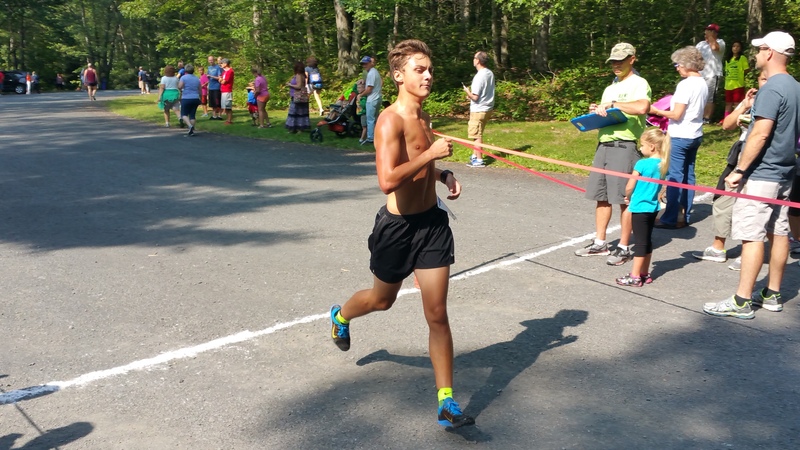 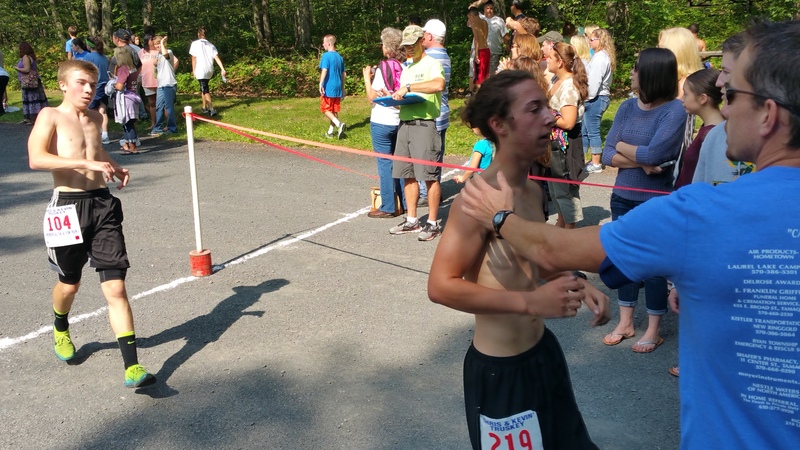 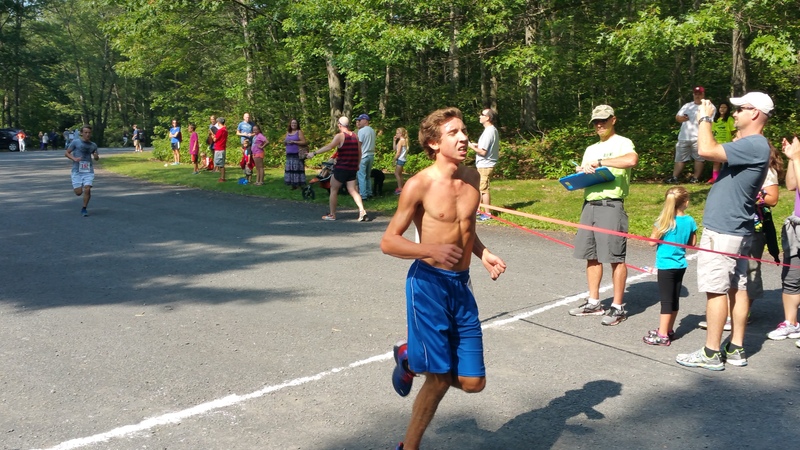 – FIRST MALE 14-18: Dylan Bucior, 17, of Jim Thorpe PA. (16:31). 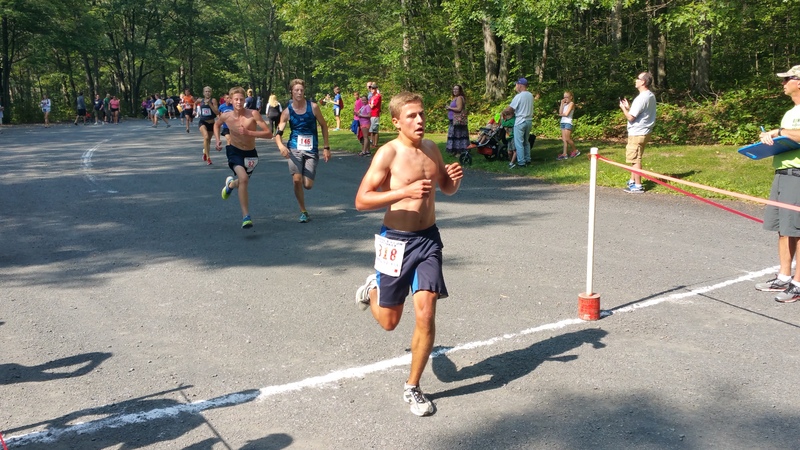 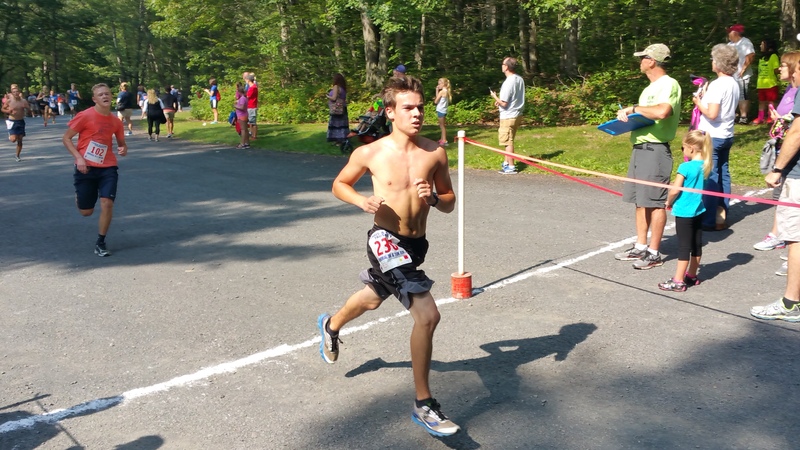 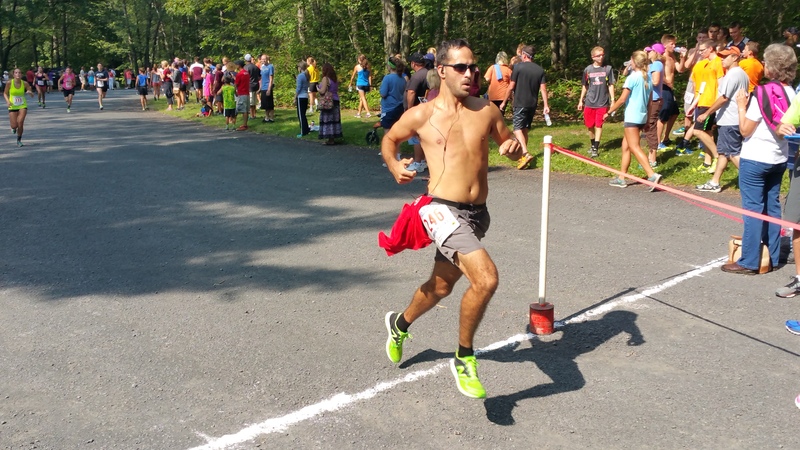 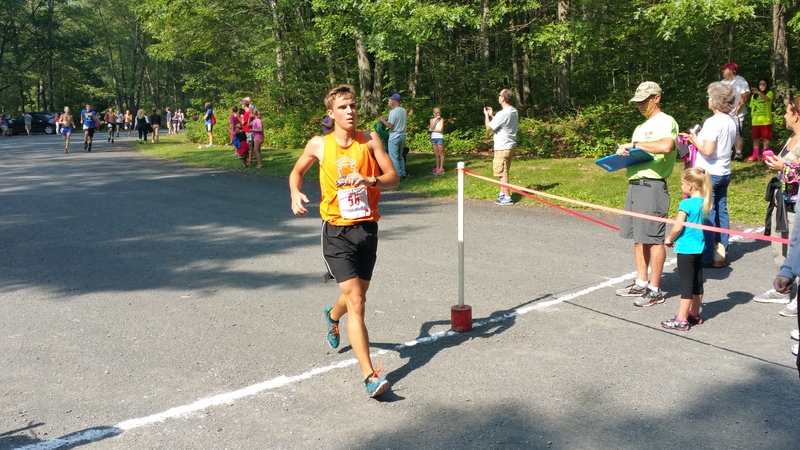 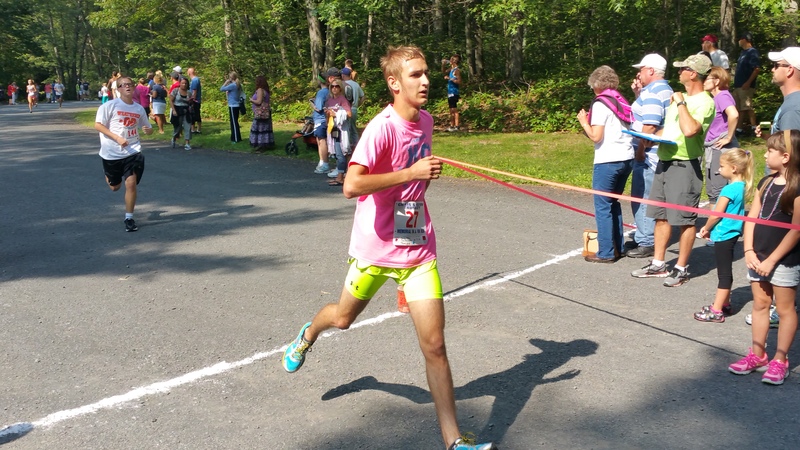 – FIRST MALE 19-24: Tyler Ravert, 19, of Wernersville PA. (18:55). 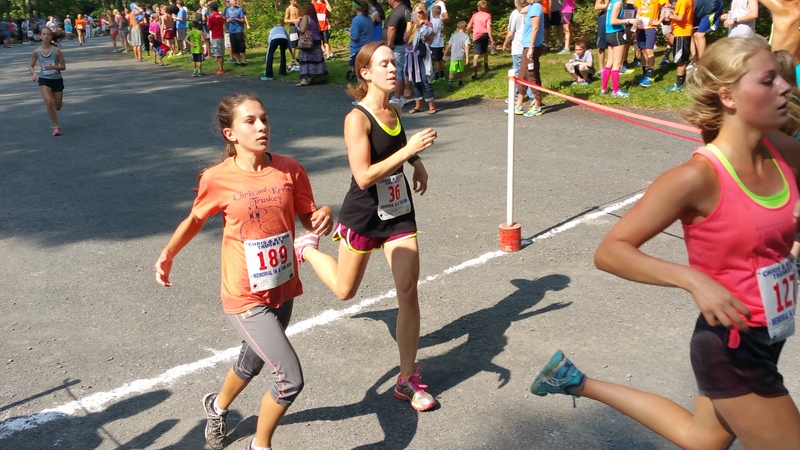 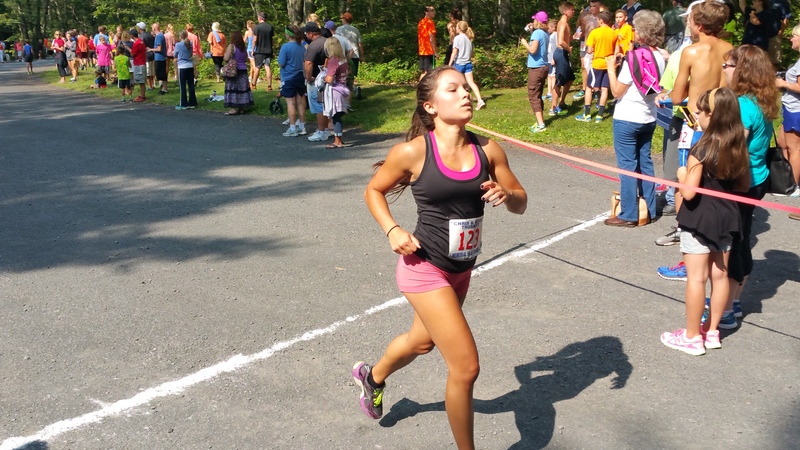 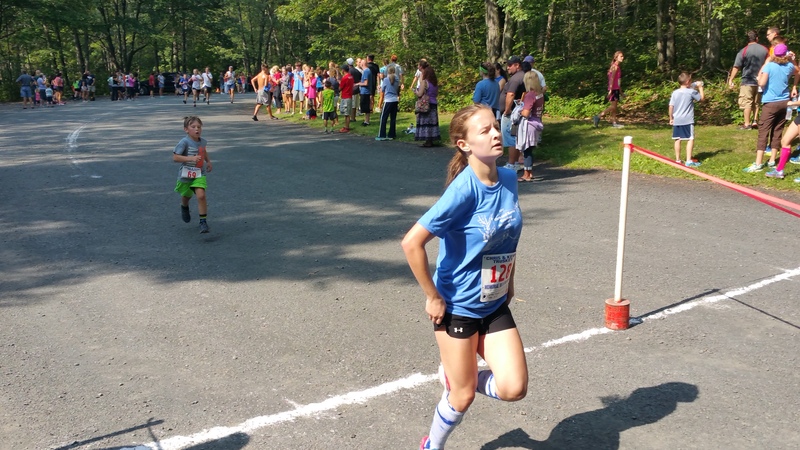 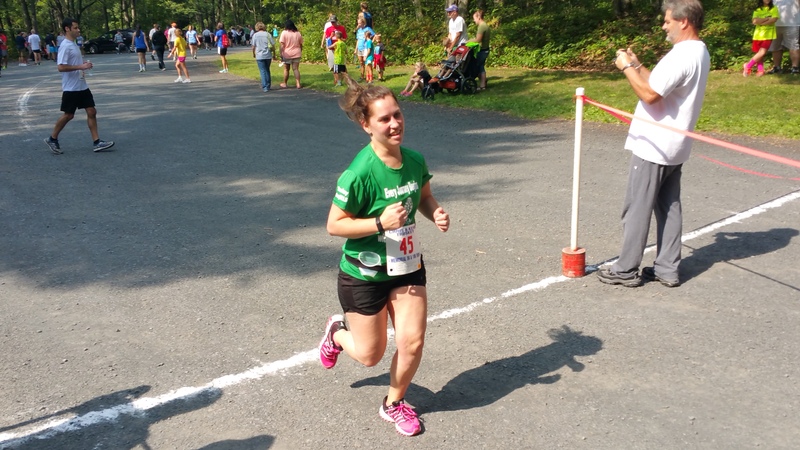 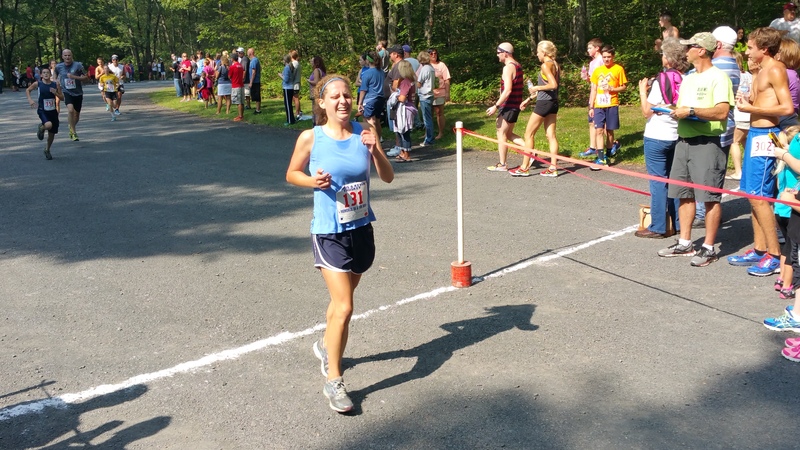 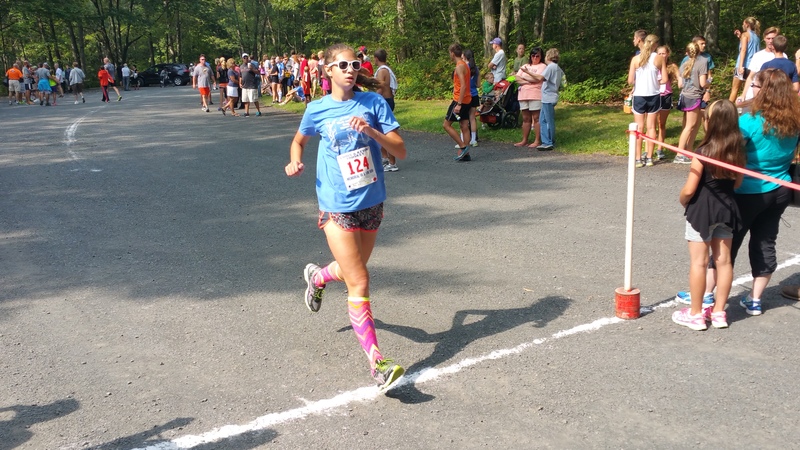 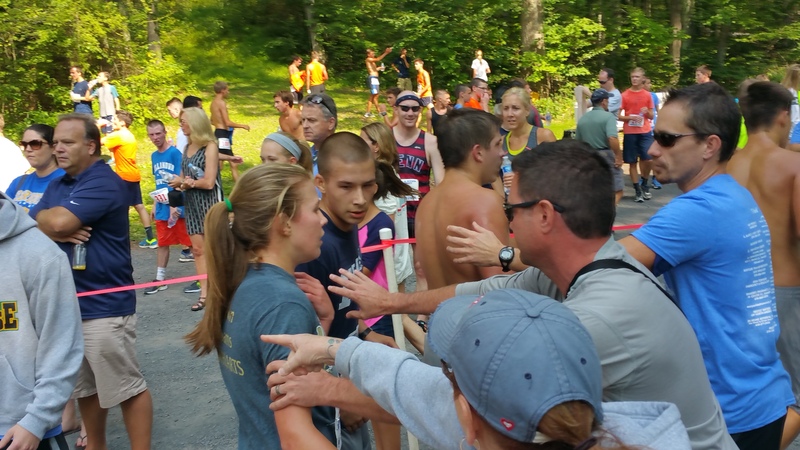 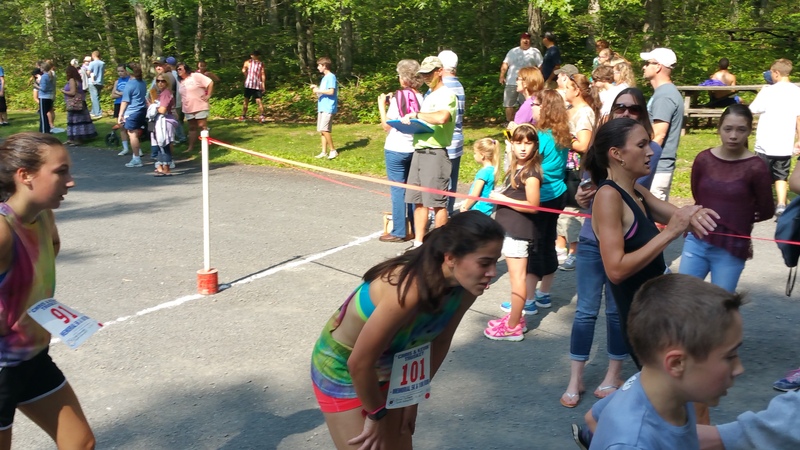 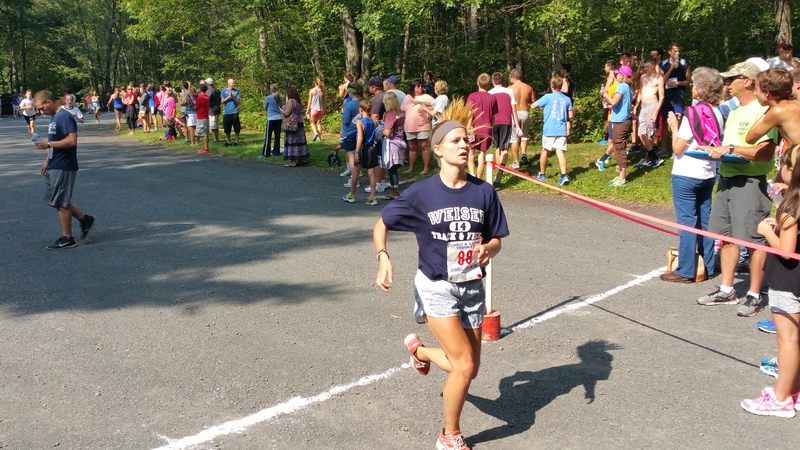 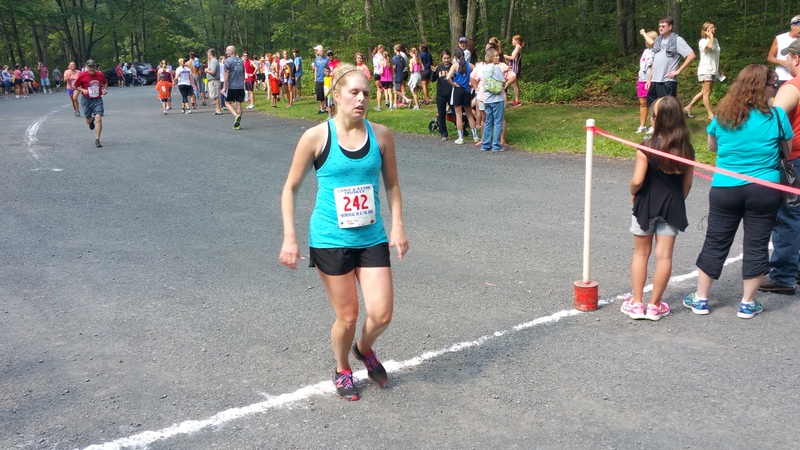 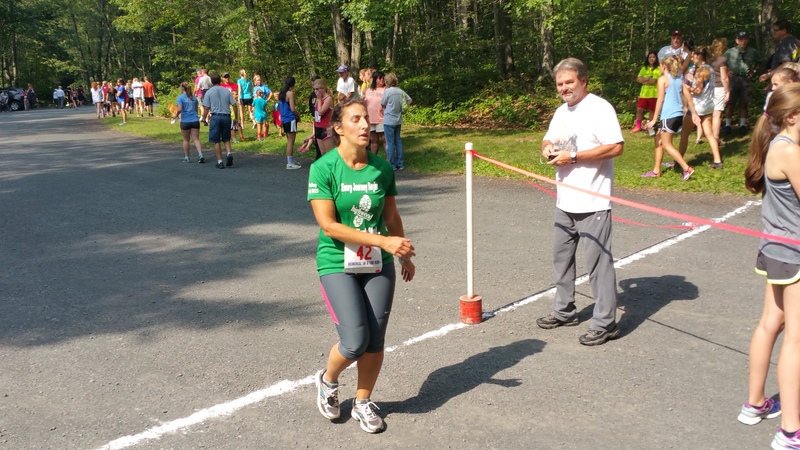 – OVERALL FEMALE: Samantha Snukis, 29, of Stowe PA. (19:15). 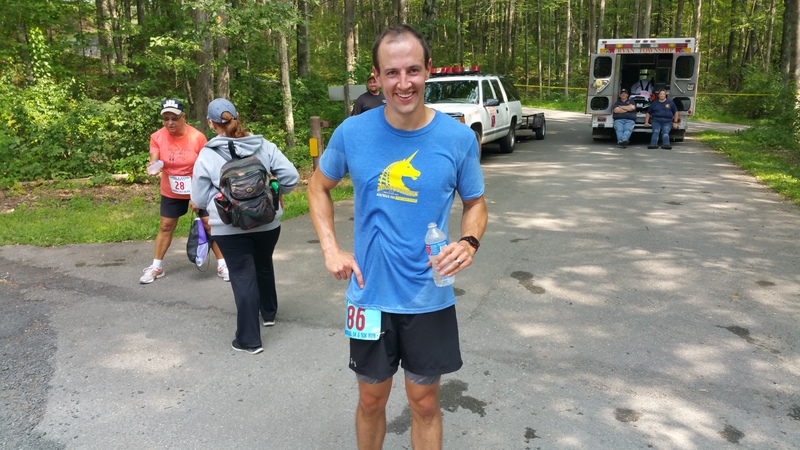 – FIRST MALE 35-39: Bradley Klimek, 39, of Arlington VA. (19:44). 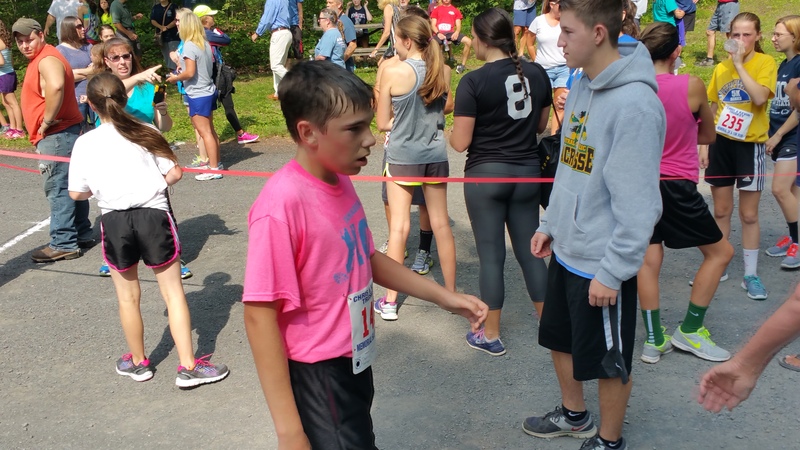 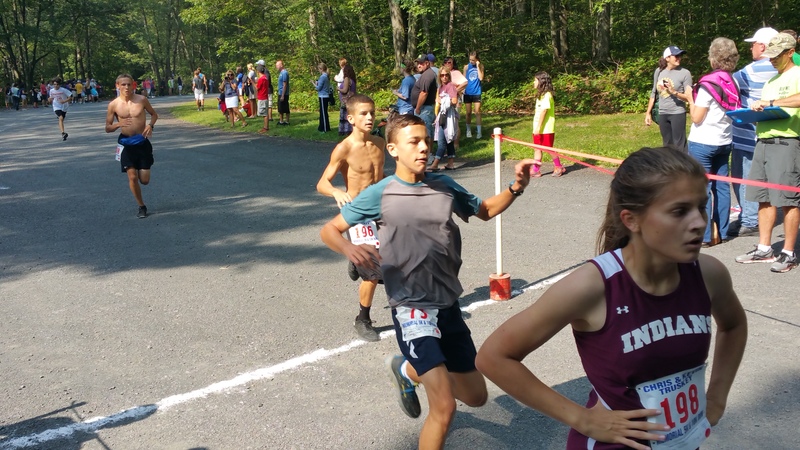 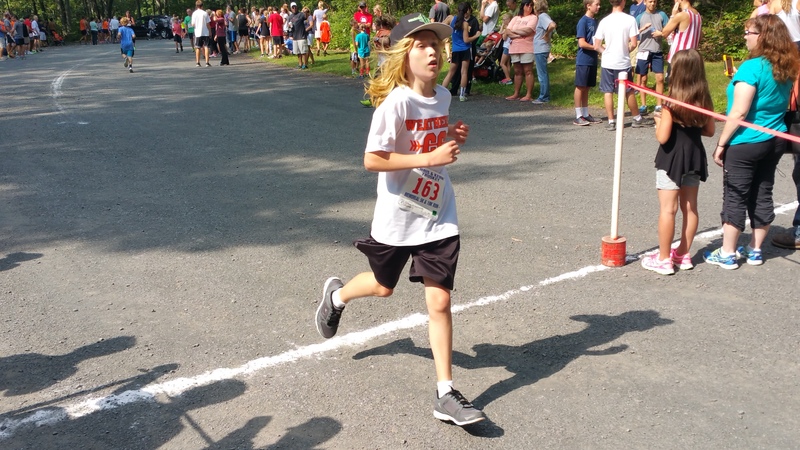 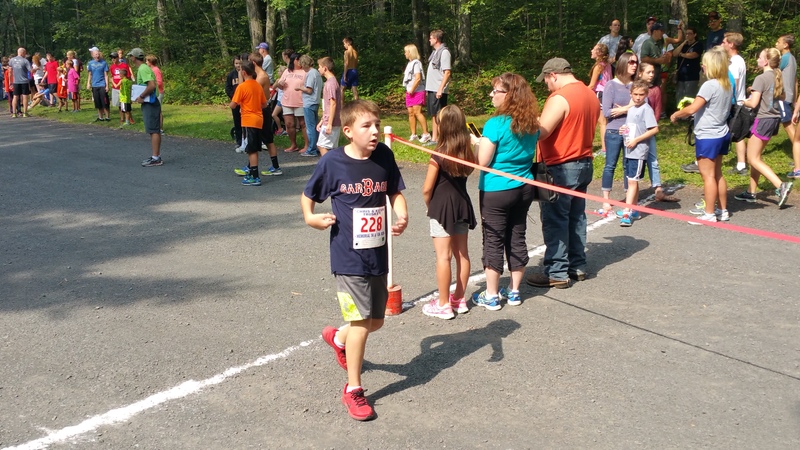 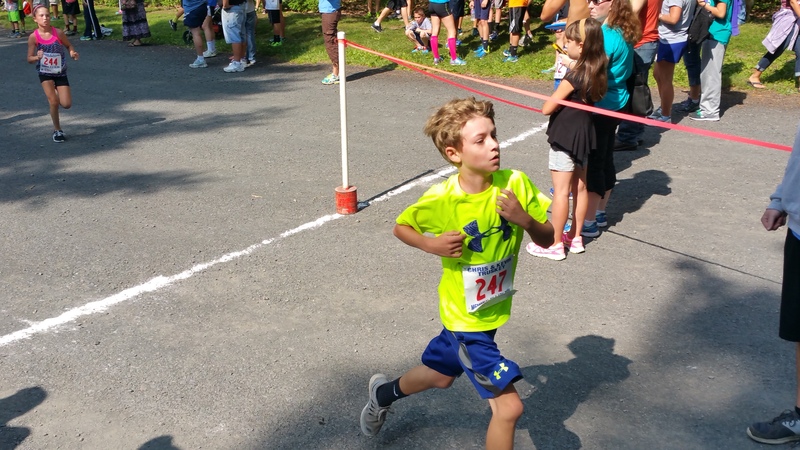 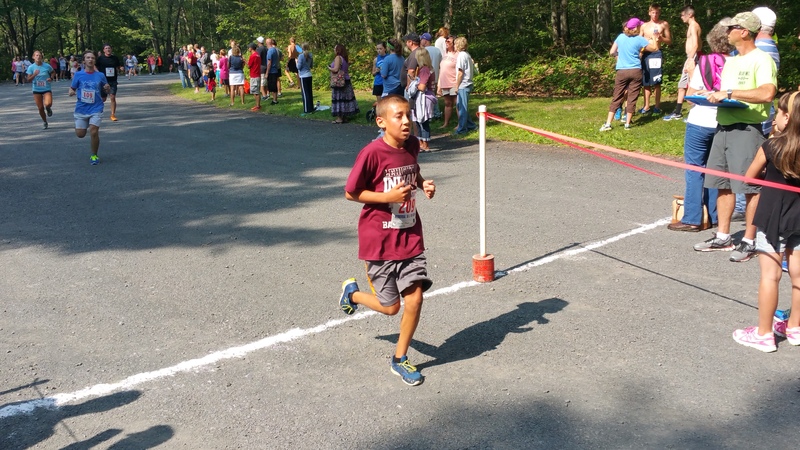 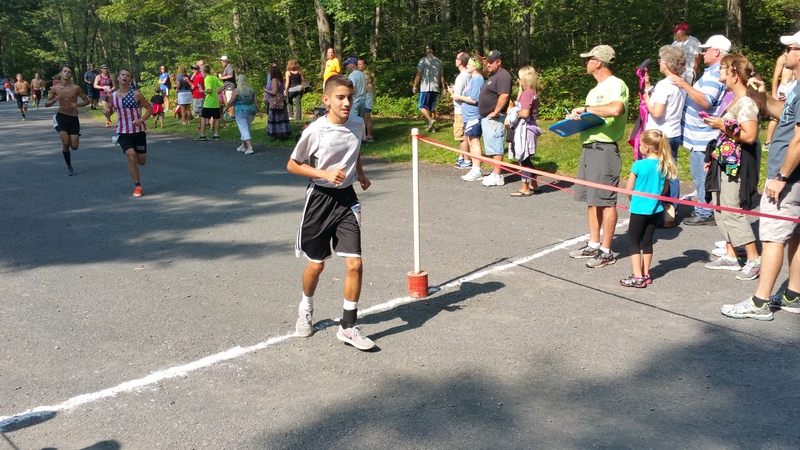 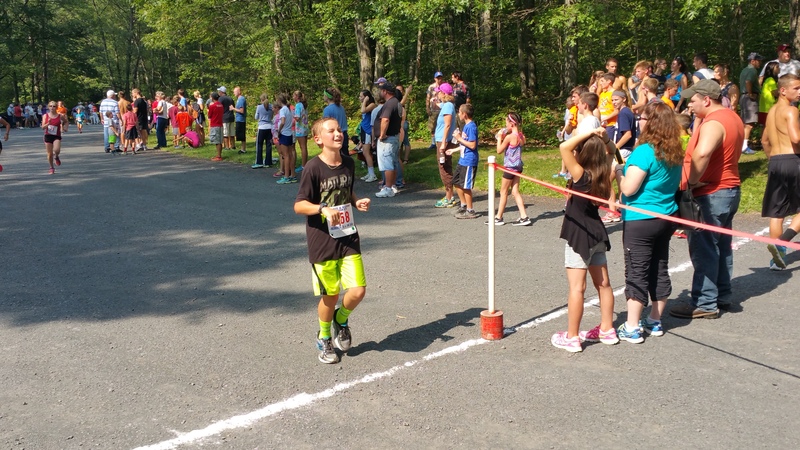 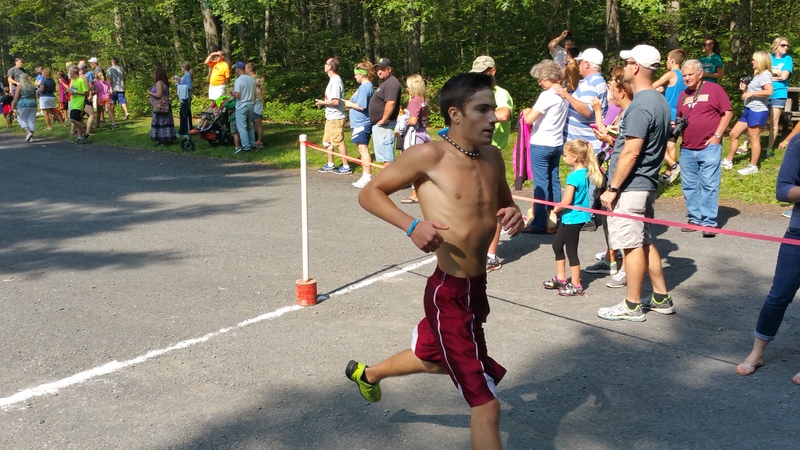 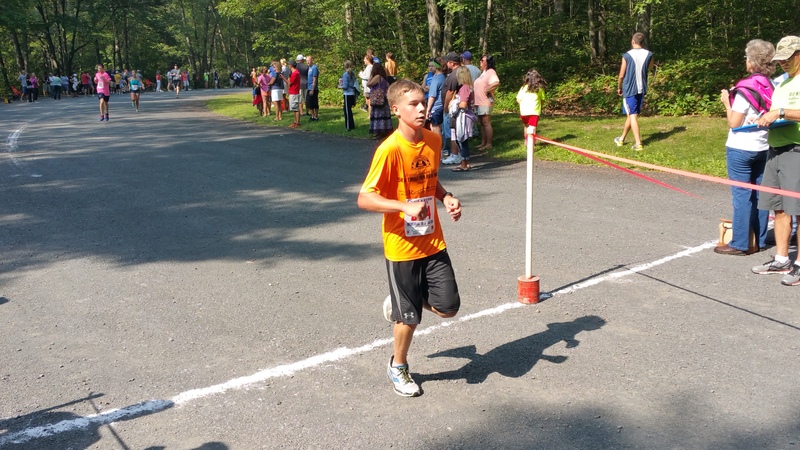 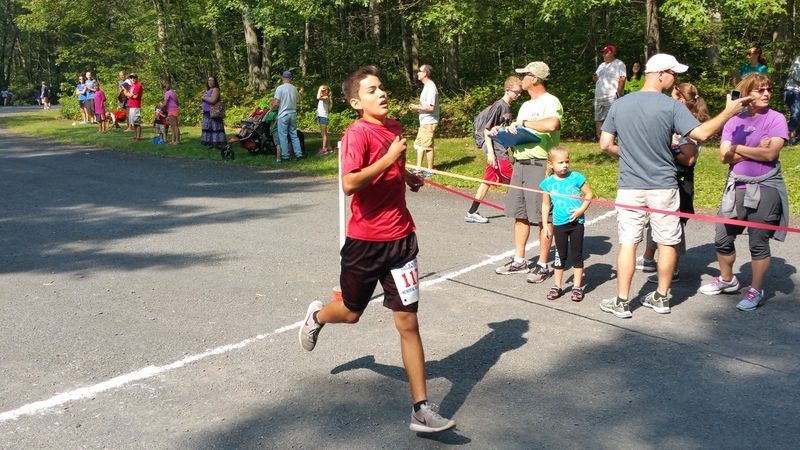 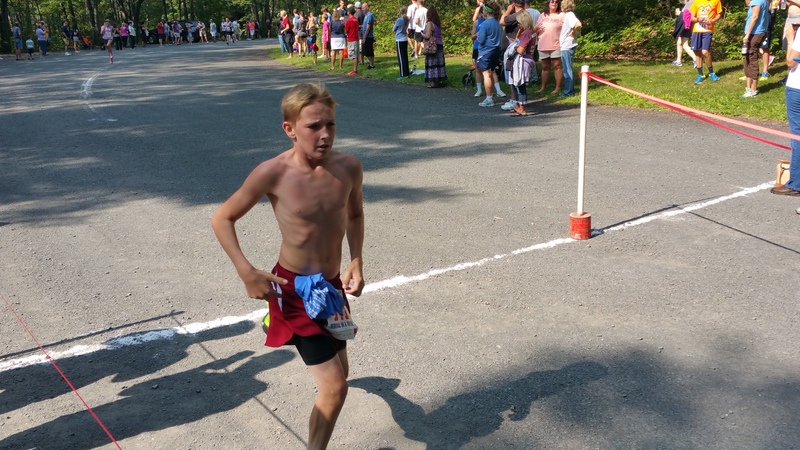 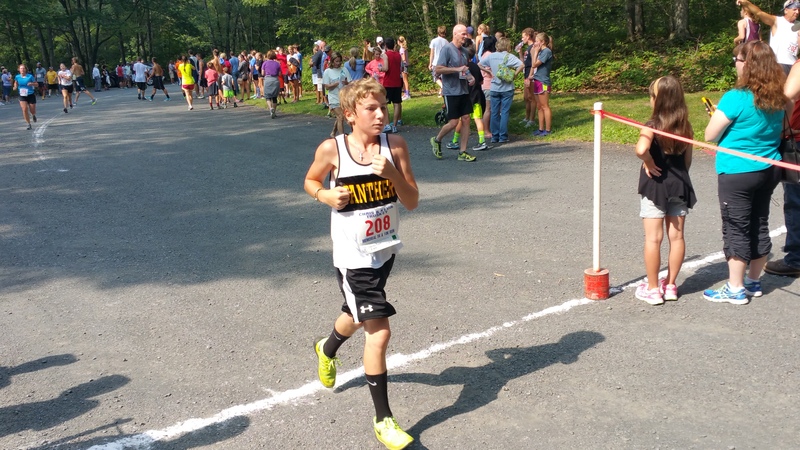 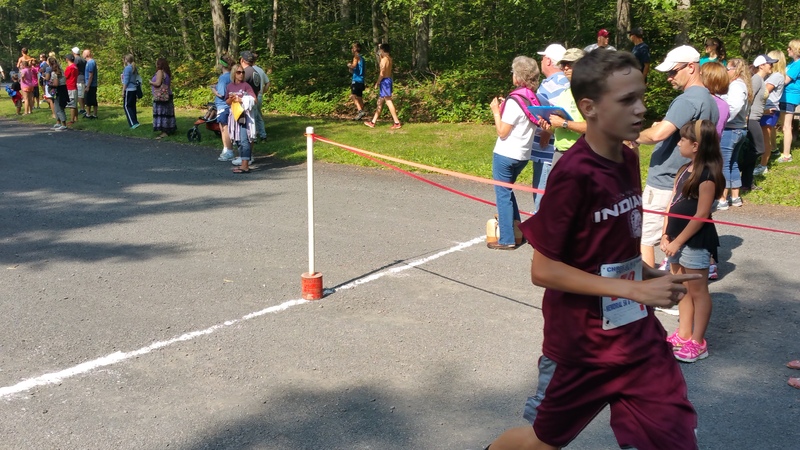 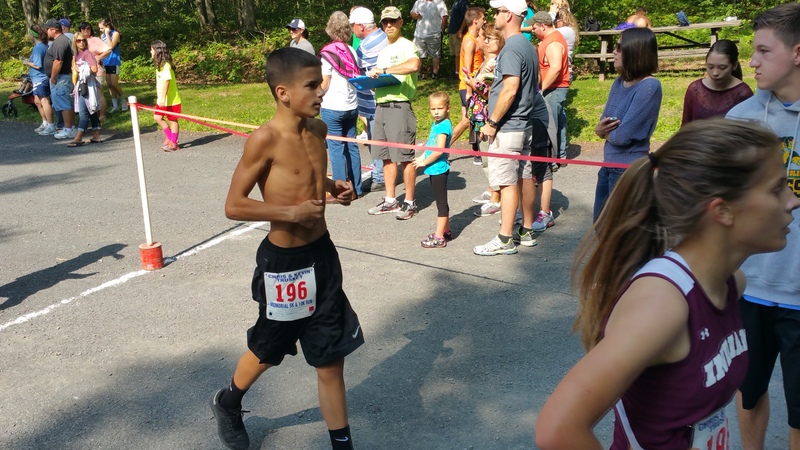 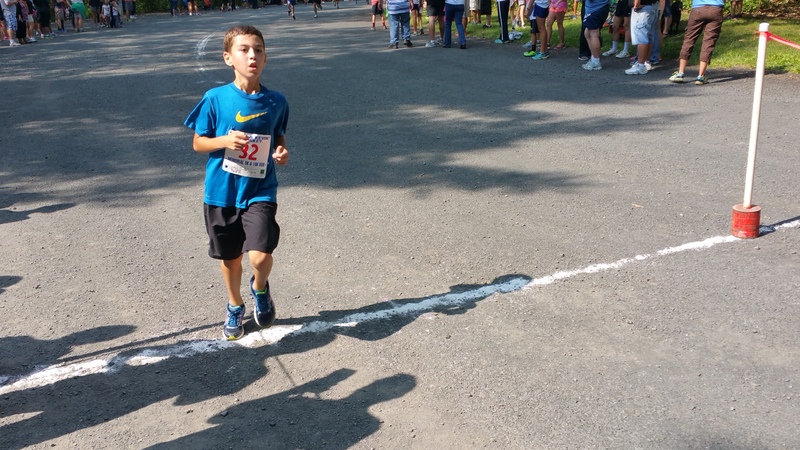 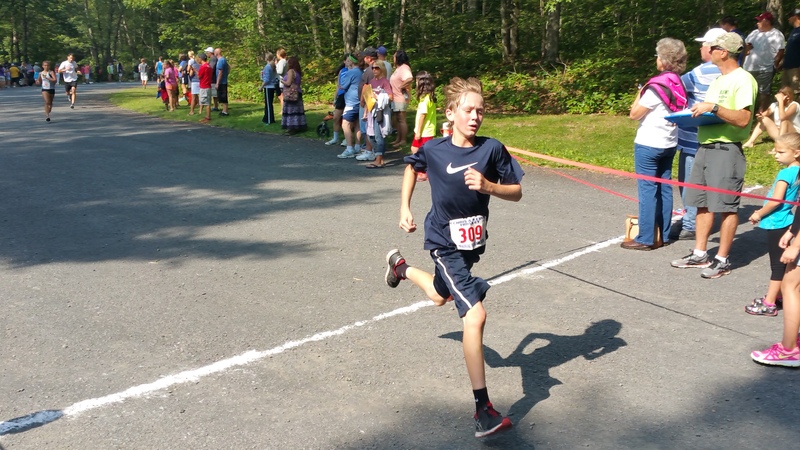 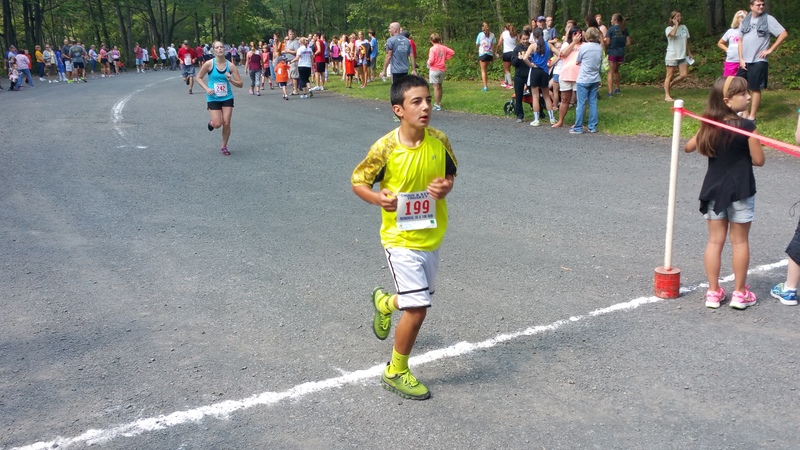 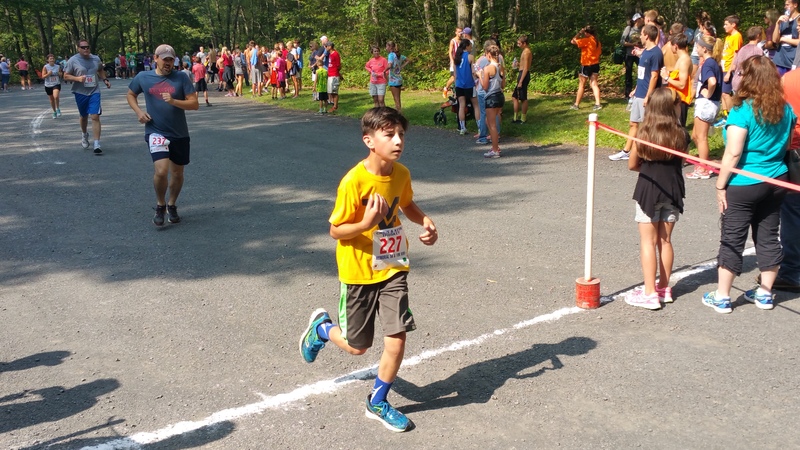 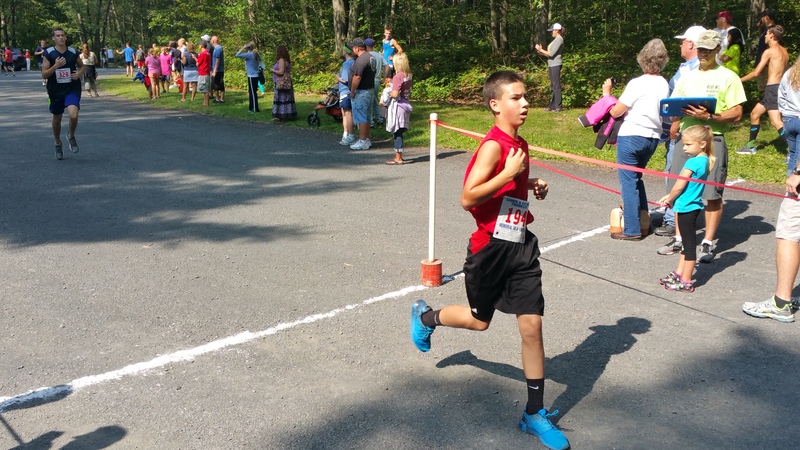 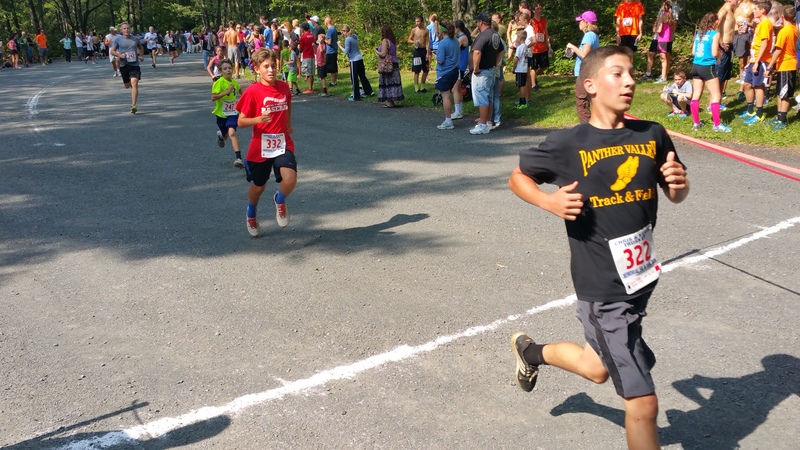 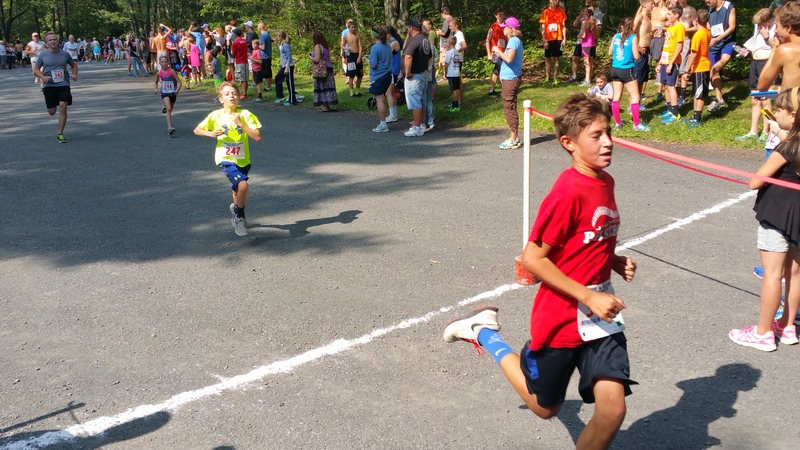 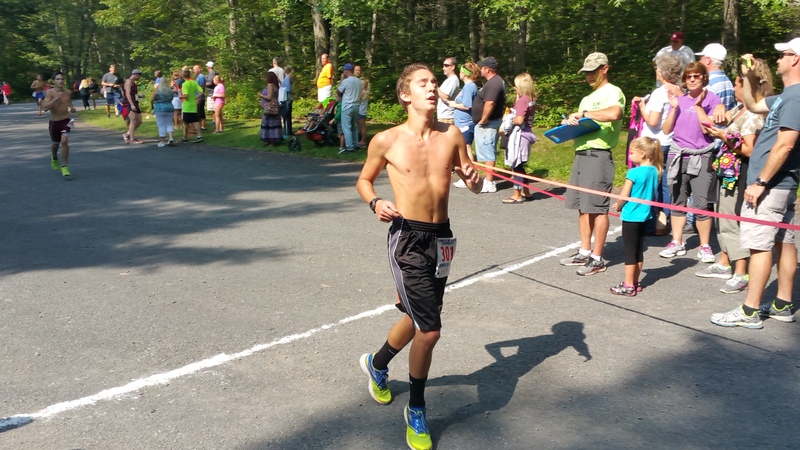 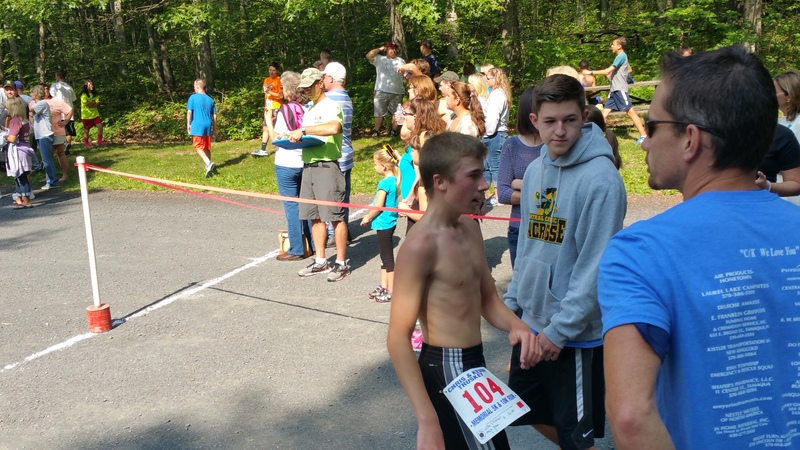 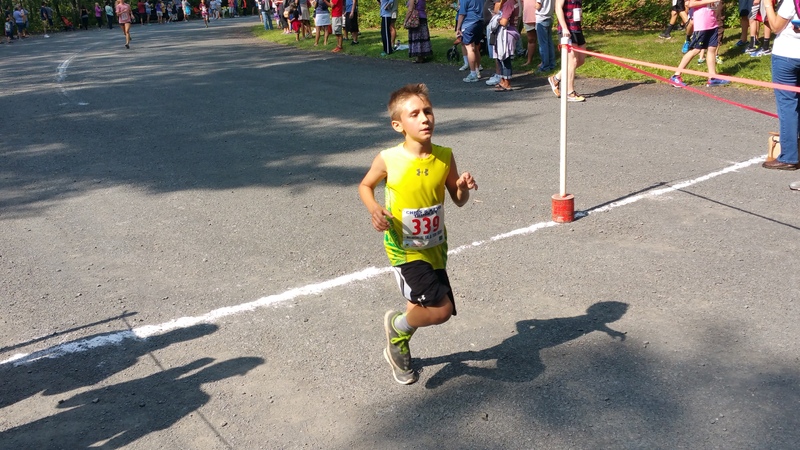 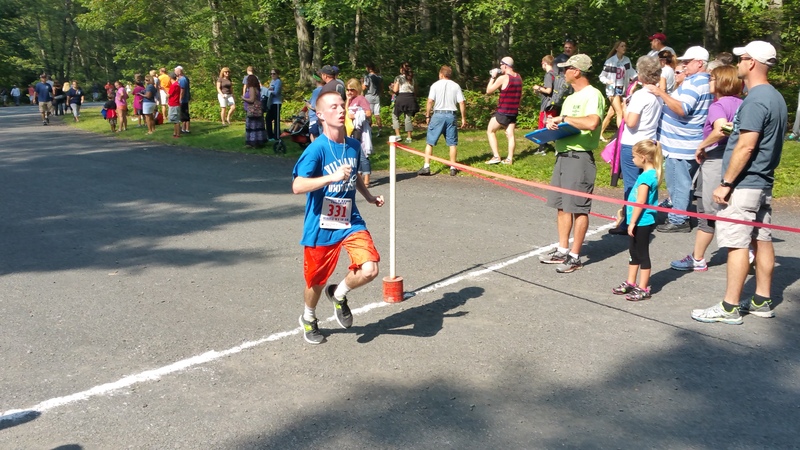 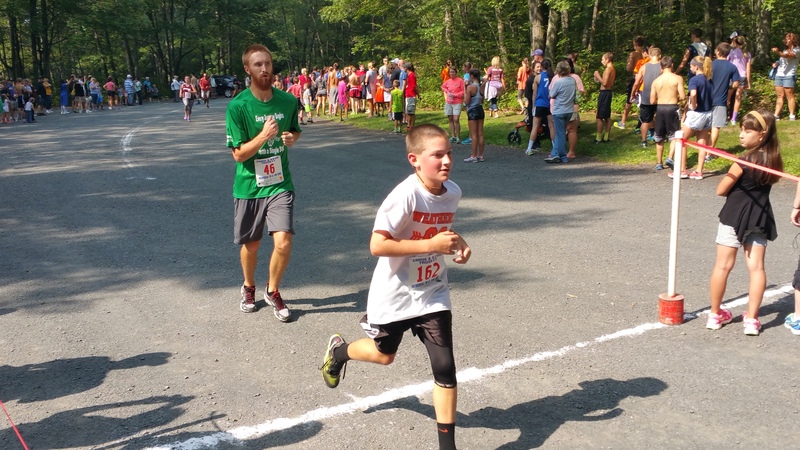 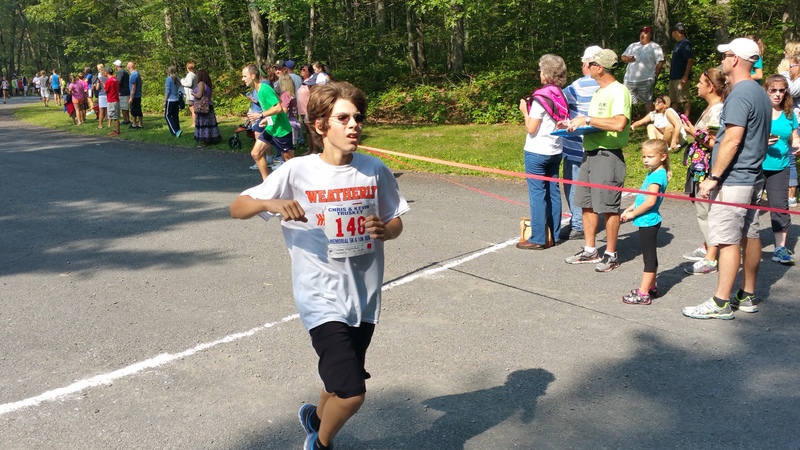 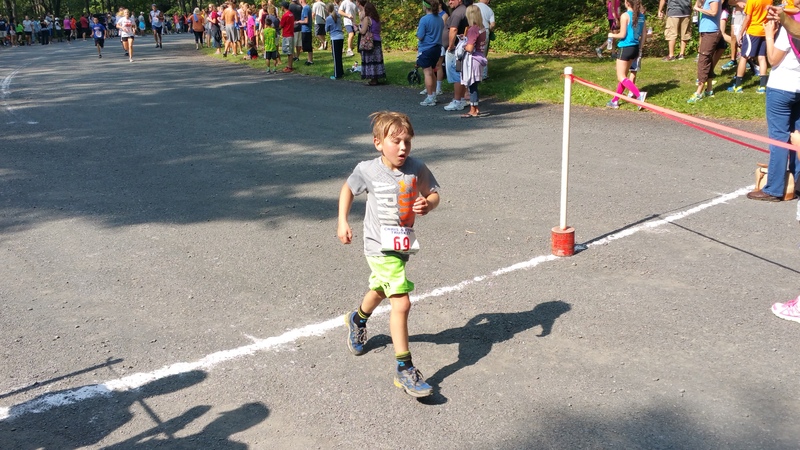 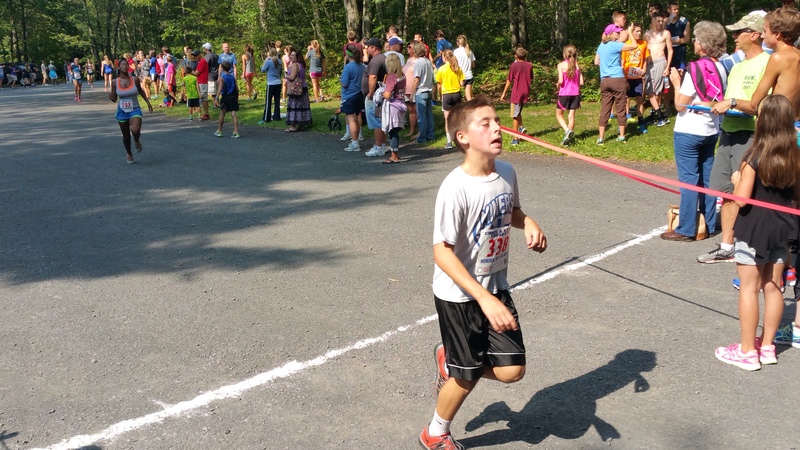 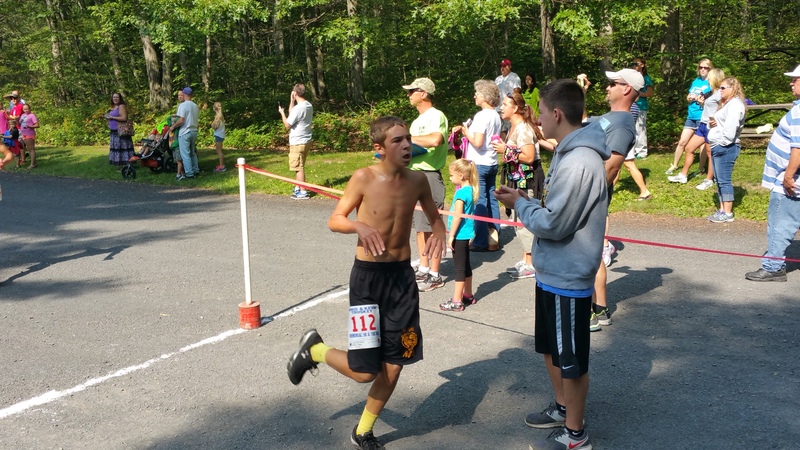 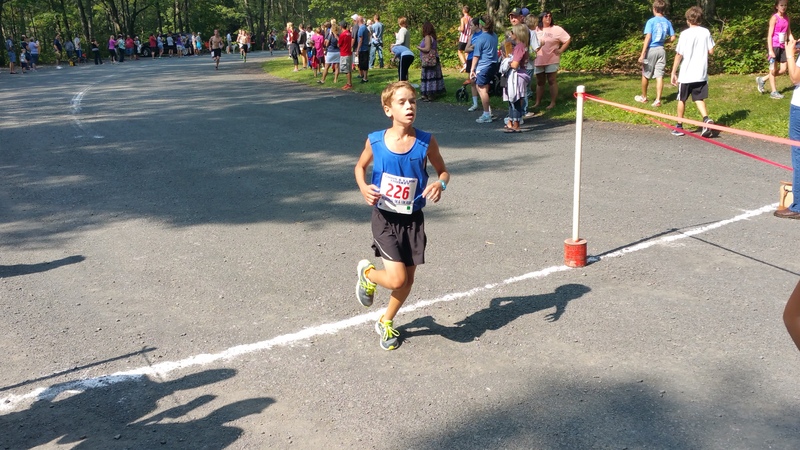 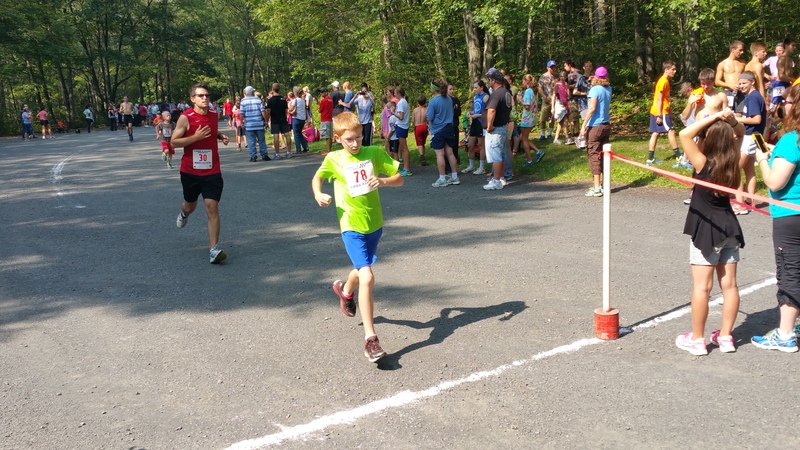 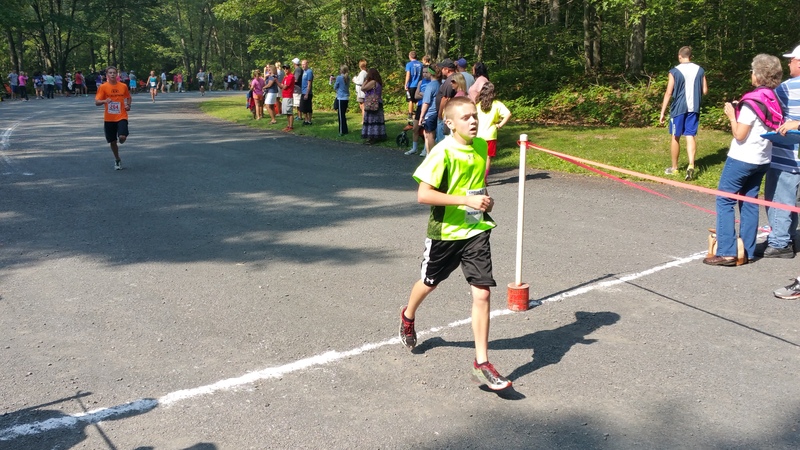 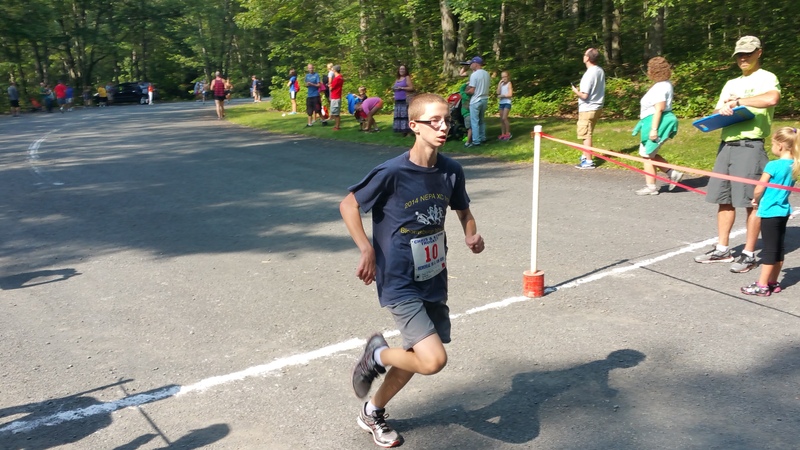 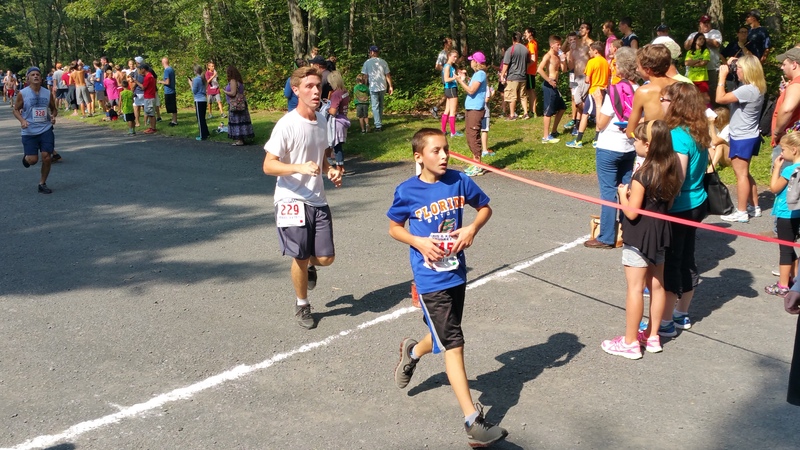 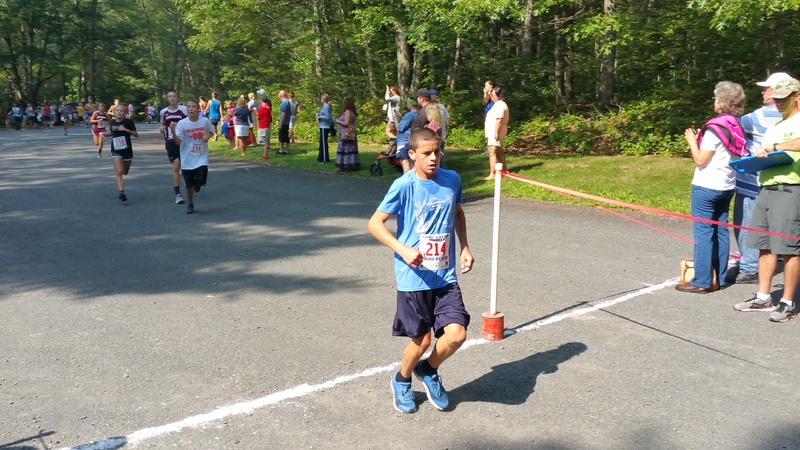 – FIRST MALE 13 & UNDER: Adam Soriano, 13, of Mahanoy City PA. (19:53). 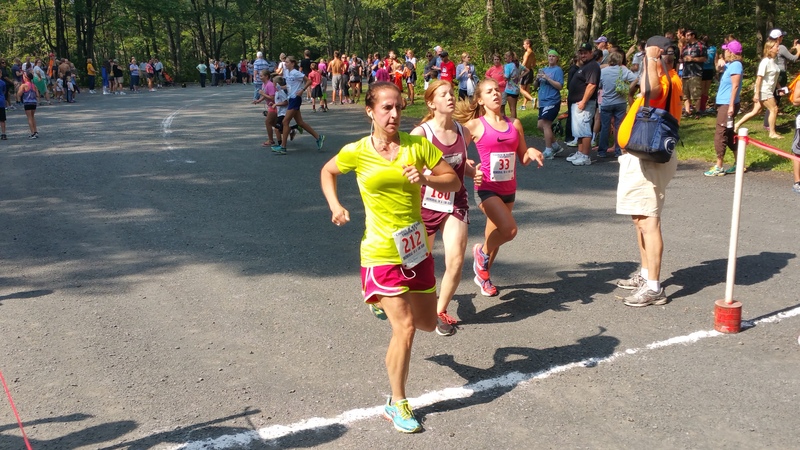 – FIRST FEMALE 30-34: Margaret Benny Klimek, 32, of Arlington VA. (20:23). 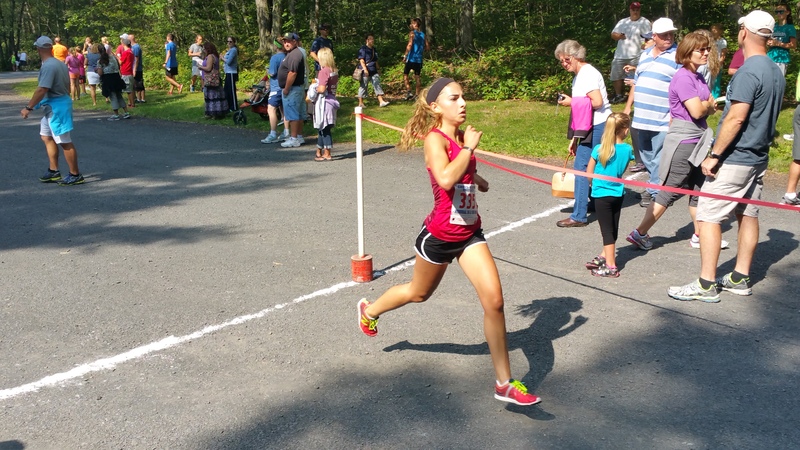 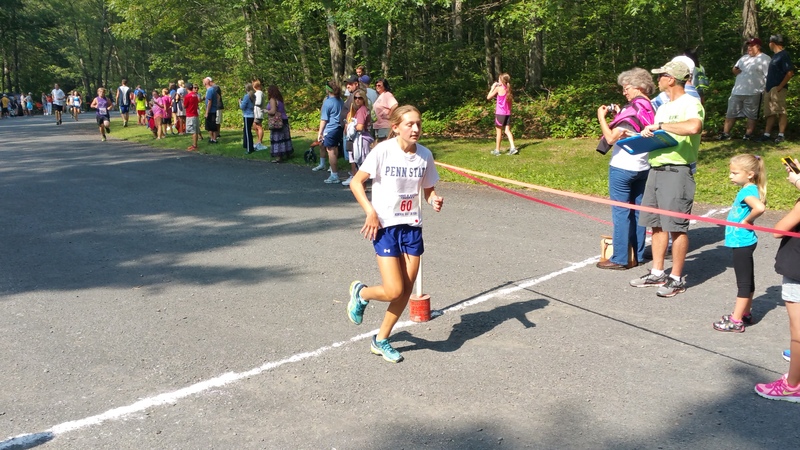 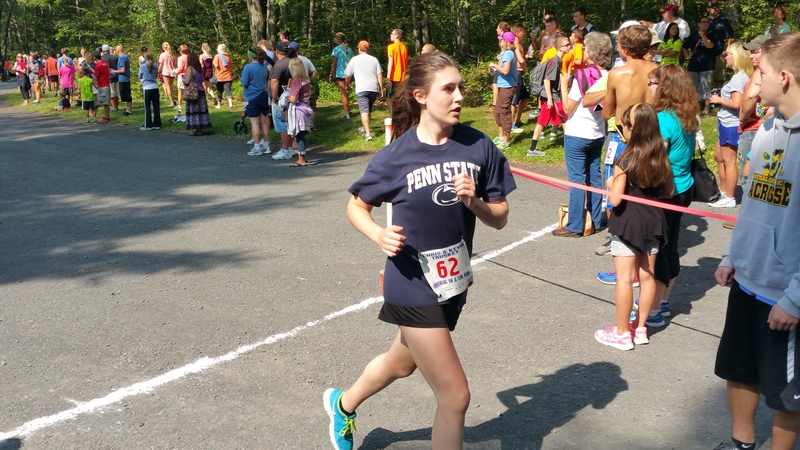 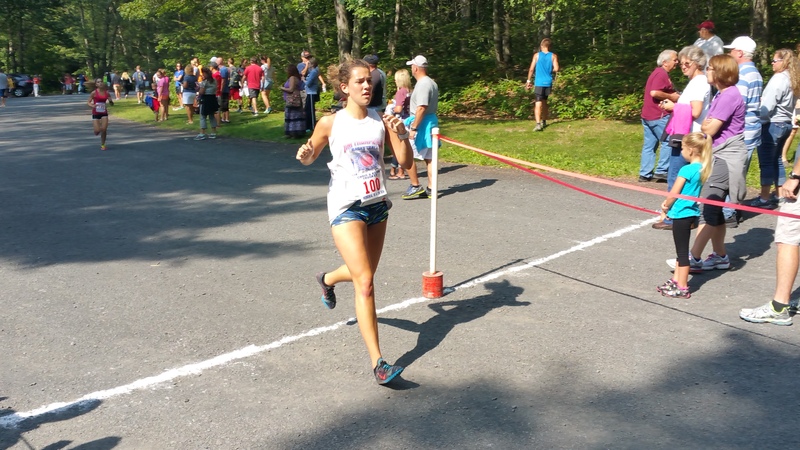 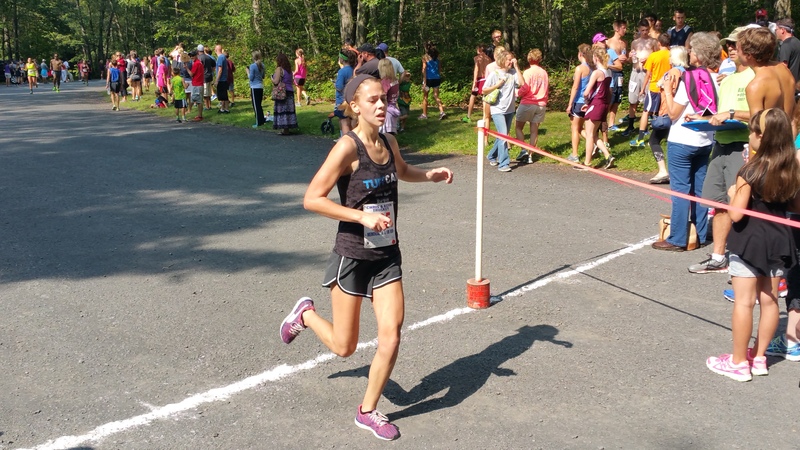 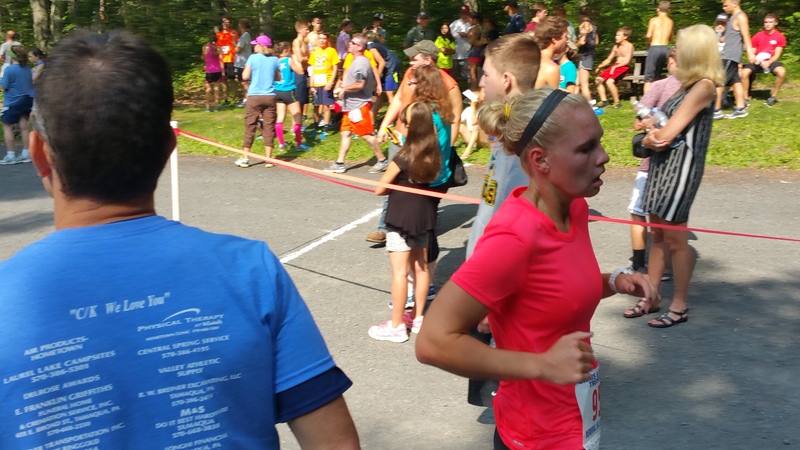 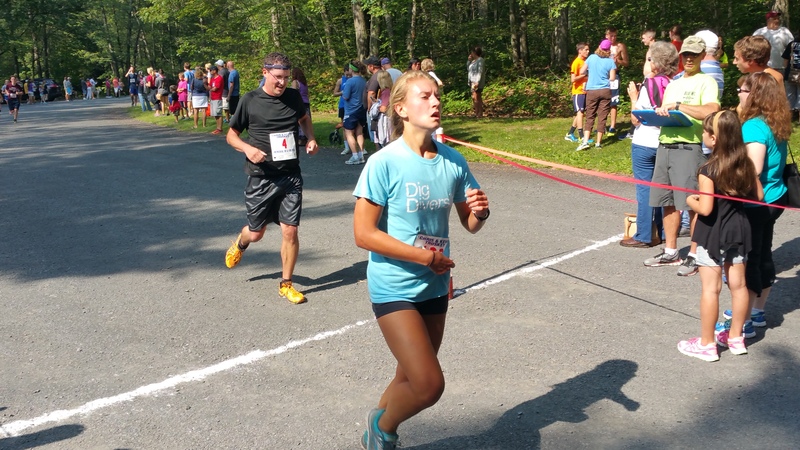 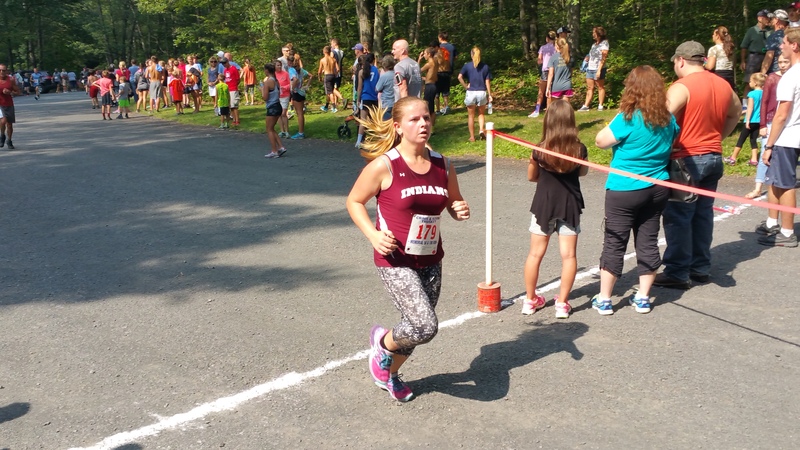 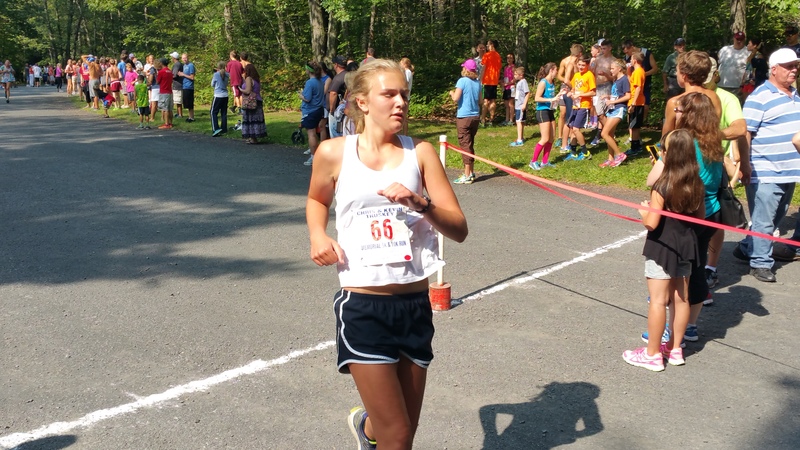 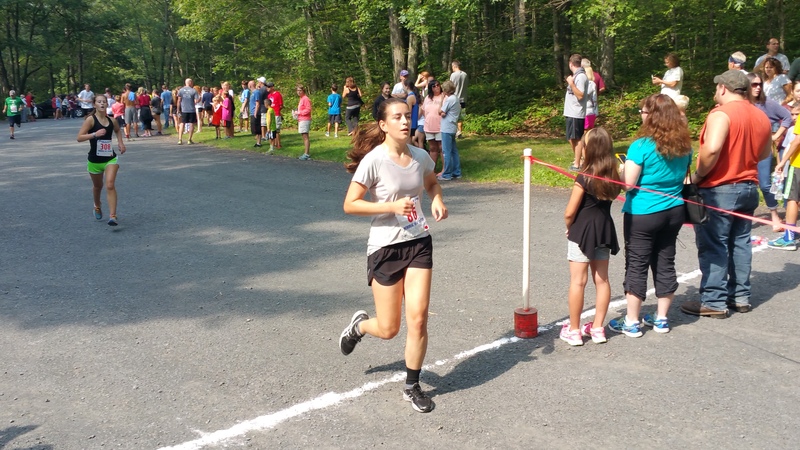 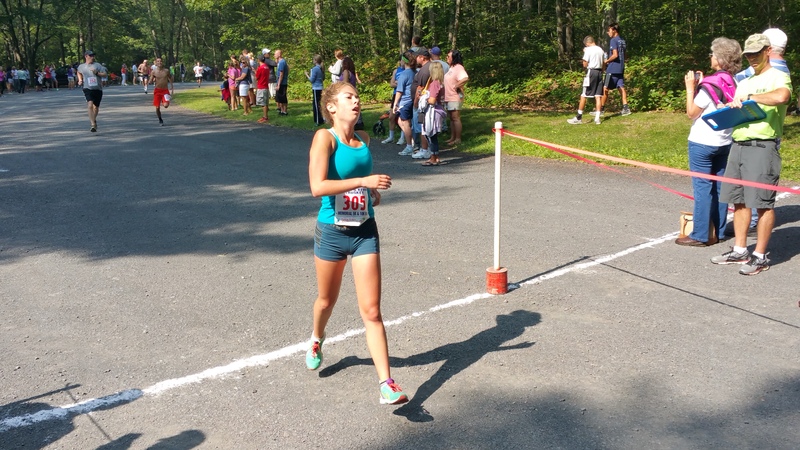 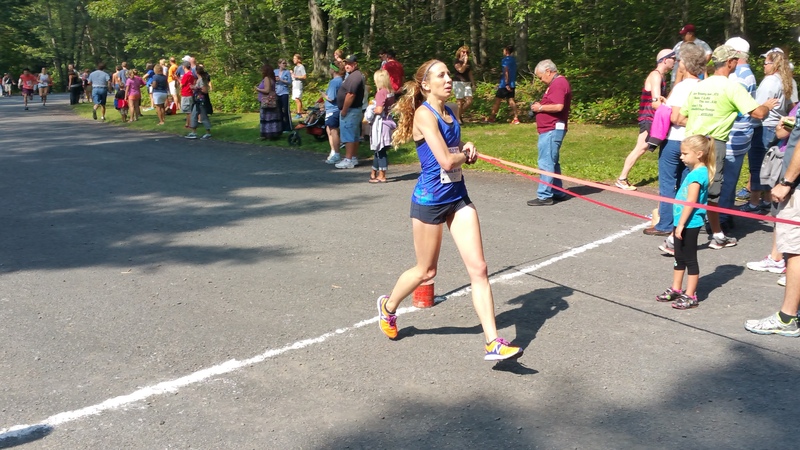 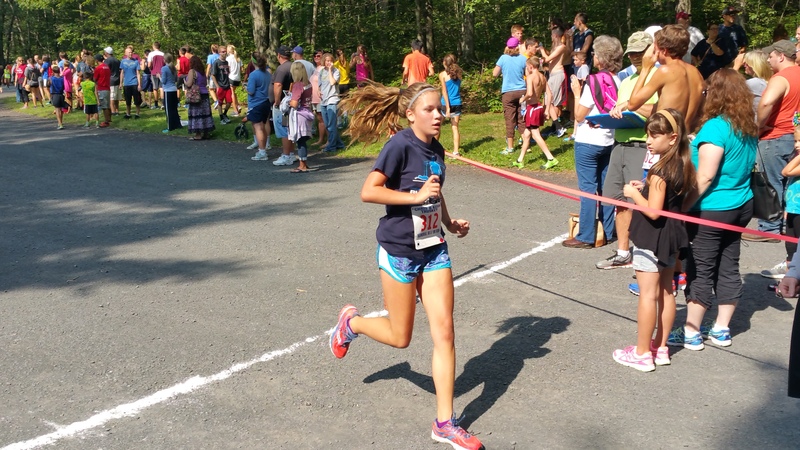 – FIRST FEMALE 14-18: Kayley Kovac, 16, of Jim Thorpe PA. (20:30). 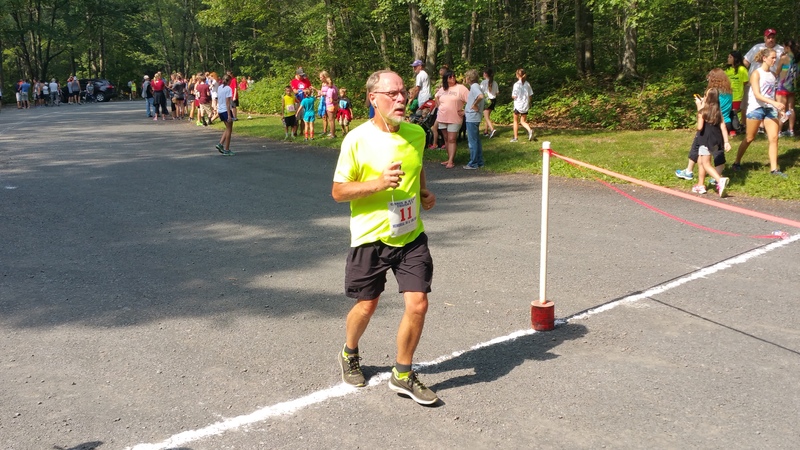 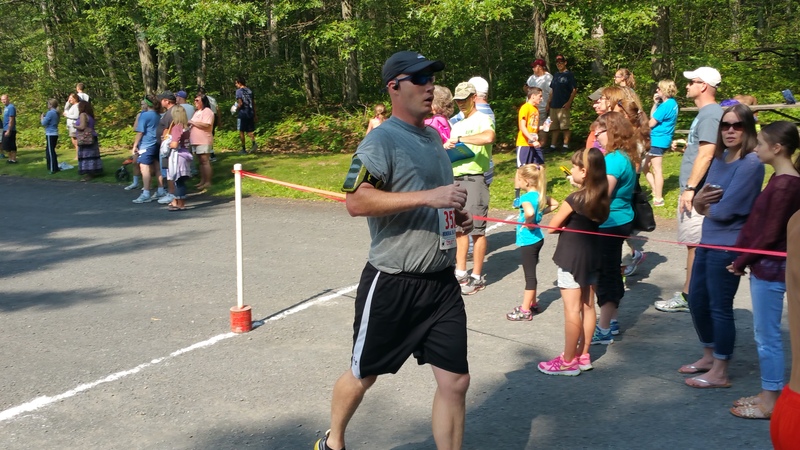 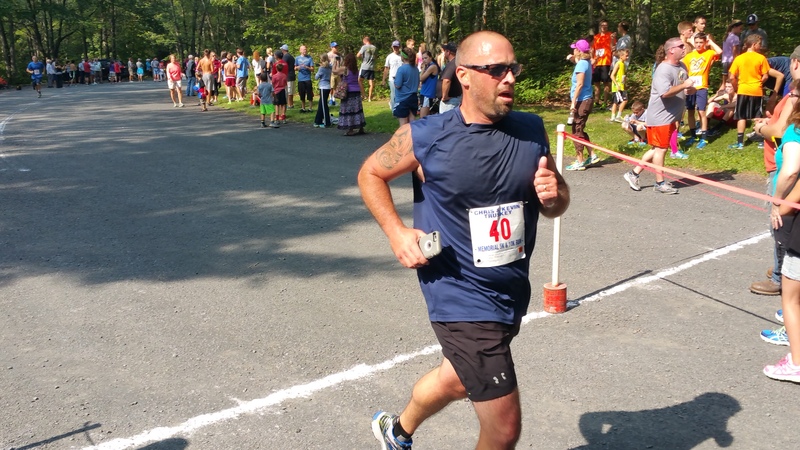 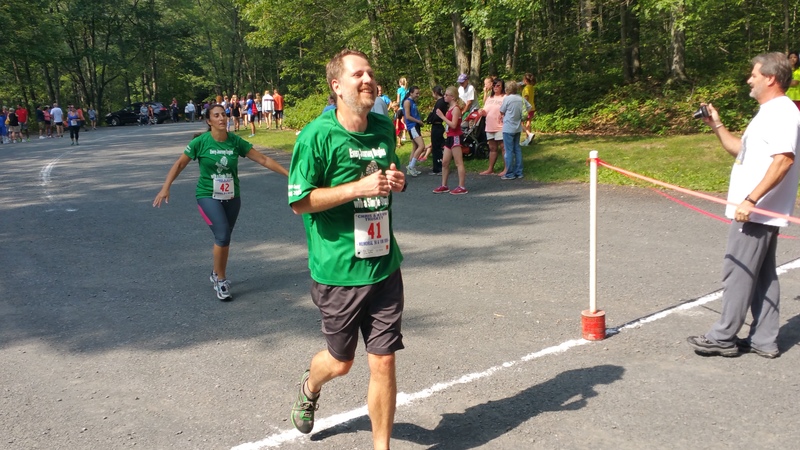 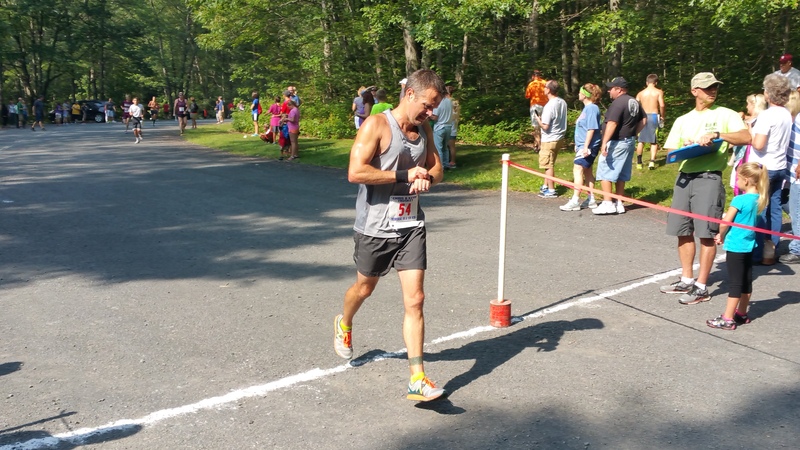 – FIRST MALE 40-44: Rick Kunkel, 40, of Etters PA. (20:50). 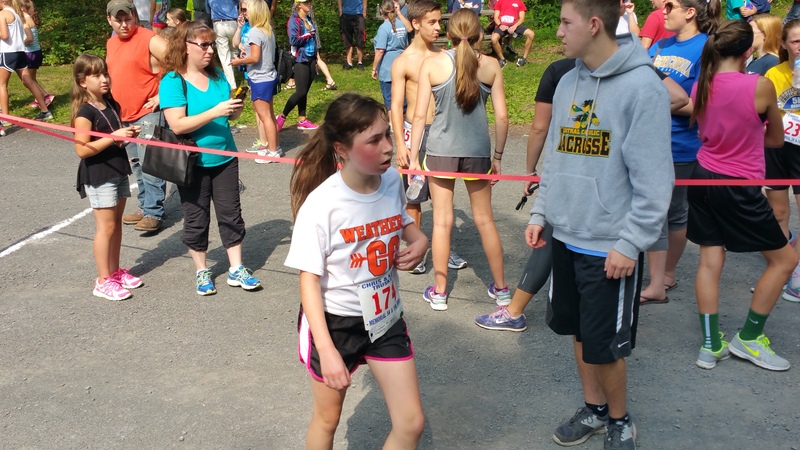 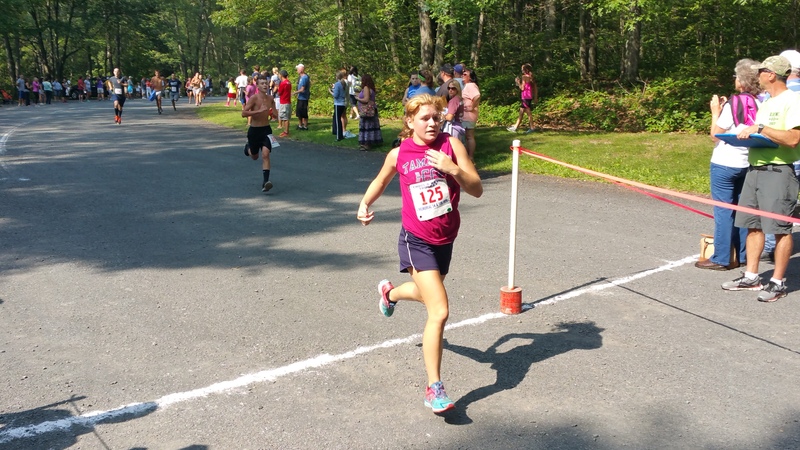 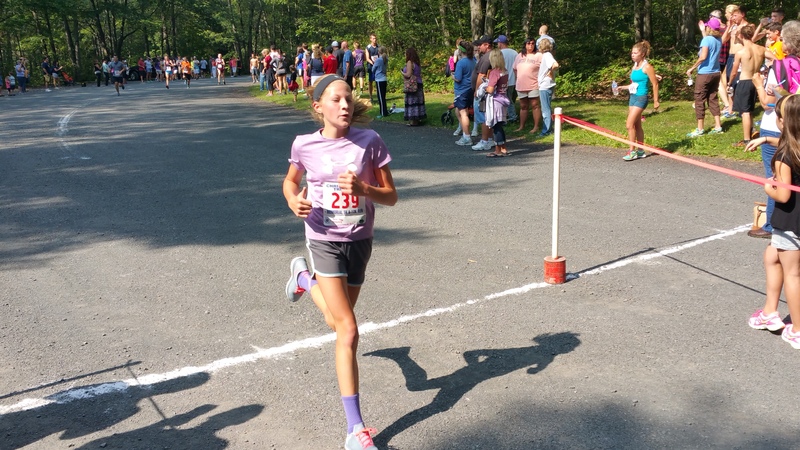 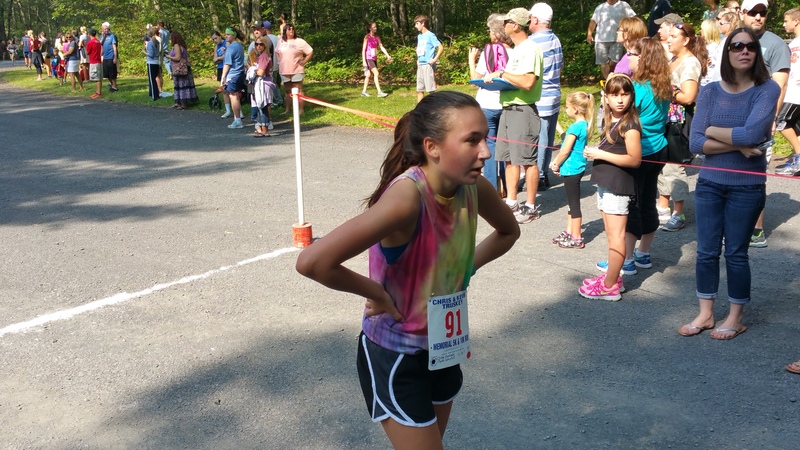 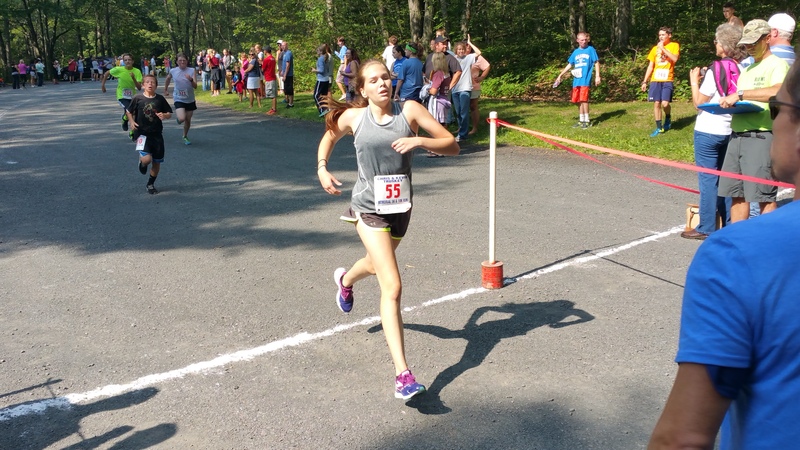 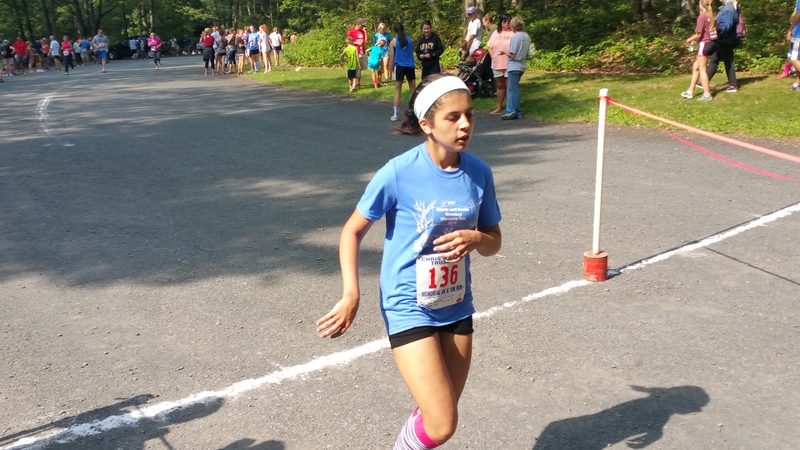 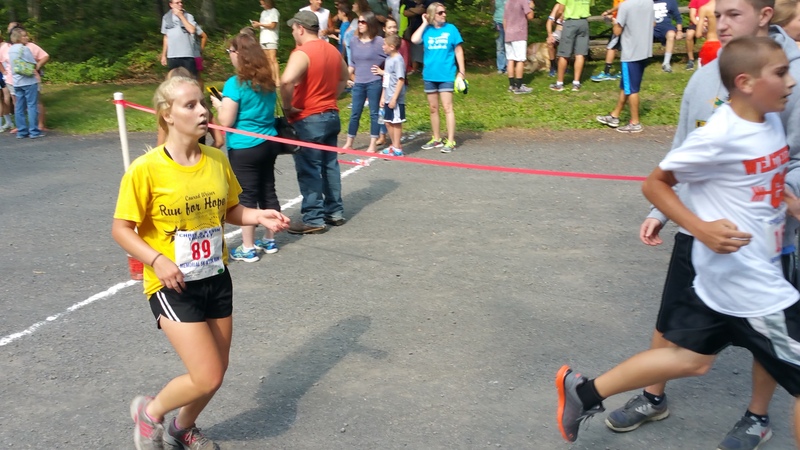 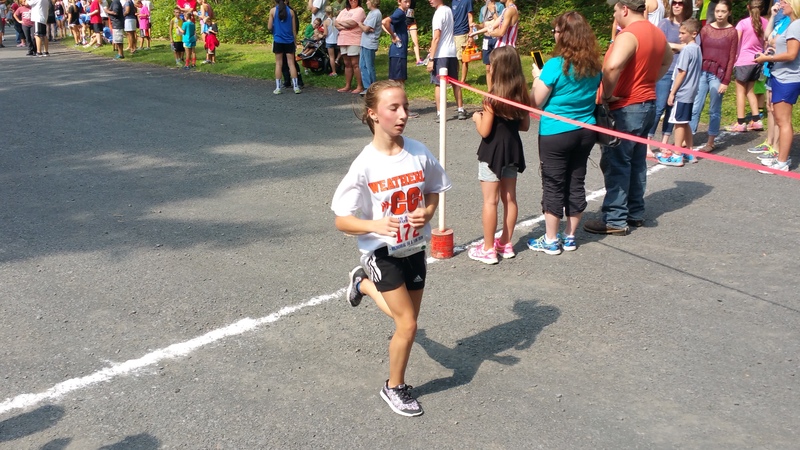 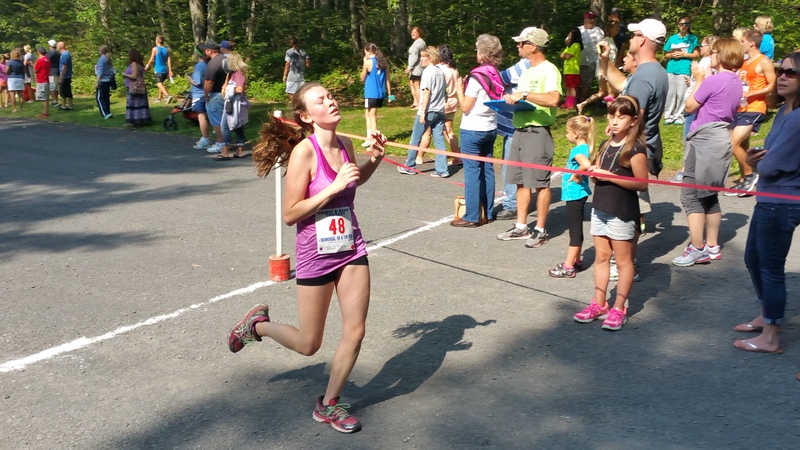 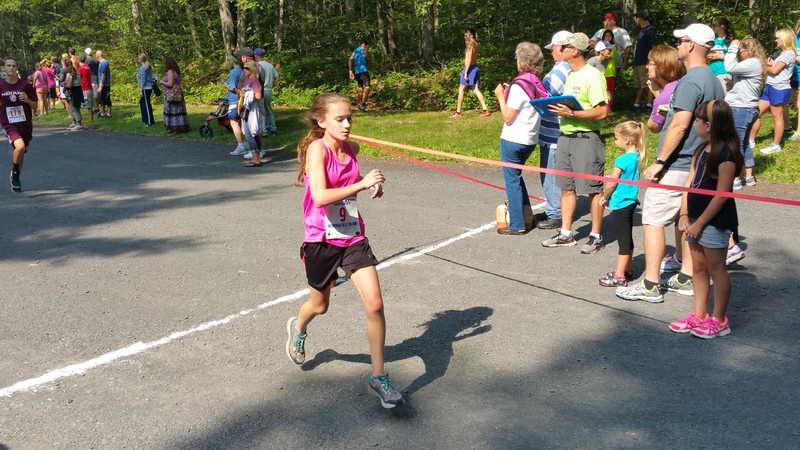 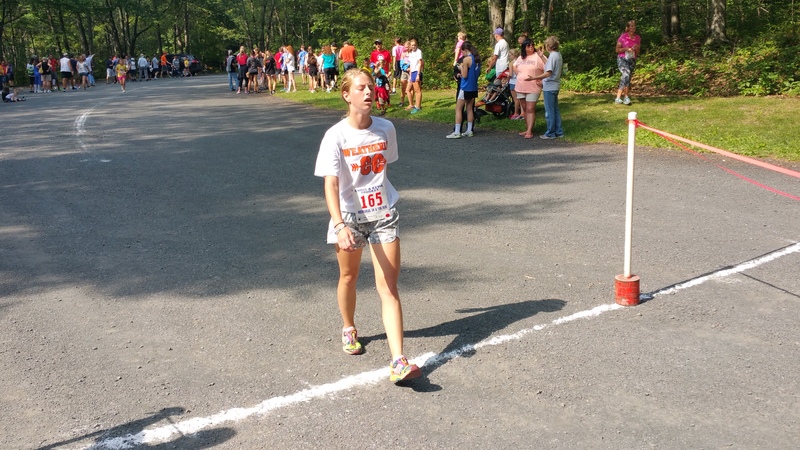 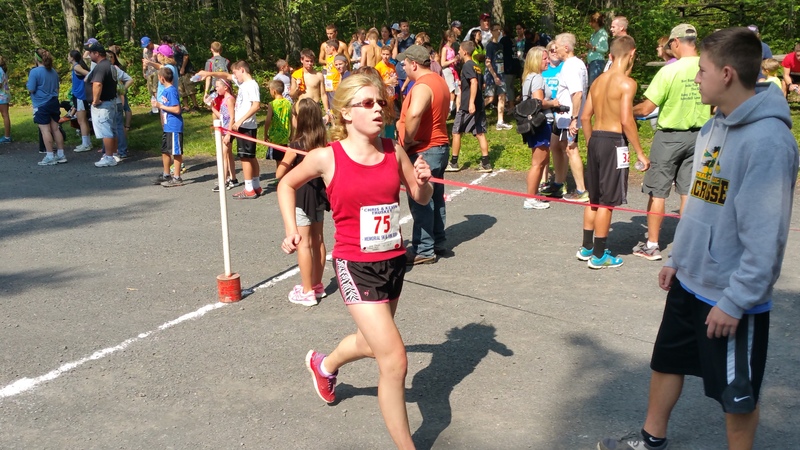 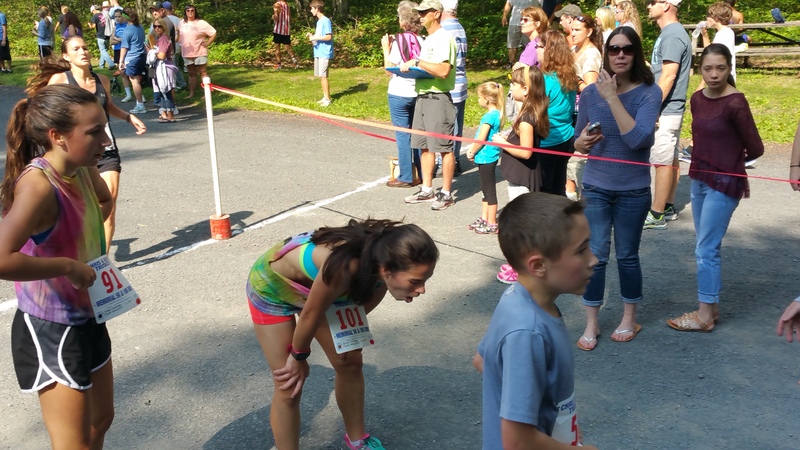 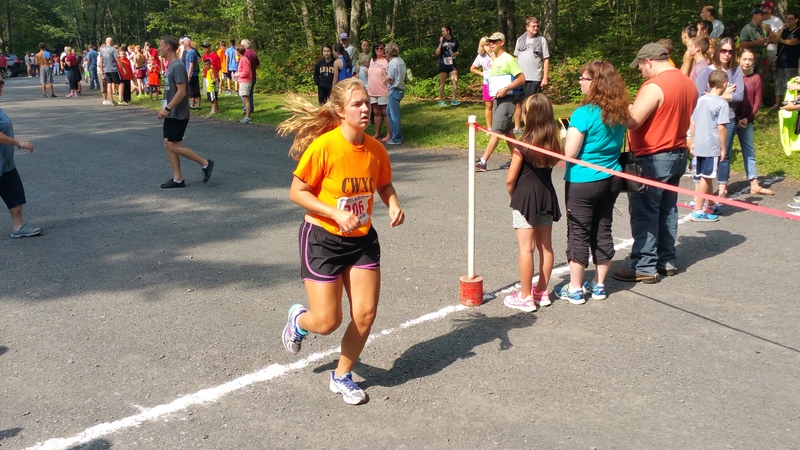 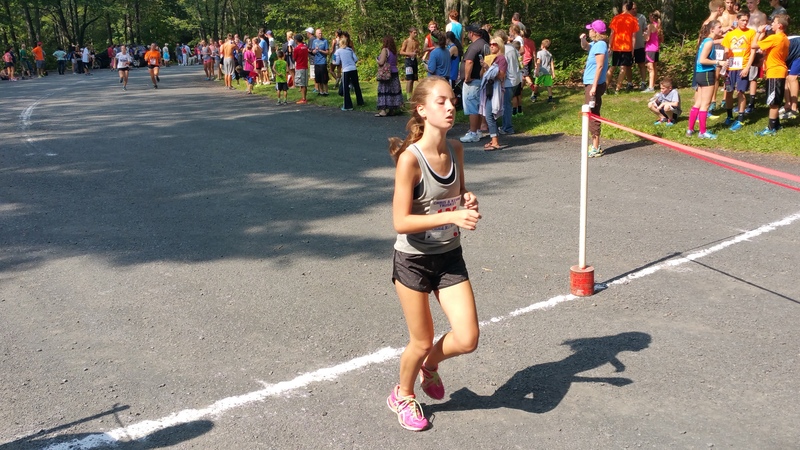 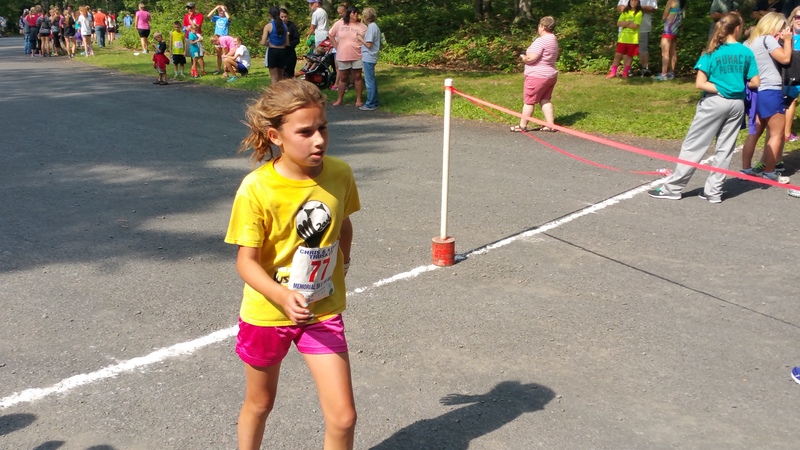 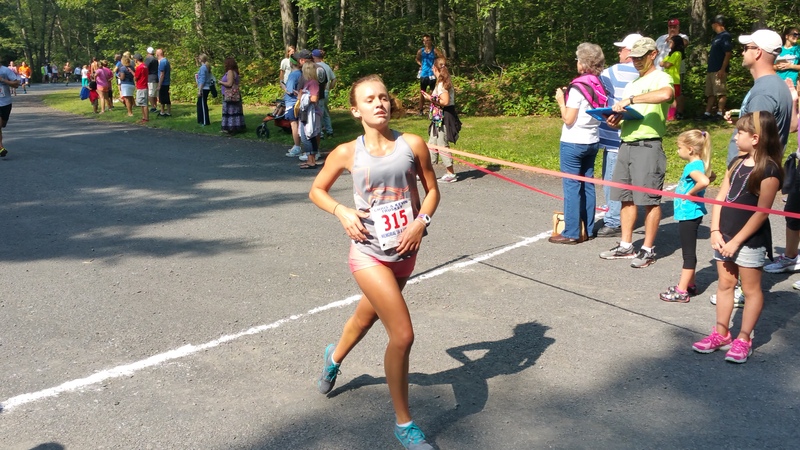 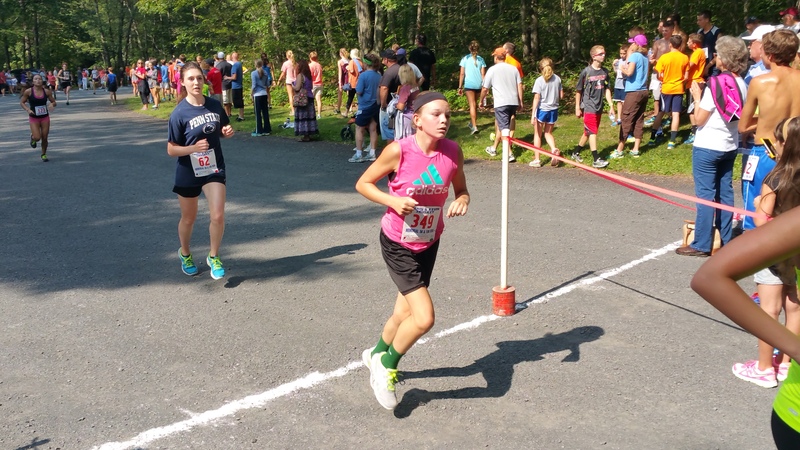 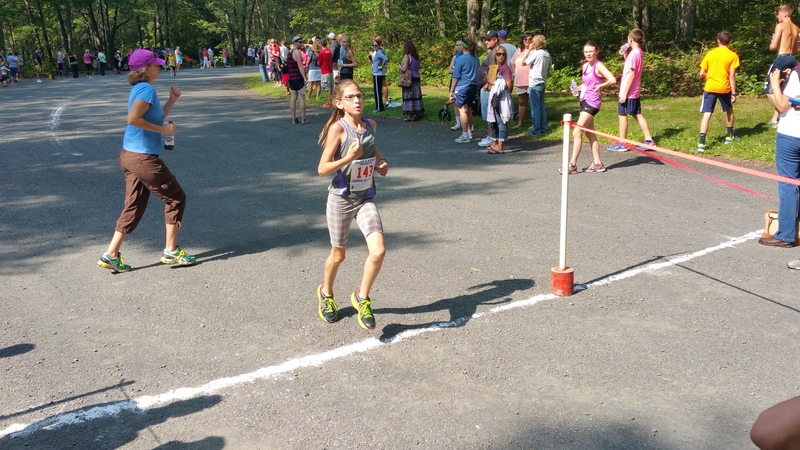 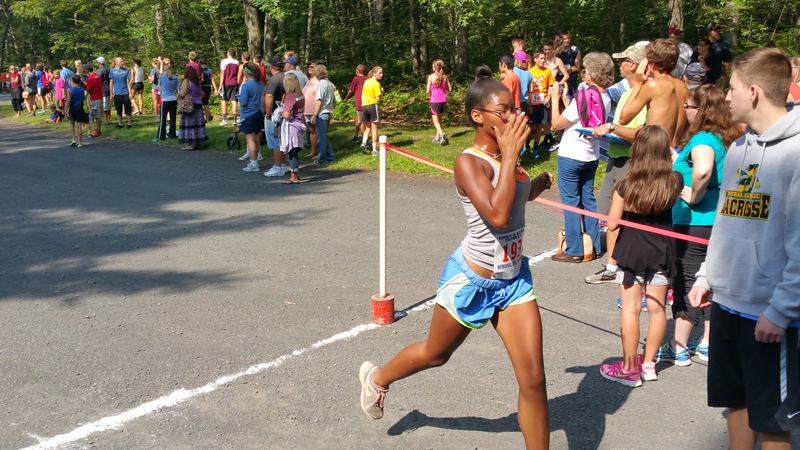 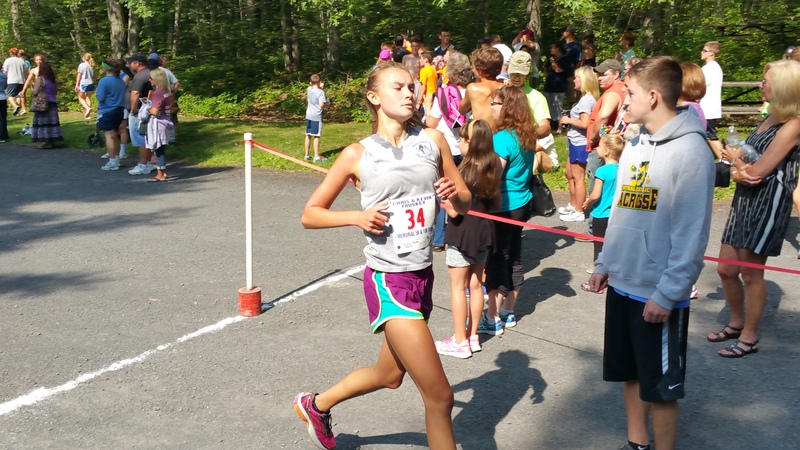 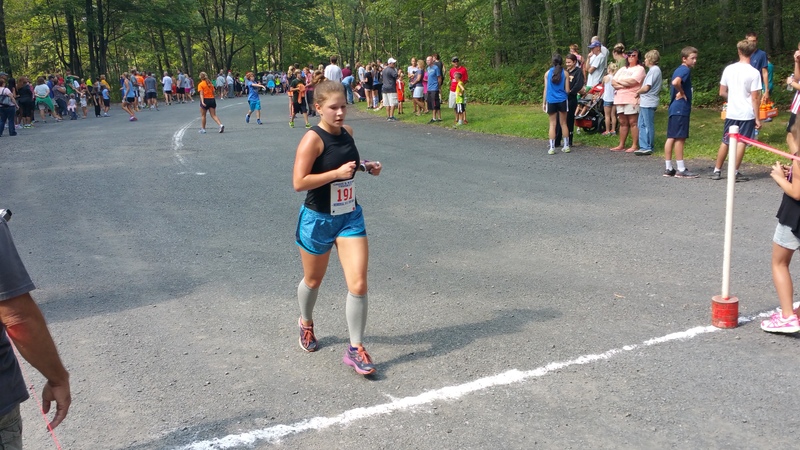 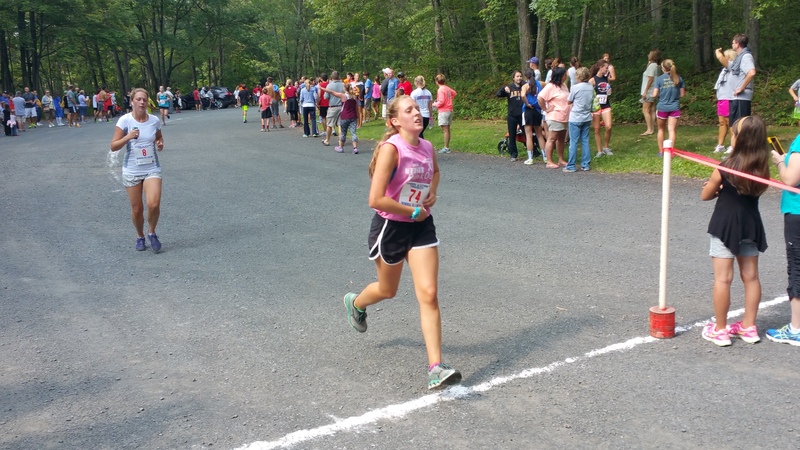 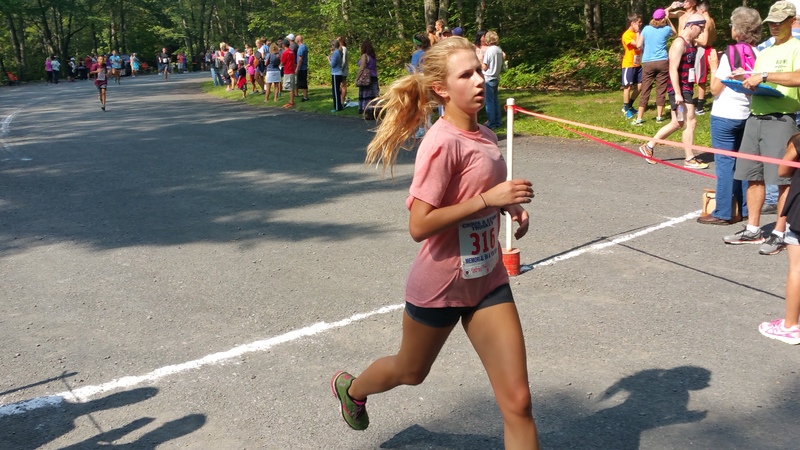 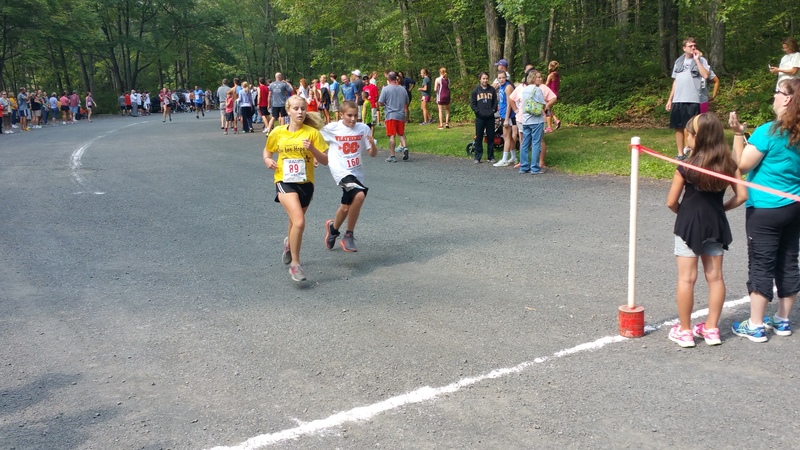 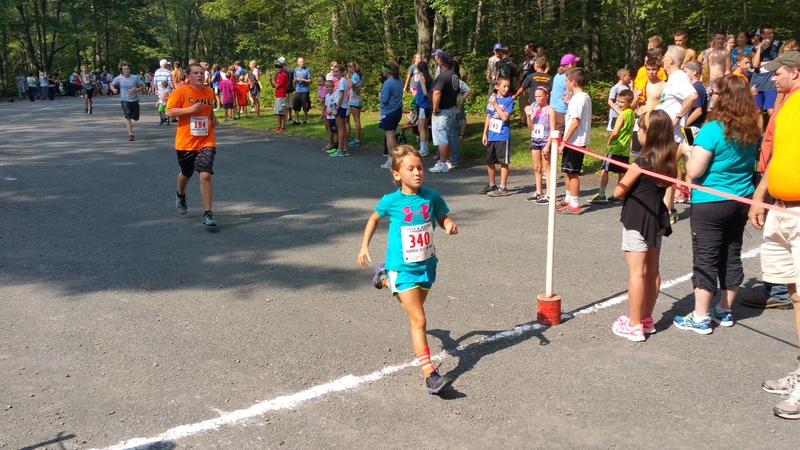 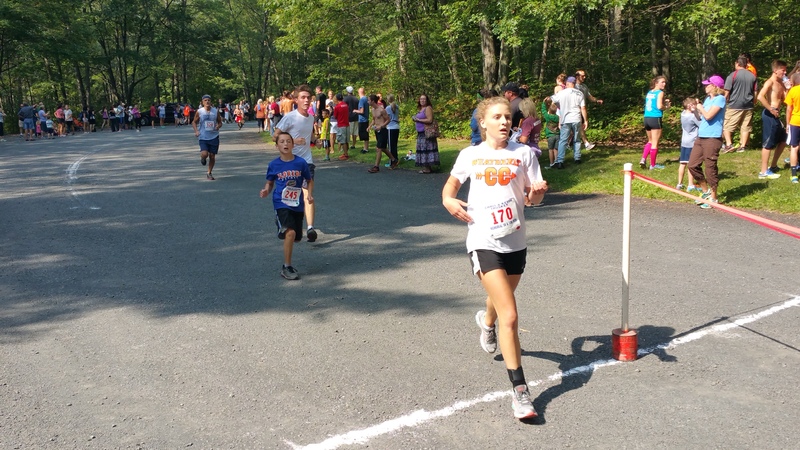 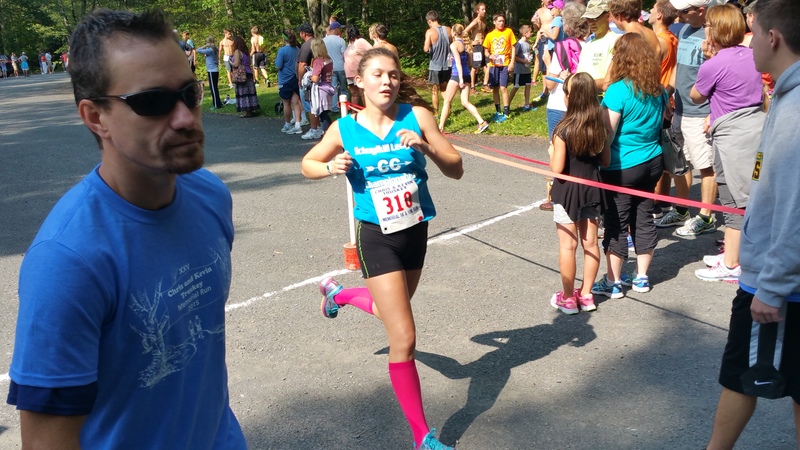 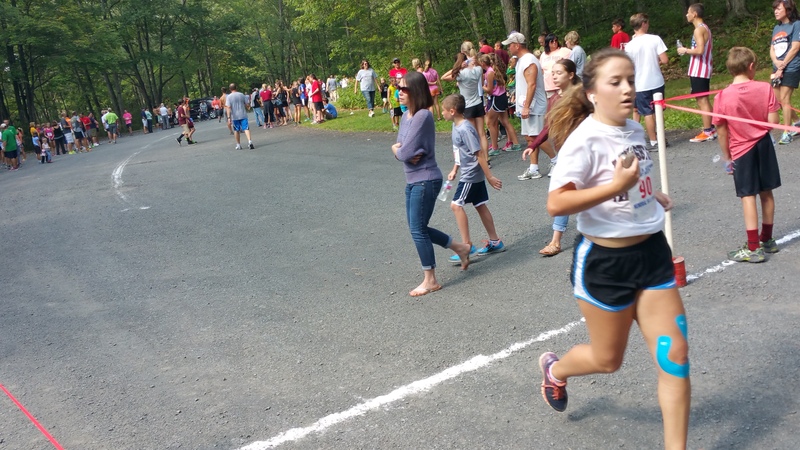 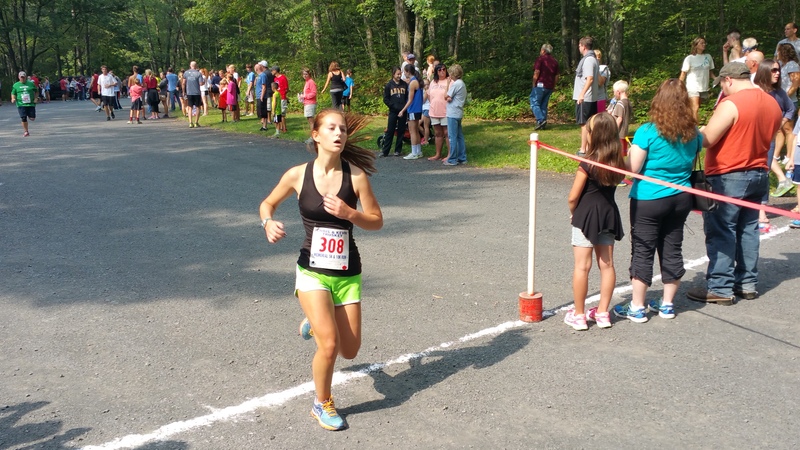 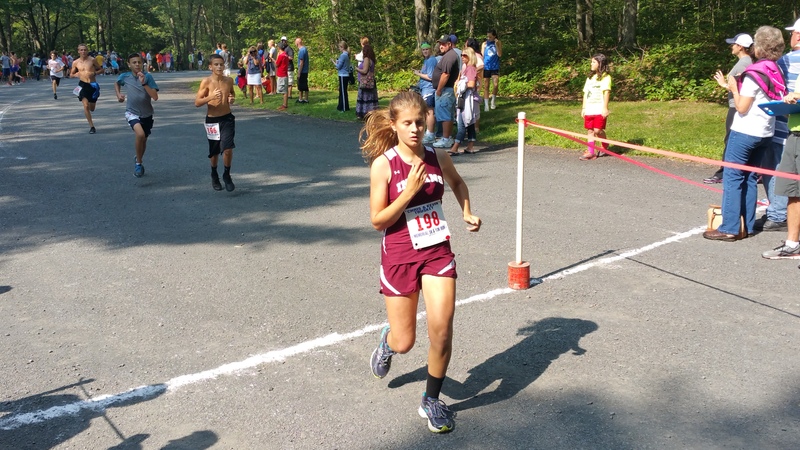 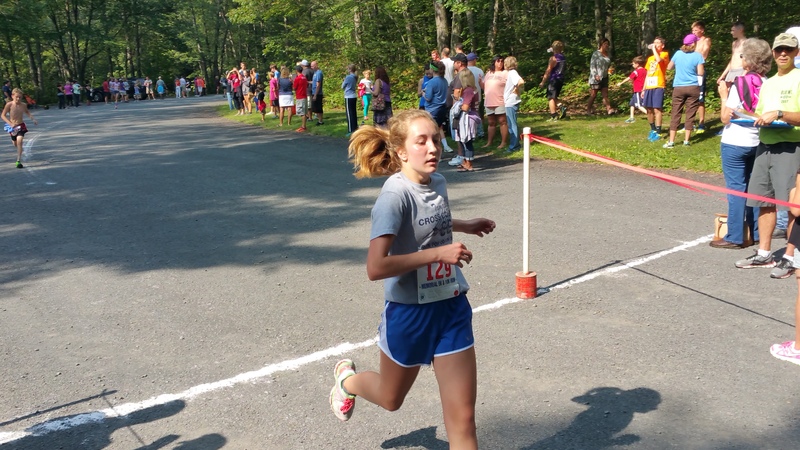 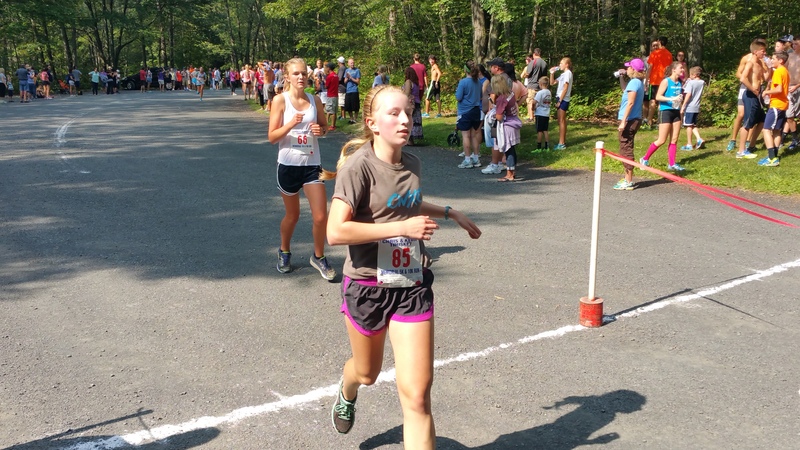 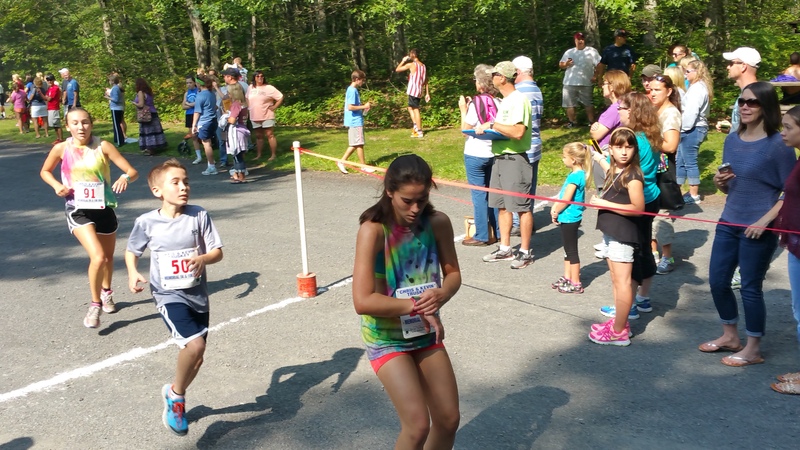 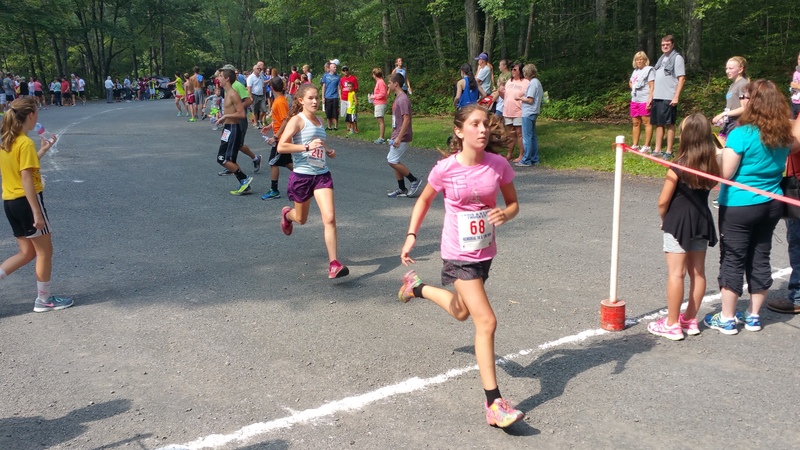 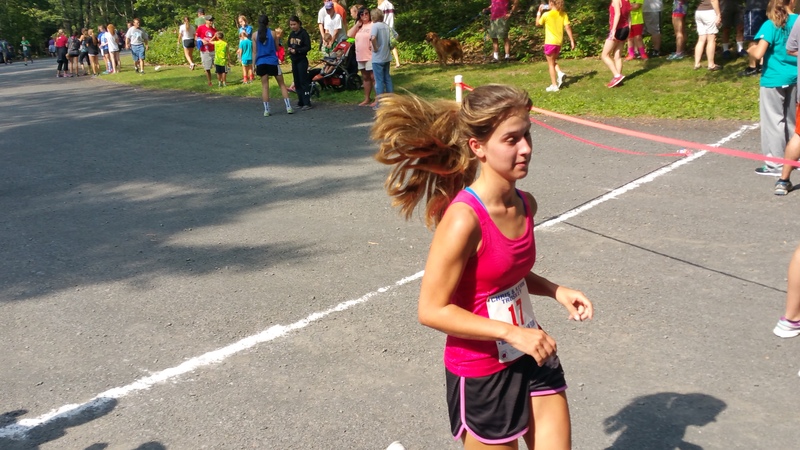 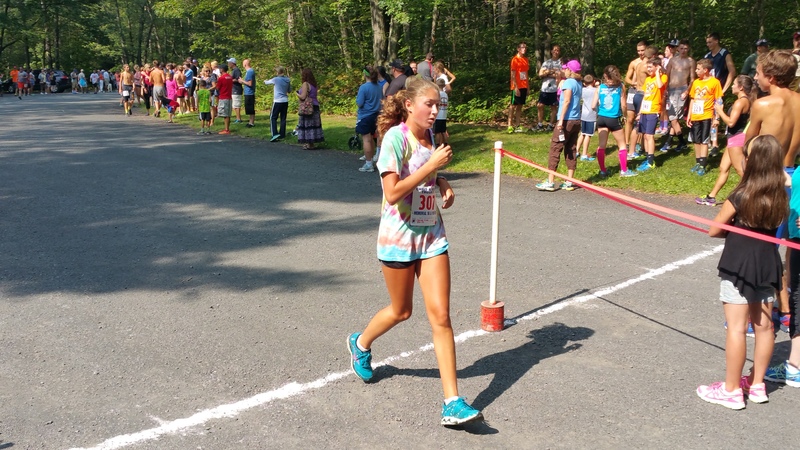 – FIRST FEMALE 13 & UNDER: Cari McCormick, 12, of North Schuylkill PA. (21:09). 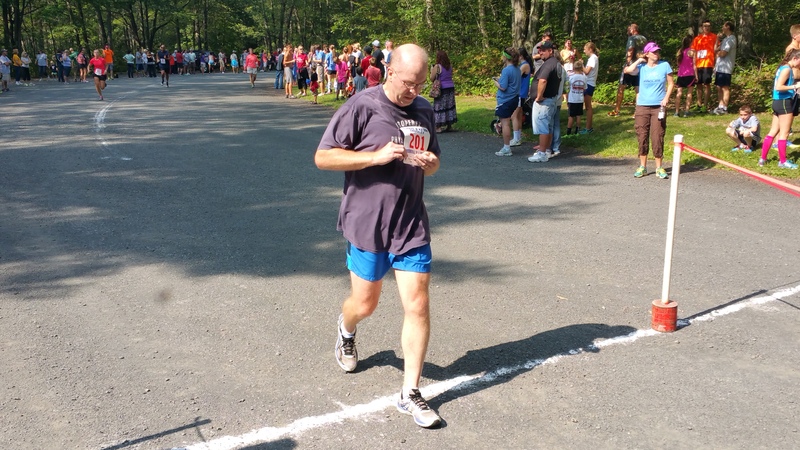 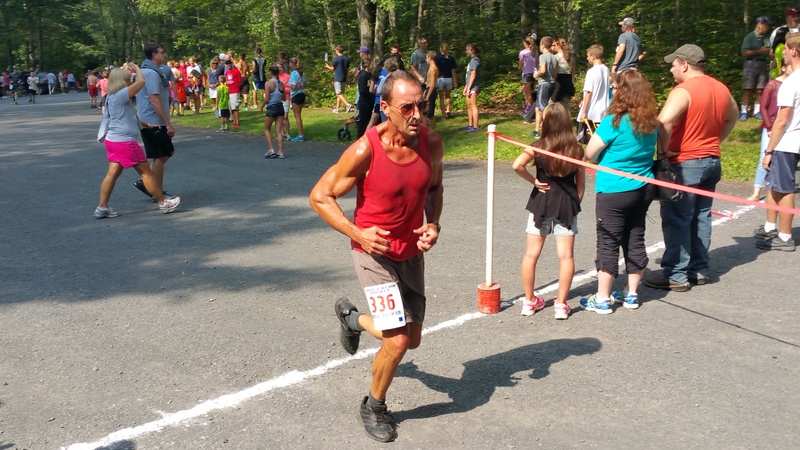 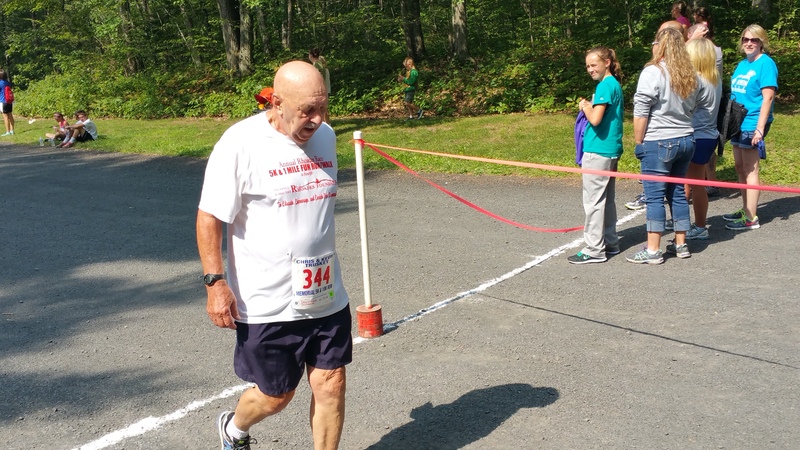 – FIRST MALE 60-69: James Manzick, 64, of Pottsville PA. (22:24). 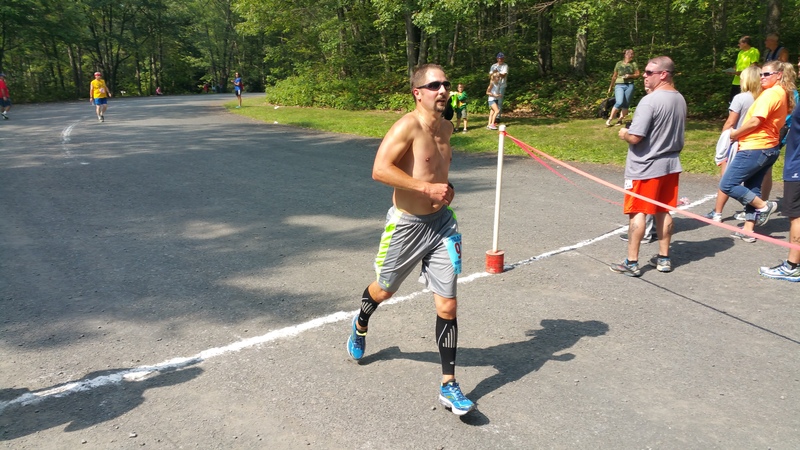 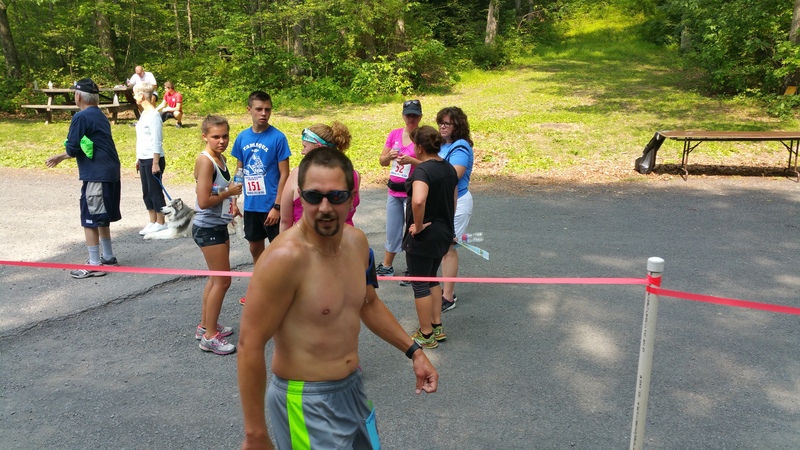 – FIRST MALE 30-34: John Boyle, 32, of Tamaqua PA. (22:55). 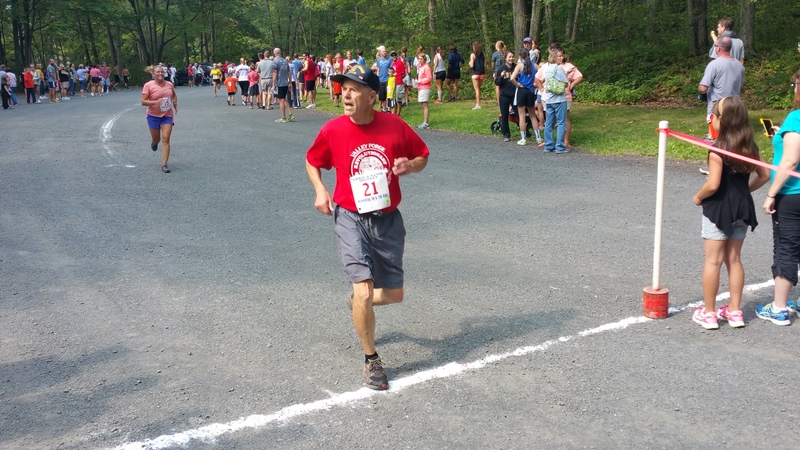 – FIRST MALE 50-54: Duane Beers, 54, of Lehighton PA. (23:30). 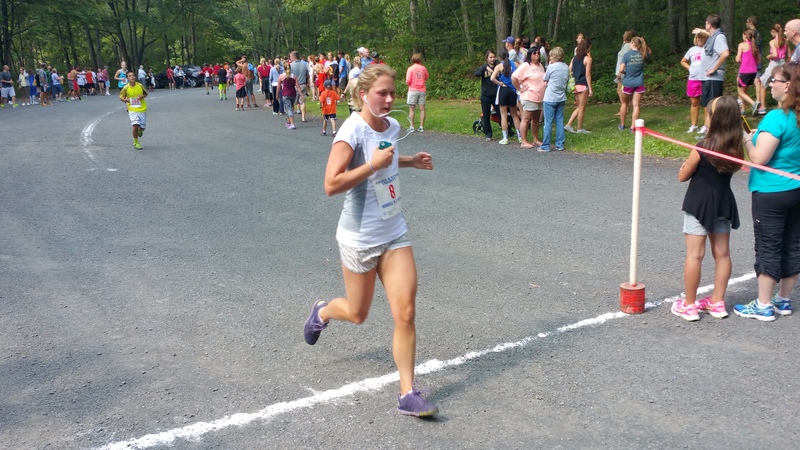 – FIRST FEMALE 19-24: Carol Kabana, 23, of Tamaqua PA. (25:31). 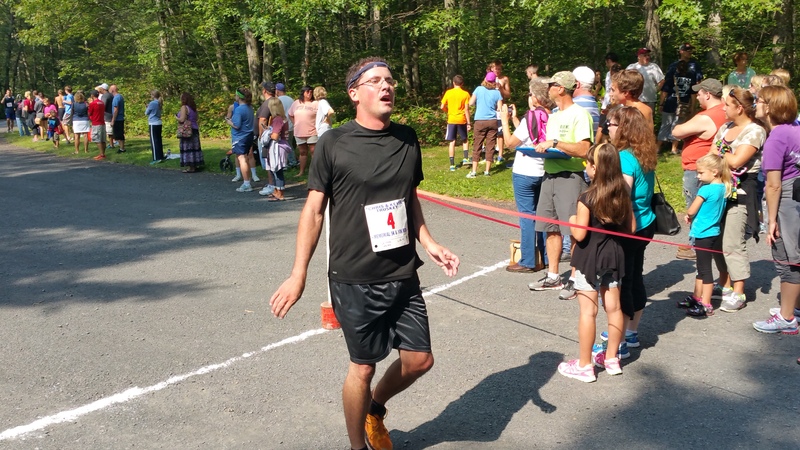 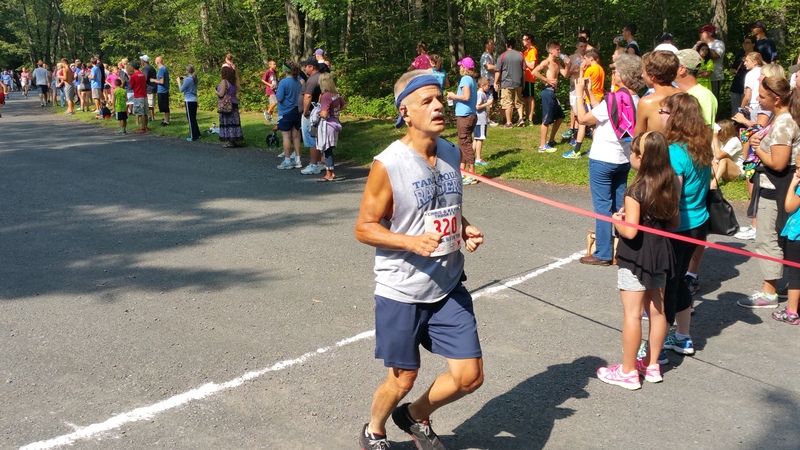 – FIRST MALE 55-59: David Ceci, 57, of Tamaqua PA. (25:49). 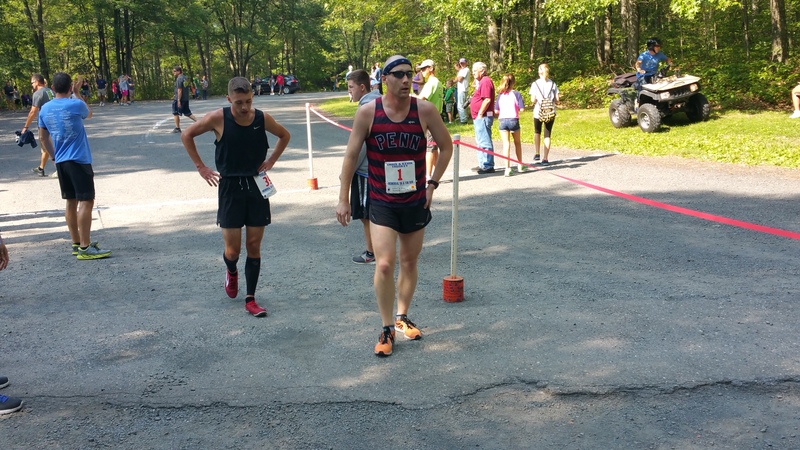 – FIRST MALE 45-49: Jerry Schilling, 45, of Andreas PA. (26:23). 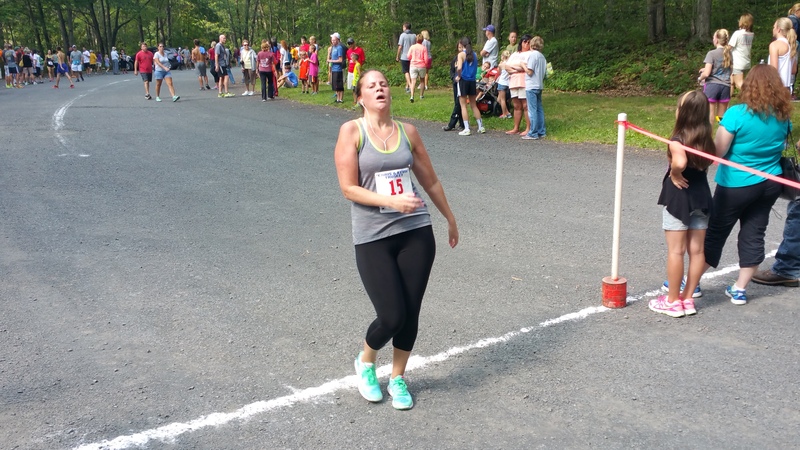 – FIRST FEMALE 35-39: Jillian Whetstone, 36, of Harrisburg PA. (26:30). 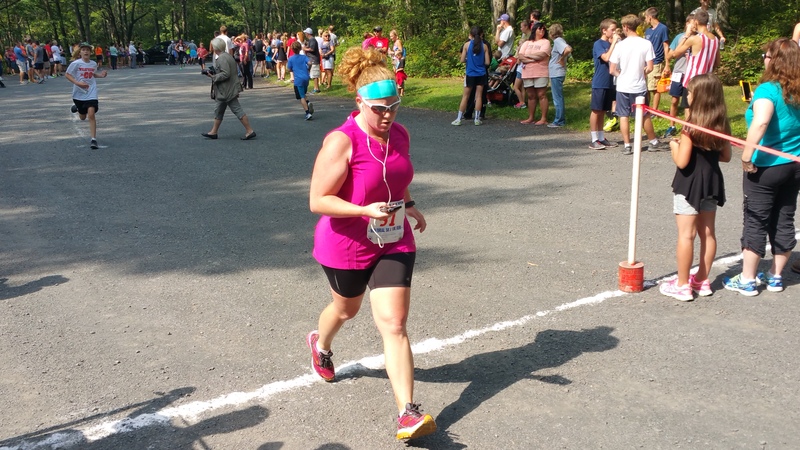 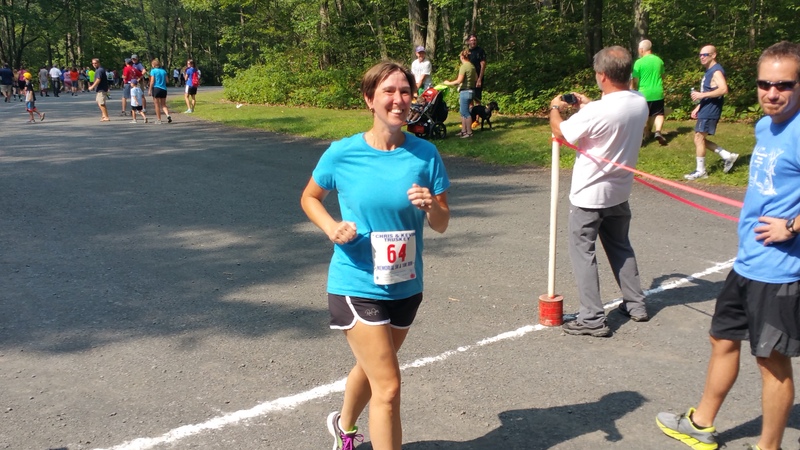 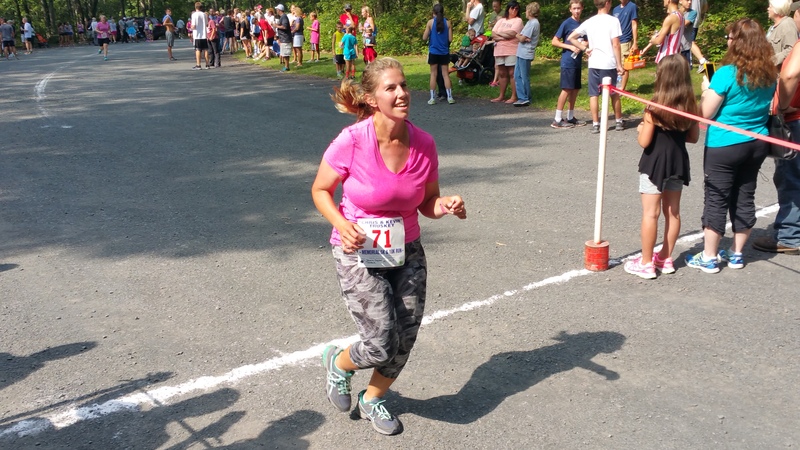 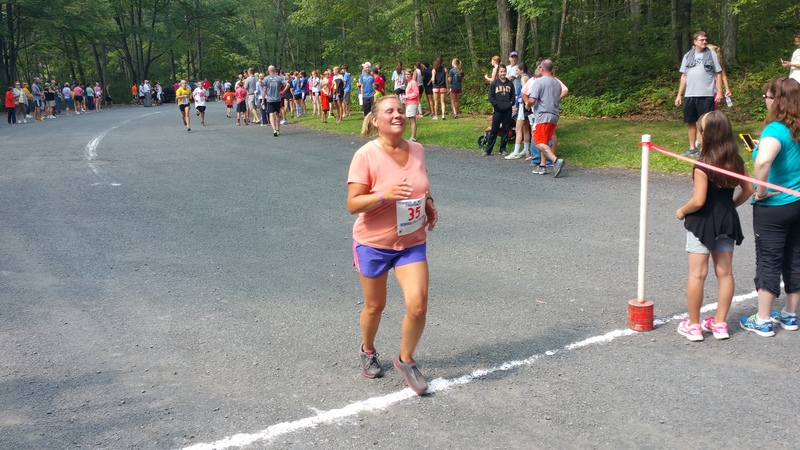 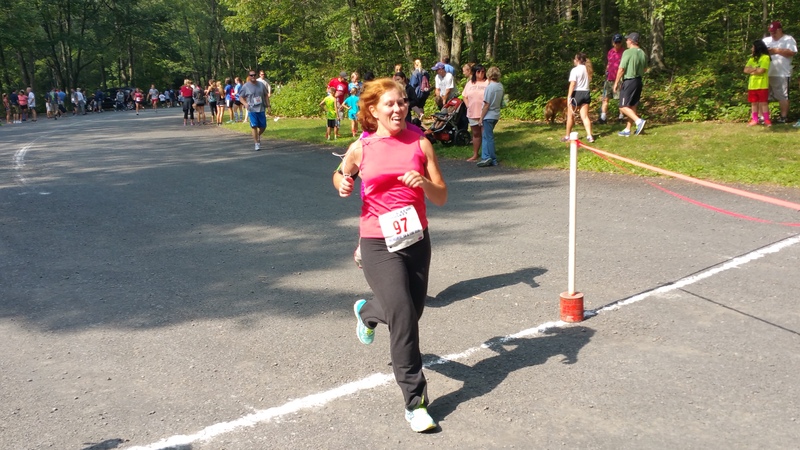 – FIRST FEMALE 40-44: Jennifer Burgess, 42, of Minersville PA. (27:40). 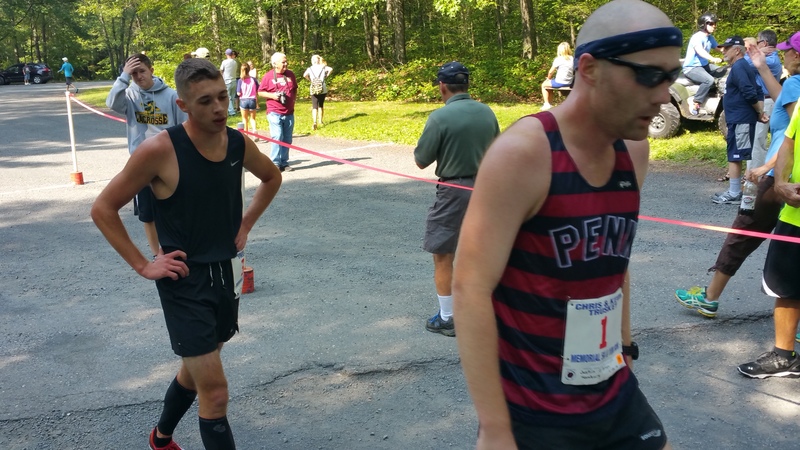 – FIRST MALE 25-29: Zack Steigerwalt, 27, of Tamaqua PA. (29:05). 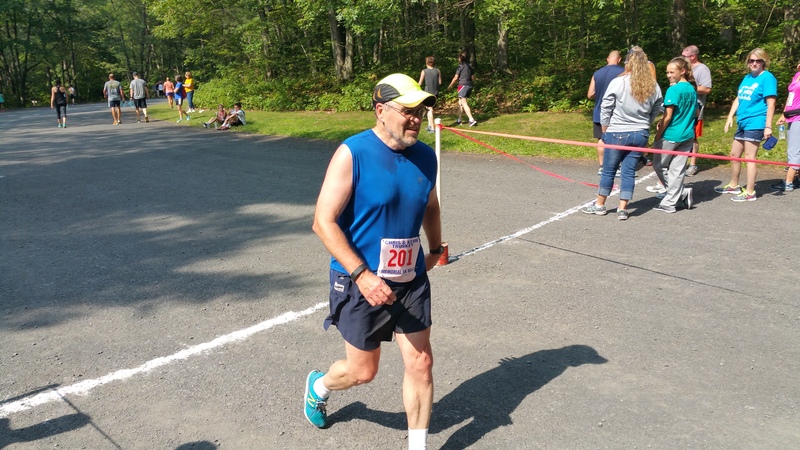 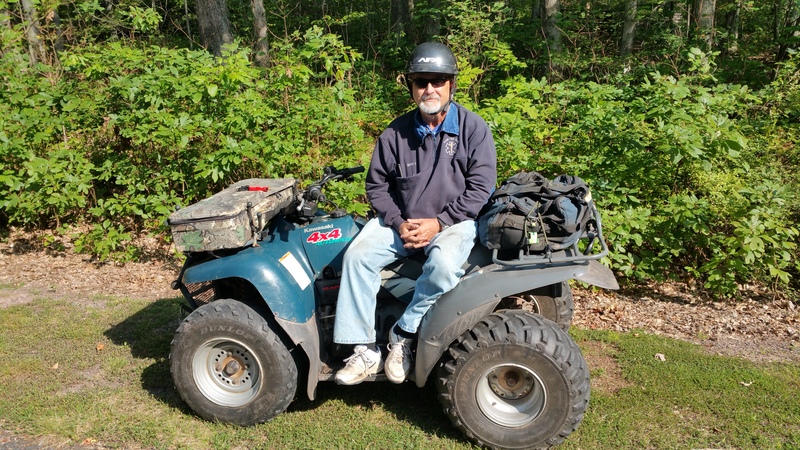 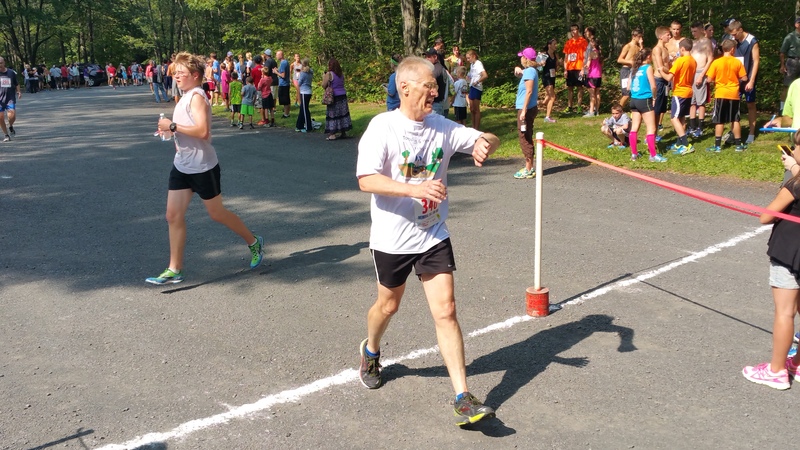 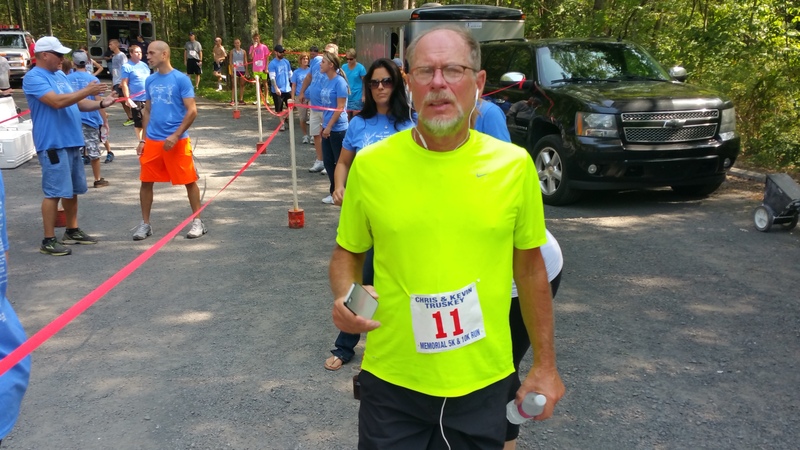 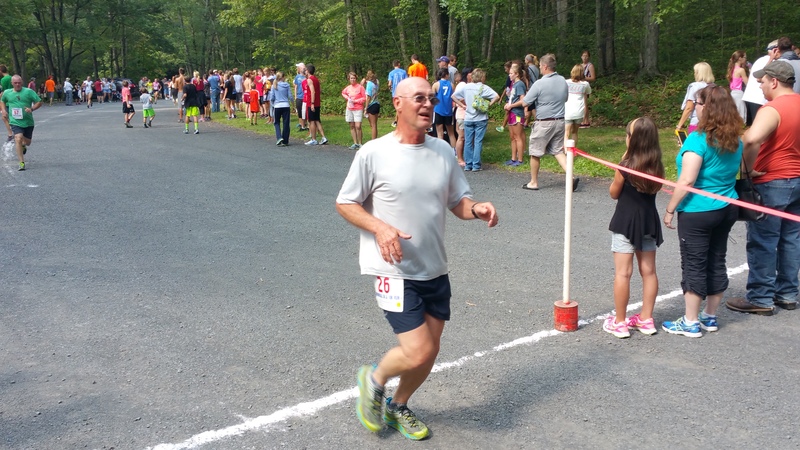 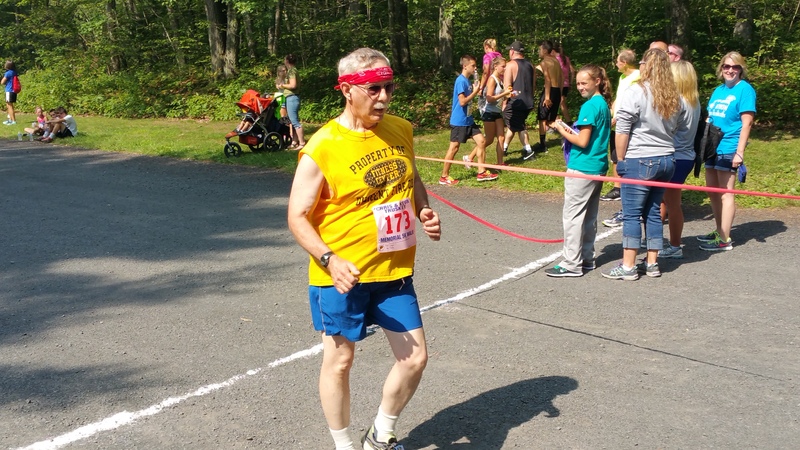 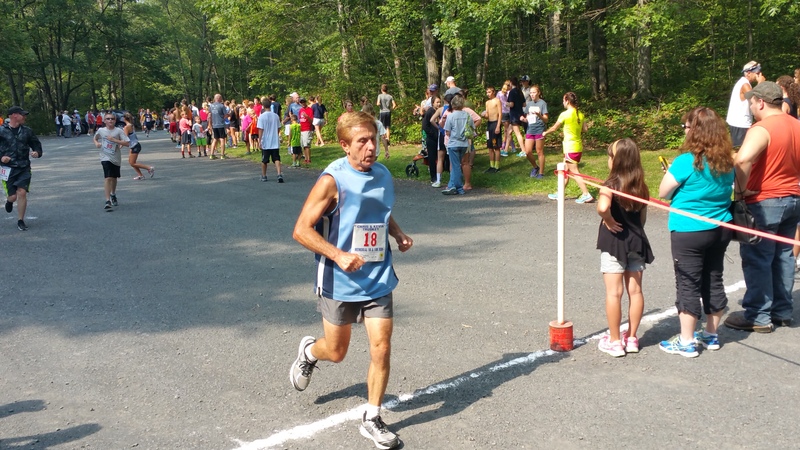 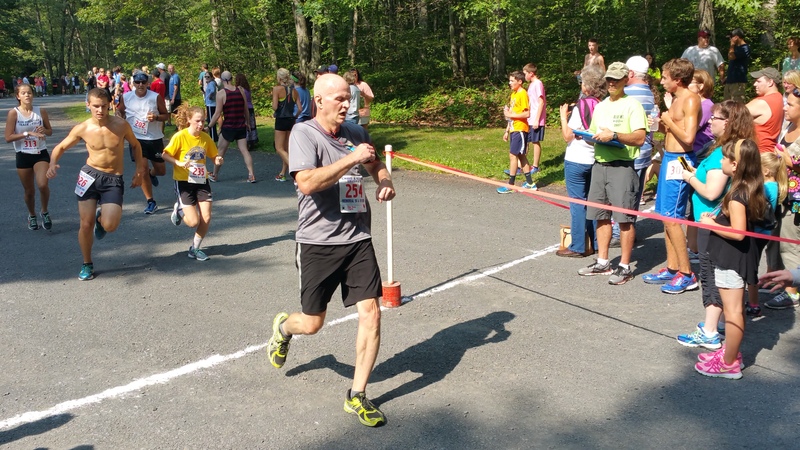 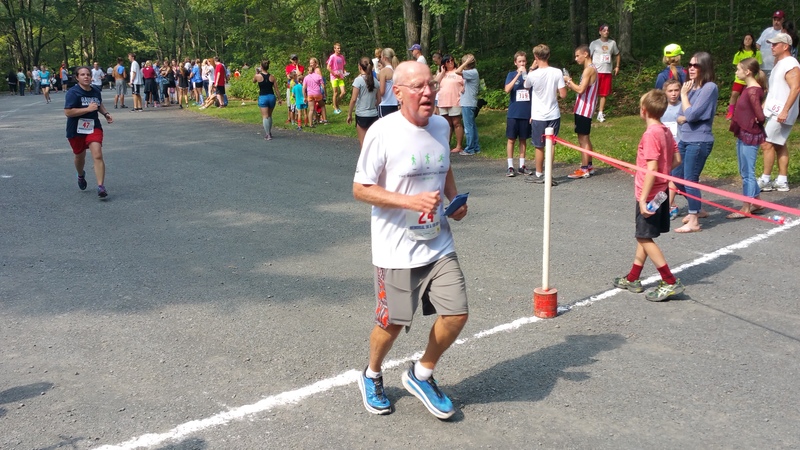 – FIRST MALE 70 & OVER: Dale Kline, 70, of Tamaqua PA. (30:17). 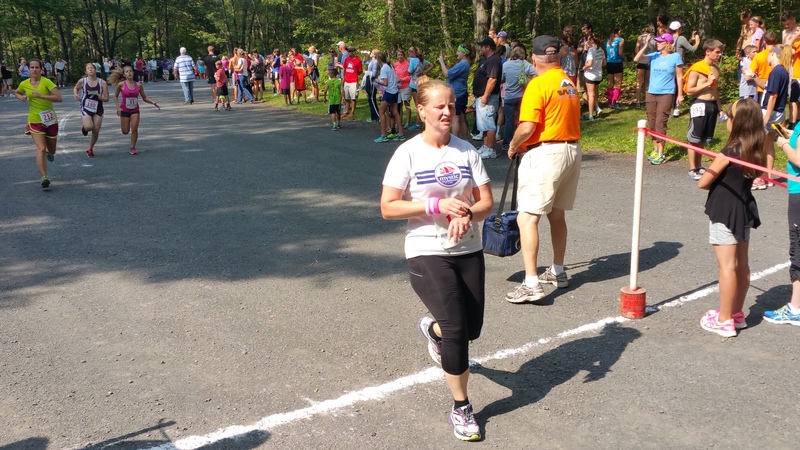 – FIRST FEMALE 45-49: Megan Frantz, 48, of Tamaqua PA. (30:21). 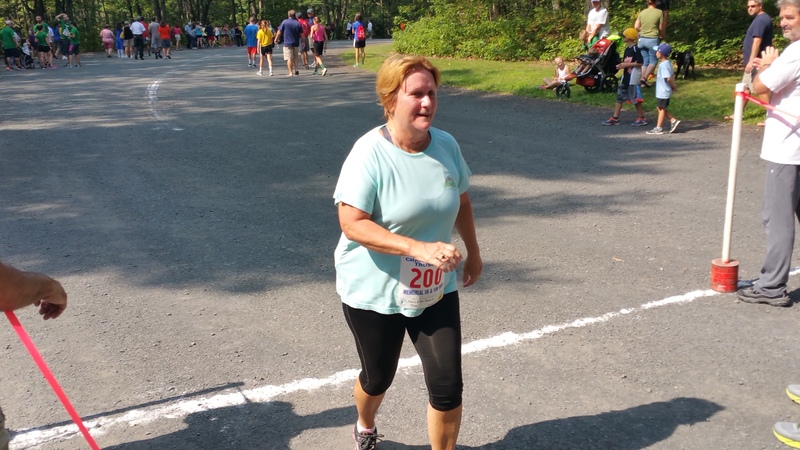 – FIRST FEMALE 50-54: Susan Truskey, 52, of Tamaqua PA. (31:18). 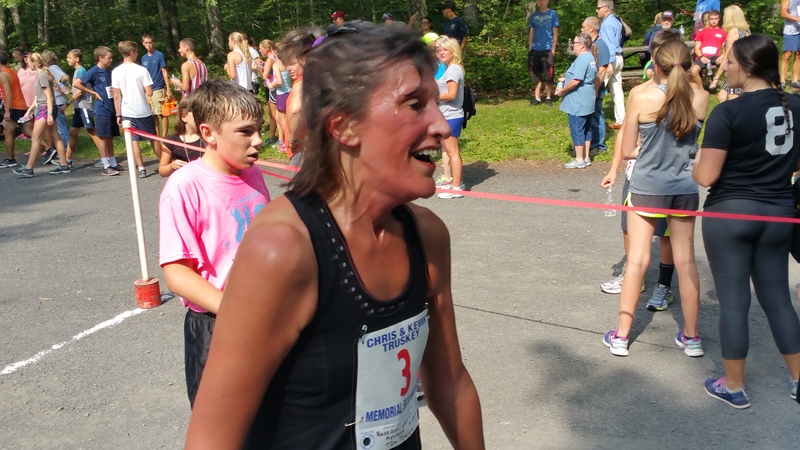 – FIRST FEMALE 55-59: Ginny Murray, 58, of St. Clair PA. (31:27). 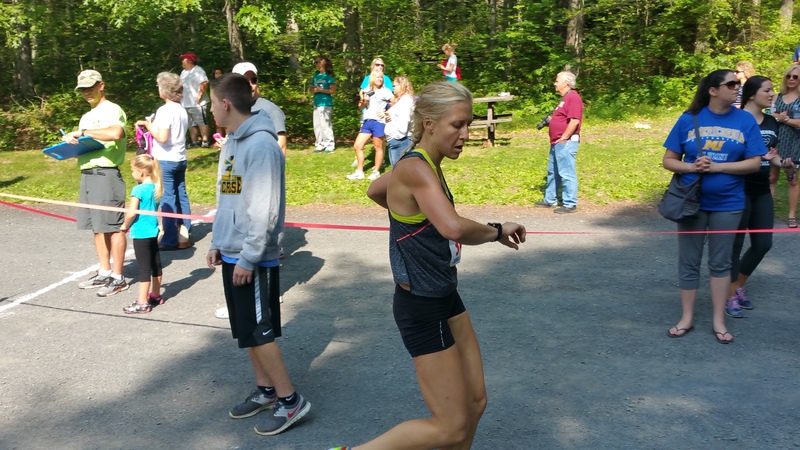 – FIRST FEMALE 25-29: Megan Hahner, 25, of Pottsville PA. (31:30). 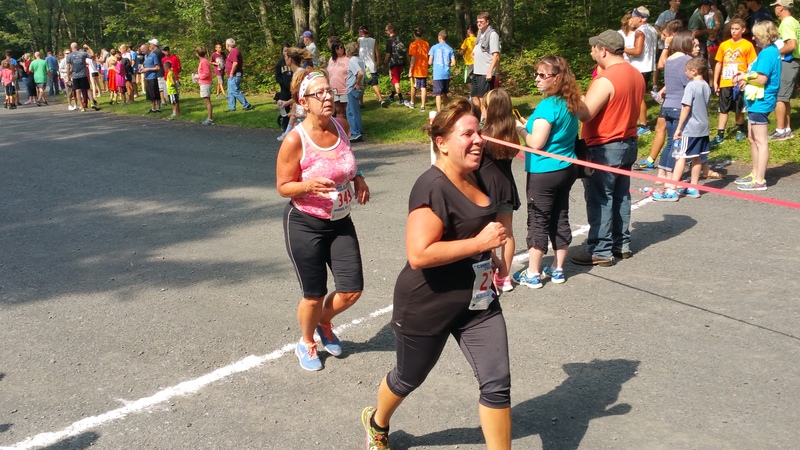 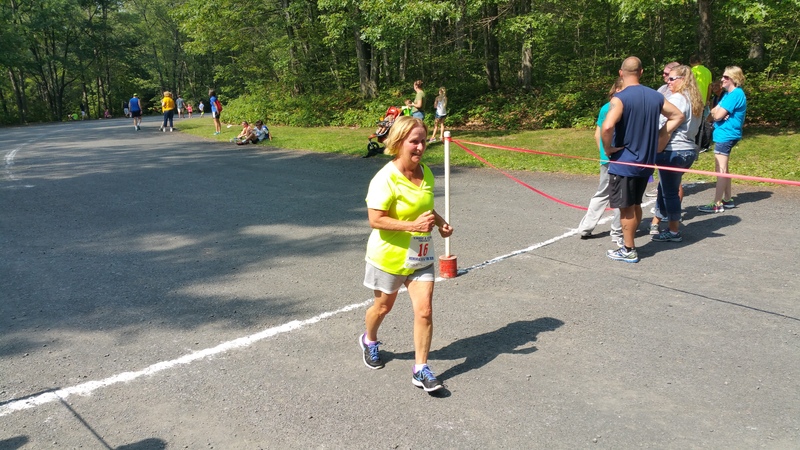 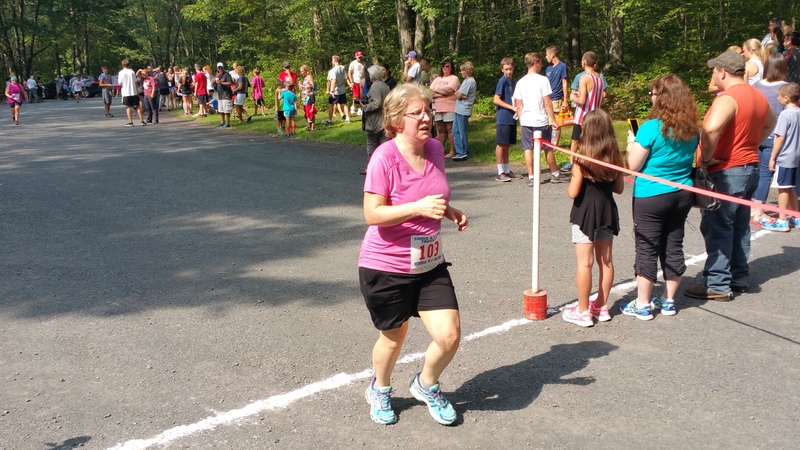 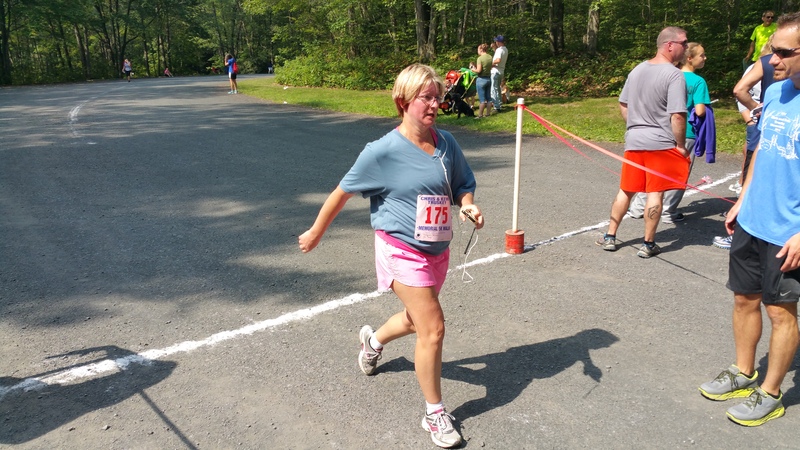 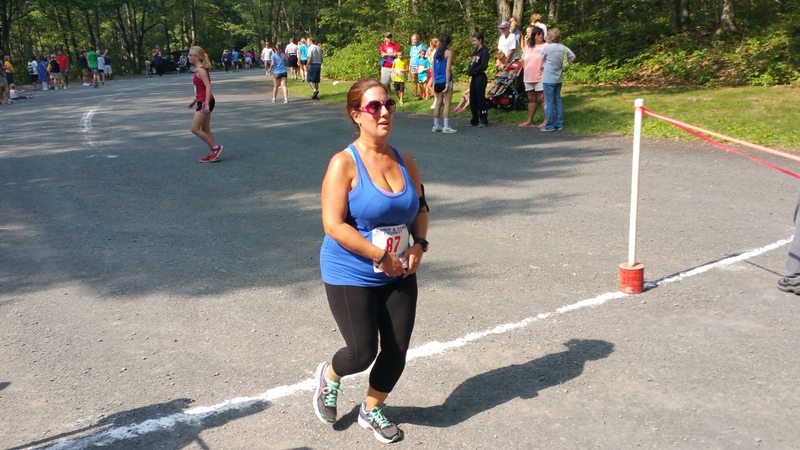 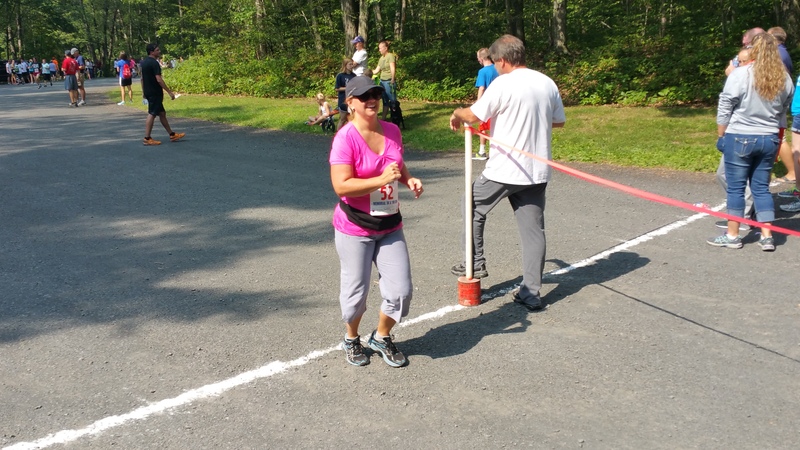 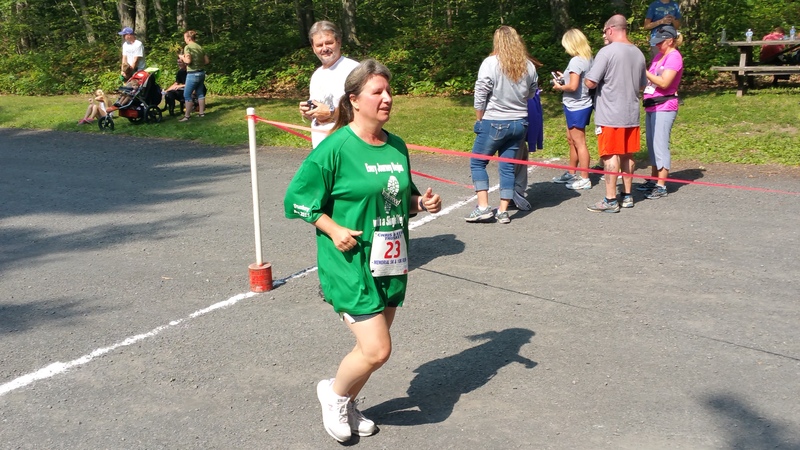 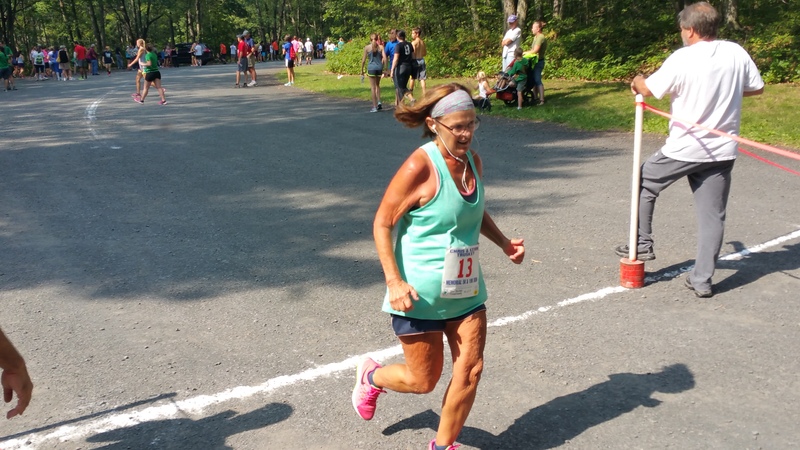 – FIRST FEMALE 60-69: Jan Staloski, 63, of Nesquehoning PA. (41:09). 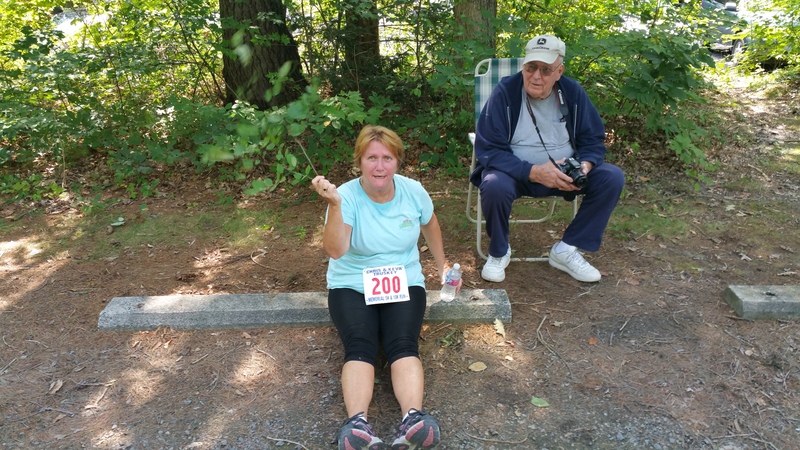 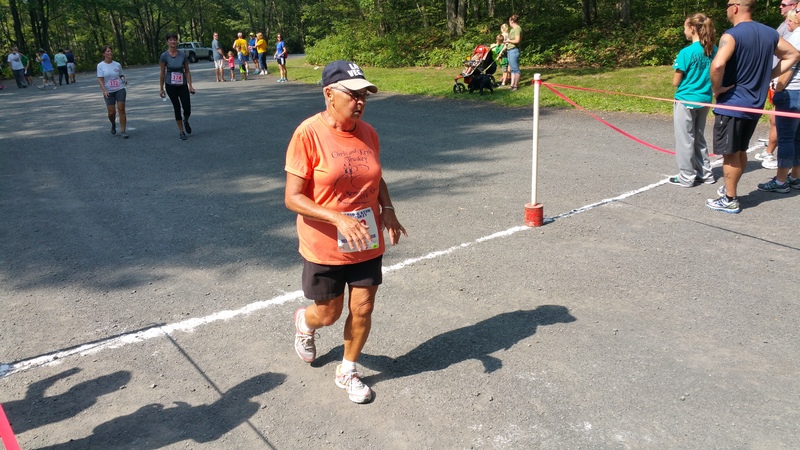 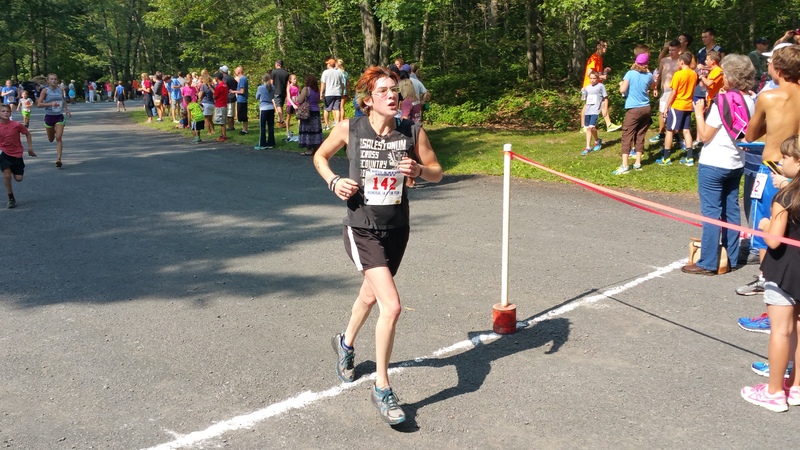 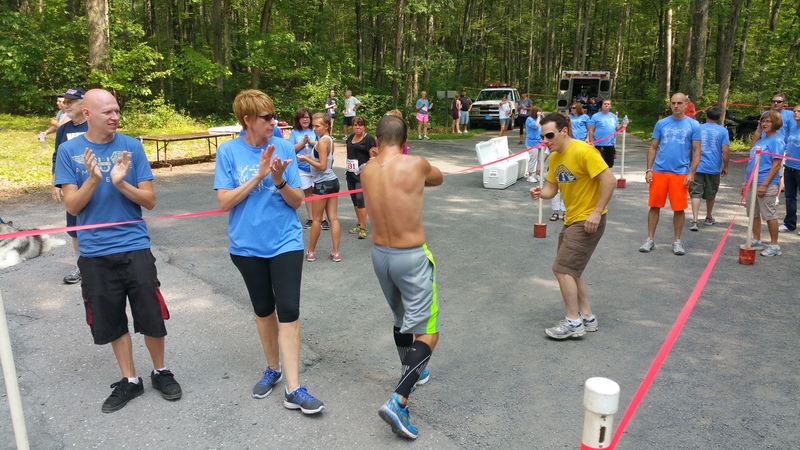 – FIRST FEMALE 70 & OVER: Joan Houser, 76, of Tamaqua PA. (52:16). 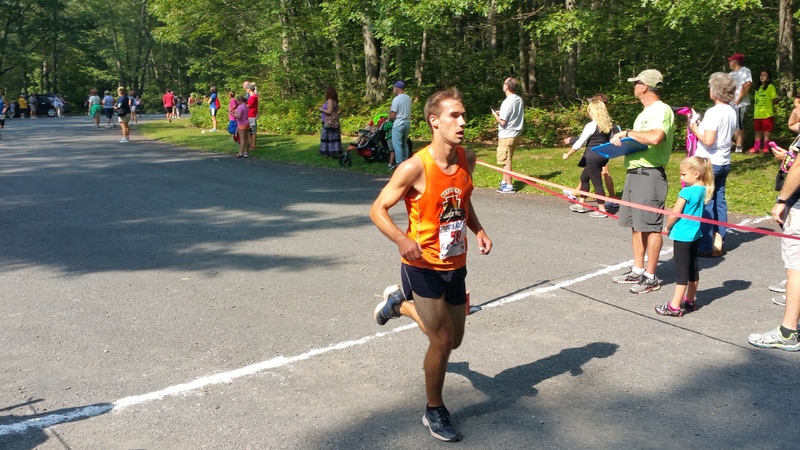 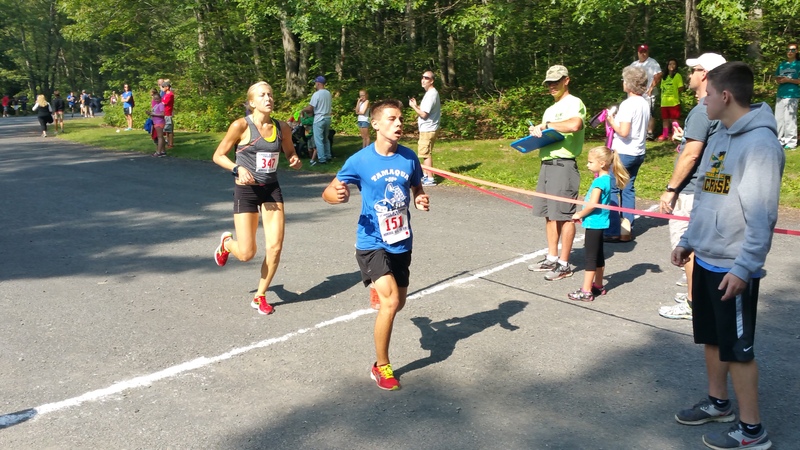 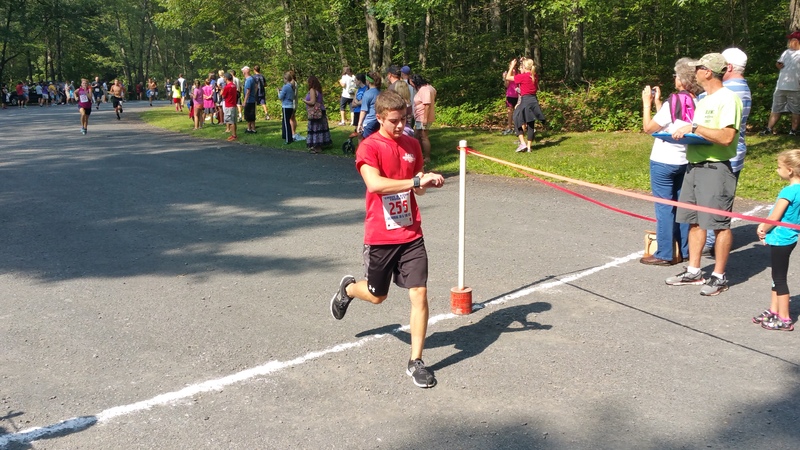 Placing overall in the 10K were male Eric Oertner, of New Tripoli, with a times of 44:53; and female Bonnie Natt, of Drums with a time of 51:04. 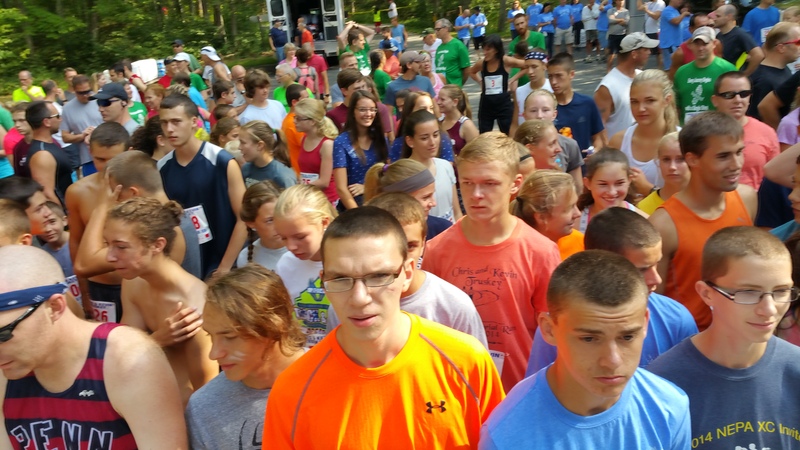 Proceeds benefit scholarships to high school seniors. 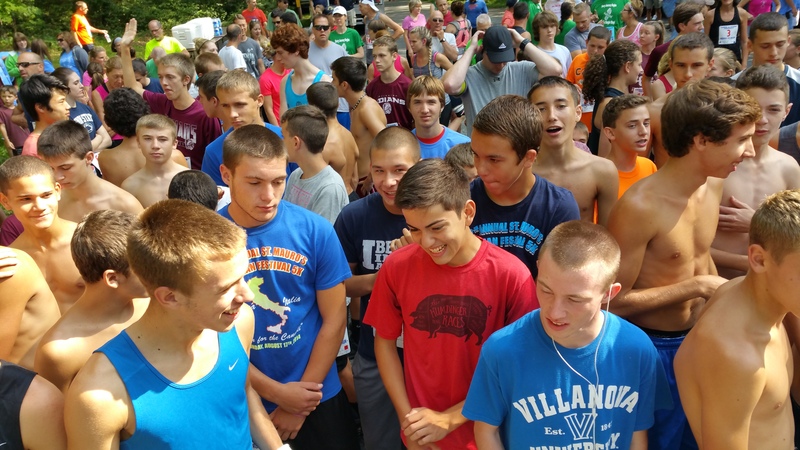 Click HERE to view last year’s scholarship recipients. 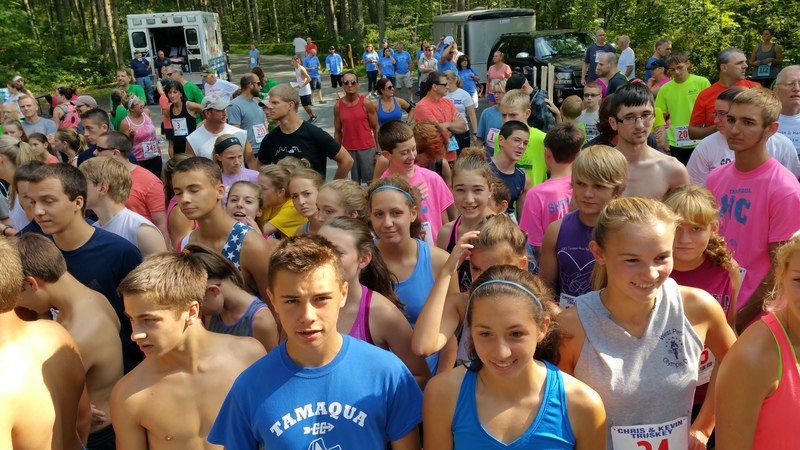 For more information, contact Wayne or Pat Truskey at (570) 386-2922 or via email at truskey@ptd.net. 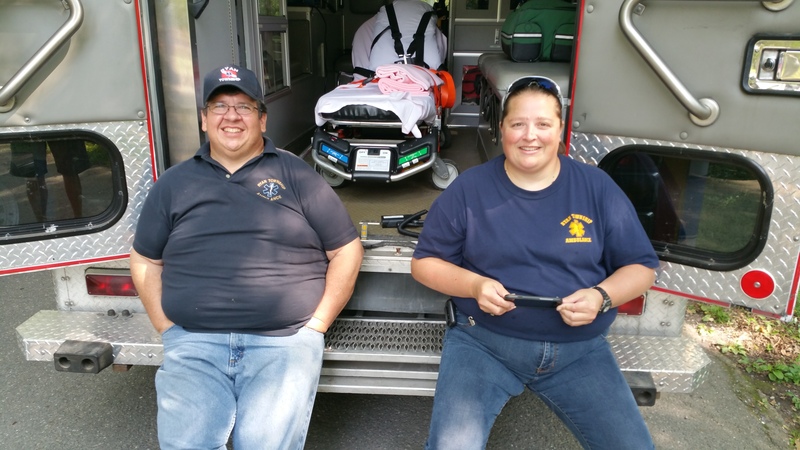 Click HERE to view TamaquaArea.com photos from prior years. 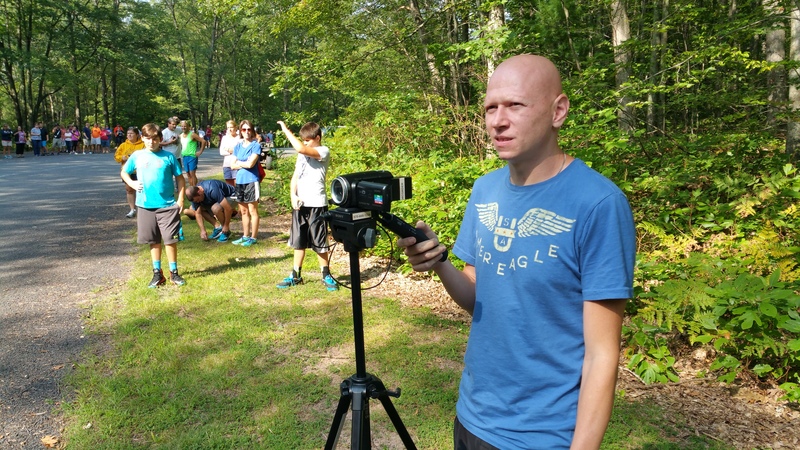 Video is condensed; meaning long spaces between runners are omitted. 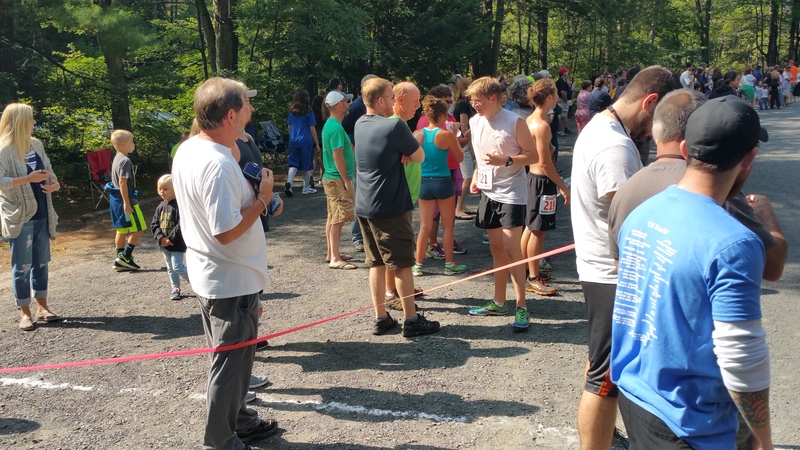 Page down all the way to view written lists of all 5K participant names, placements, and times. 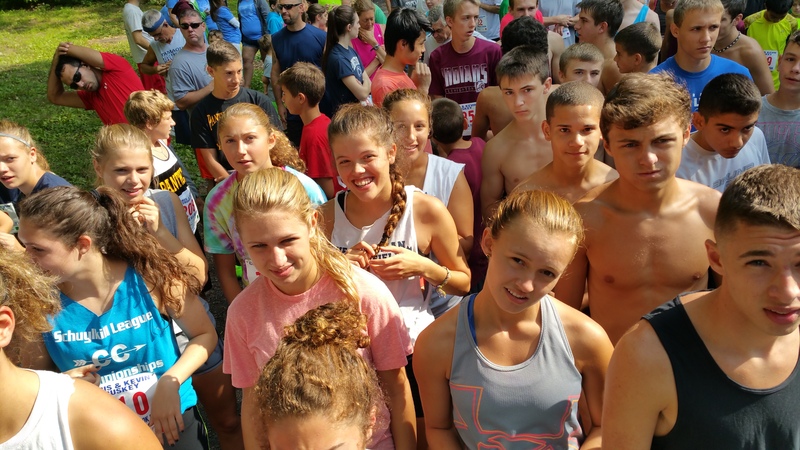 As always, all TamaquaArea.com videos and photos are free to download, save, or print yourself.